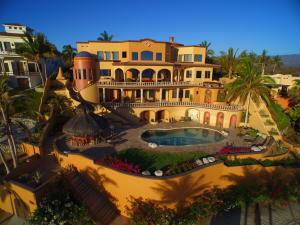 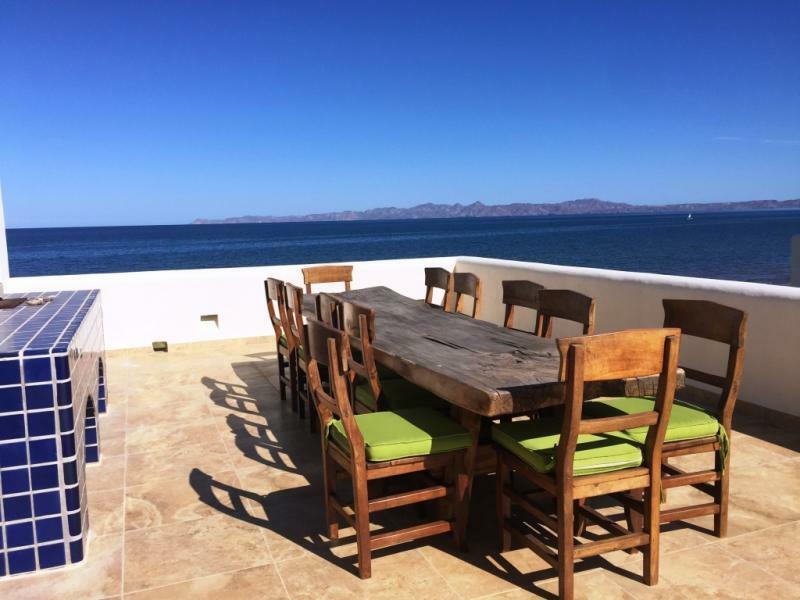 Description: Magnificent Luxurious Beach Home in Loreto Bay rarely available is now just listed! 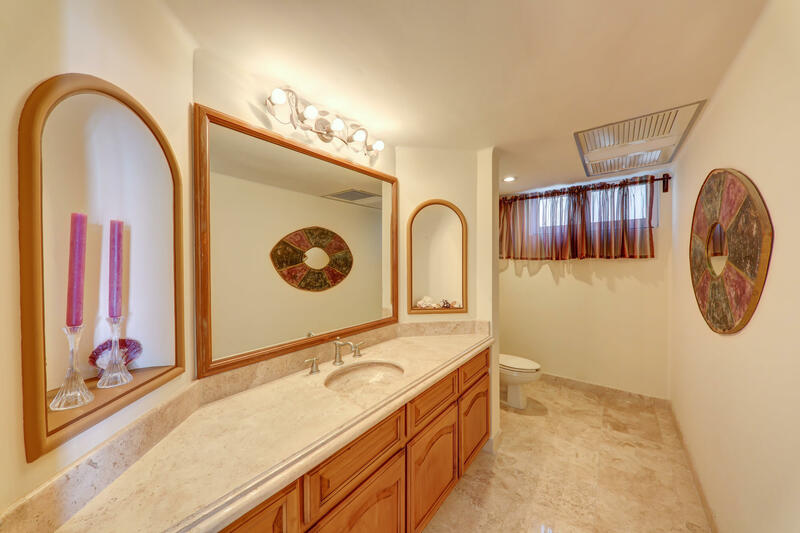 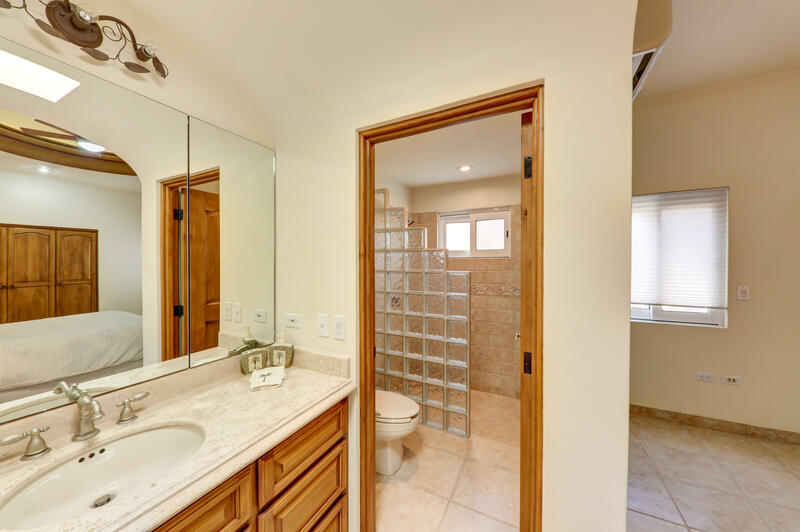 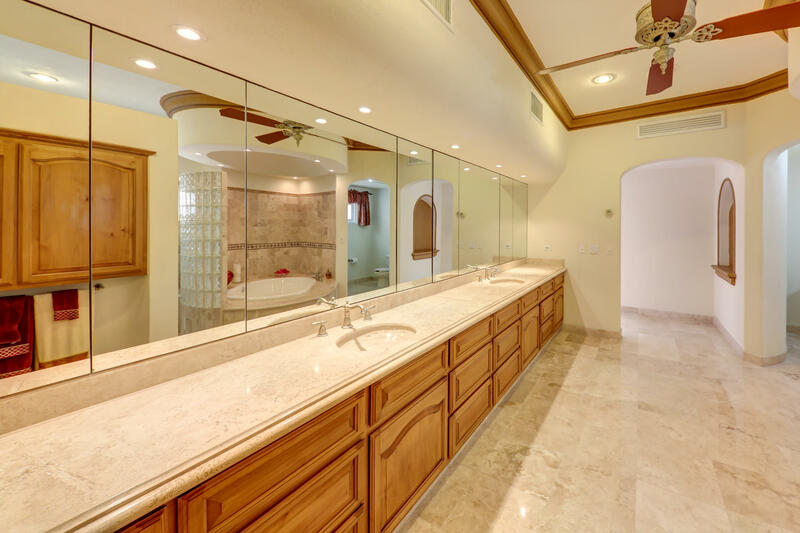 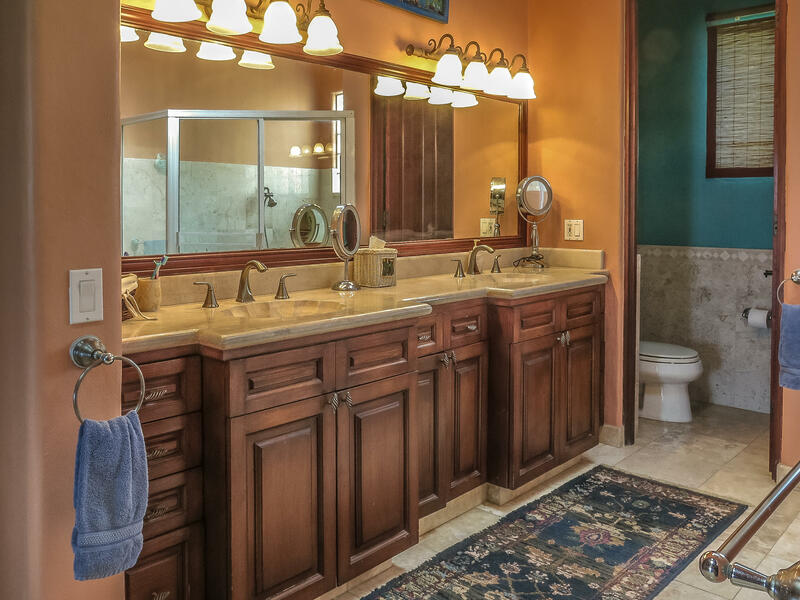 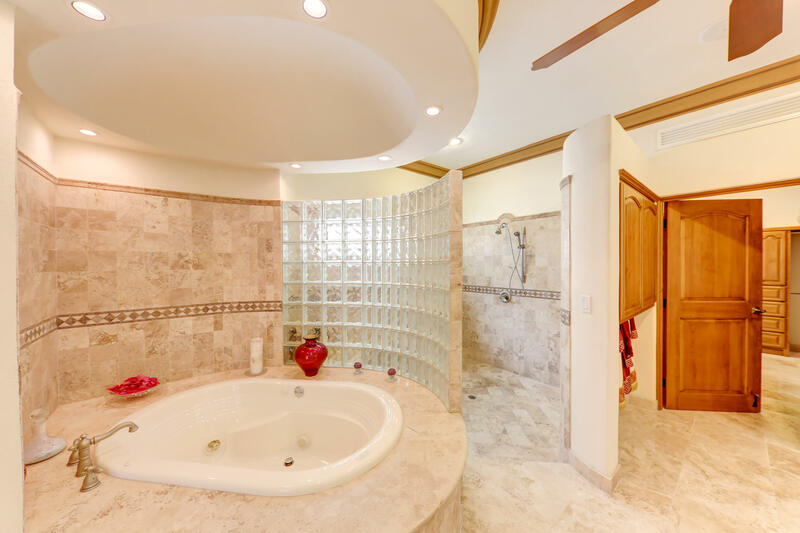 You must see this home to fully appreciate all the features of 4 Master Bedrooms, Media Room, 35 ft. pool with spa and separate Pool Changing/bathroom. 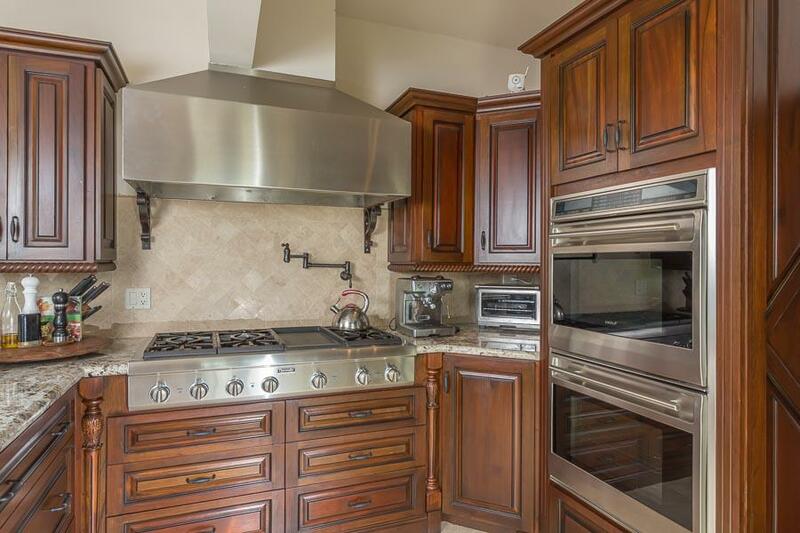 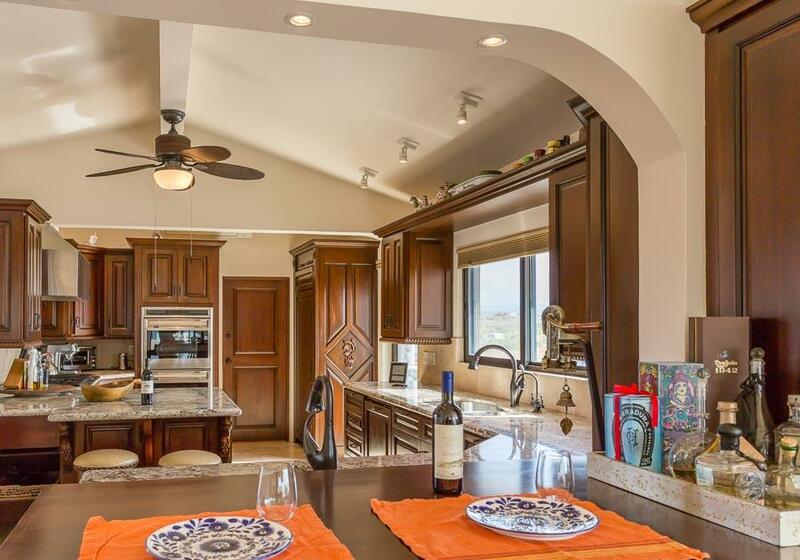 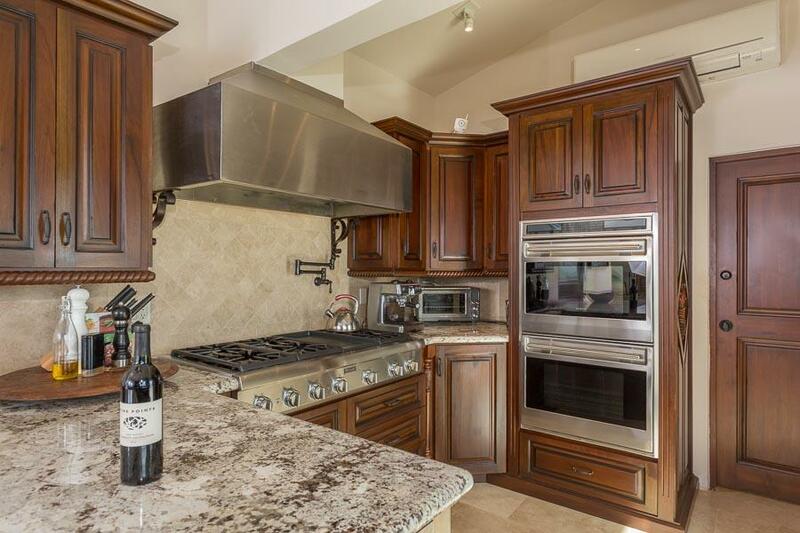 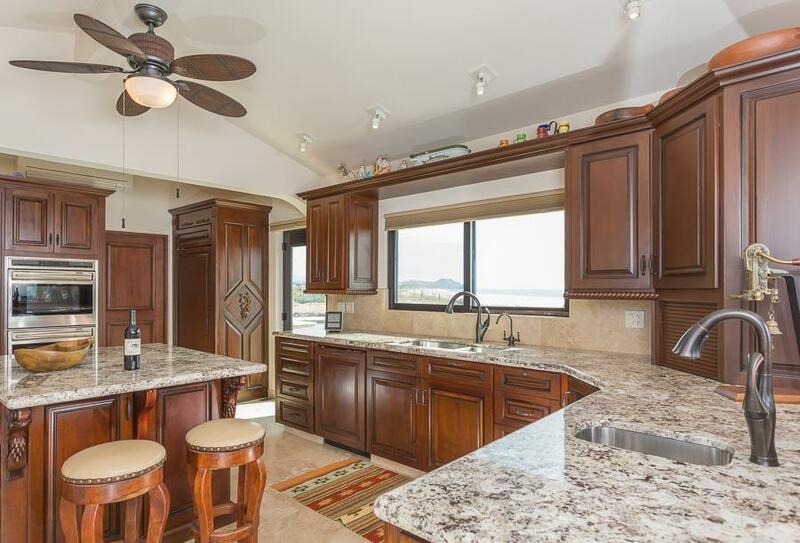 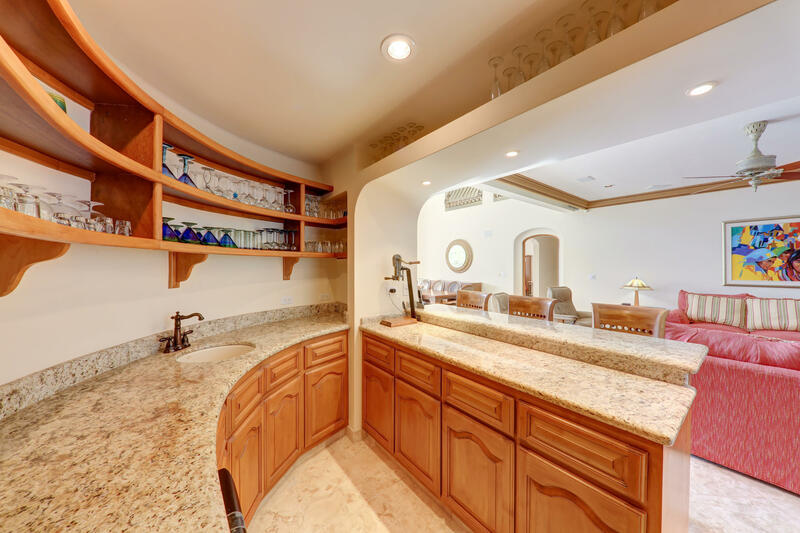 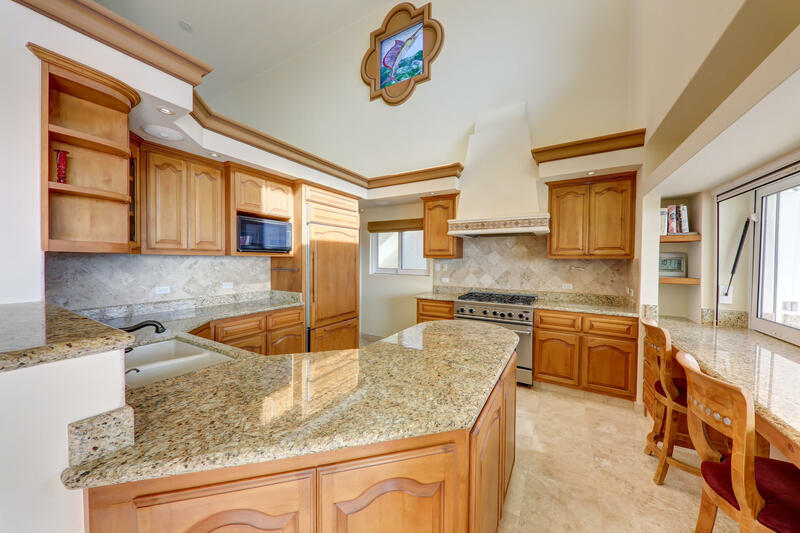 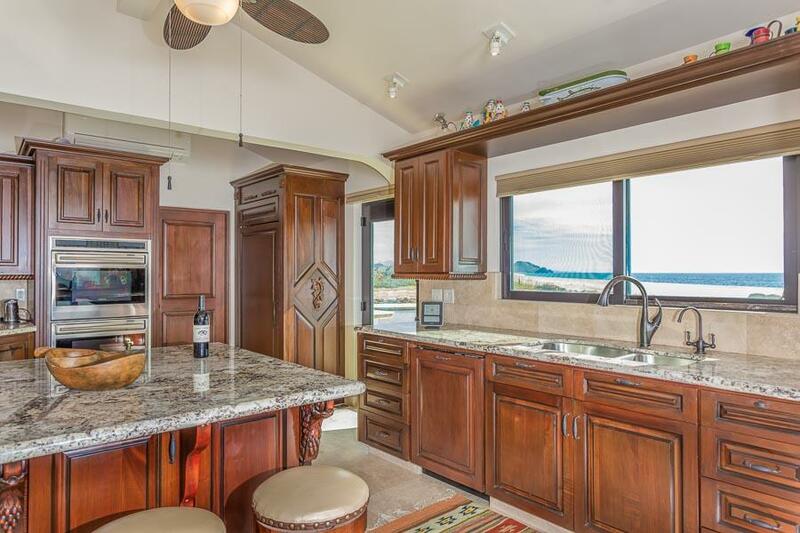 Chef's Dream kitchen with large gas cooking stove, granite counters, built in appliances; farmers copper sink; artesian talavera finishes; large family style dinning room that opens to pool, BBQ area, and living room. 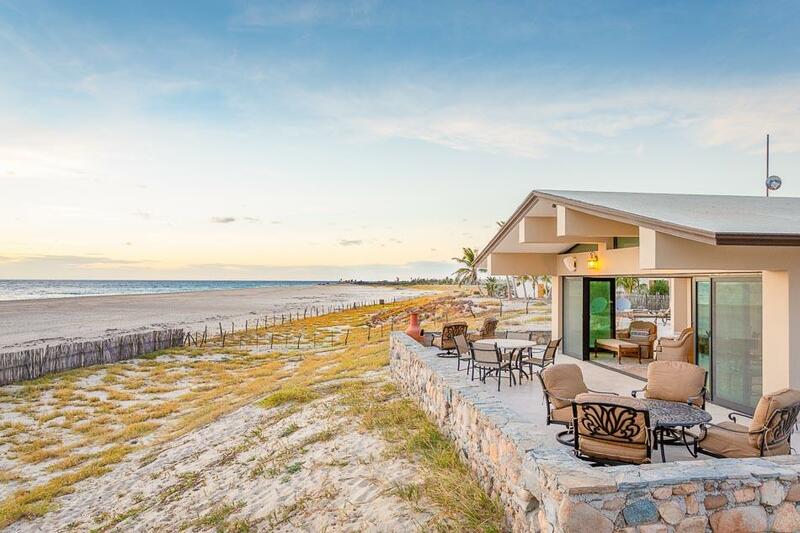 This design takes full advantage of the 60 feet of beach front and offers bright outdoor seating with protection from the sun and wind all year long. 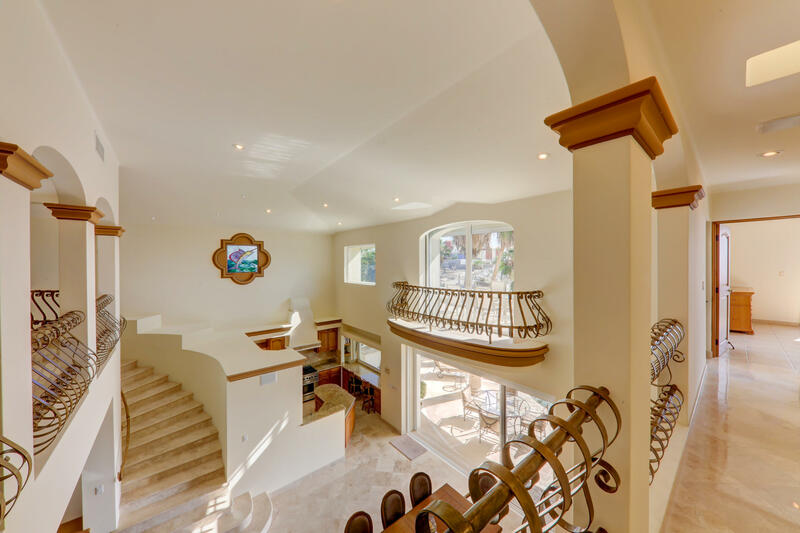 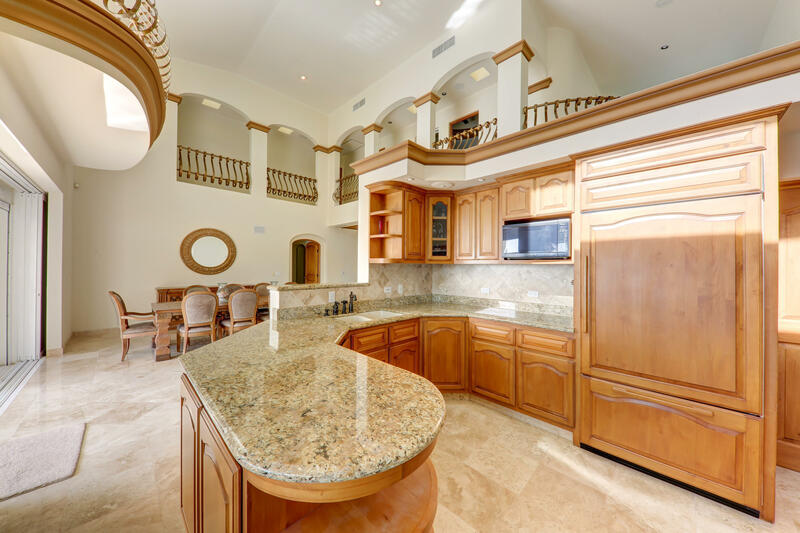 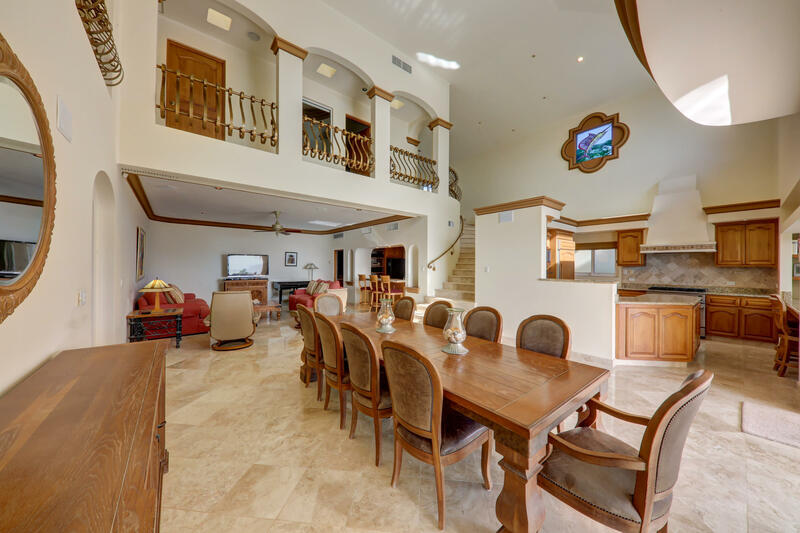 Stunning floating Canterra staircase to View Tower with 360 degree water, island, mountain and golf course views. 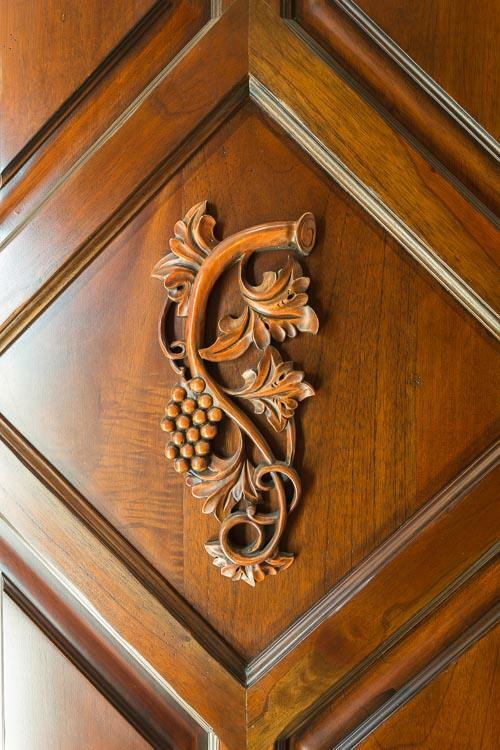 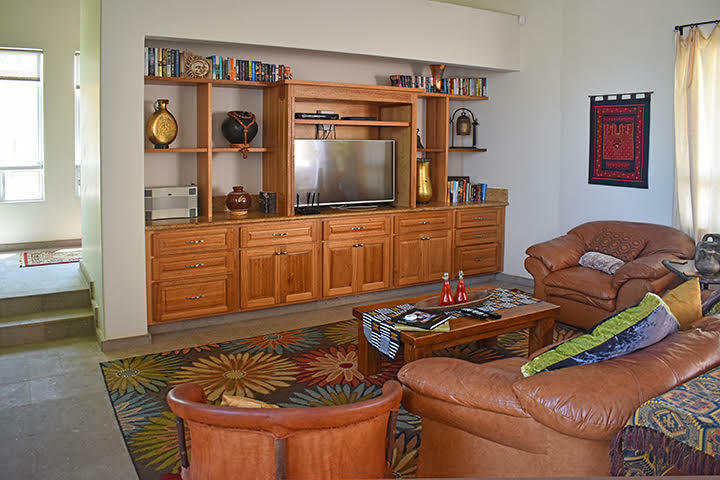 Includes all custom furniture, many handcrafted mesquite wood pieces! 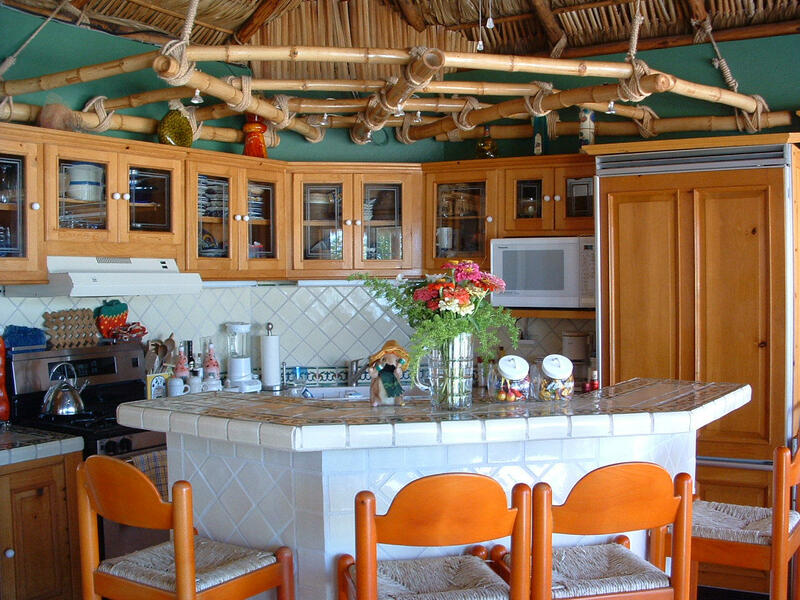 Description: Peace and quiet abound in this off-the-grid solar-powered home away from it all. 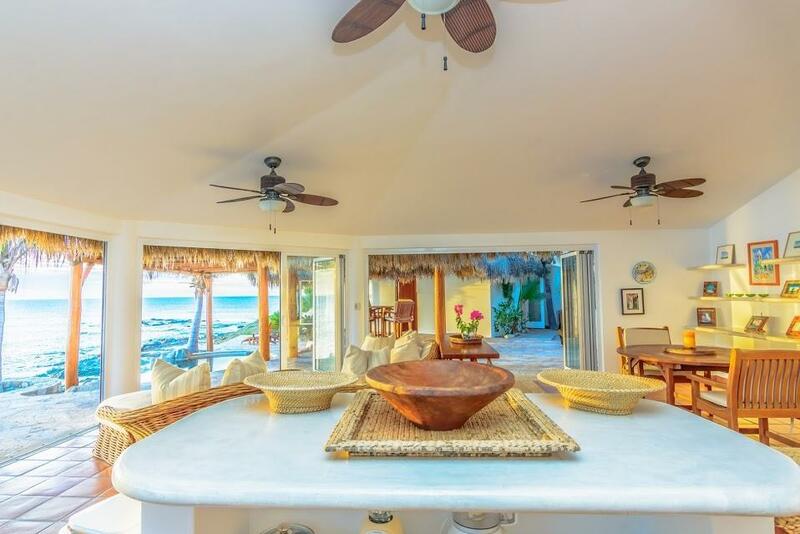 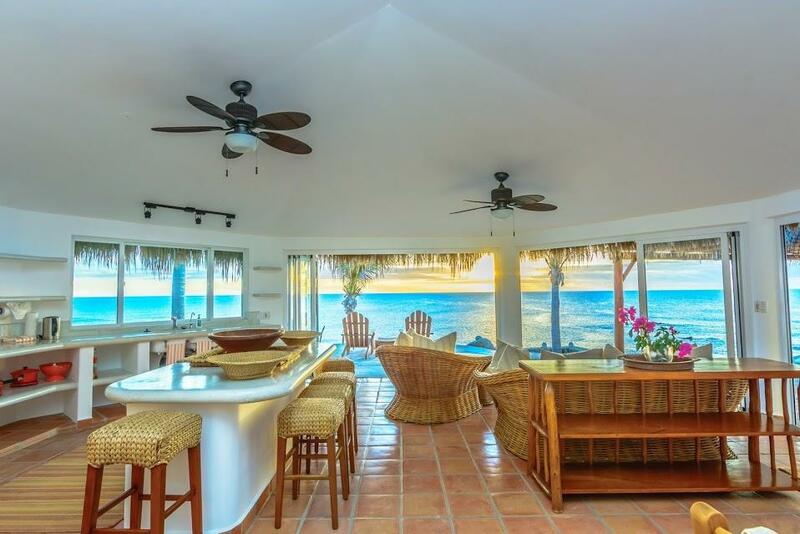 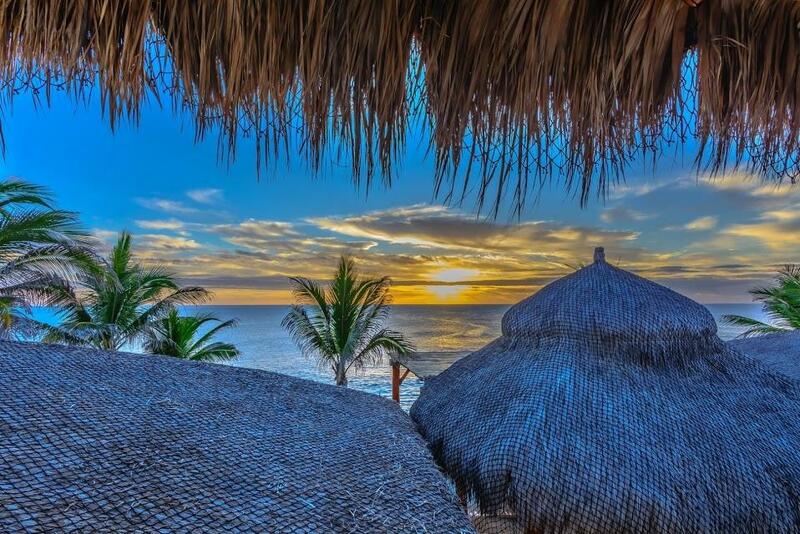 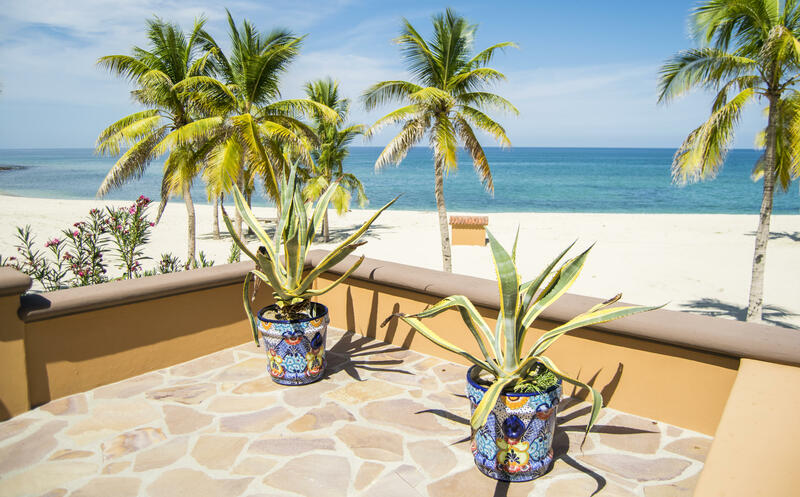 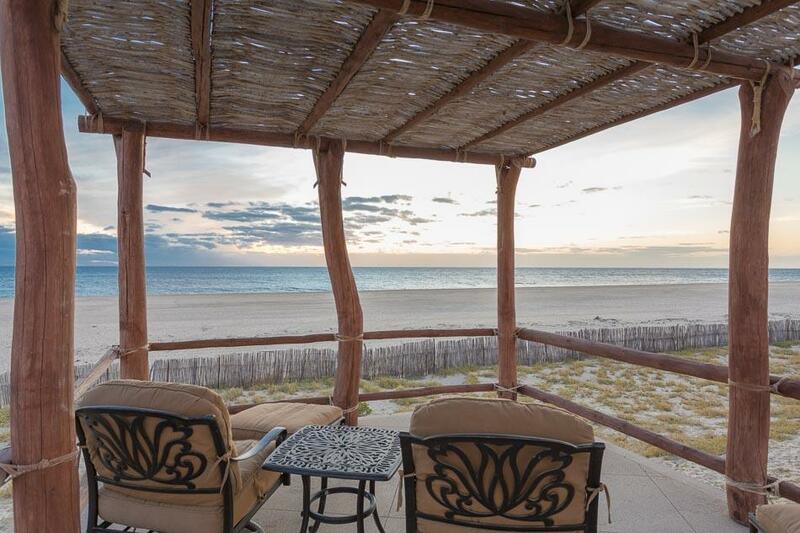 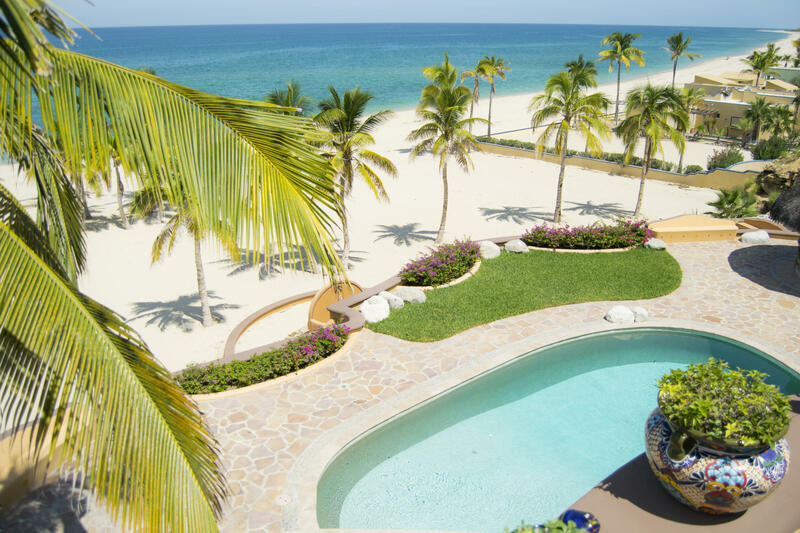 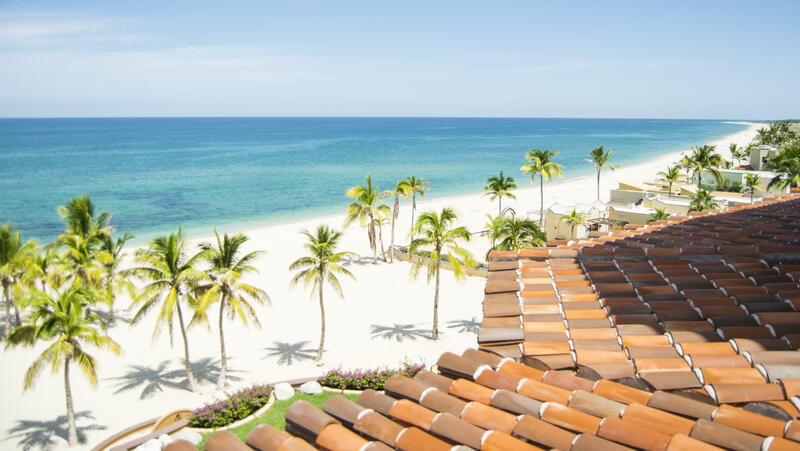 The perfect beachfront retreat where birdsong, gentle breezes in the palms and the ocean waves are your soundtrack. 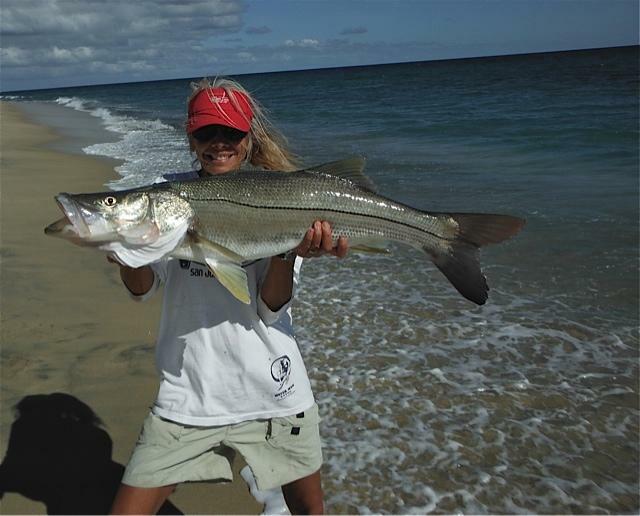 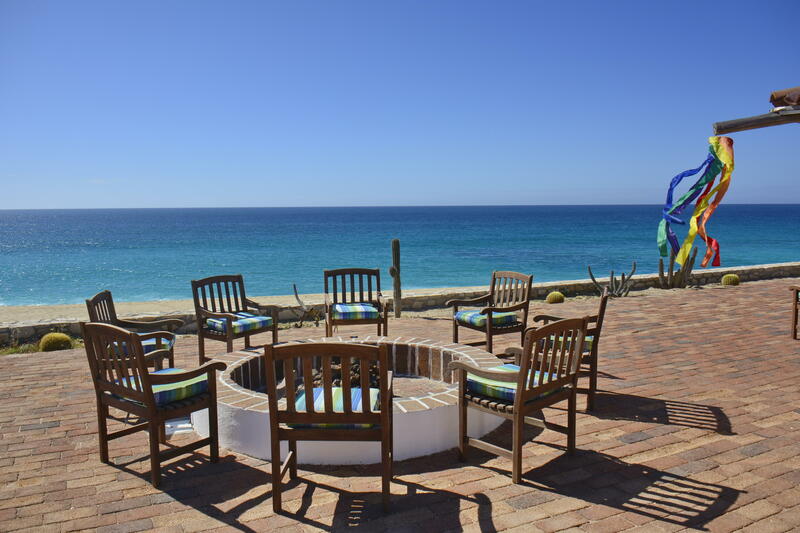 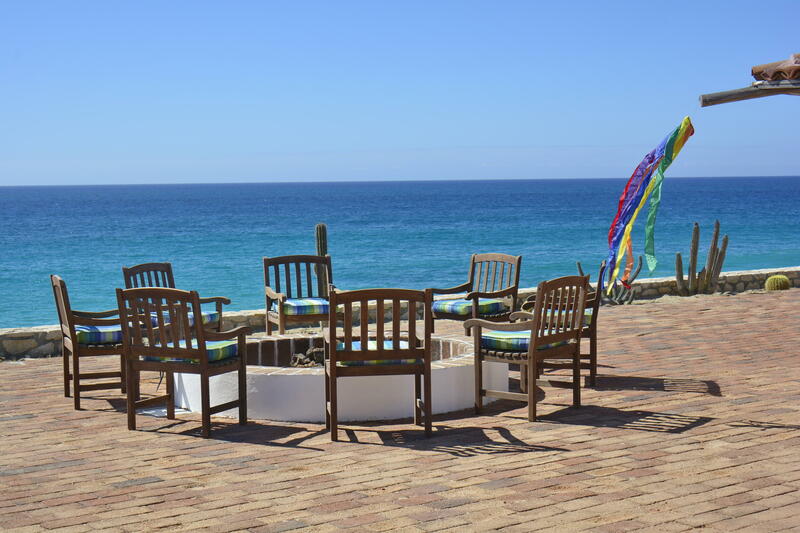 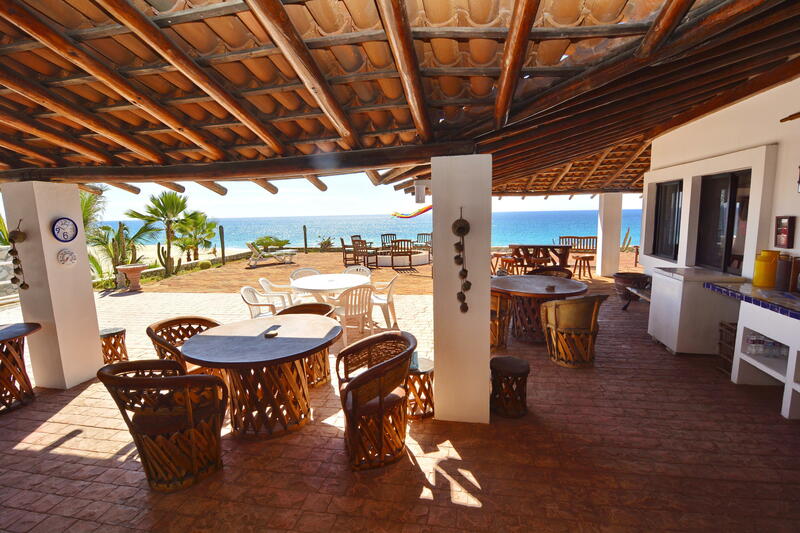 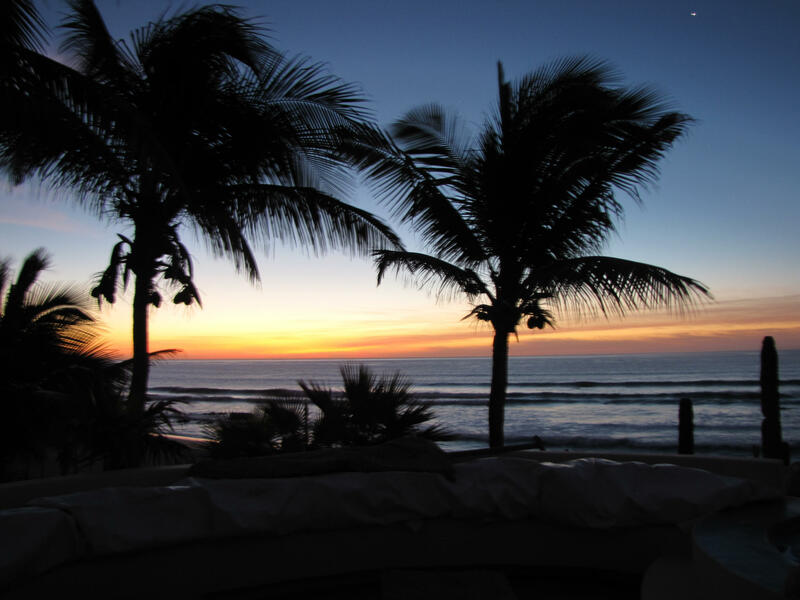 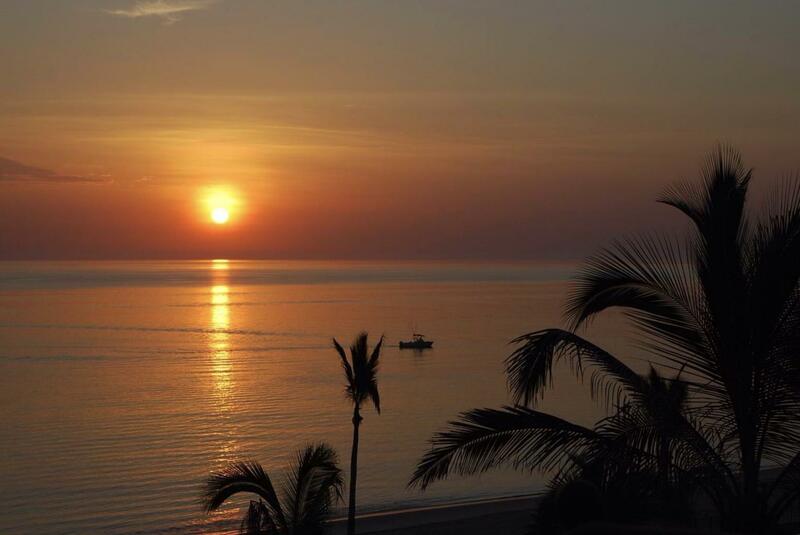 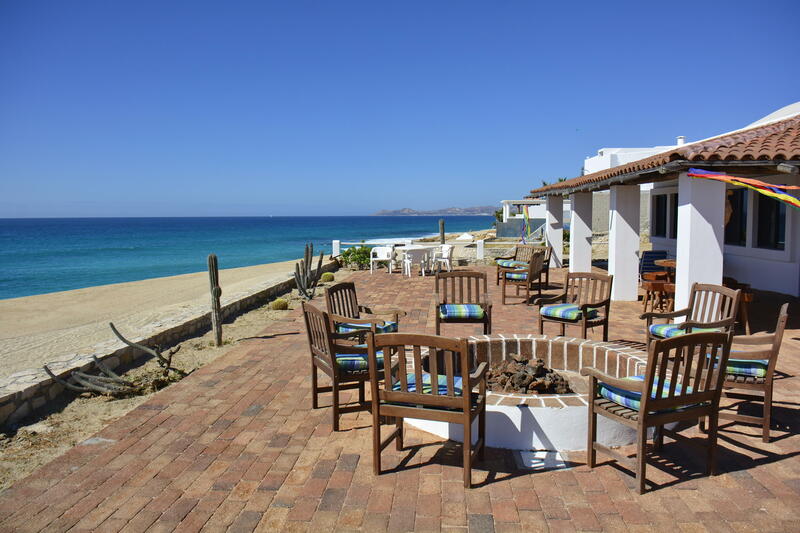 Whale watch from your patio, bask by the pool, walk on the sandy beach without seeing another soul. 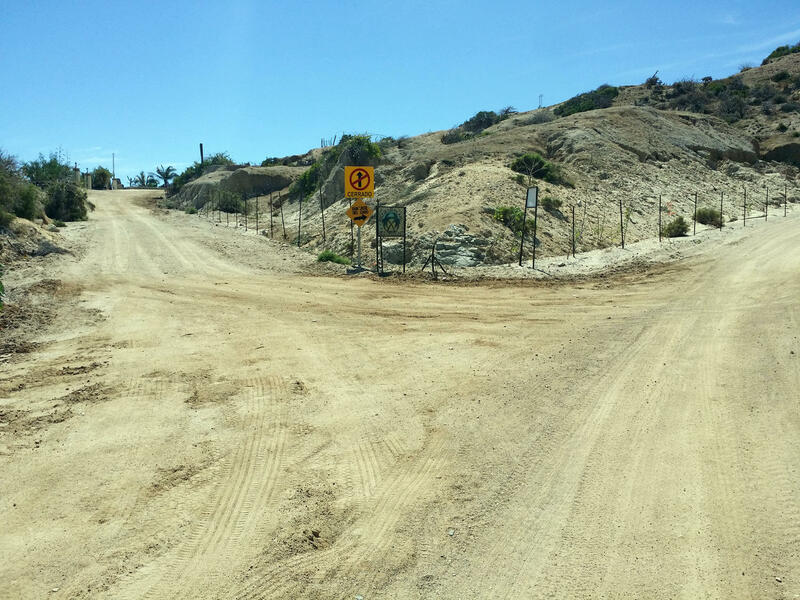 Or maybe an ATV ride up the large arroyo is more your speed. 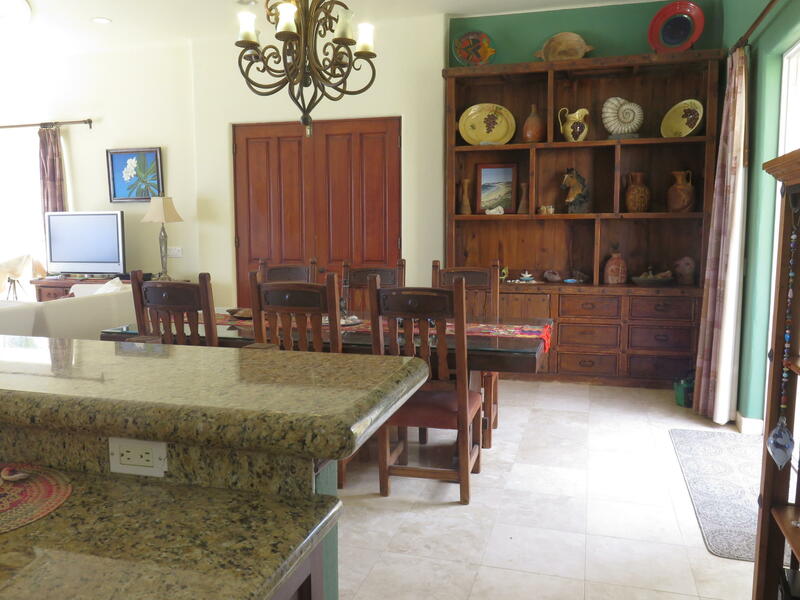 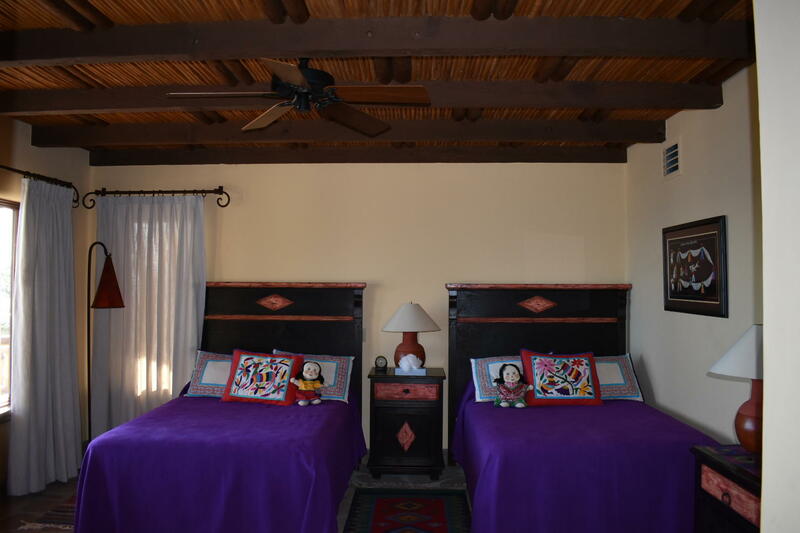 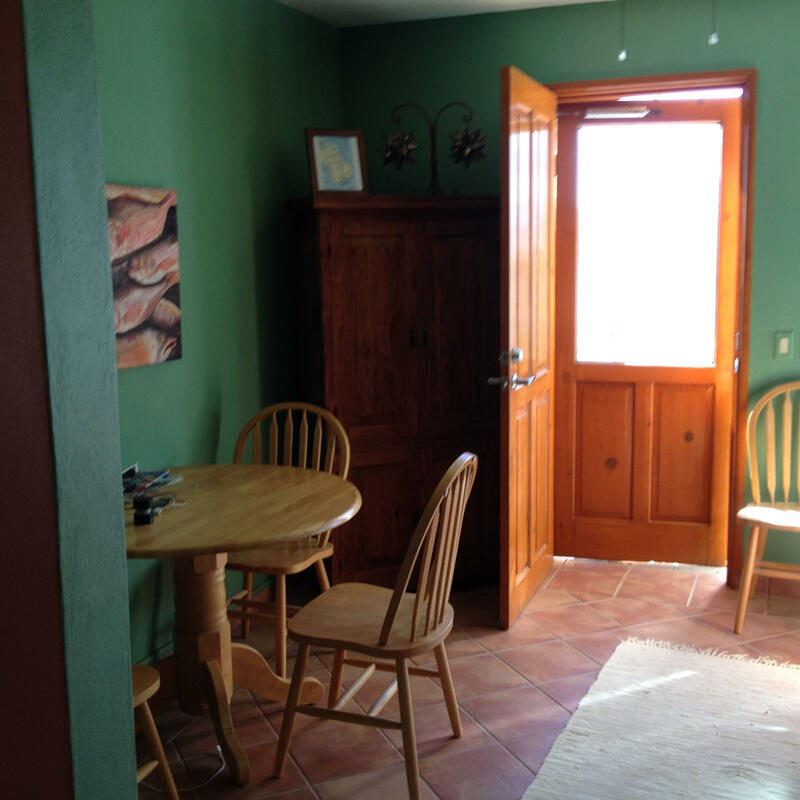 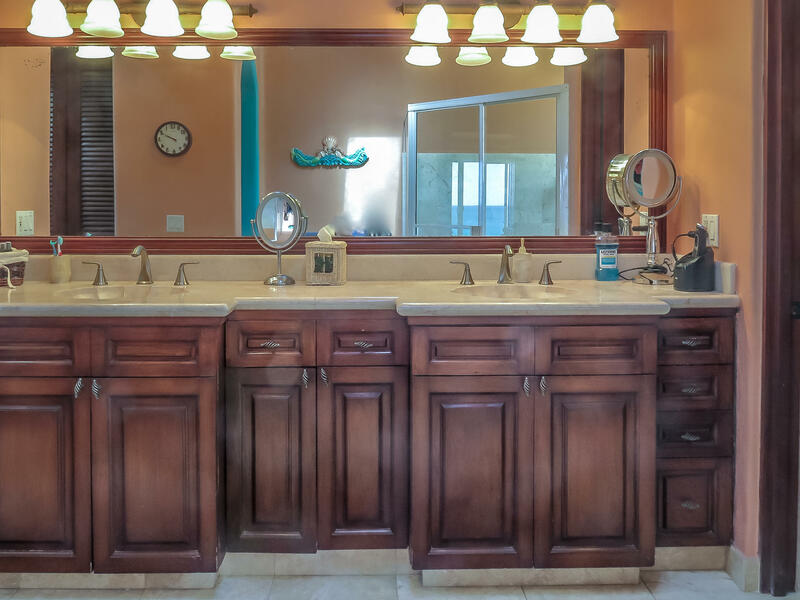 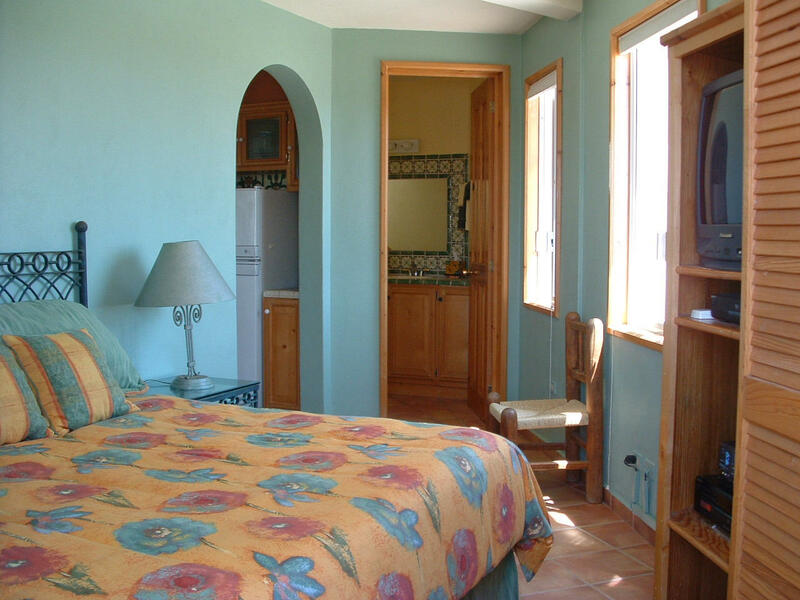 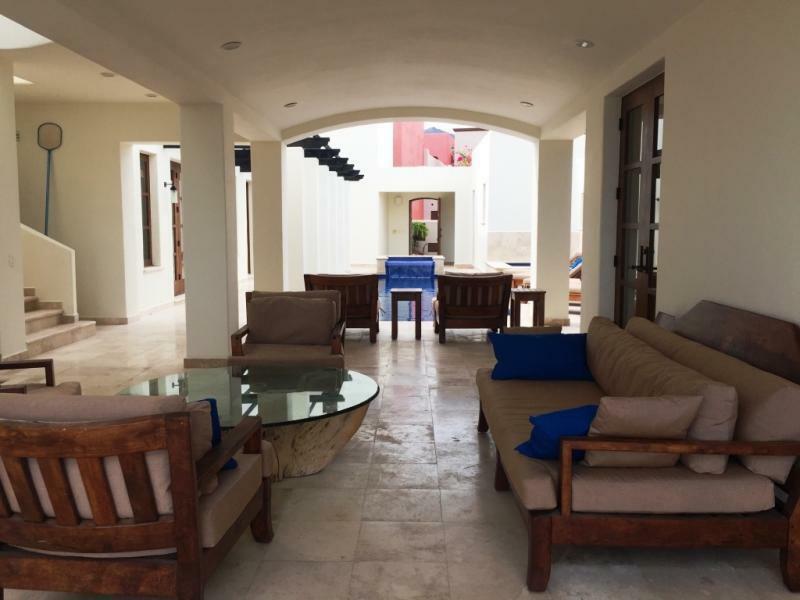 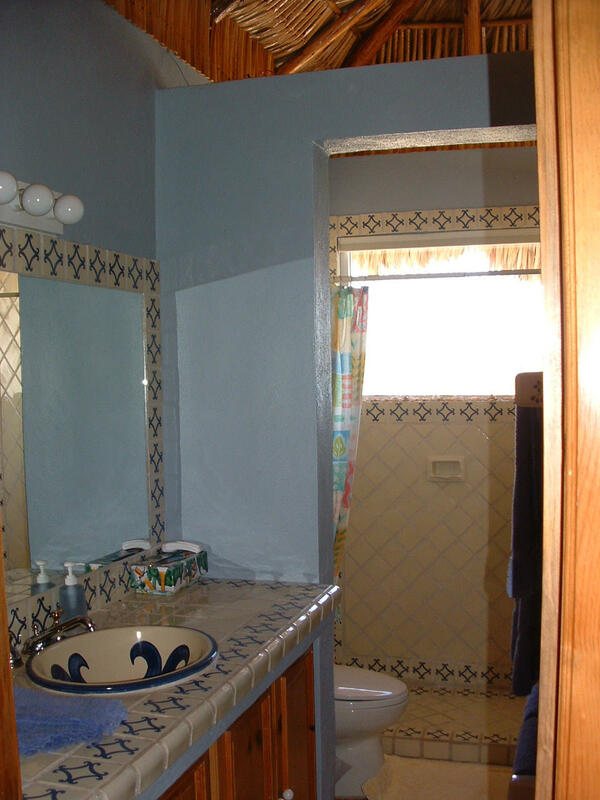 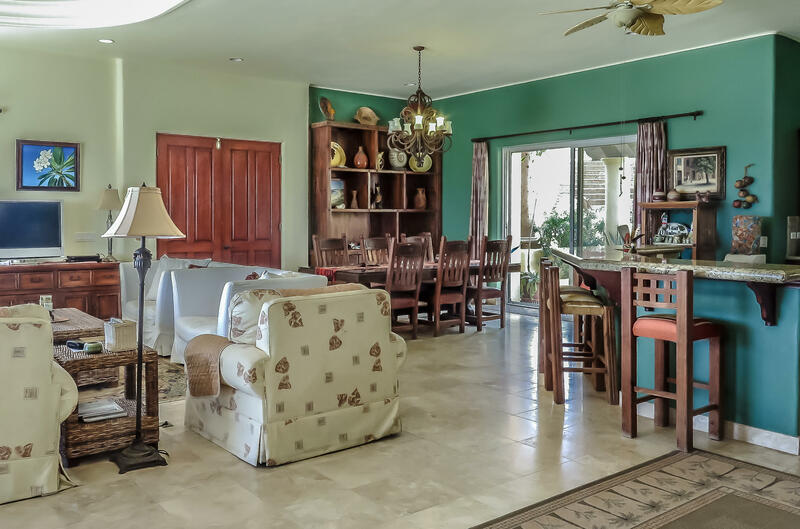 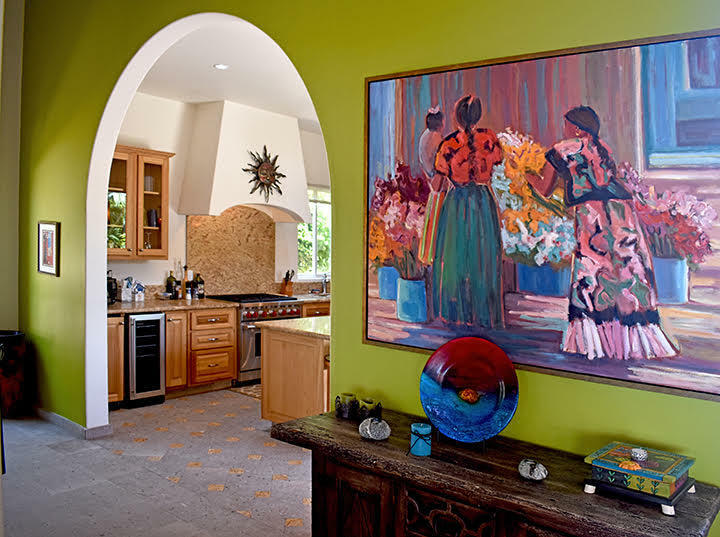 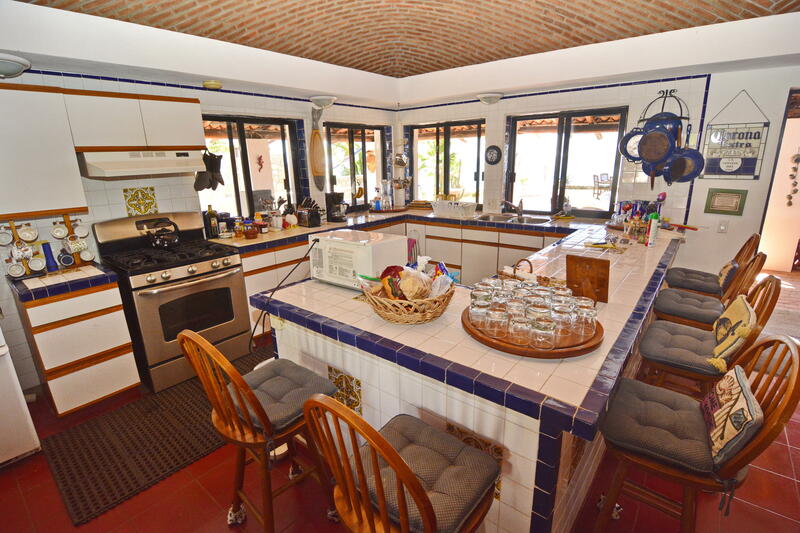 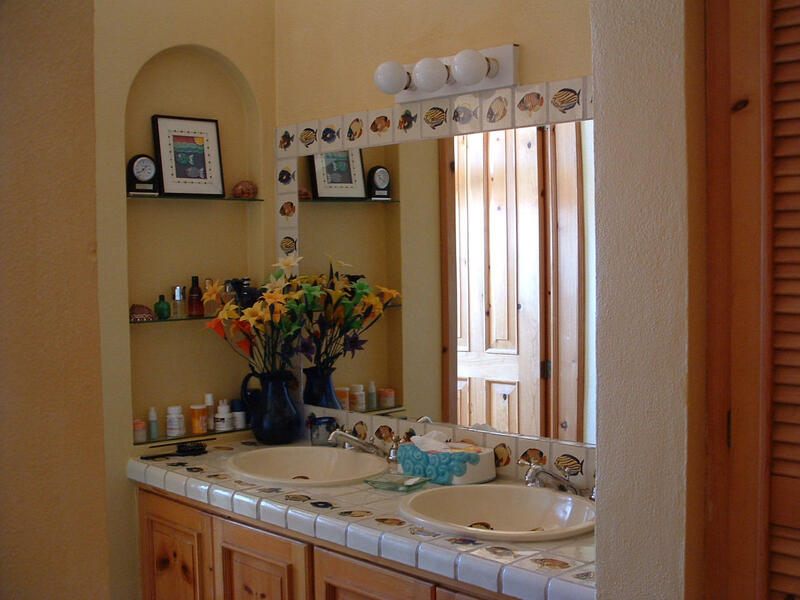 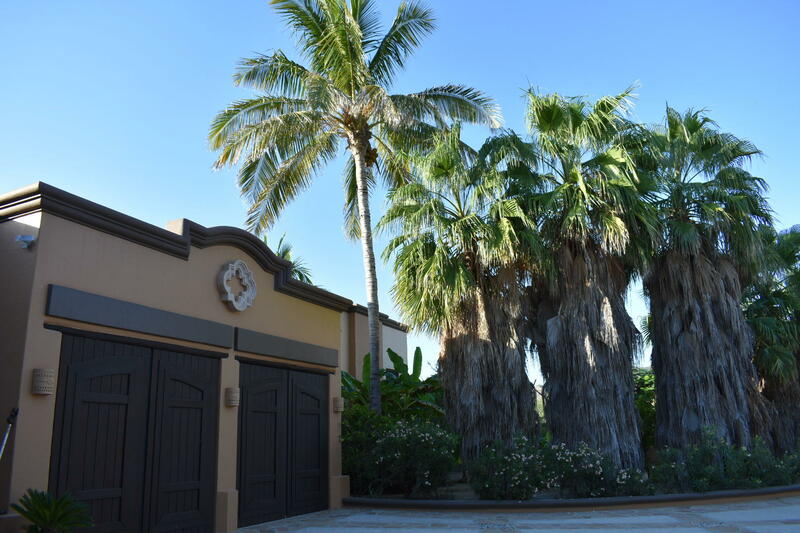 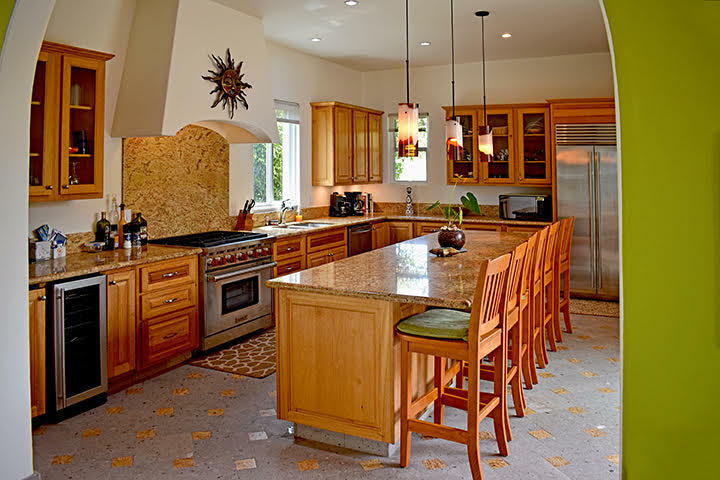 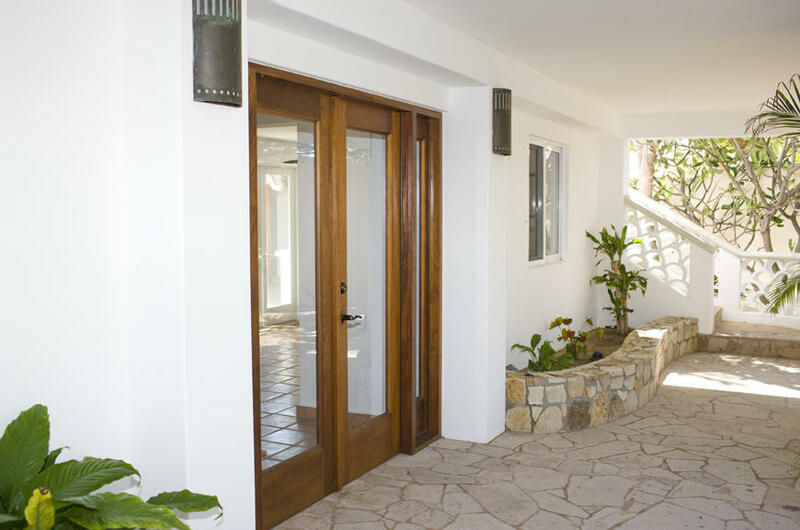 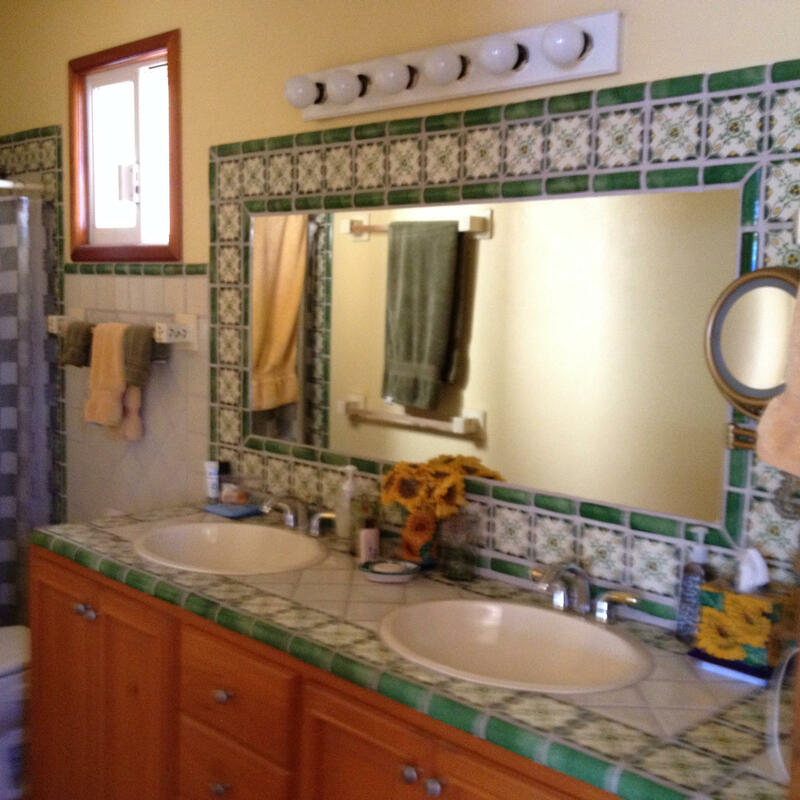 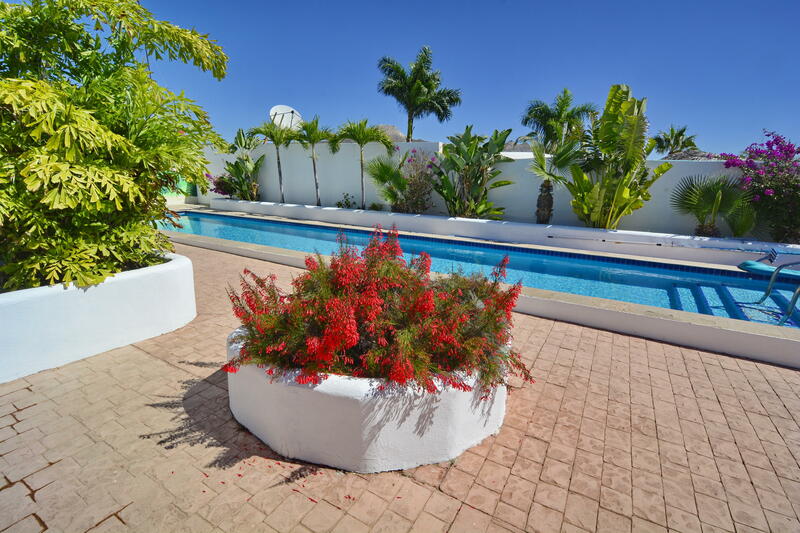 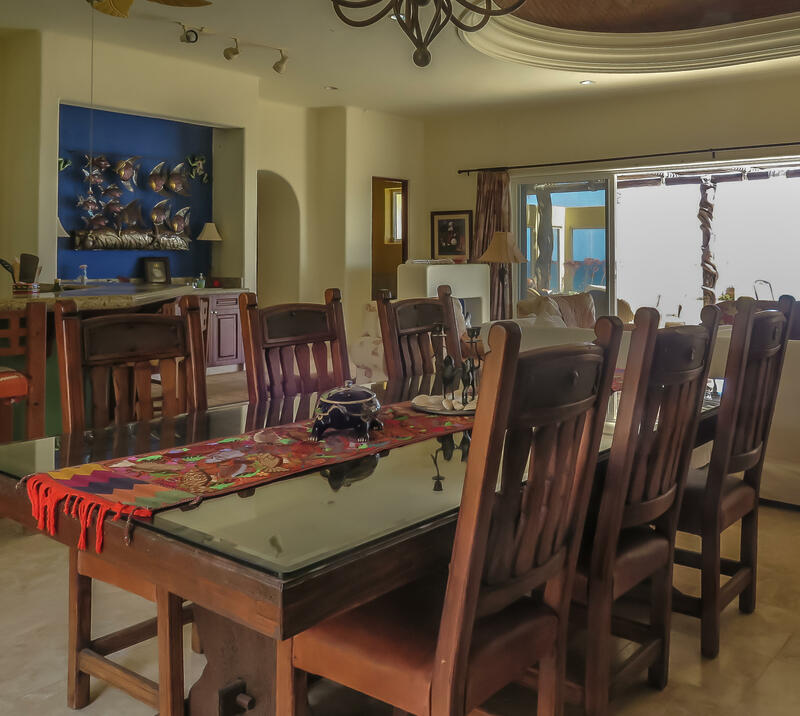 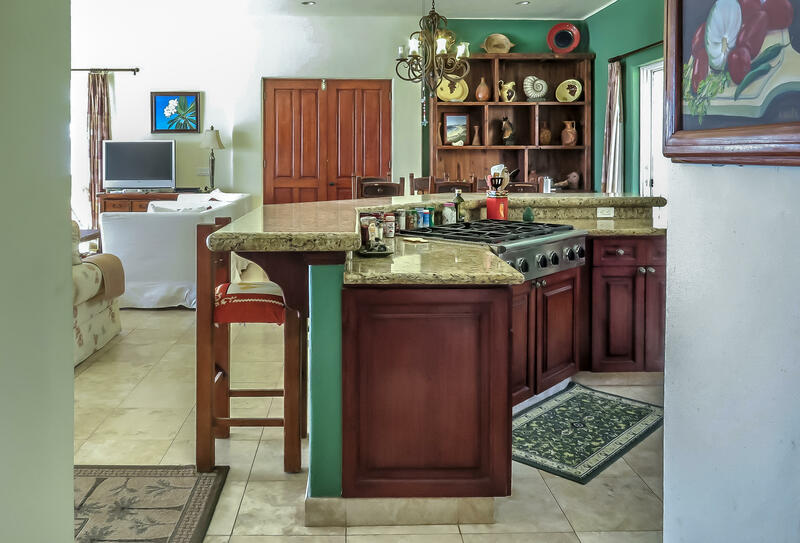 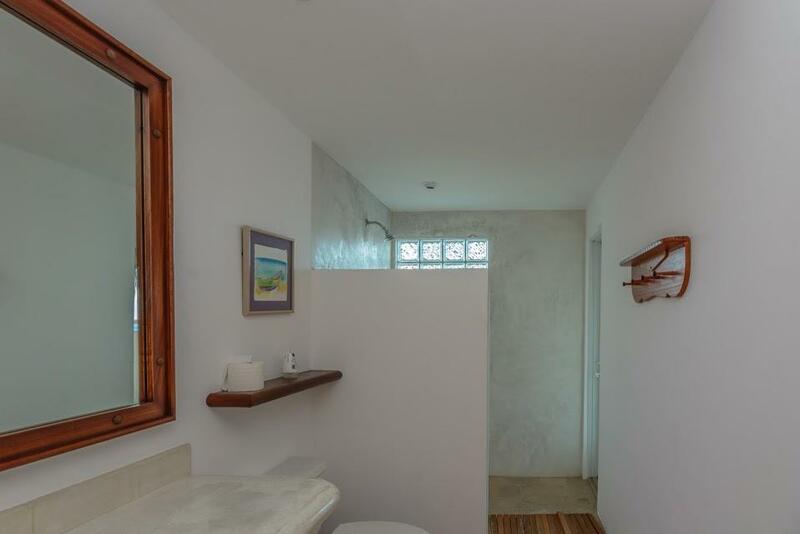 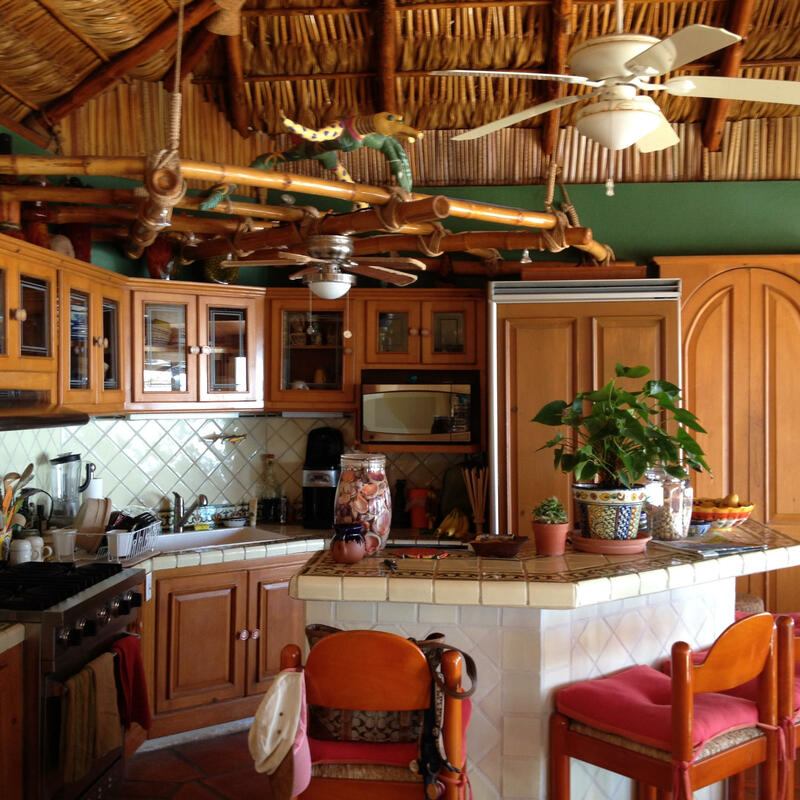 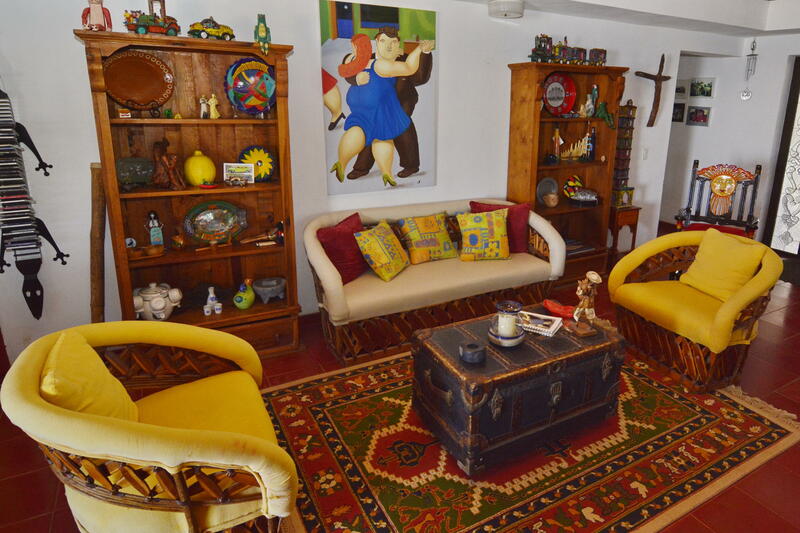 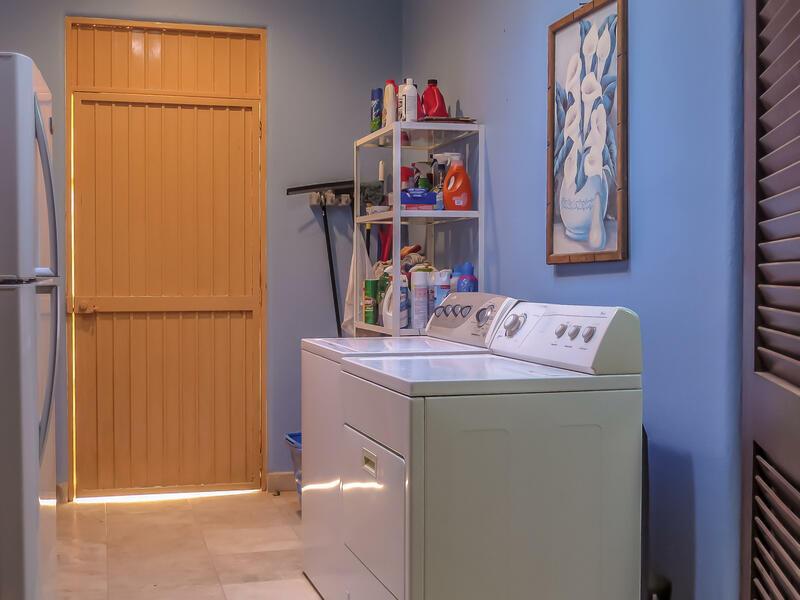 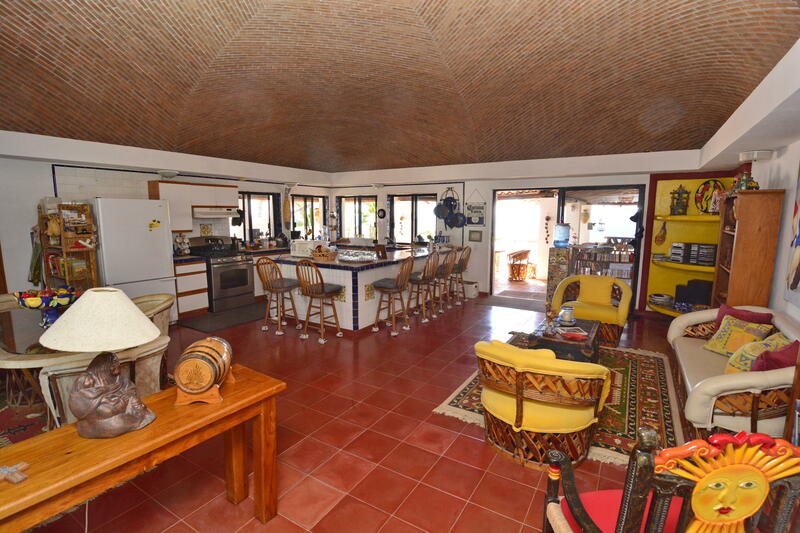 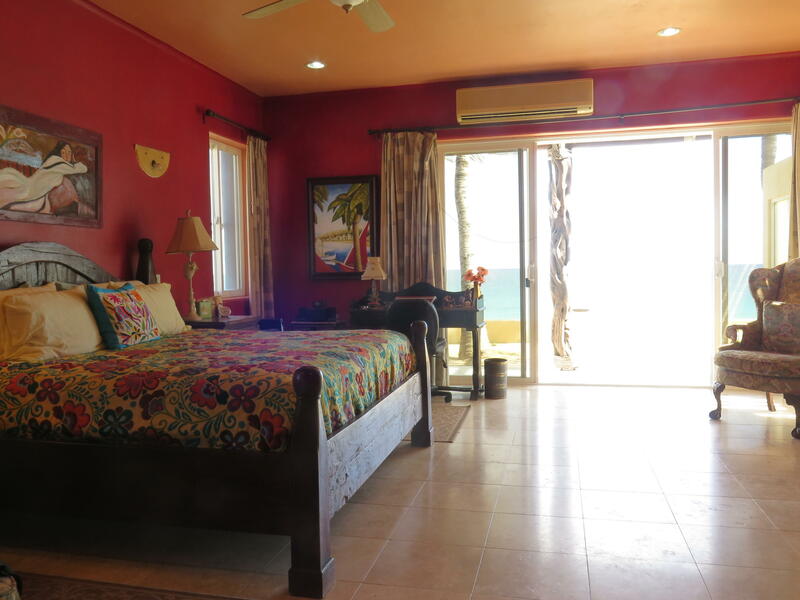 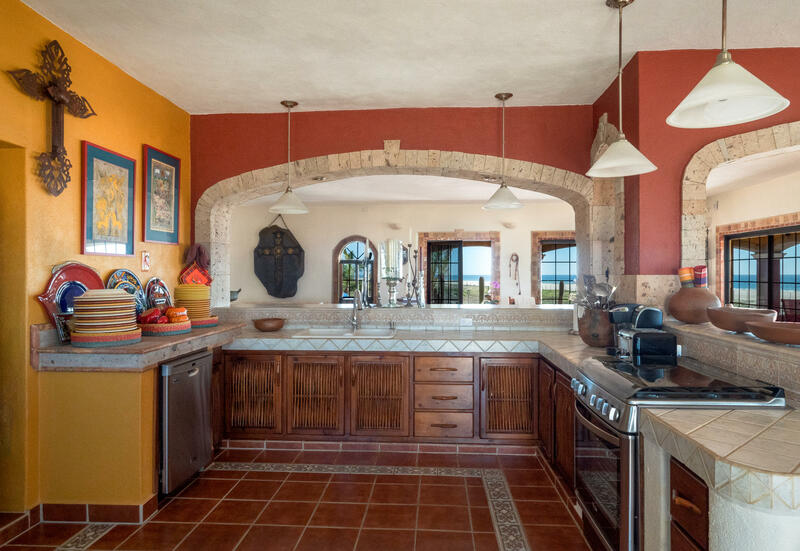 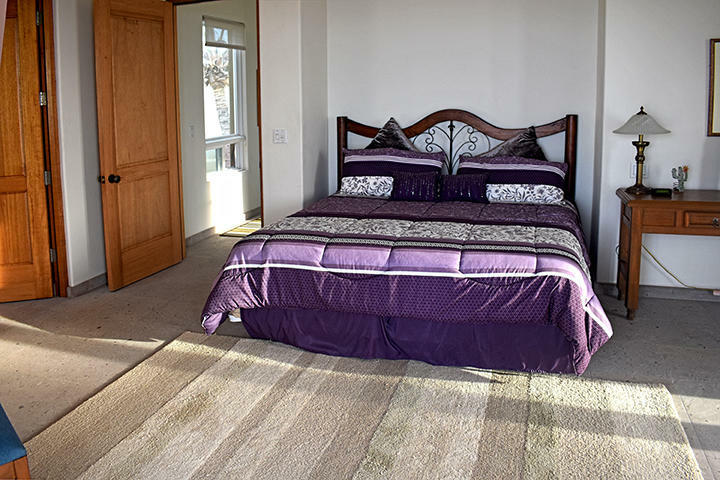 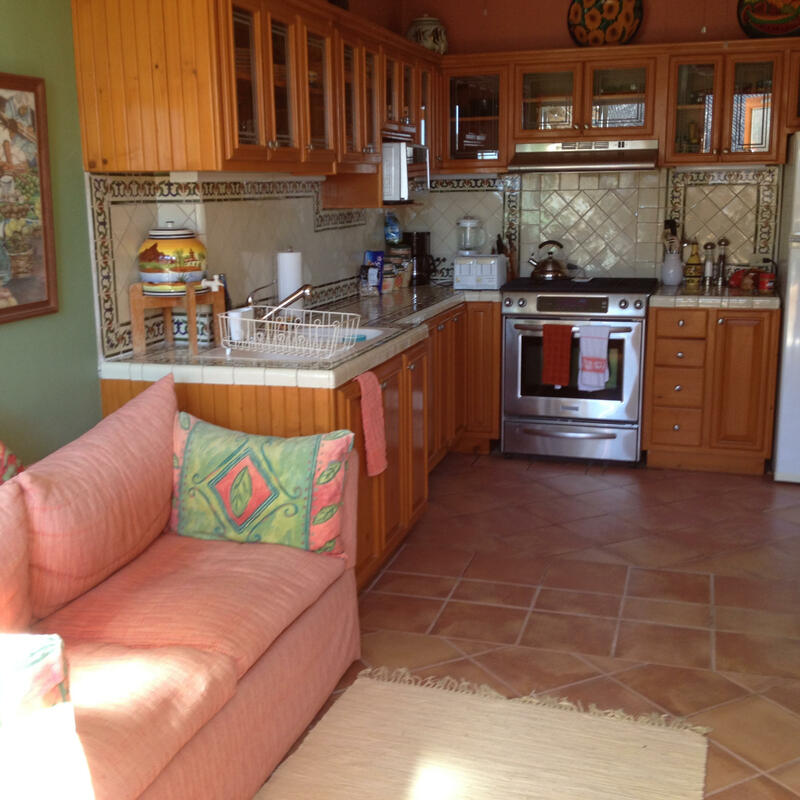 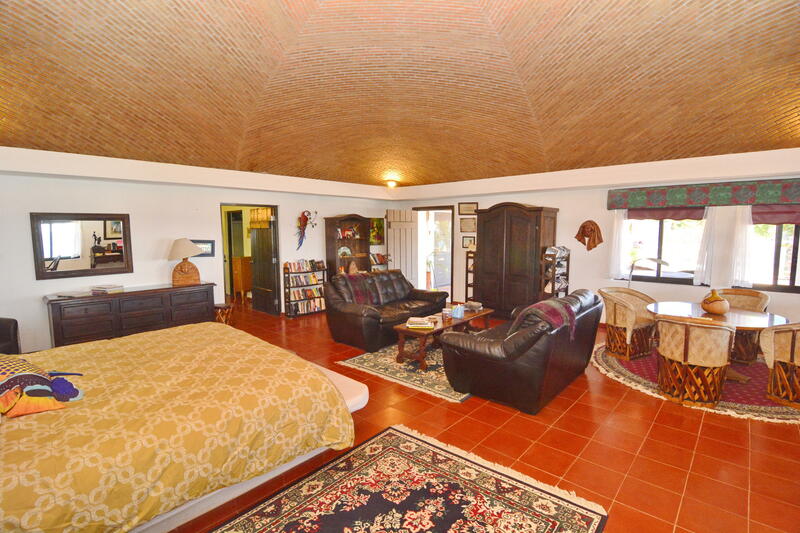 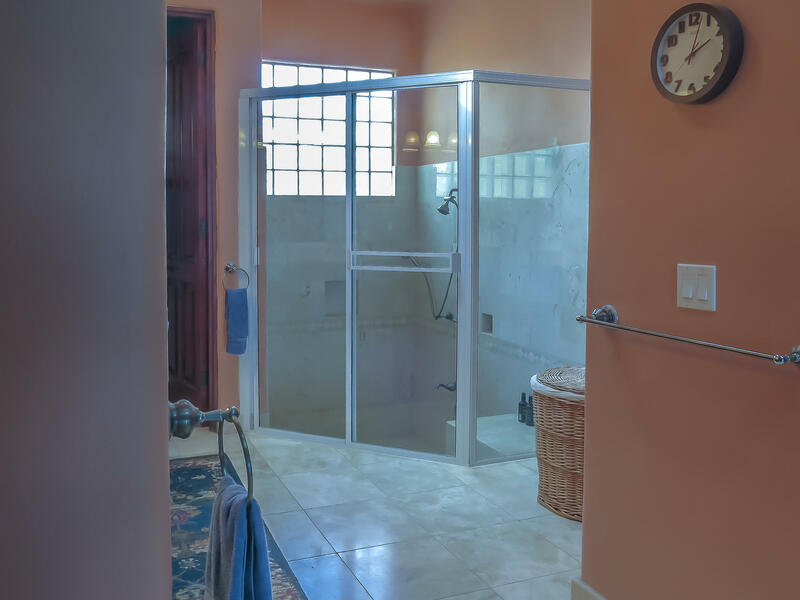 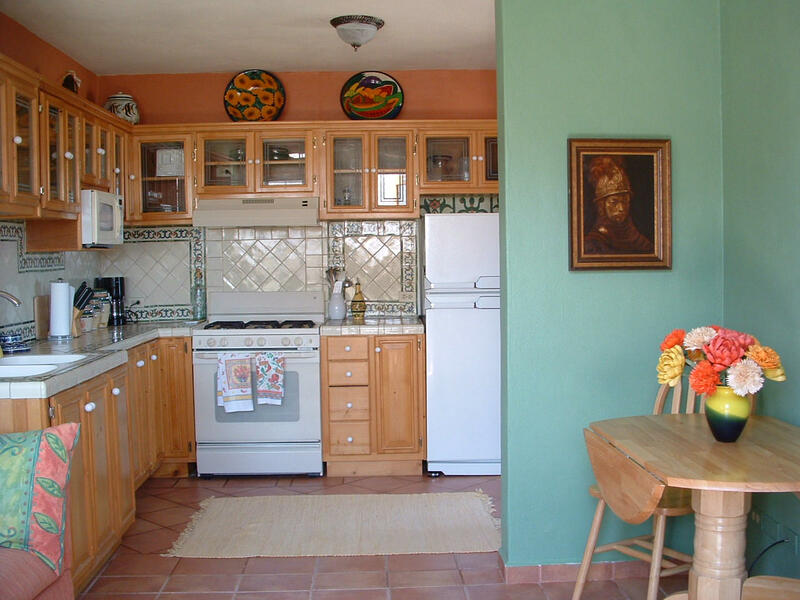 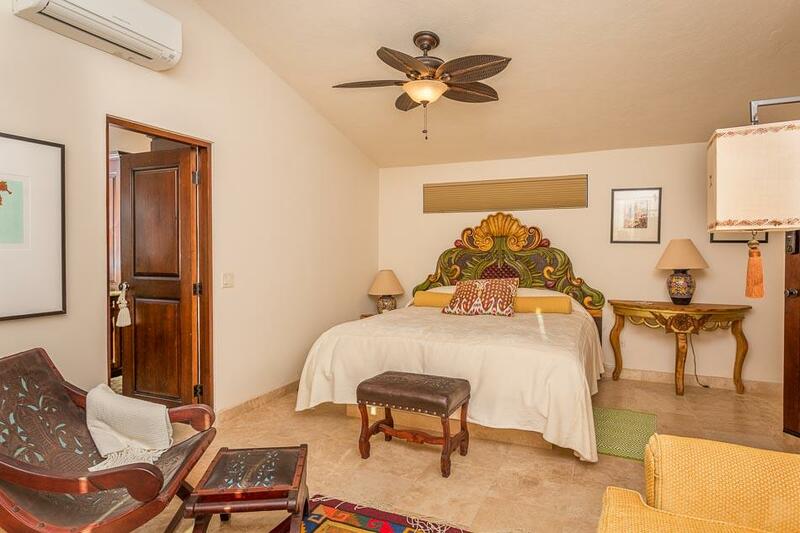 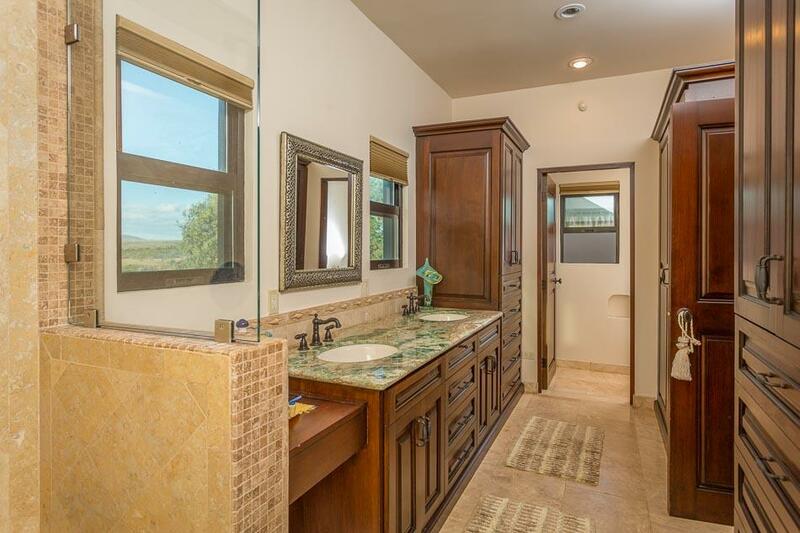 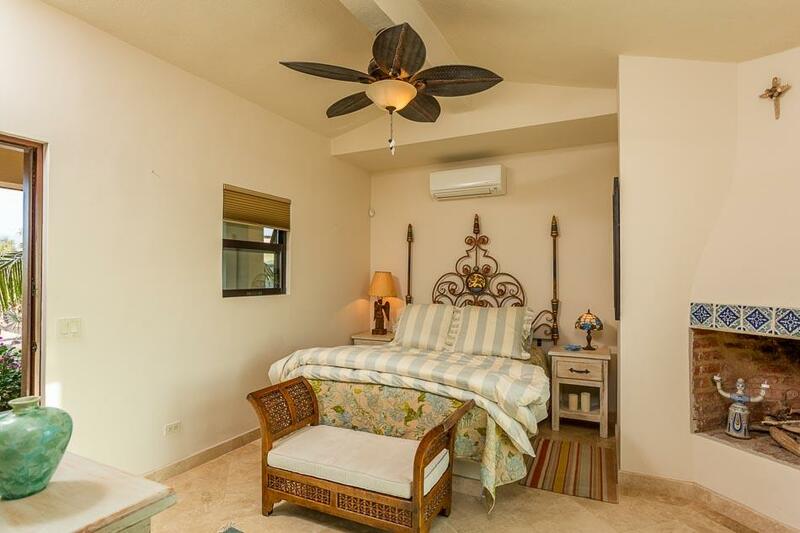 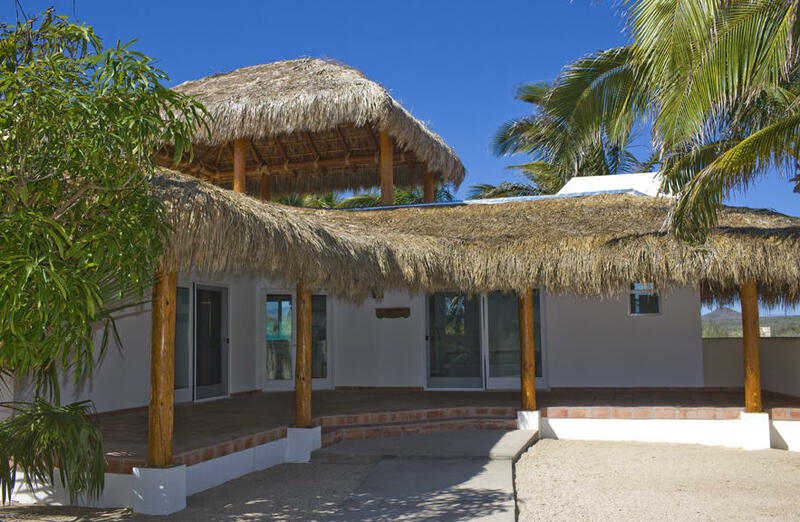 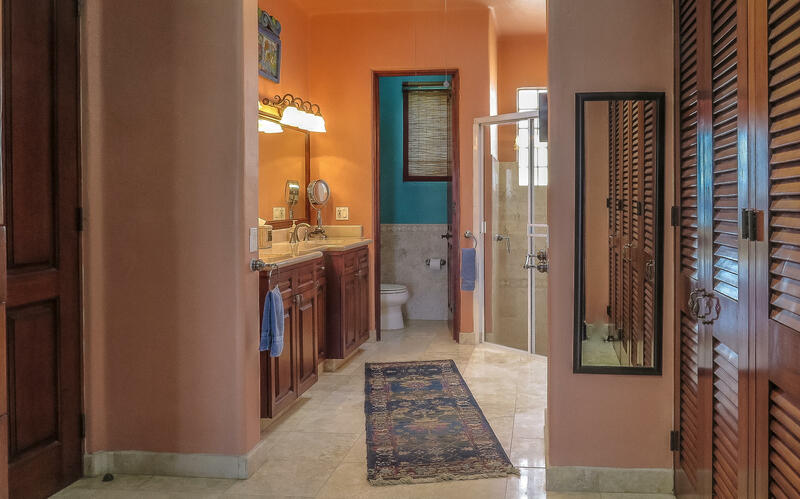 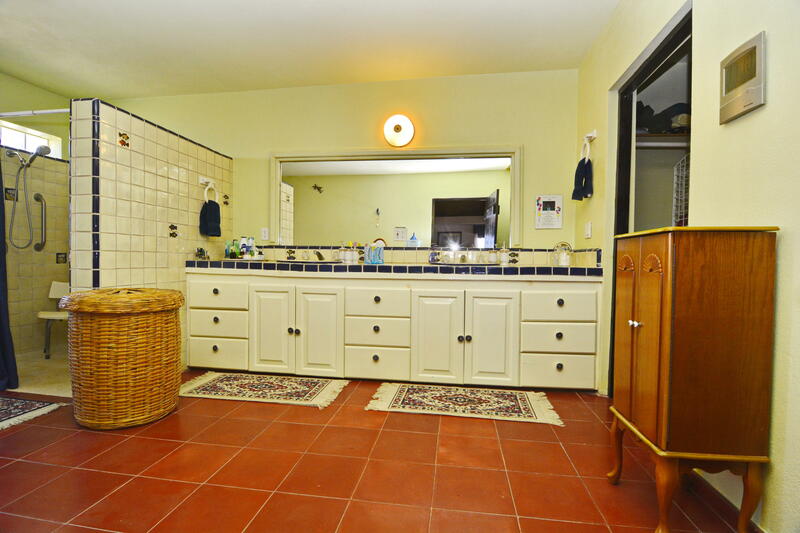 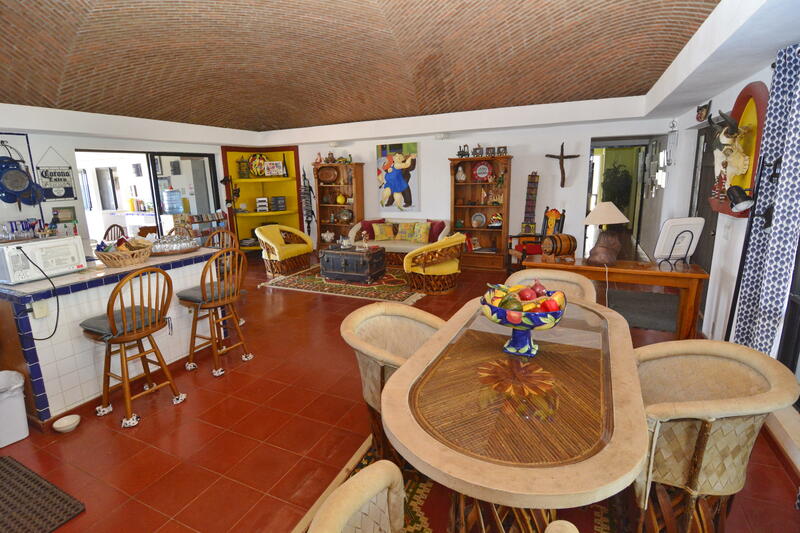 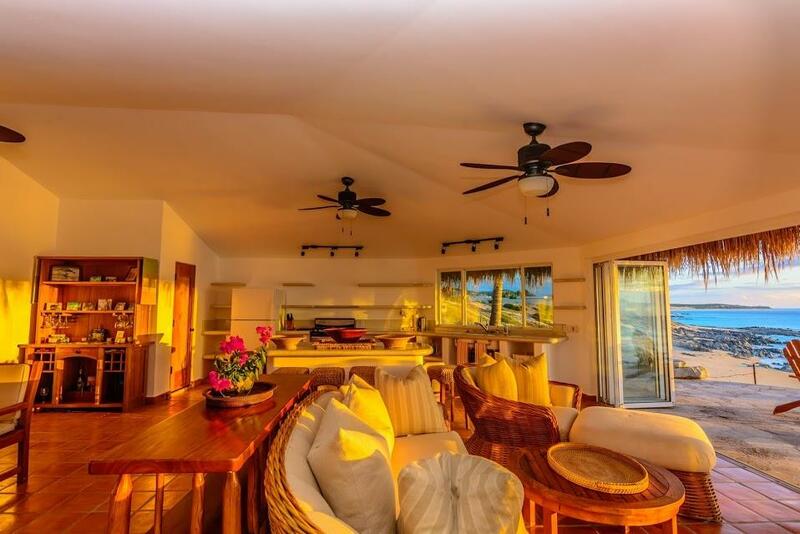 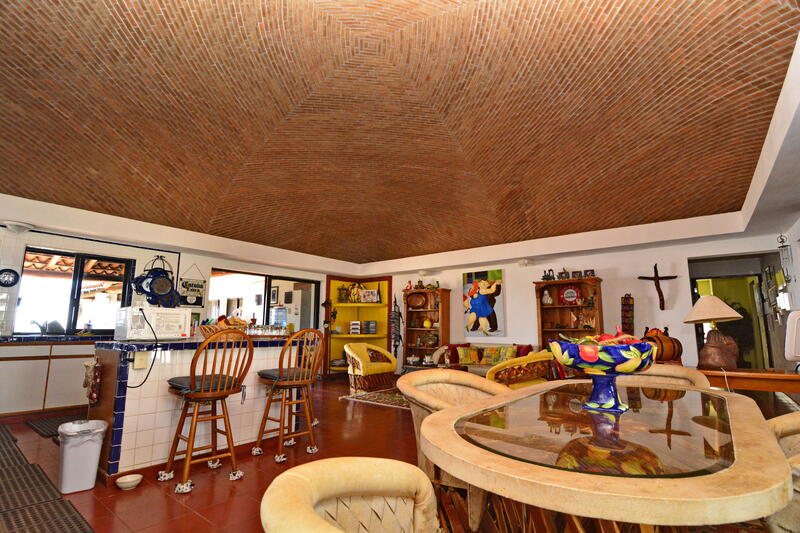 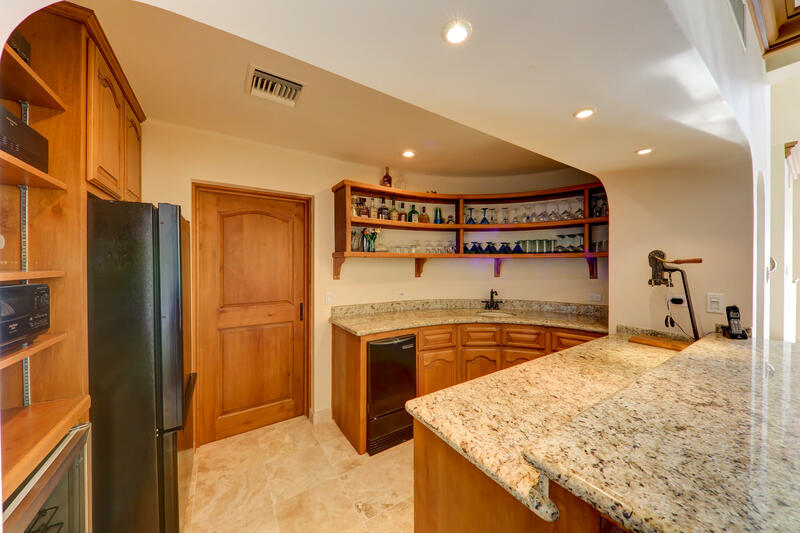 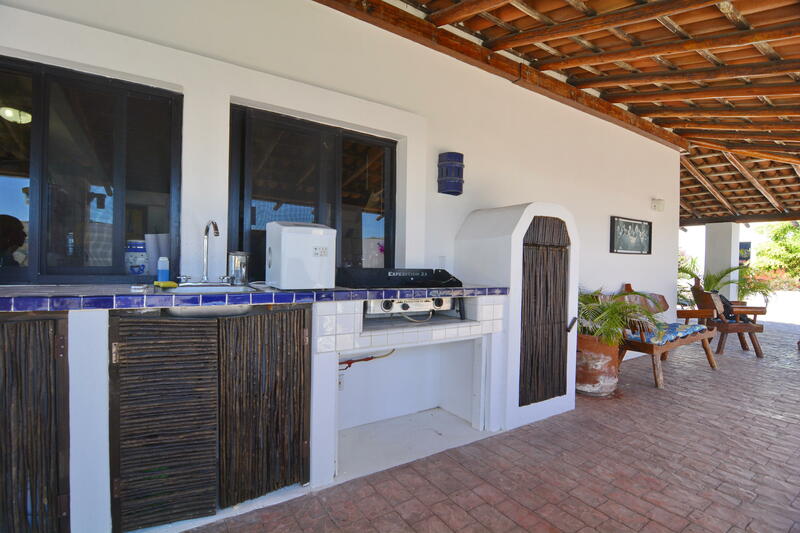 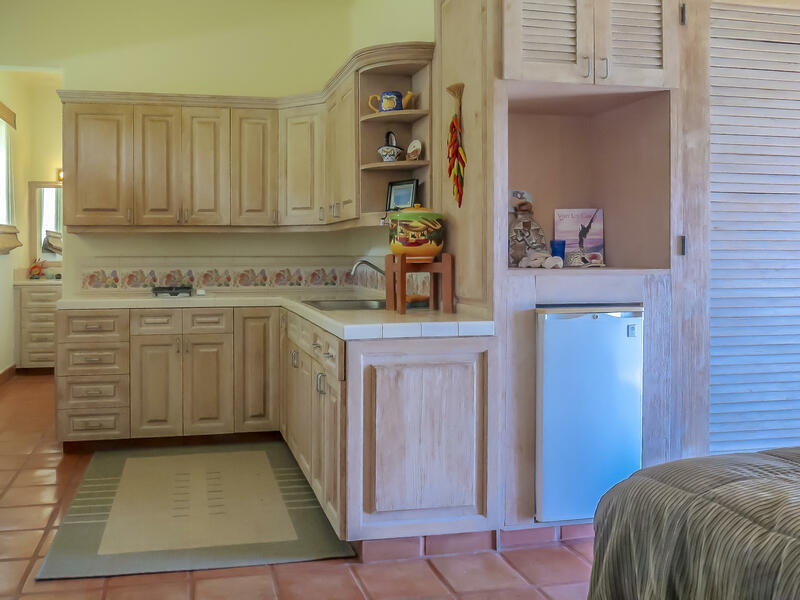 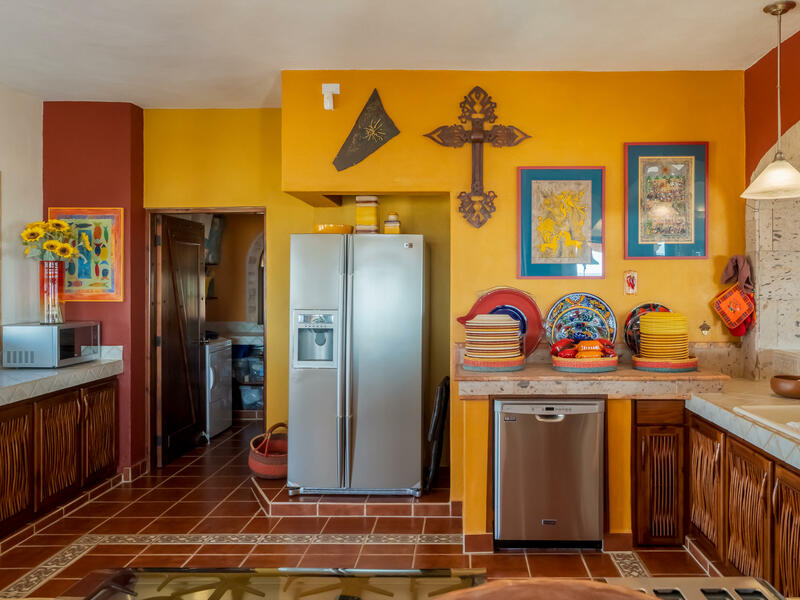 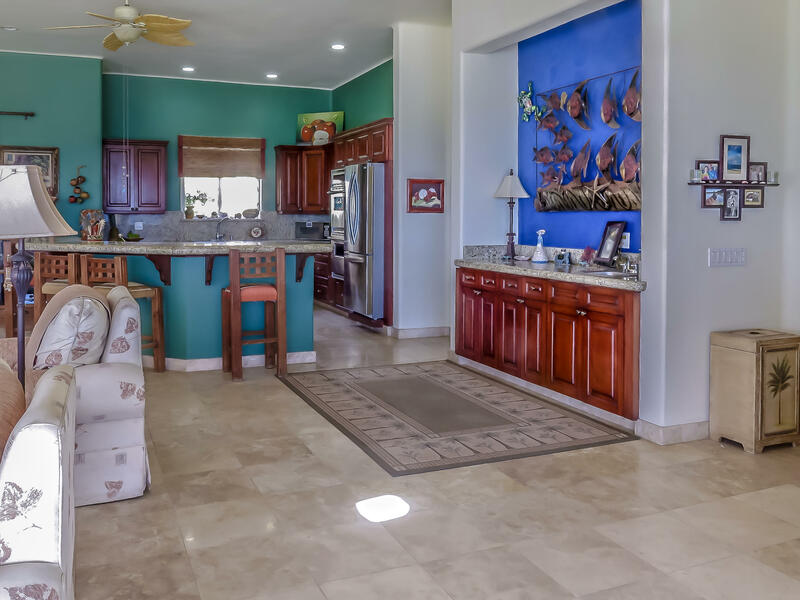 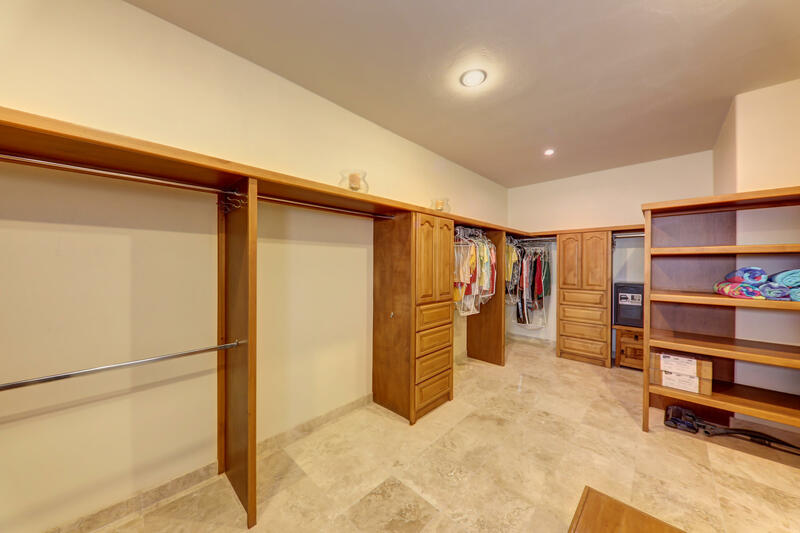 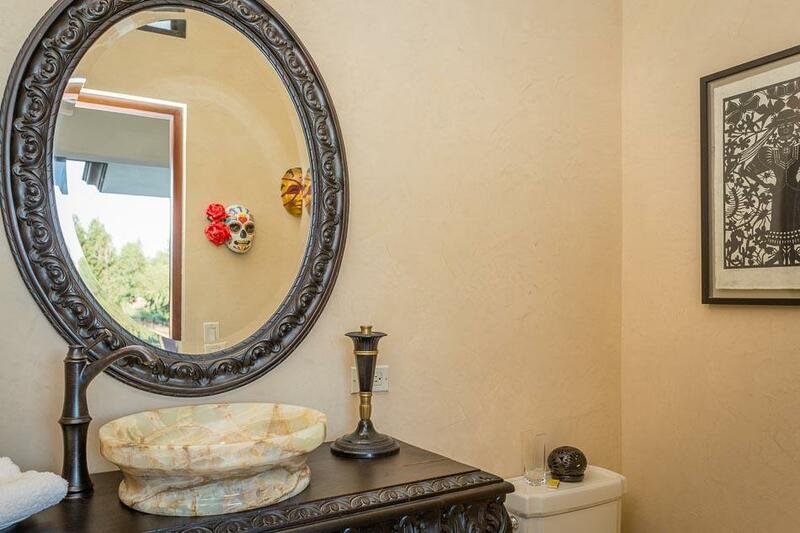 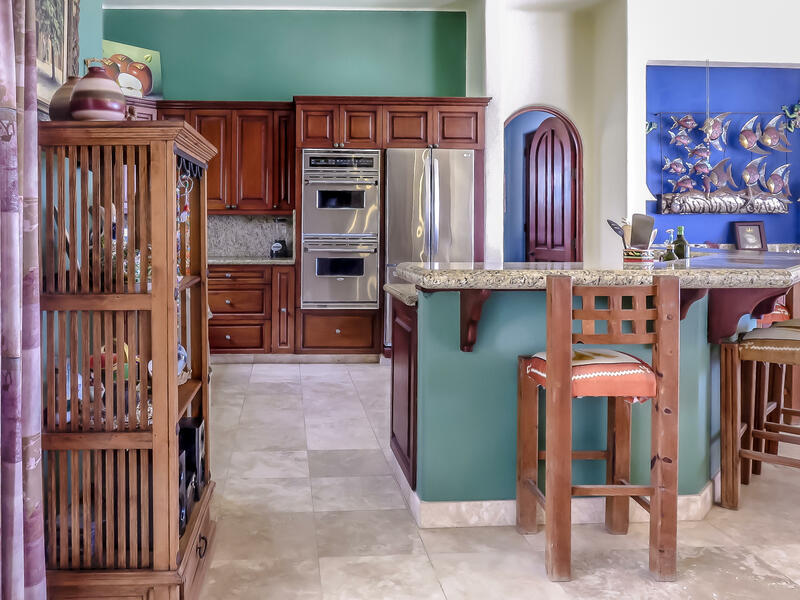 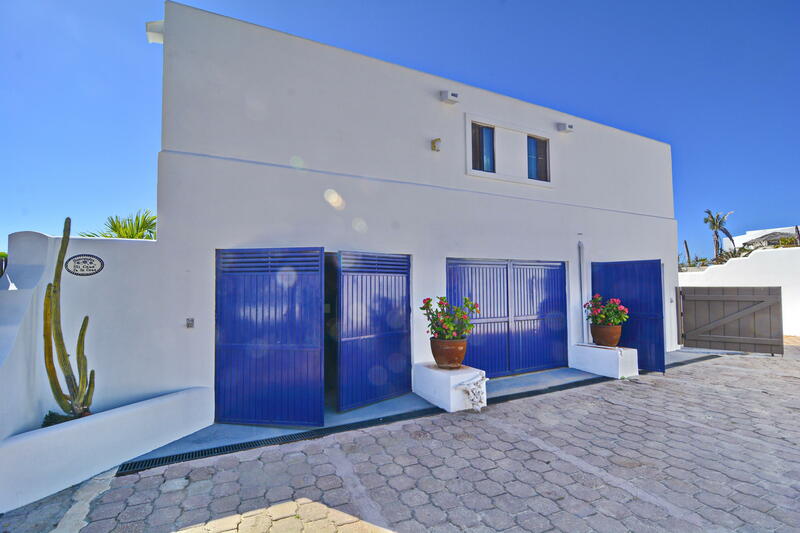 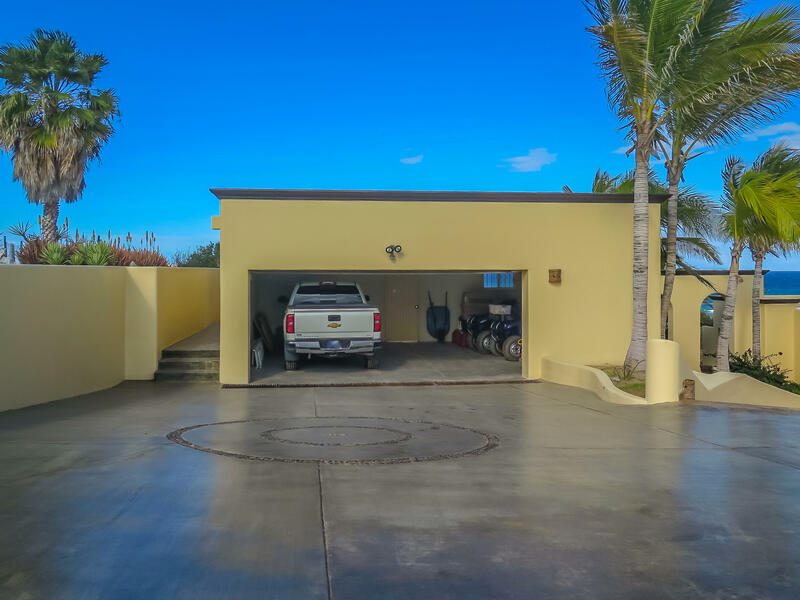 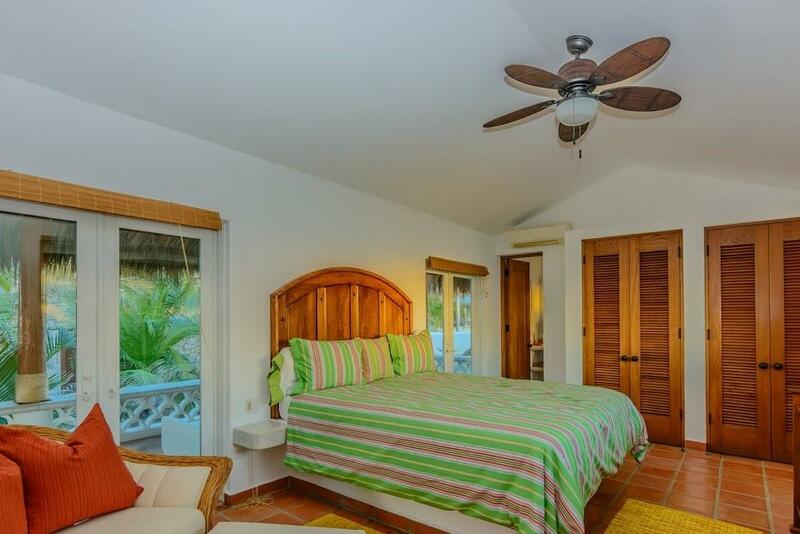 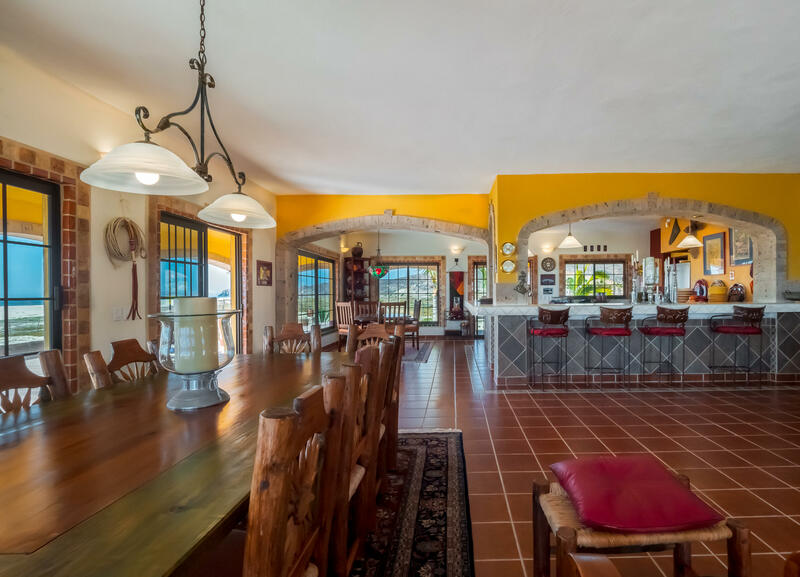 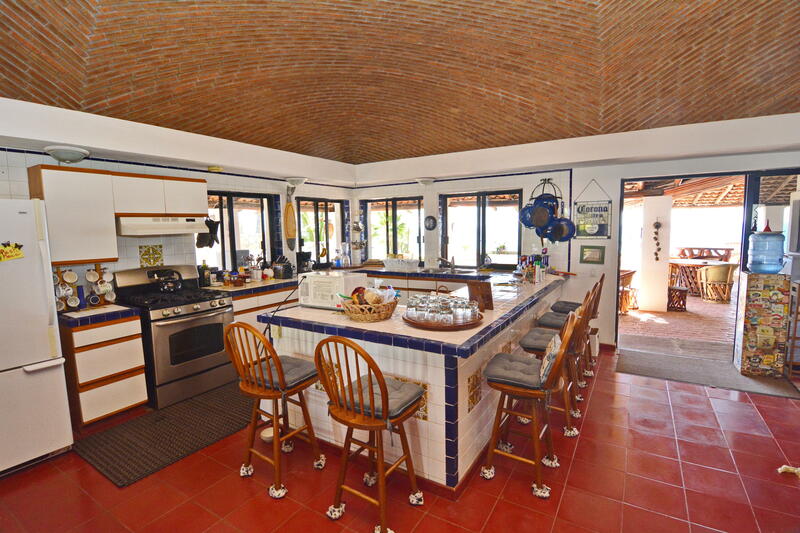 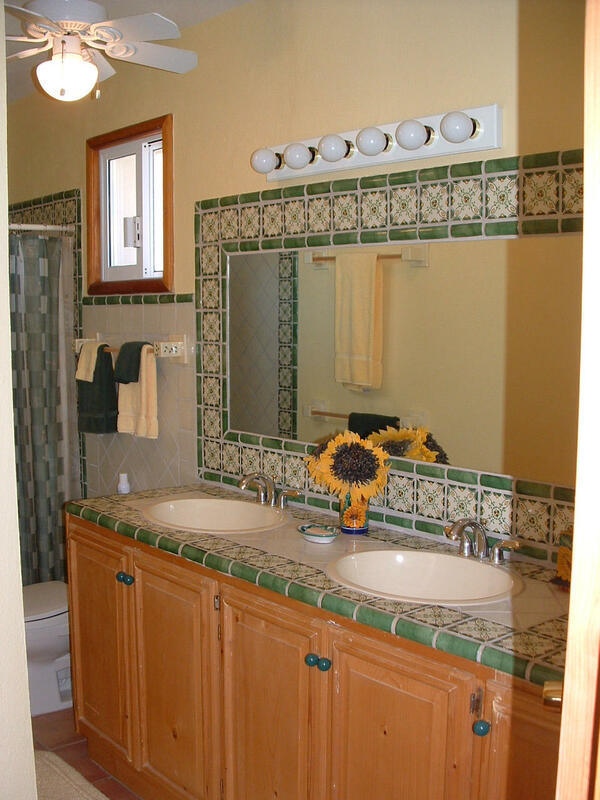 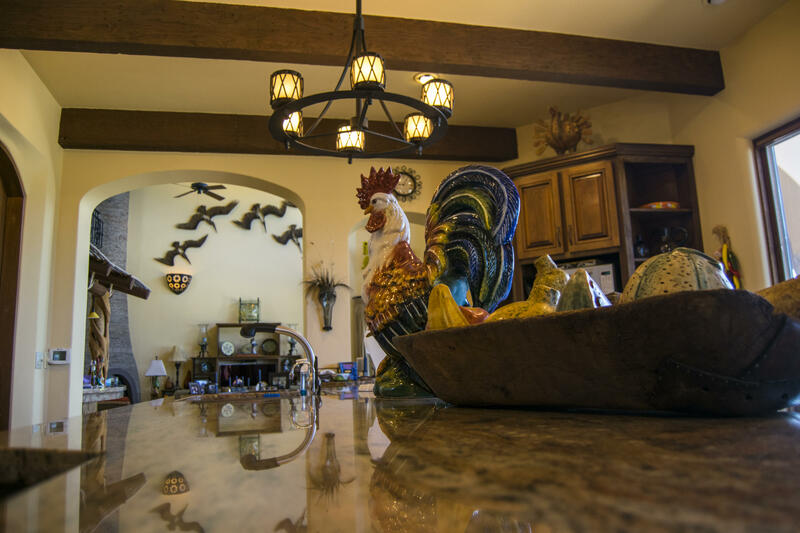 This home has four bedrooms, three of which are self-contained casitas with kitchenettes, one with full kitchen. 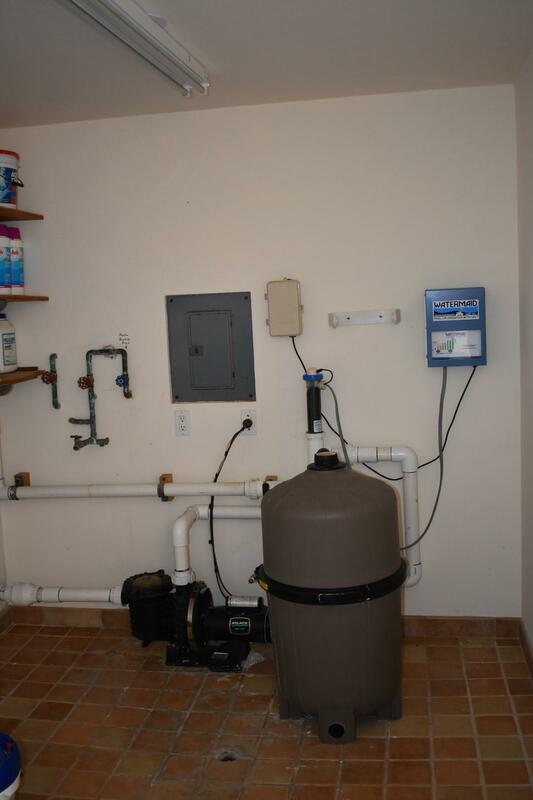 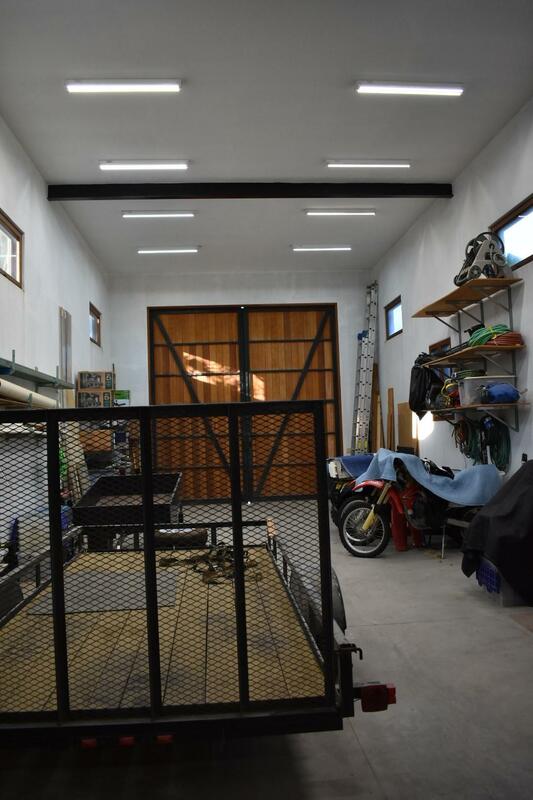 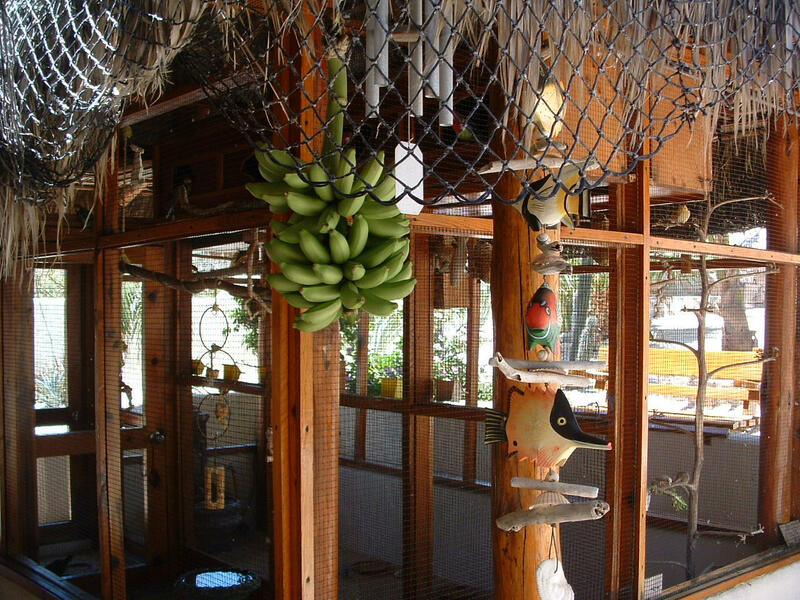 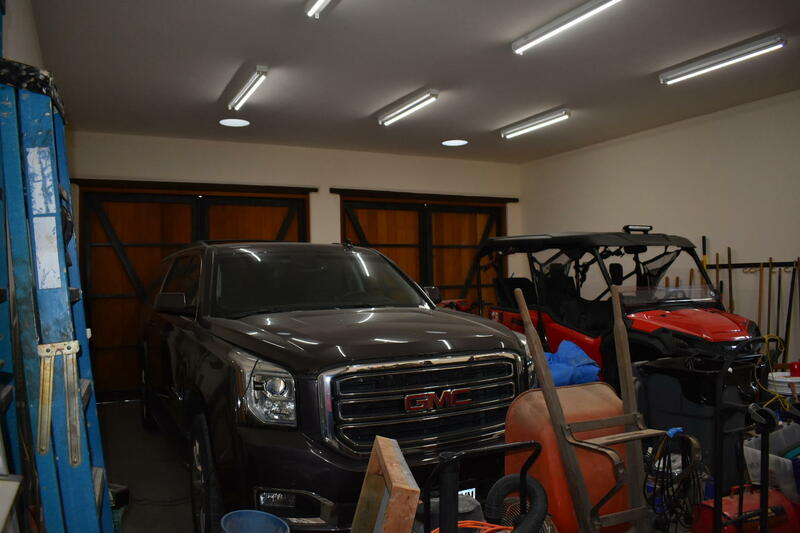 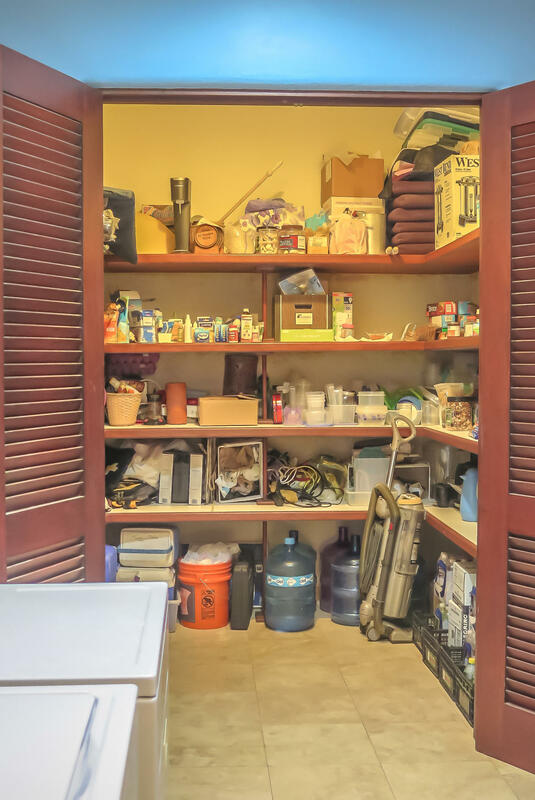 The two car garage has plenty of space for your ocean toys. 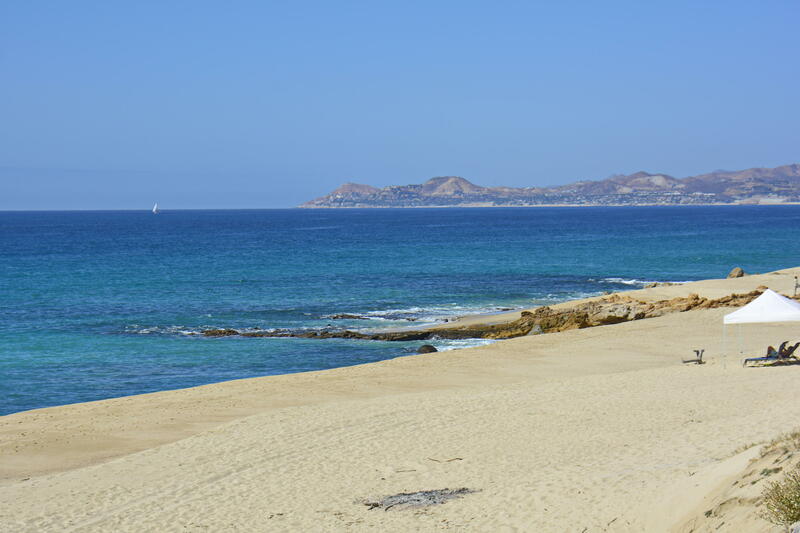 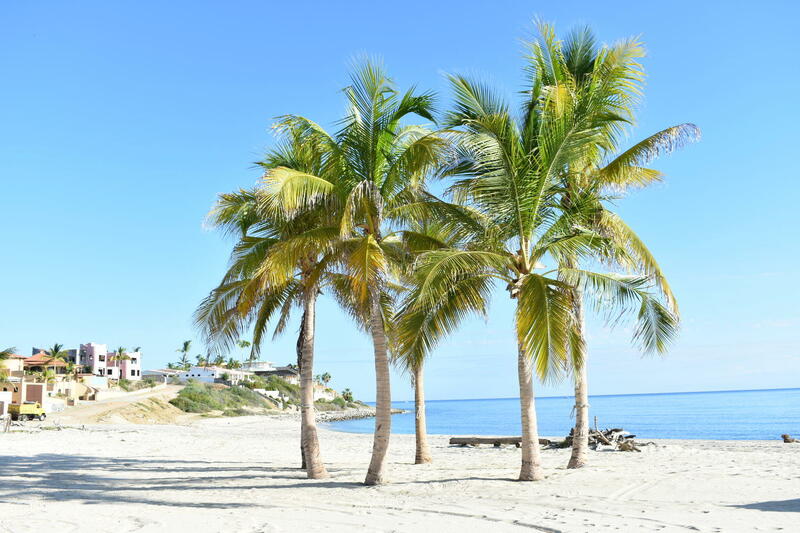 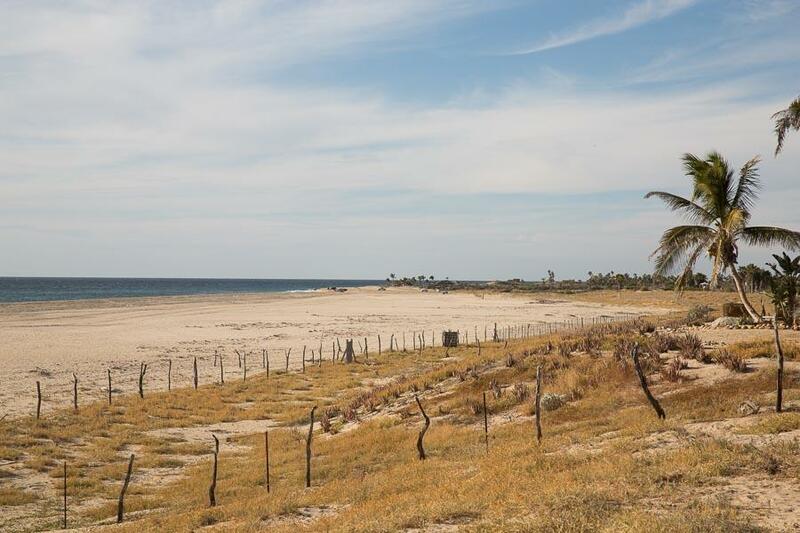 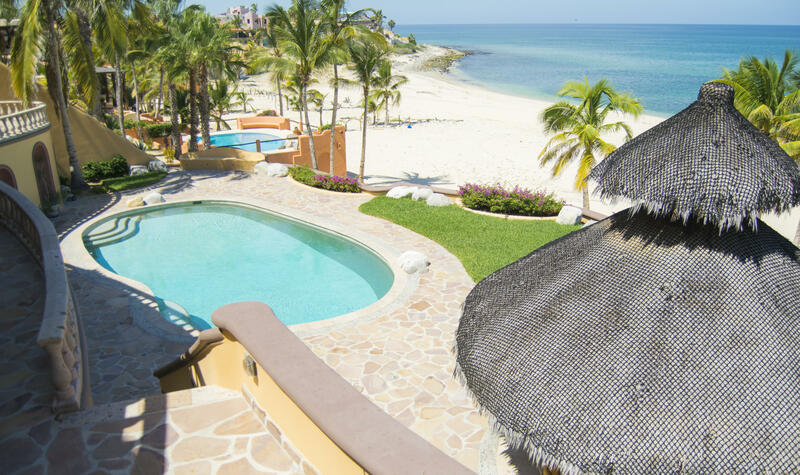 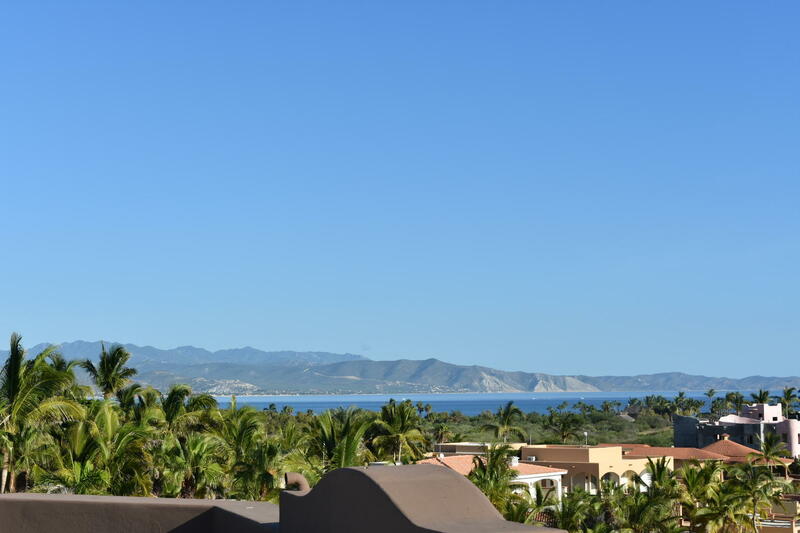 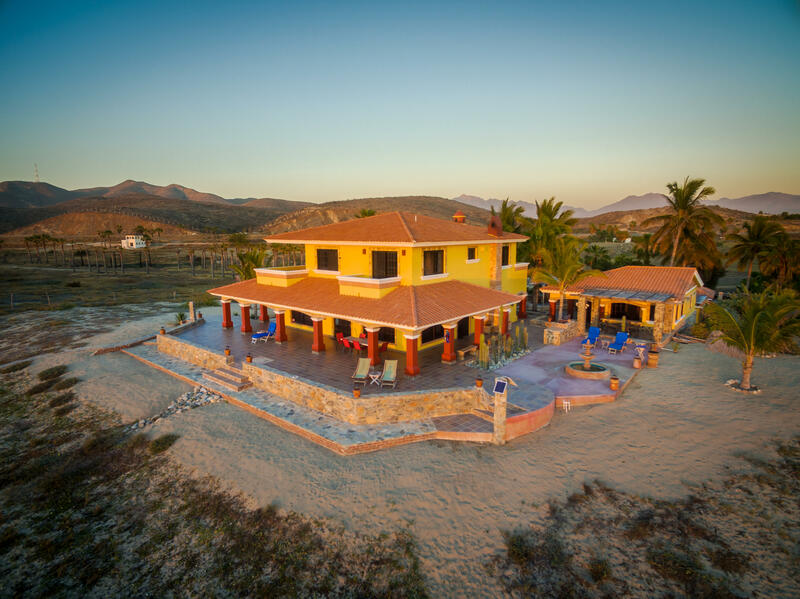 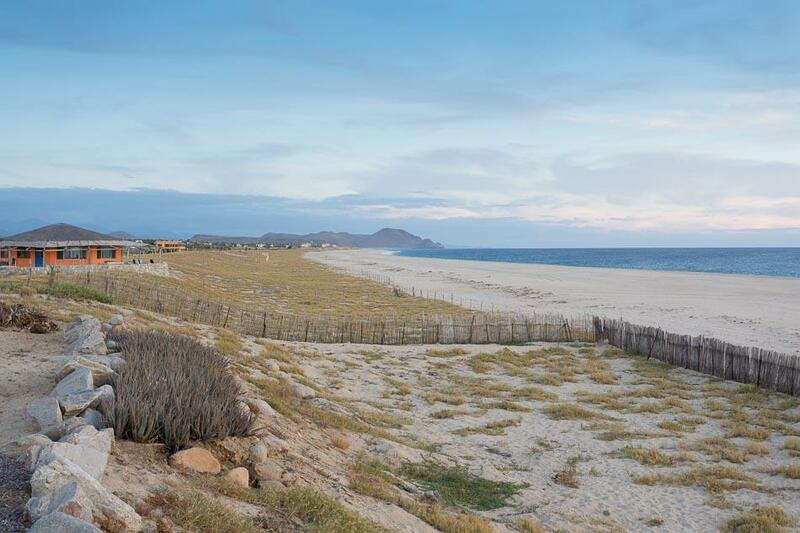 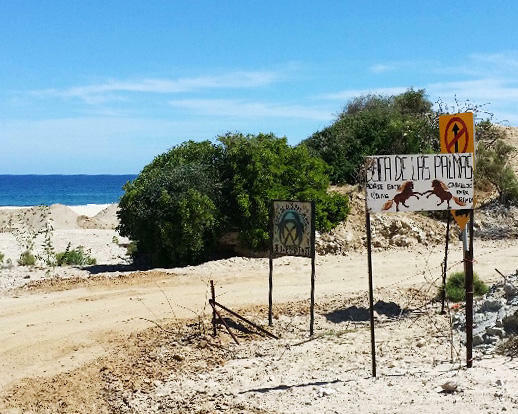 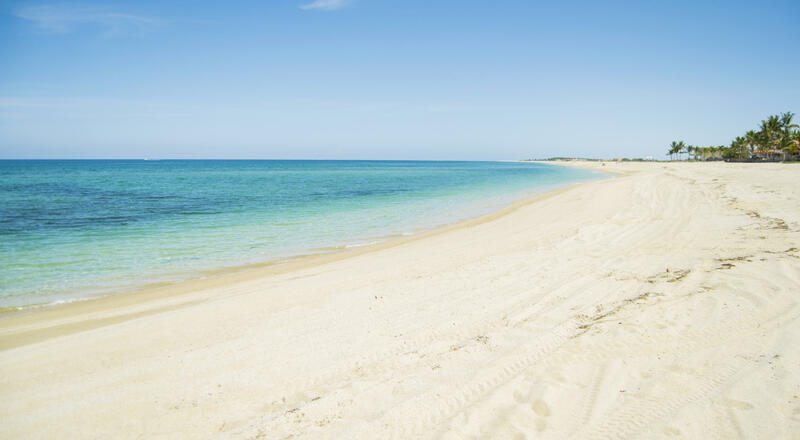 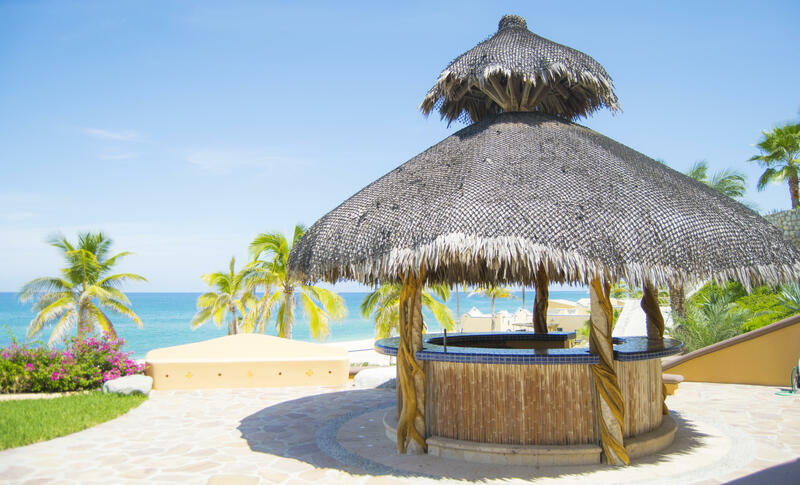 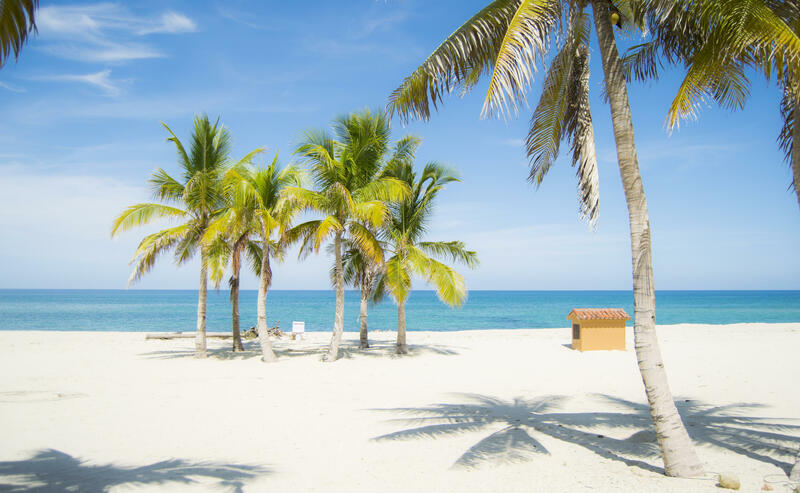 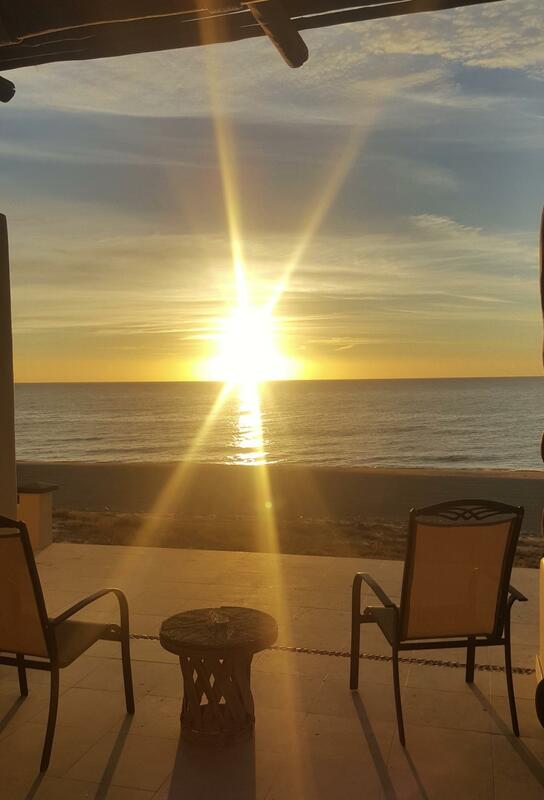 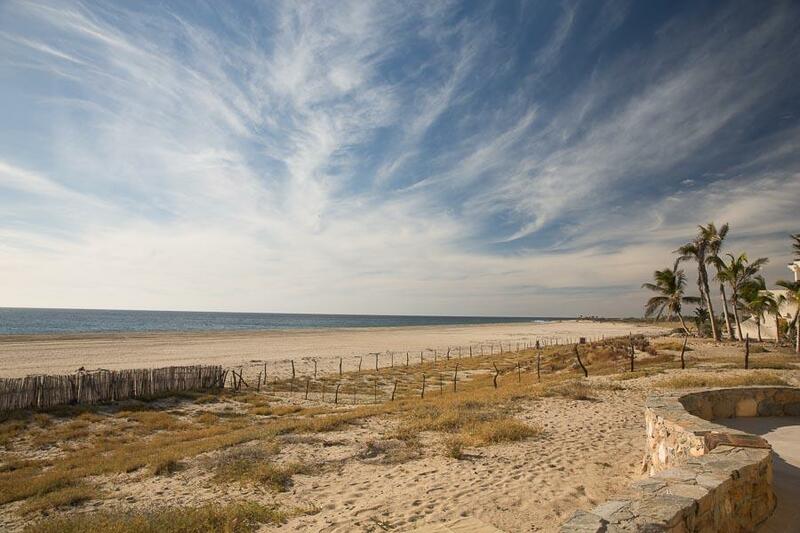 A 15 minute drive from Cabo Pulmo National Marine Park and all that it has to offer and just 30 minutes to the new Costa Palmas resort. 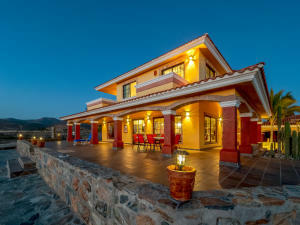 Description: Special and Unique are the best words to describe this magical property. 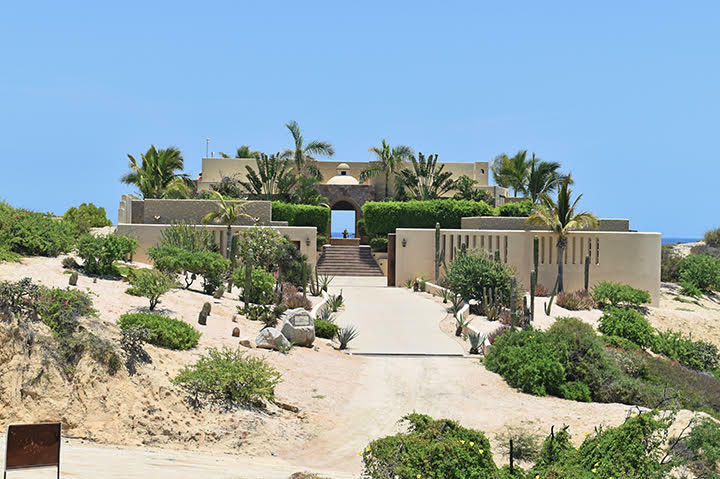 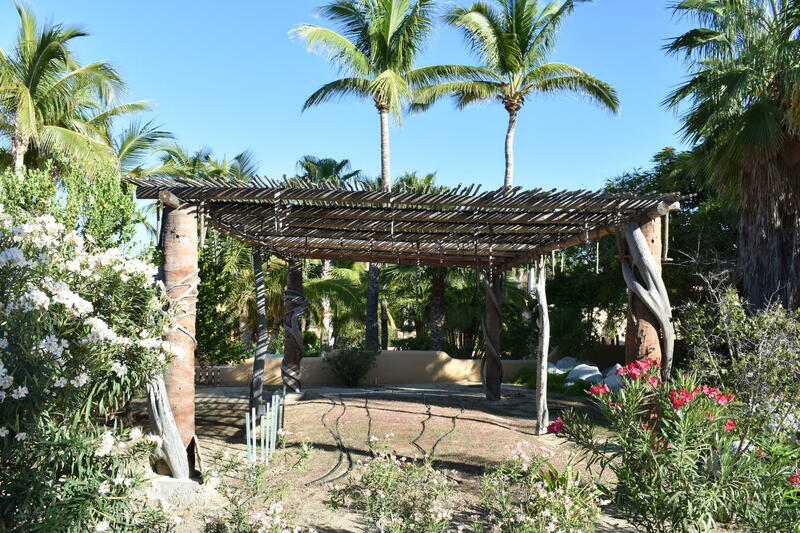 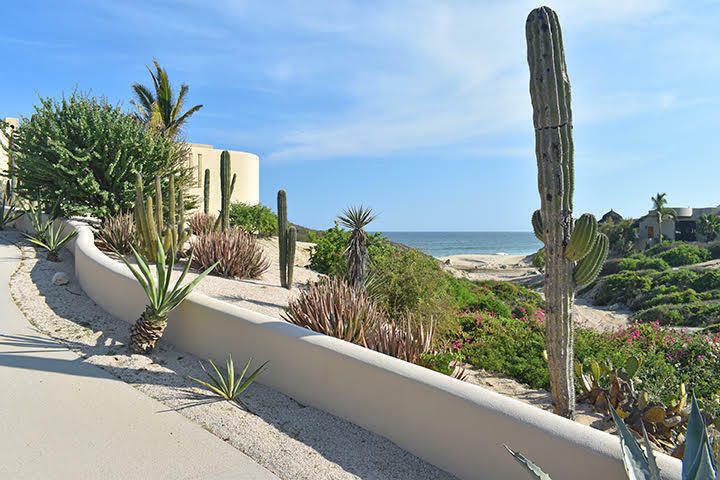 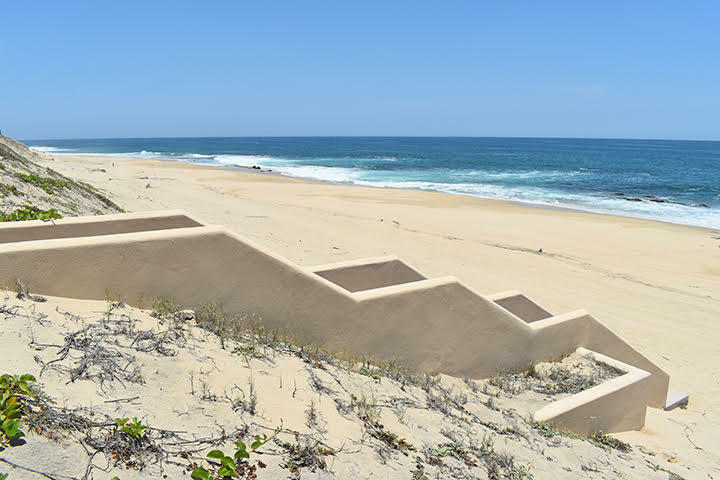 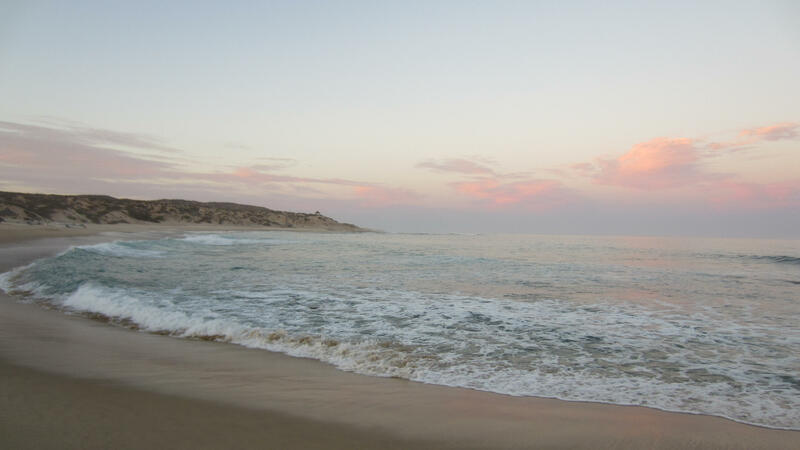 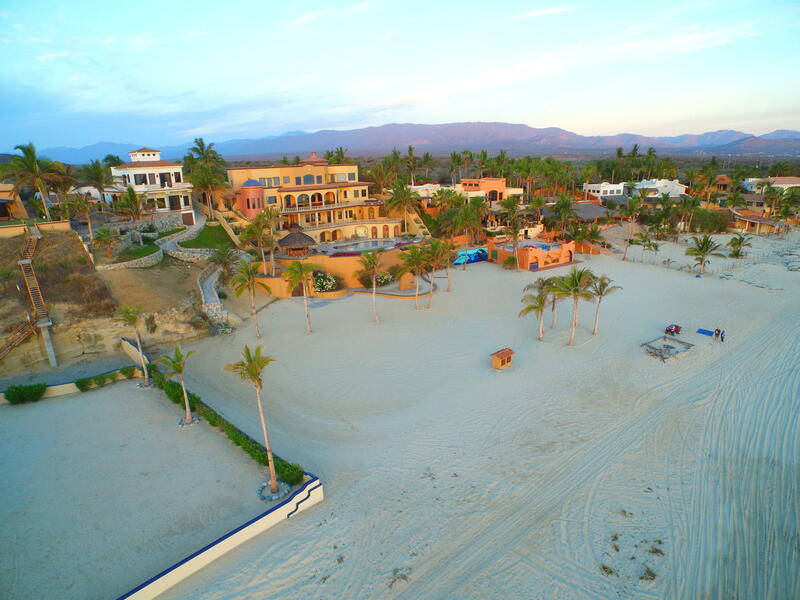 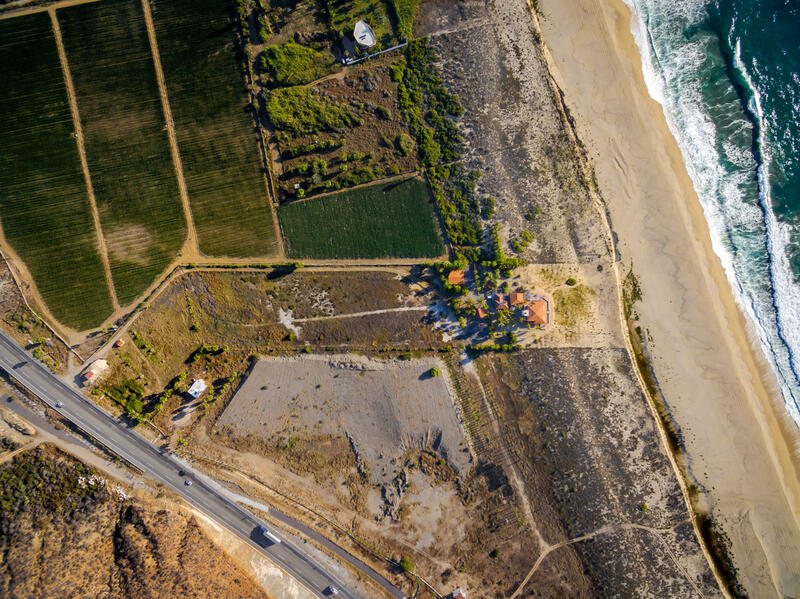 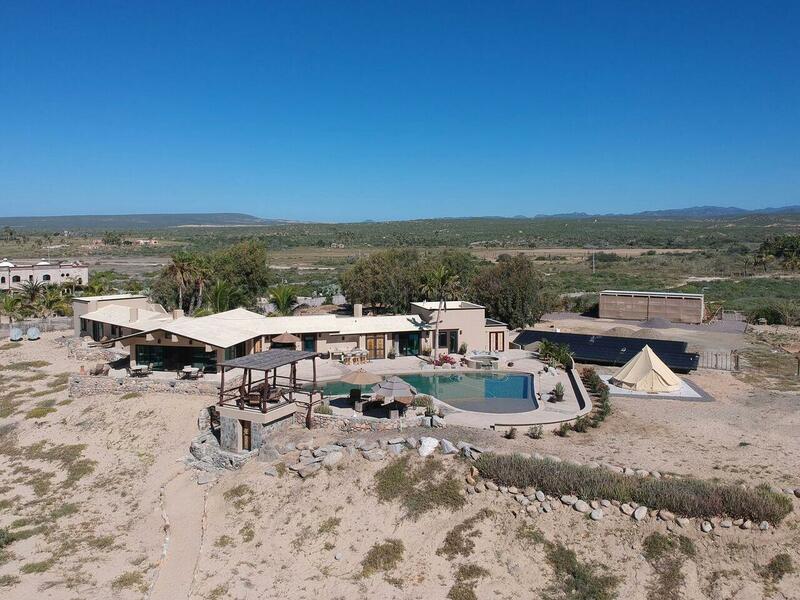 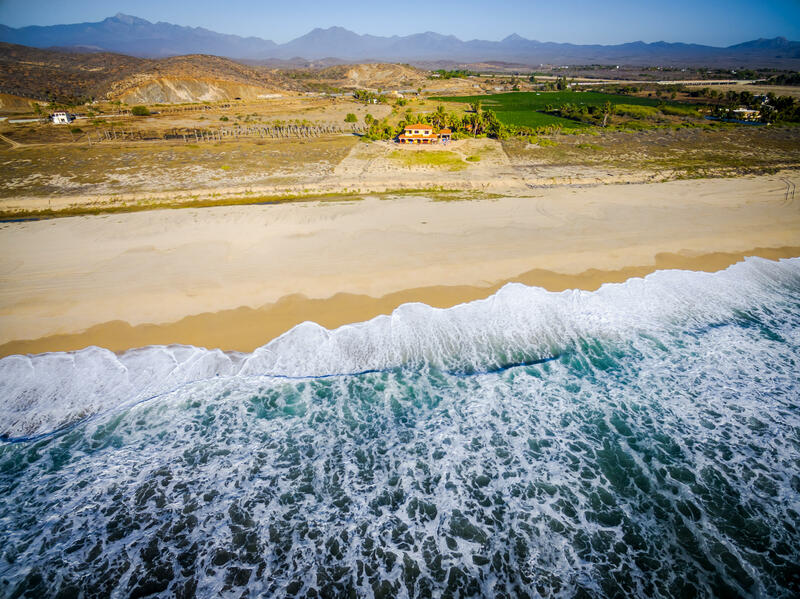 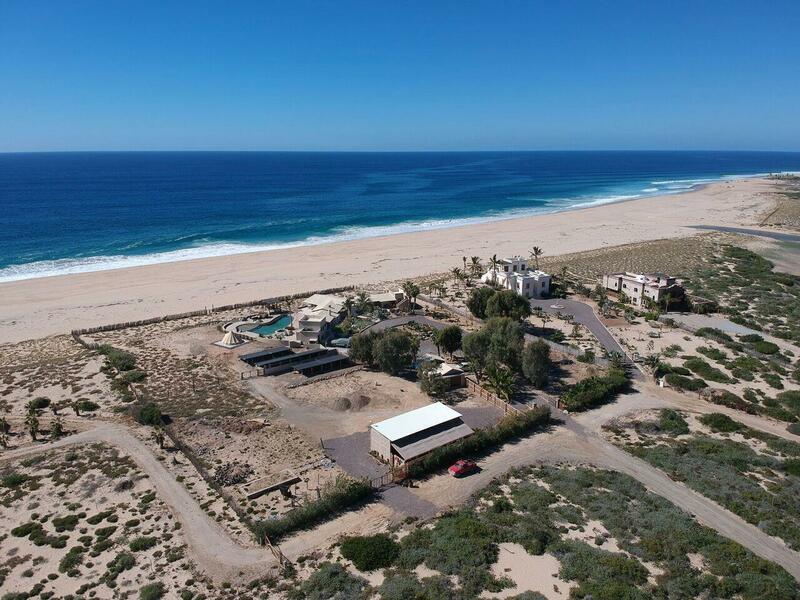 It is unlike anything in southern Baja, and is 100% self sustainable & centrally located between Cabo San Lucas and Todos Santos. 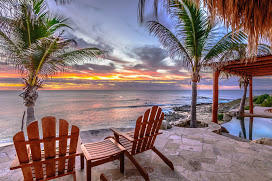 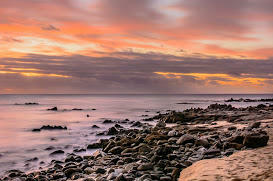 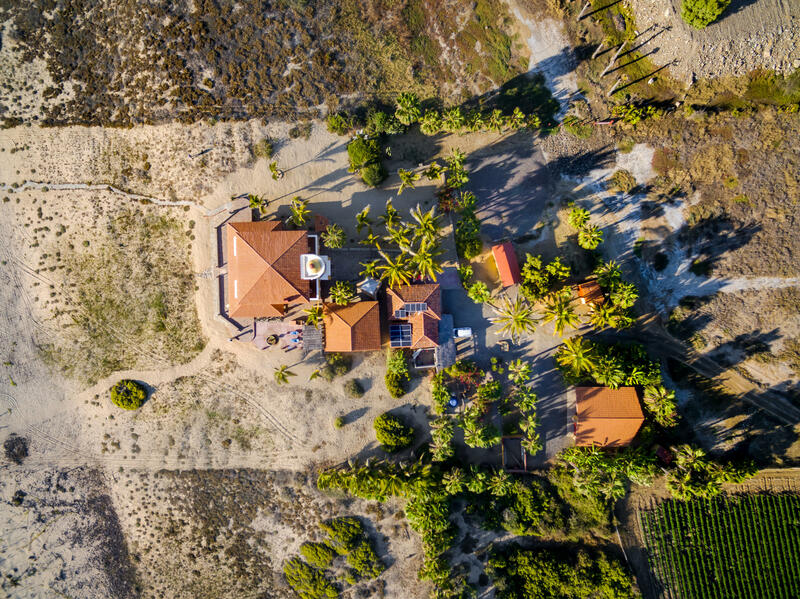 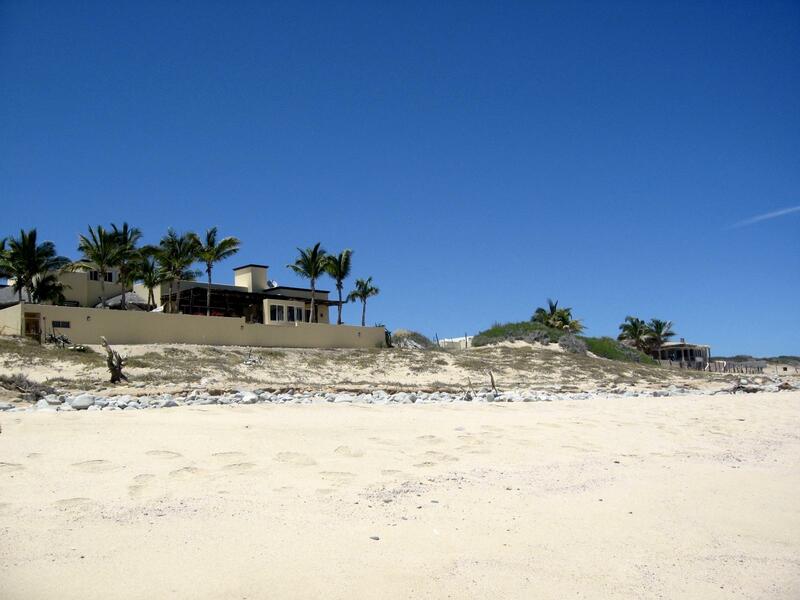 This multi structure estate sits on 7.4 acres which includes 75 meters of dramatic ocean frontage. 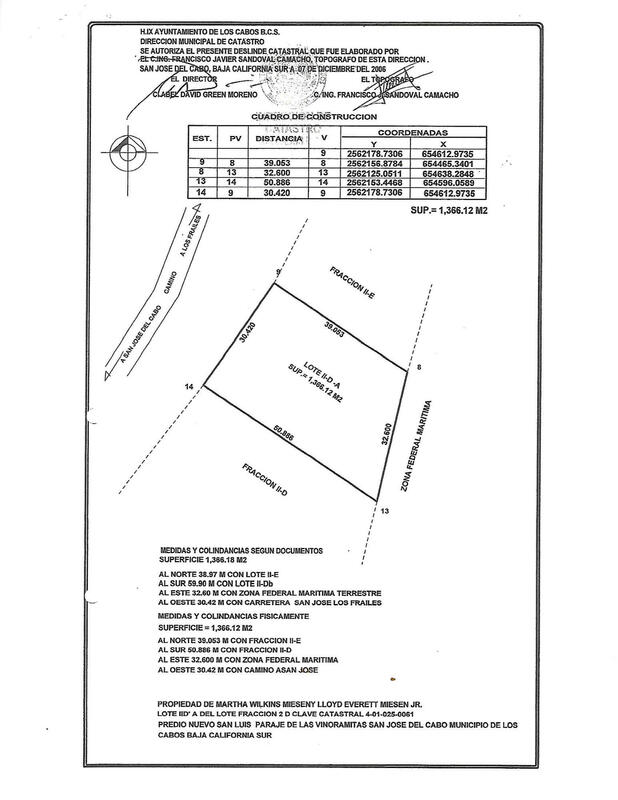 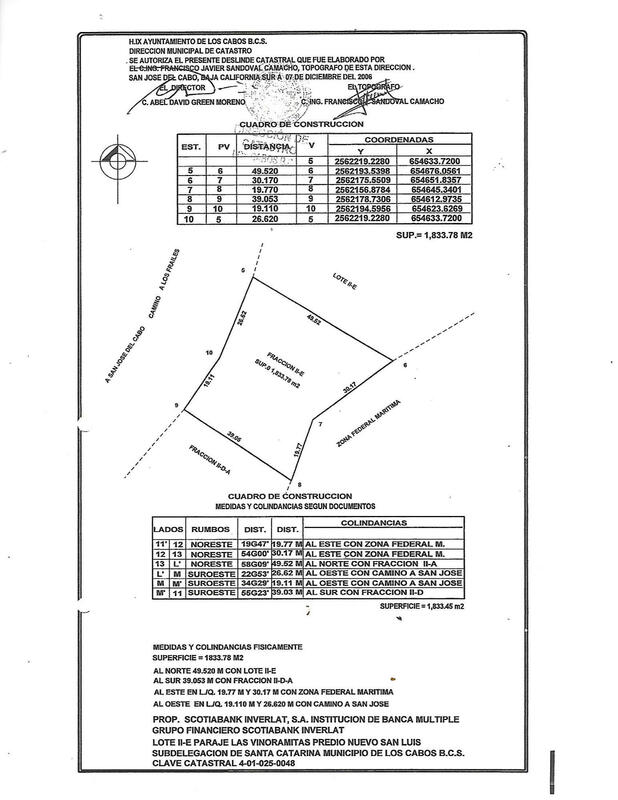 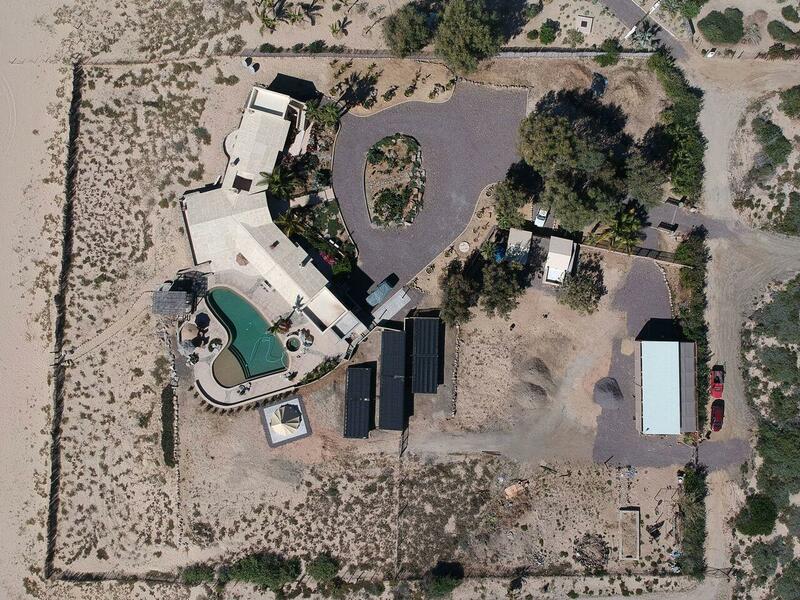 Opportunities abound for the ultimate use of this property. 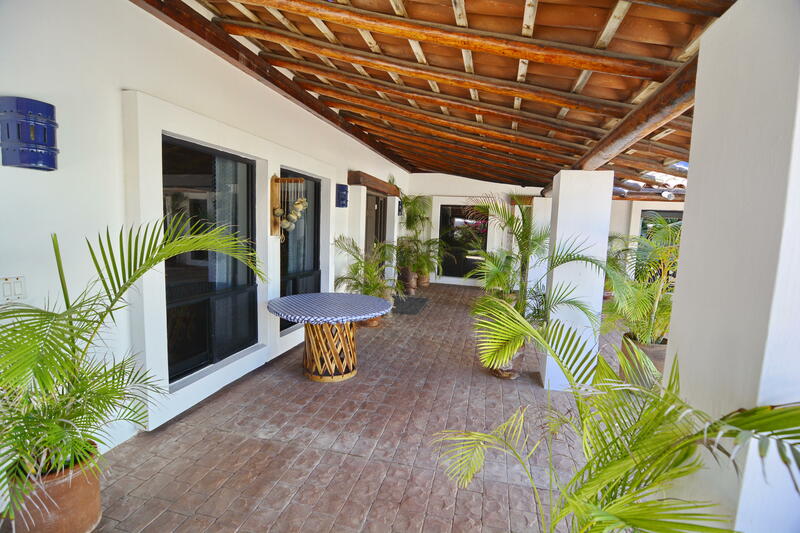 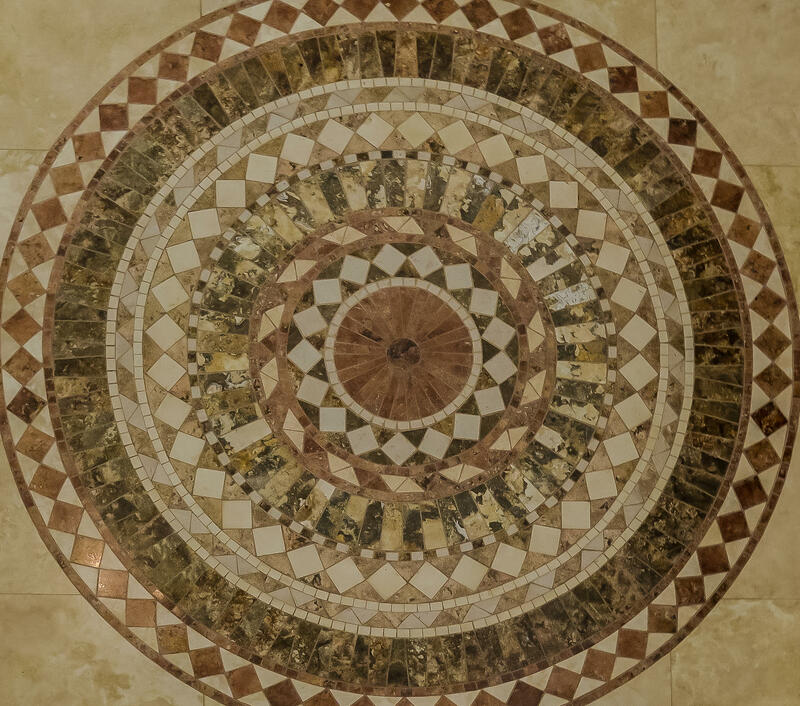 Whether it be as a Family Compound, a Boutique Hotel or a Bed & Breakfast, the physical location will stand ultimately as the best feature. 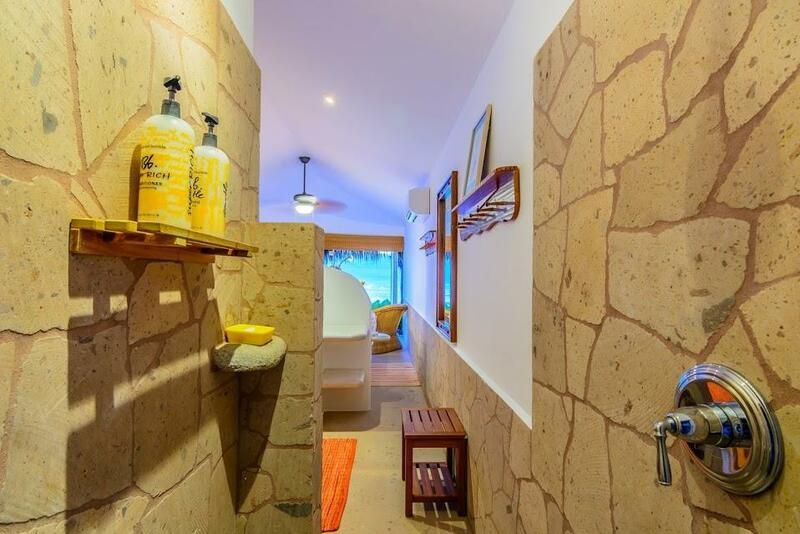 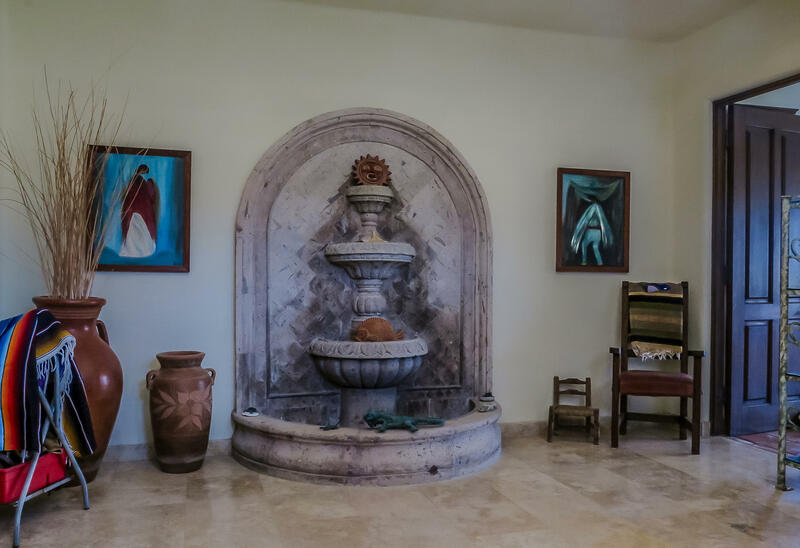 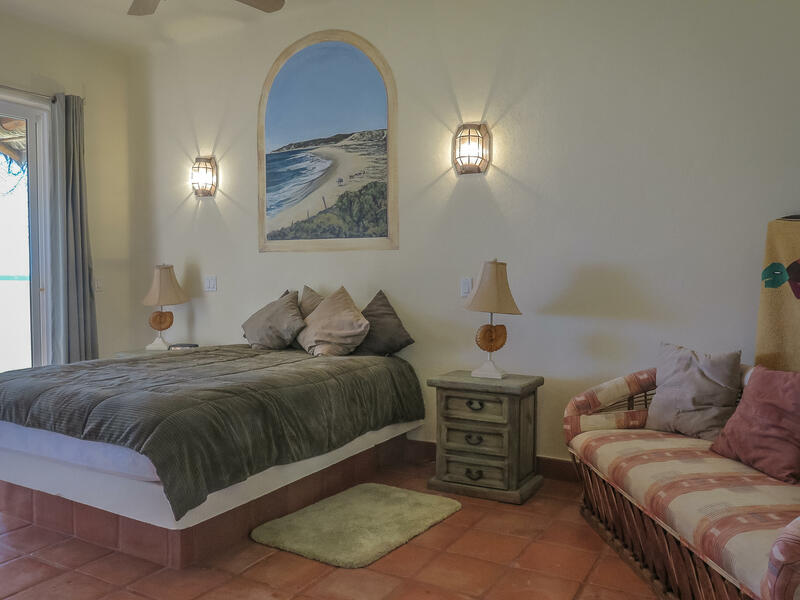 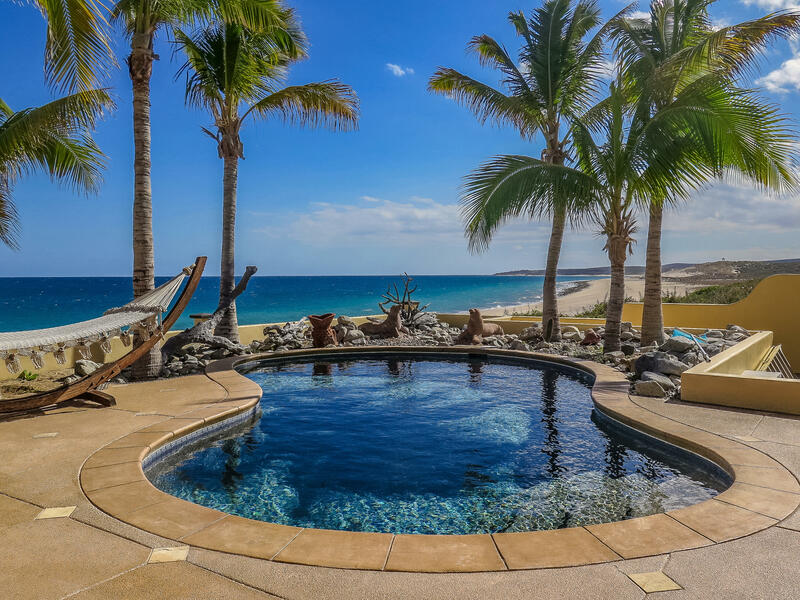 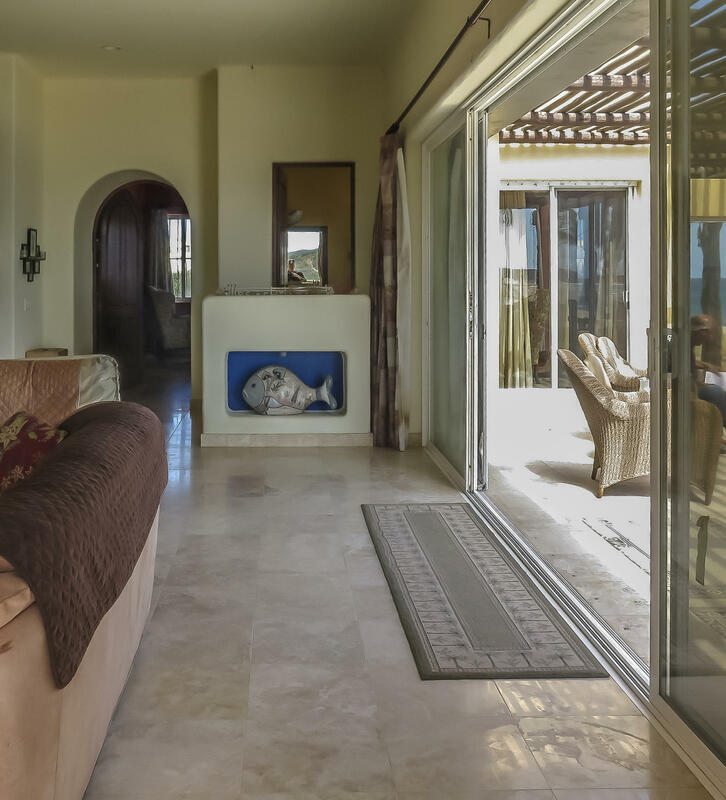 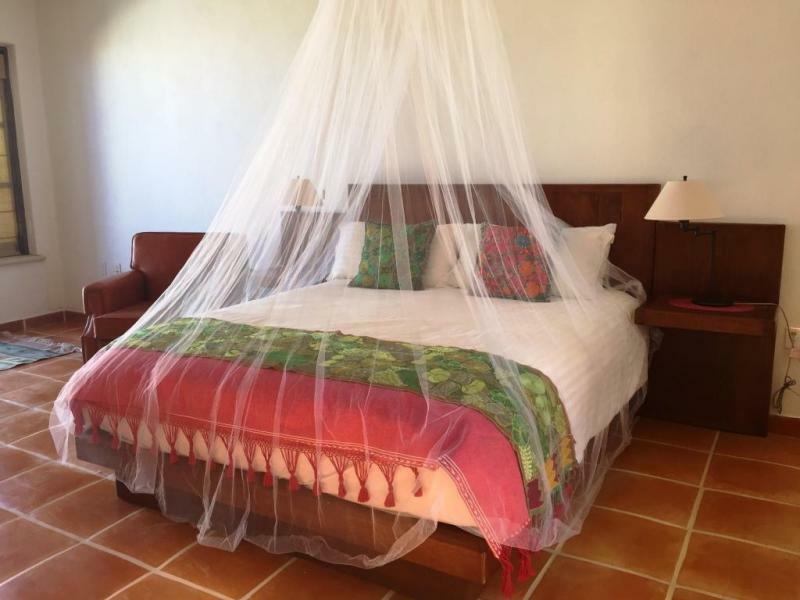 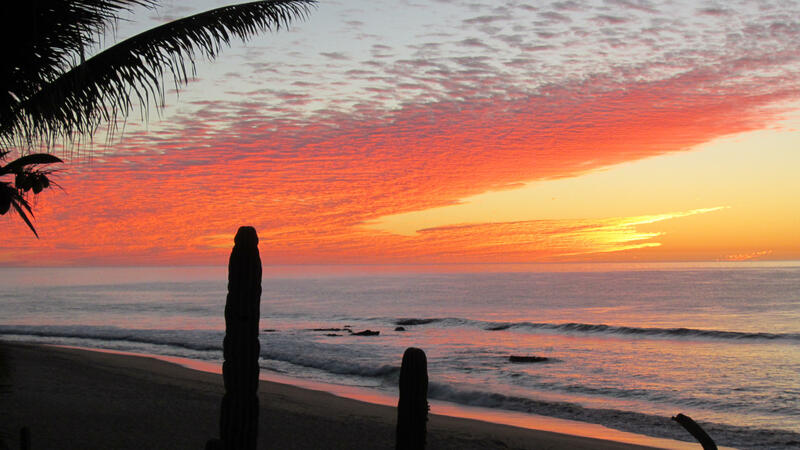 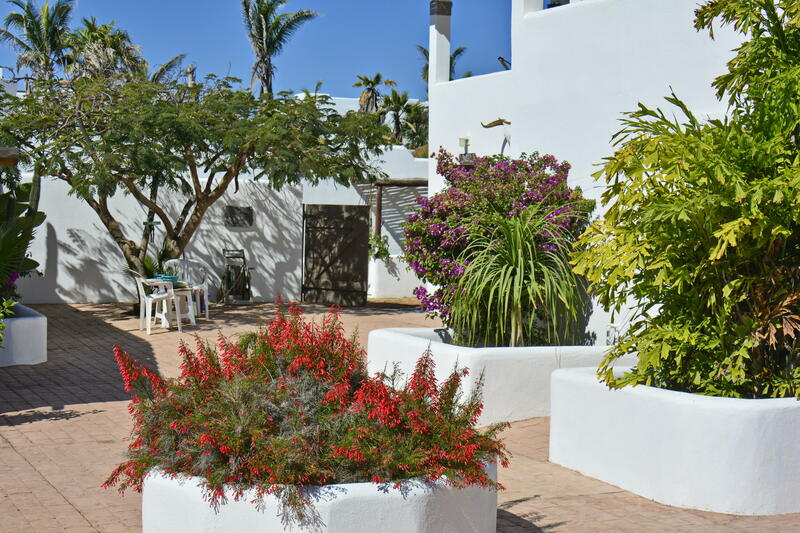 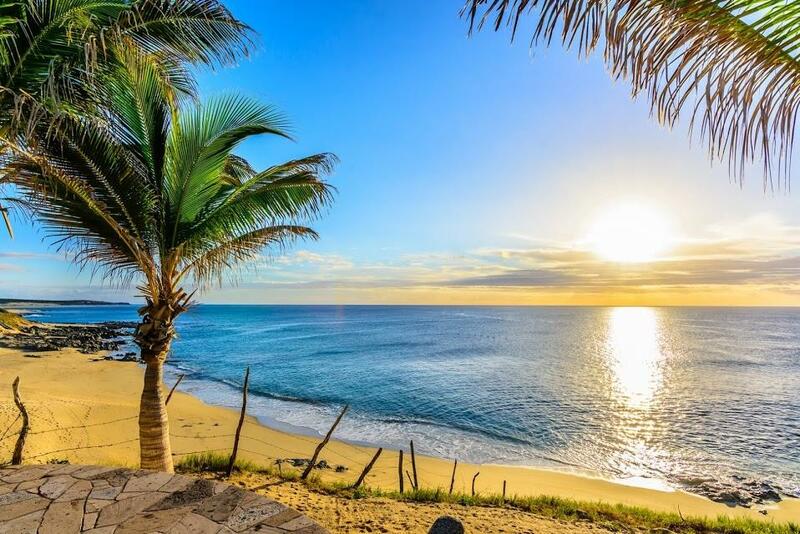 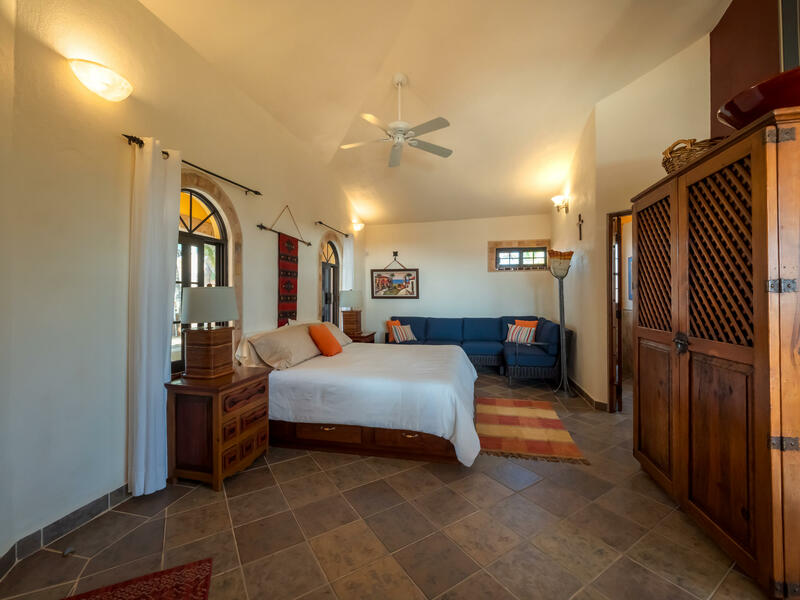 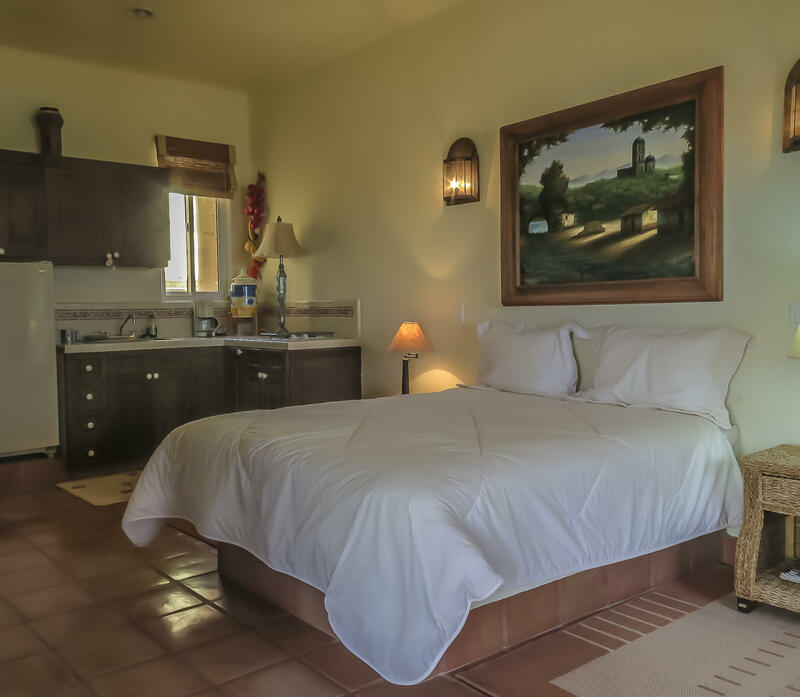 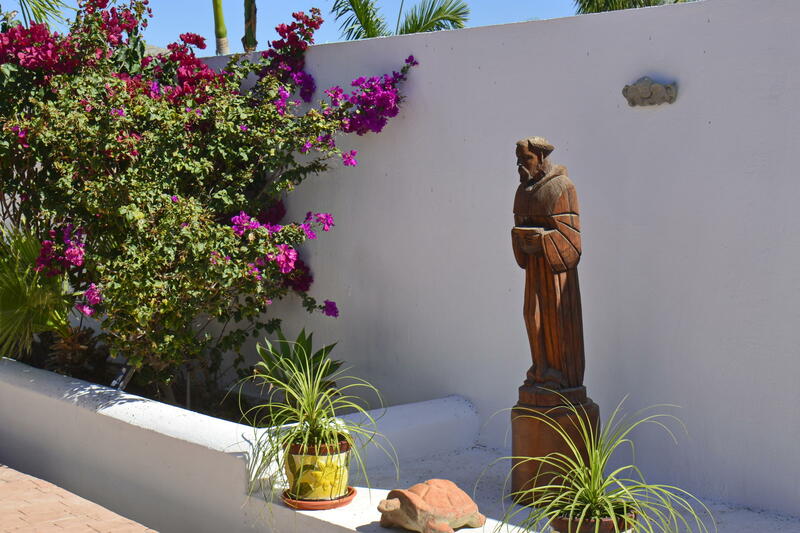 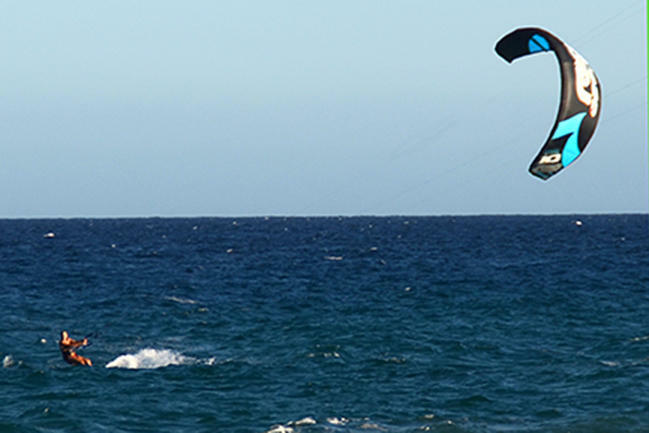 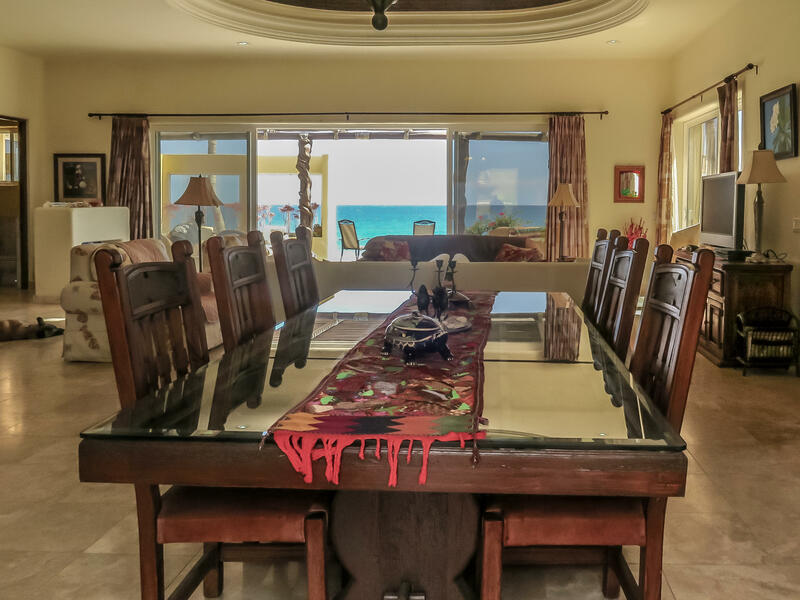 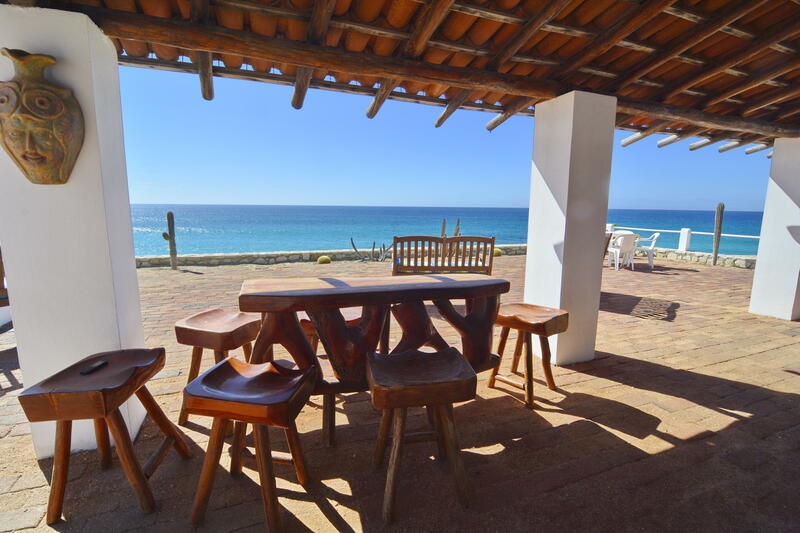 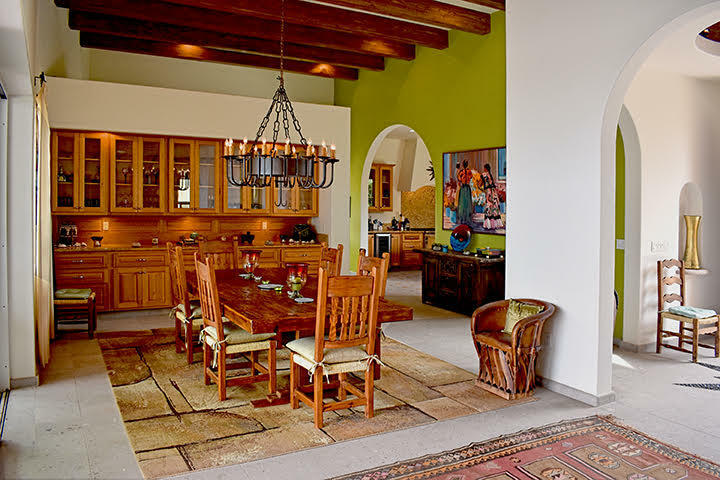 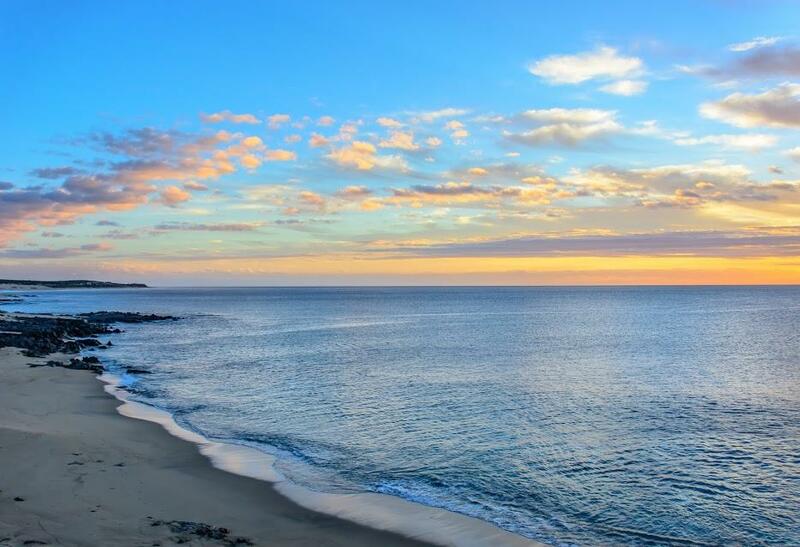 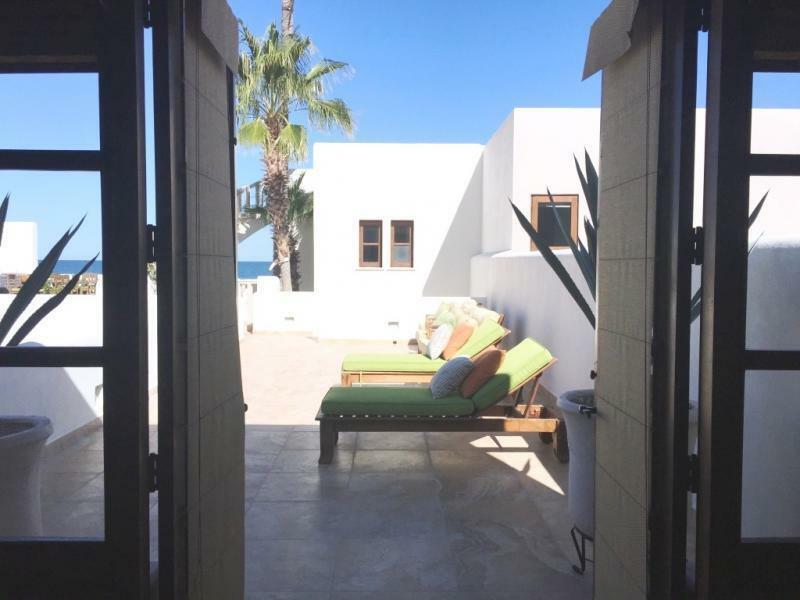 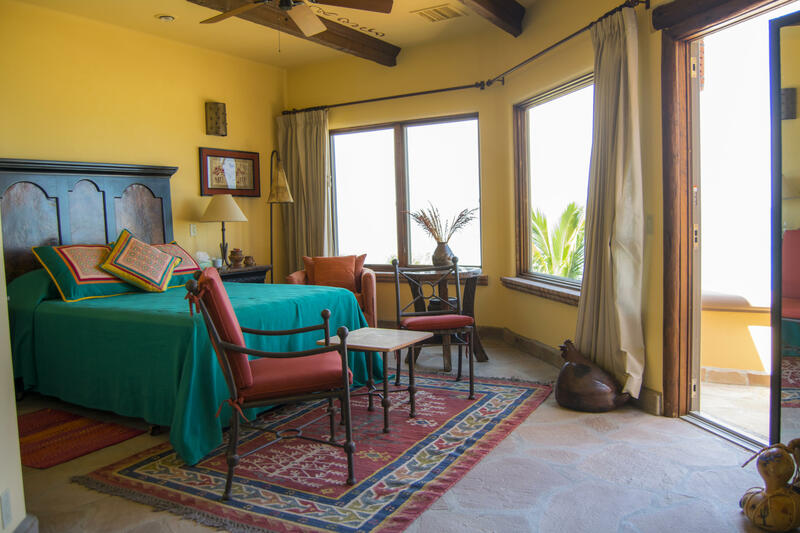 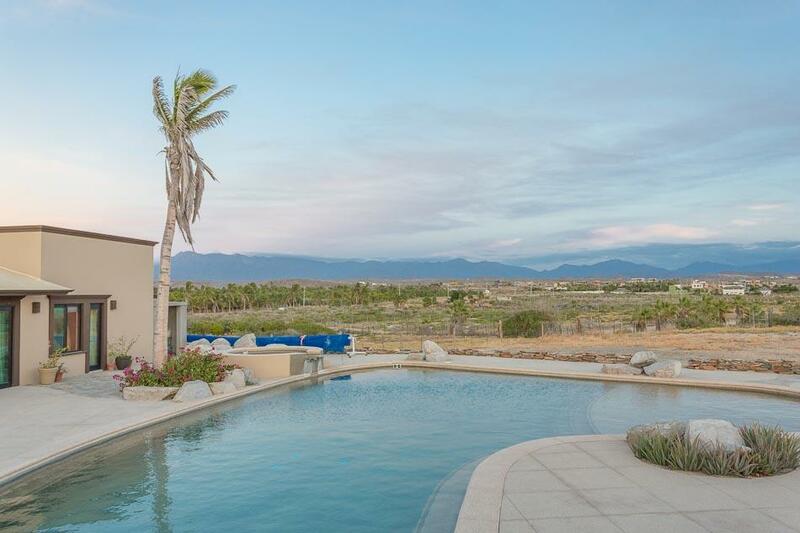 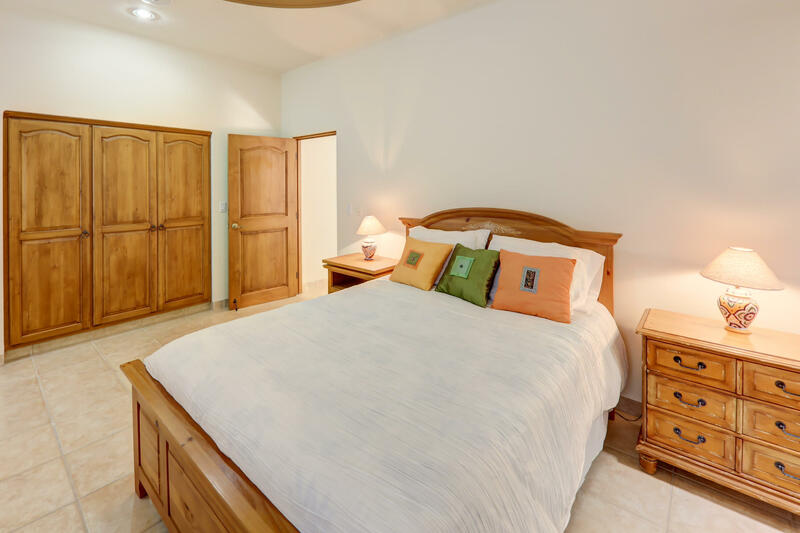 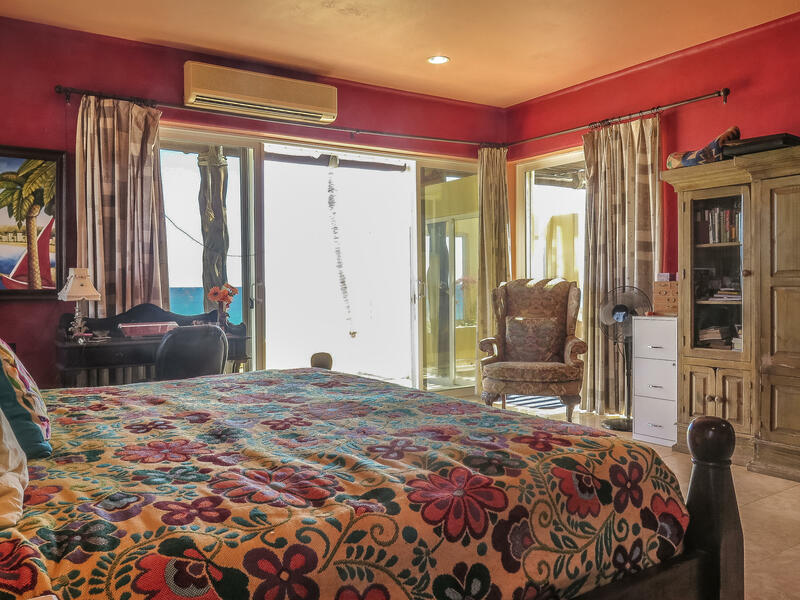 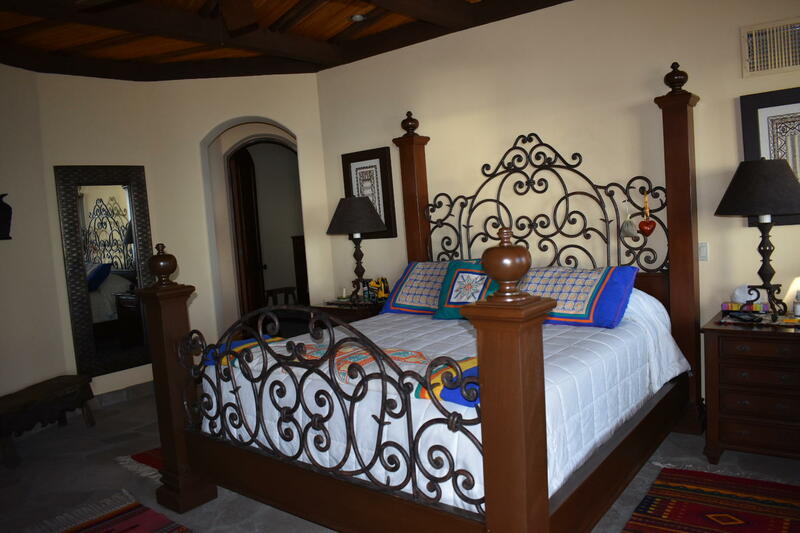 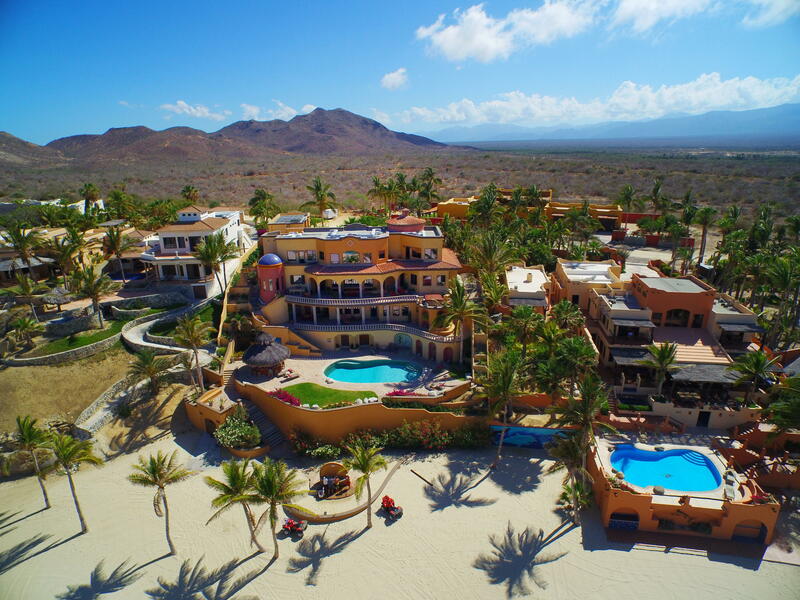 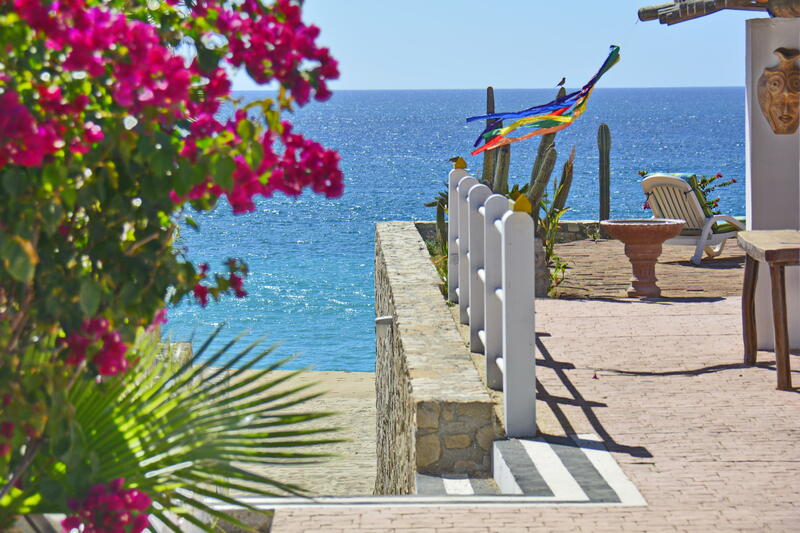 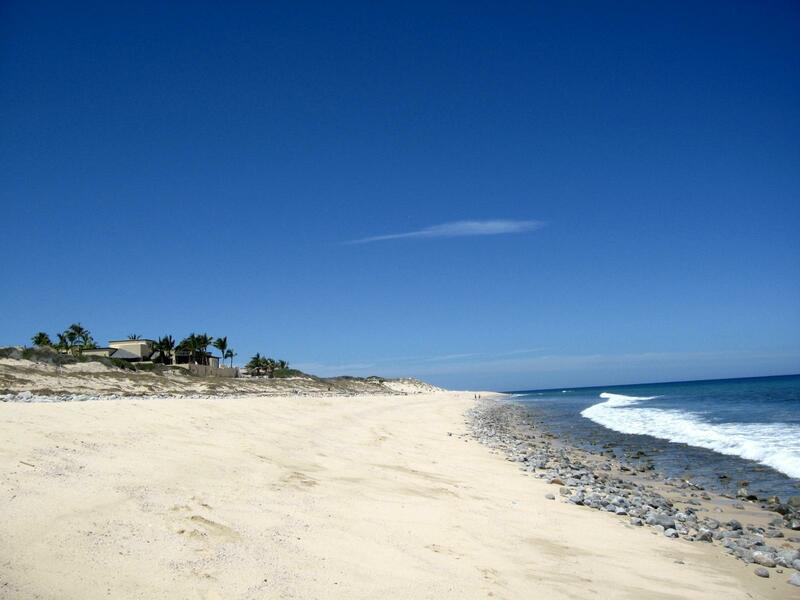 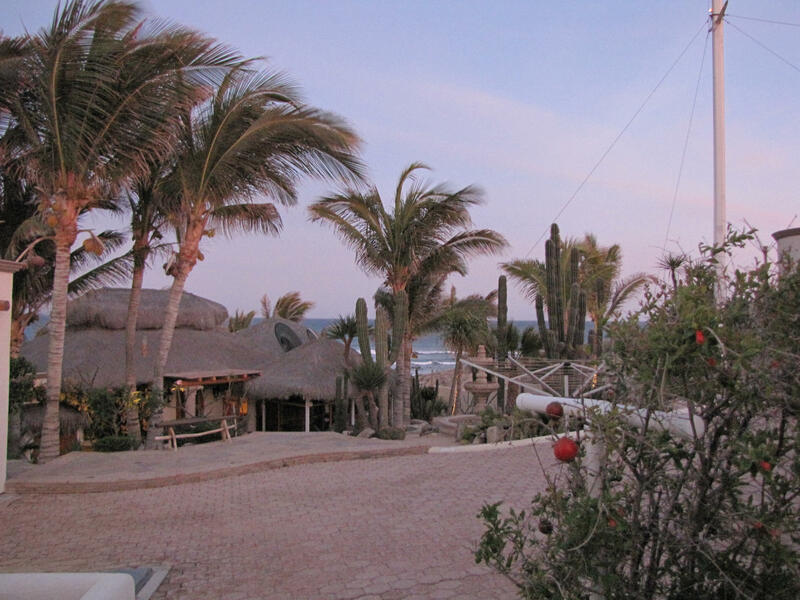 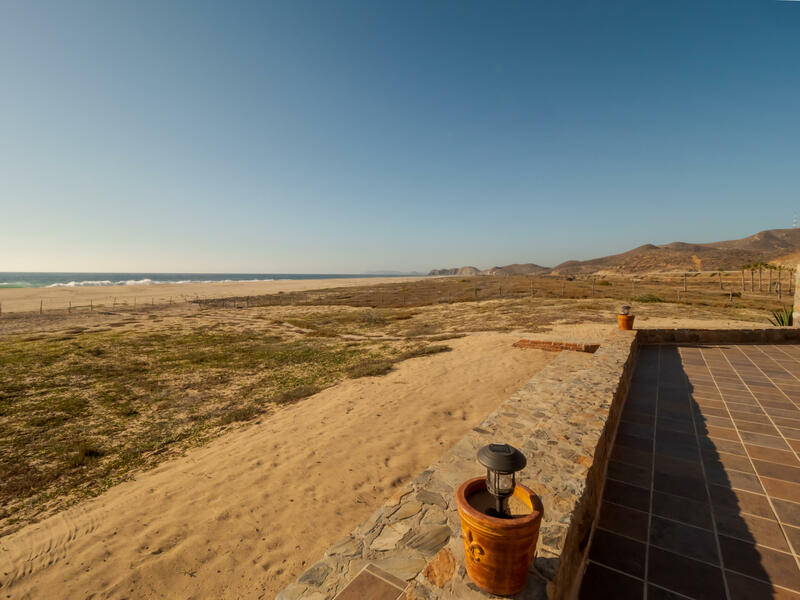 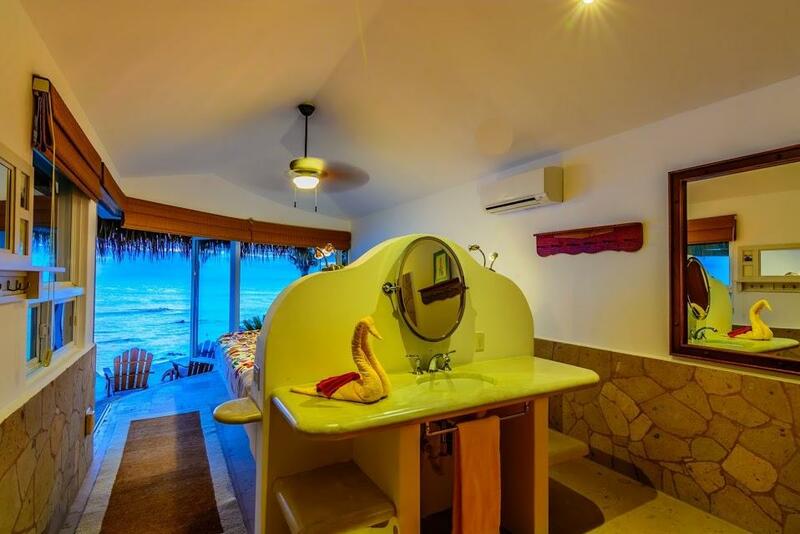 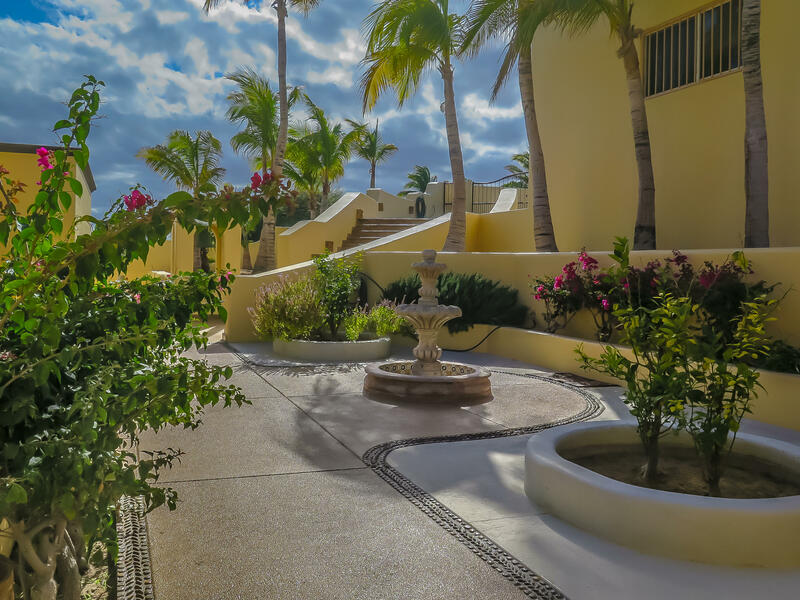 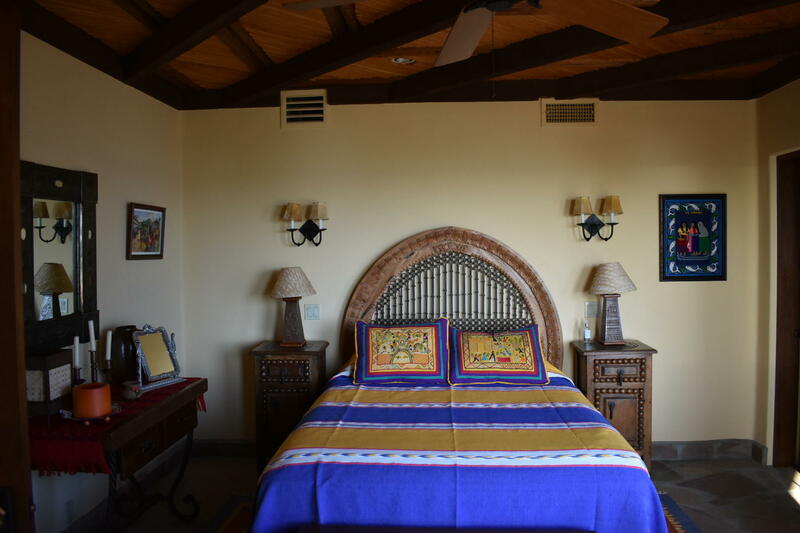 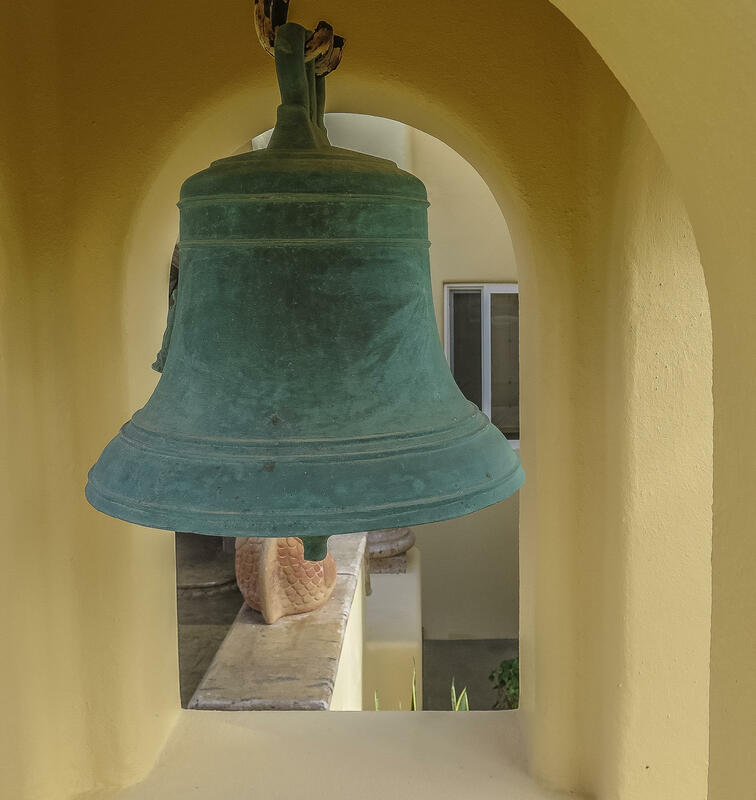 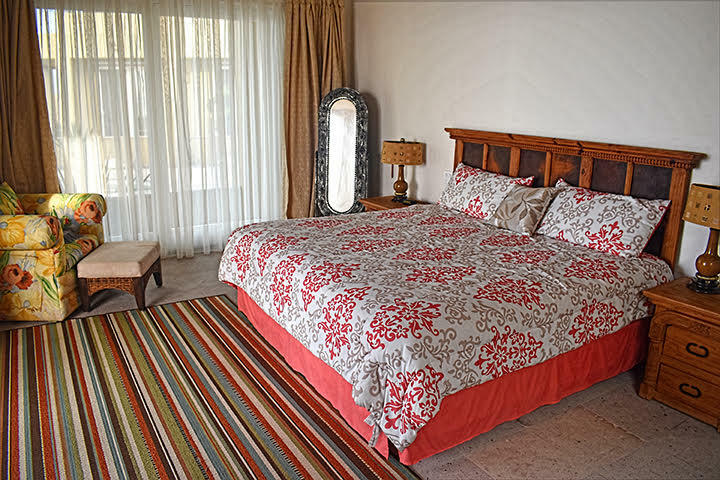 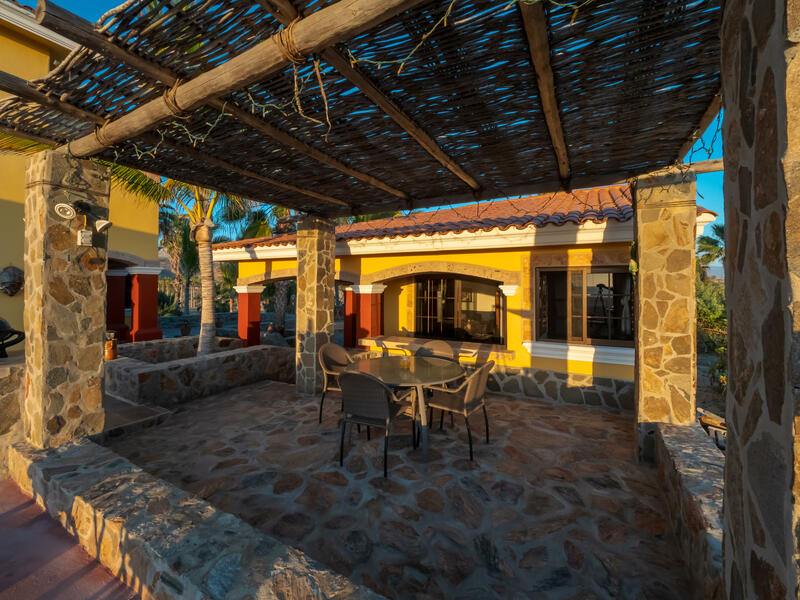 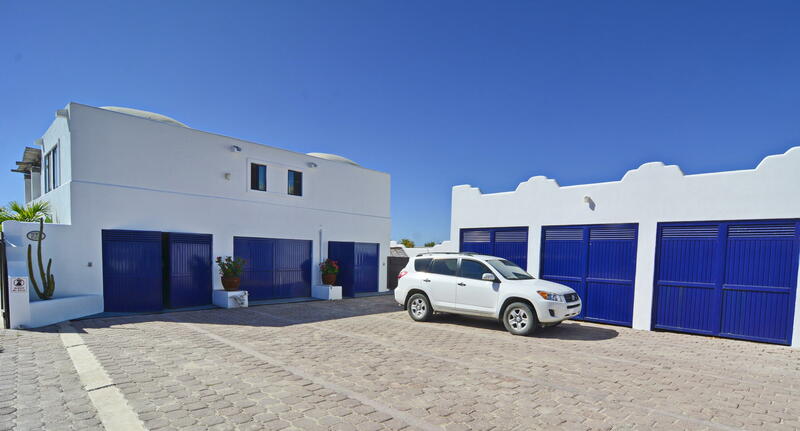 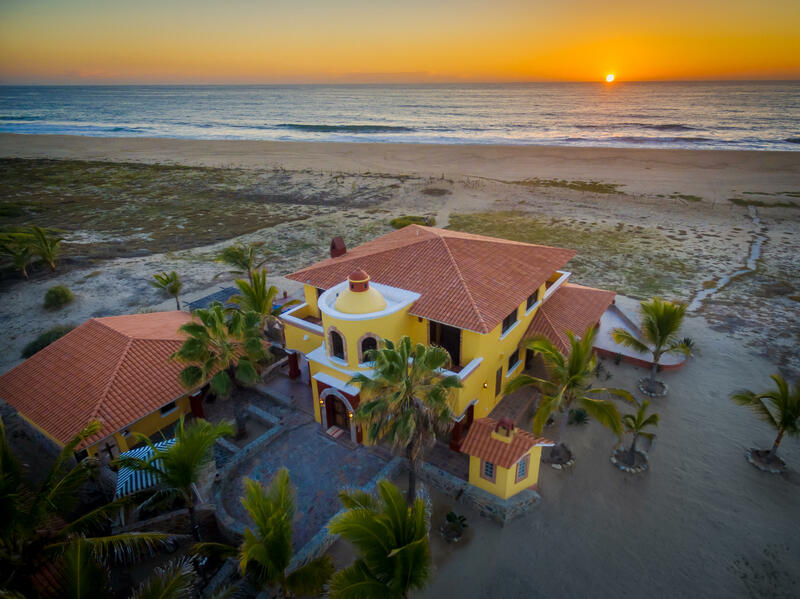 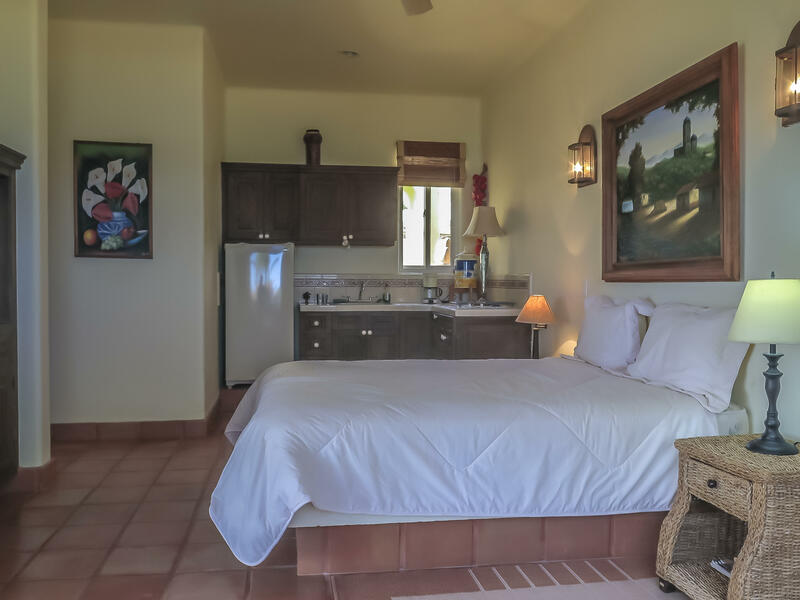 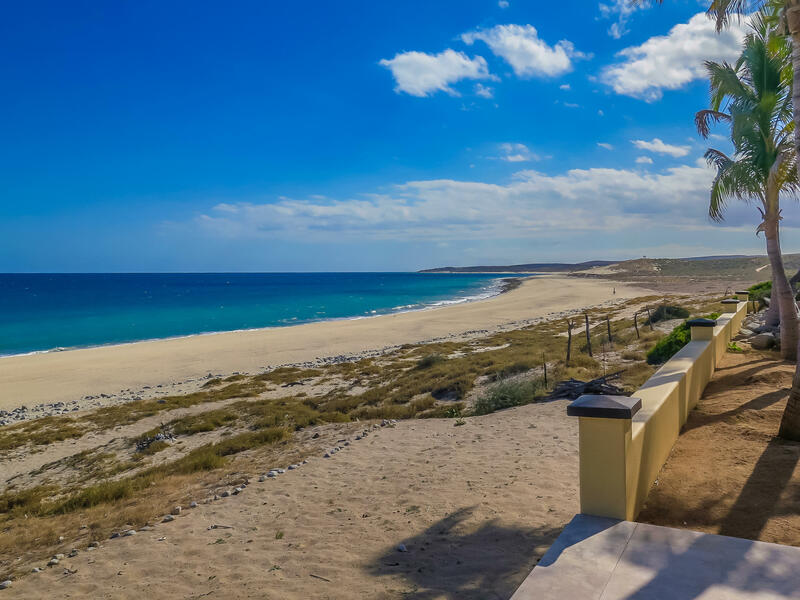 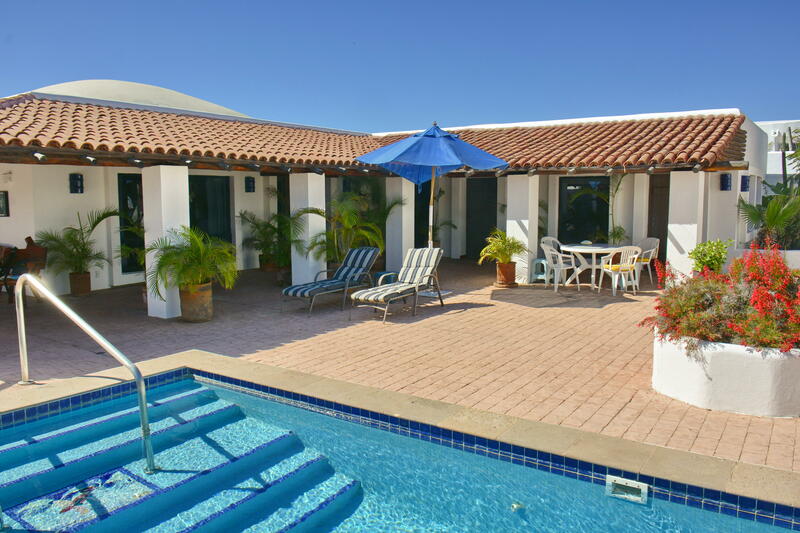 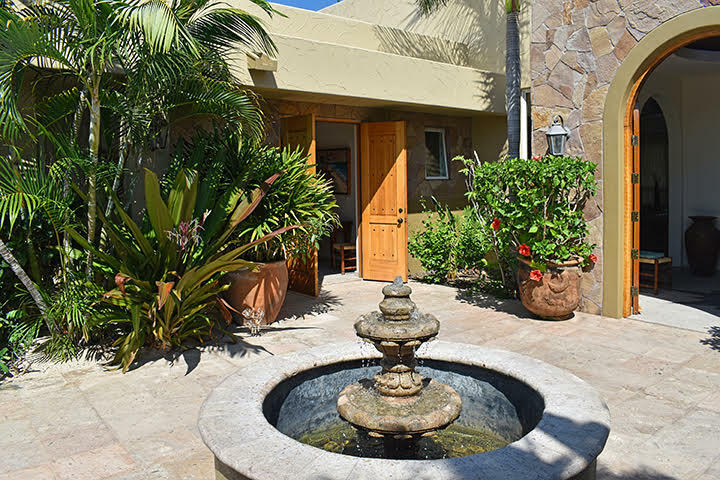 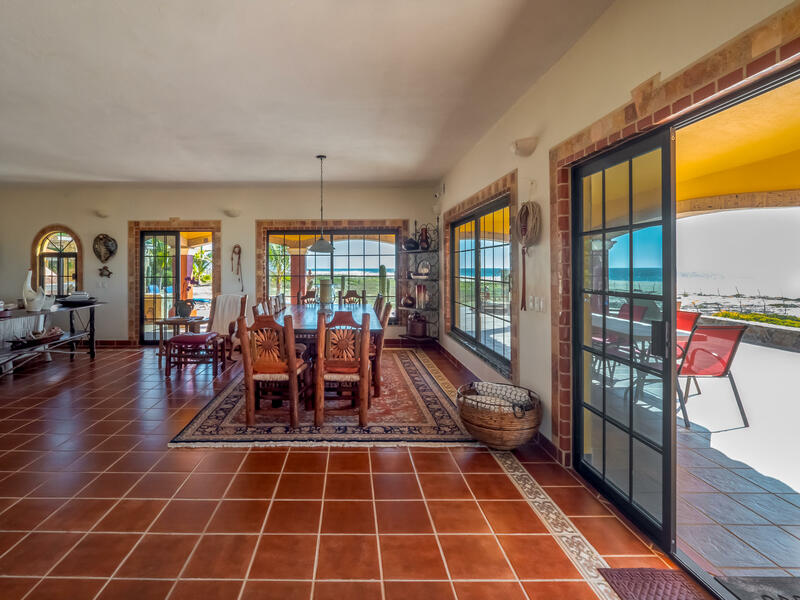 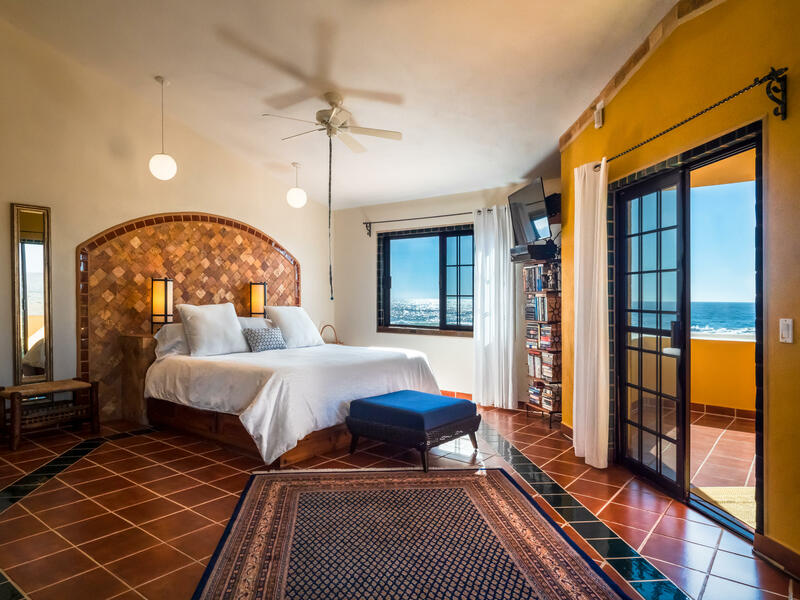 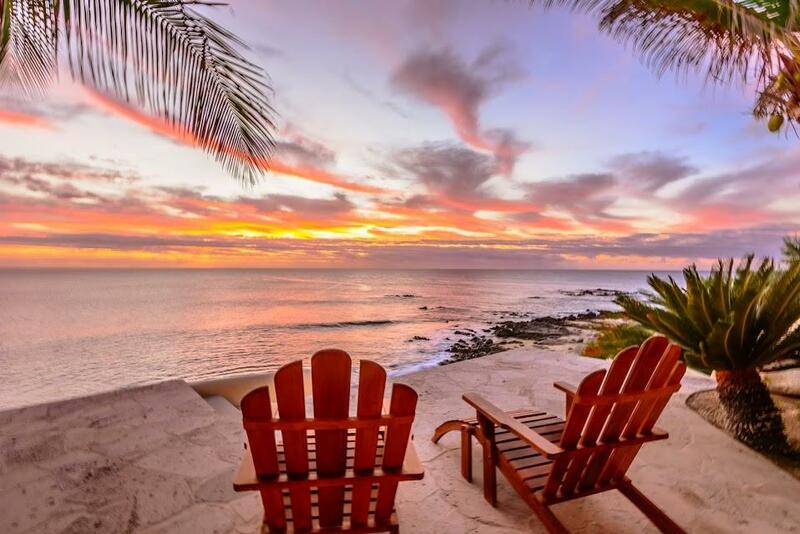 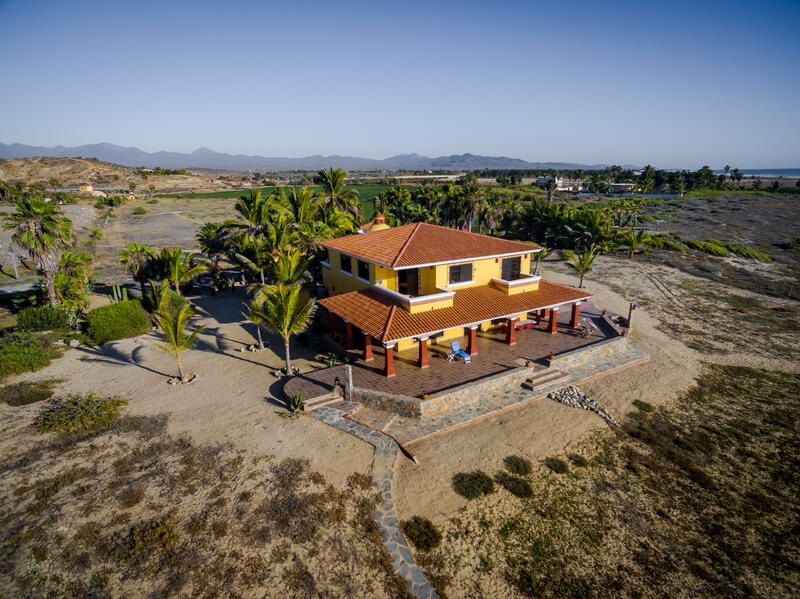 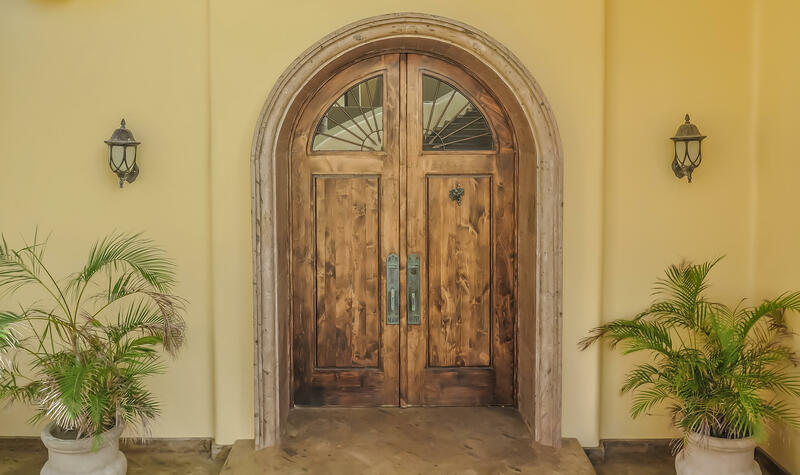 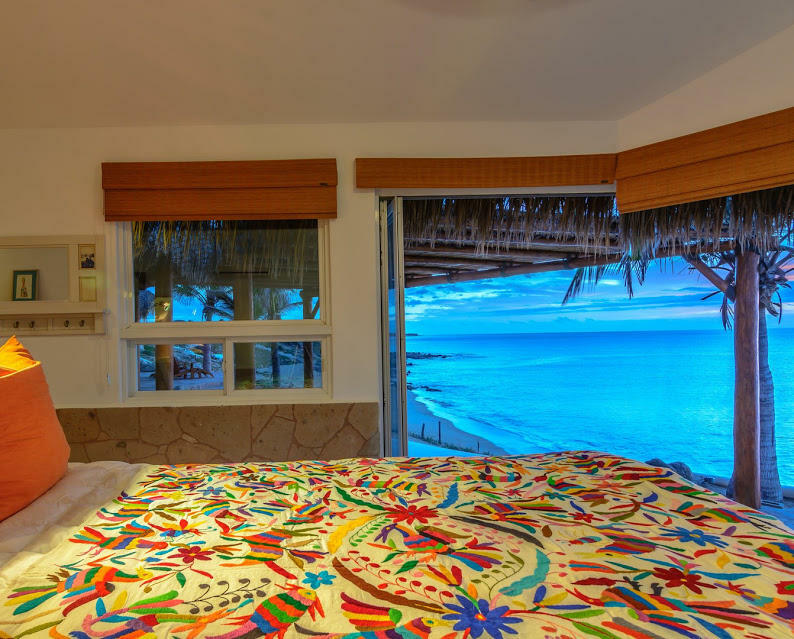 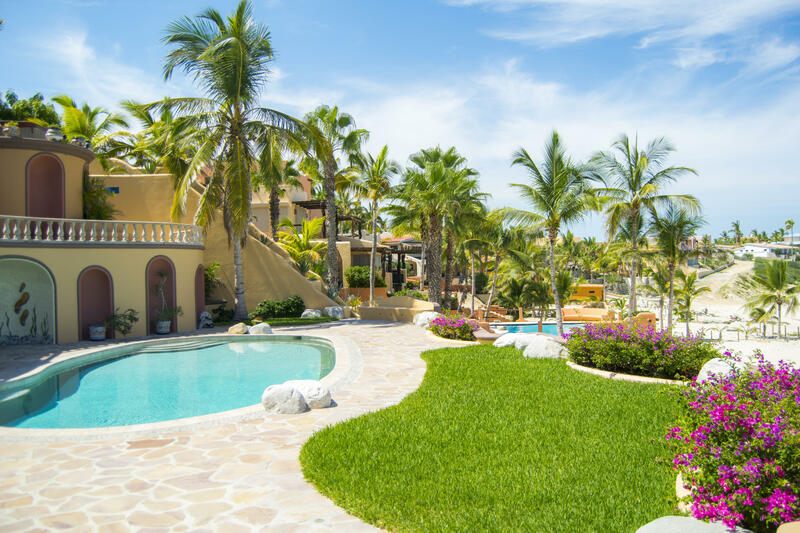 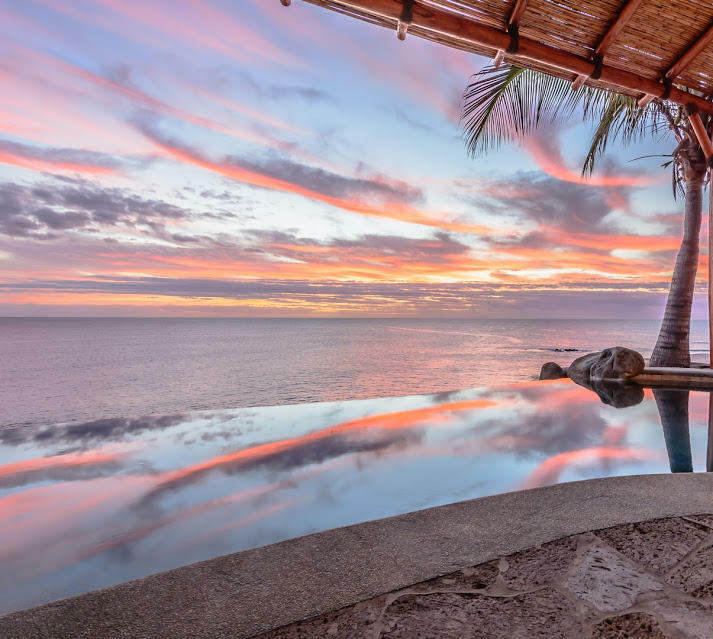 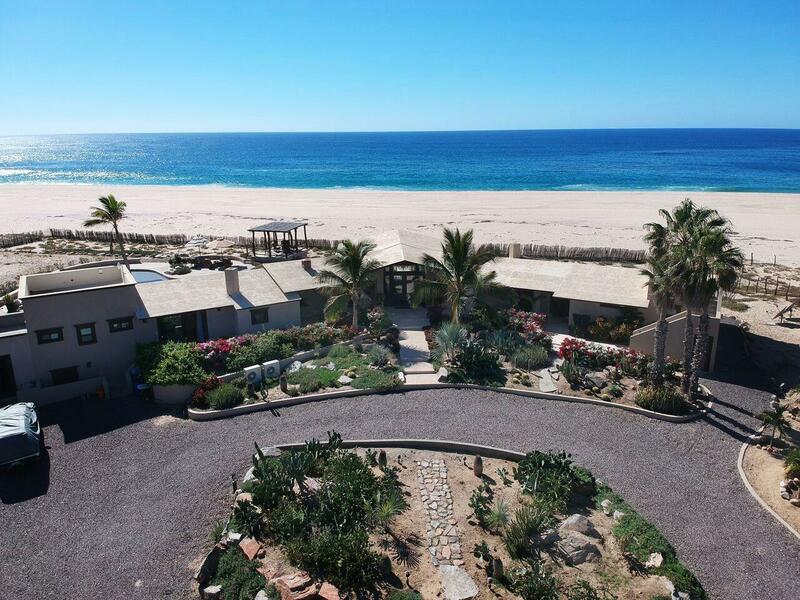 Enjoy the serenity and privacy of being away from it all, while knowing it is very short drive to the cultures and charm and activities that Cabo, San Jose and Todos Santos have to offer. 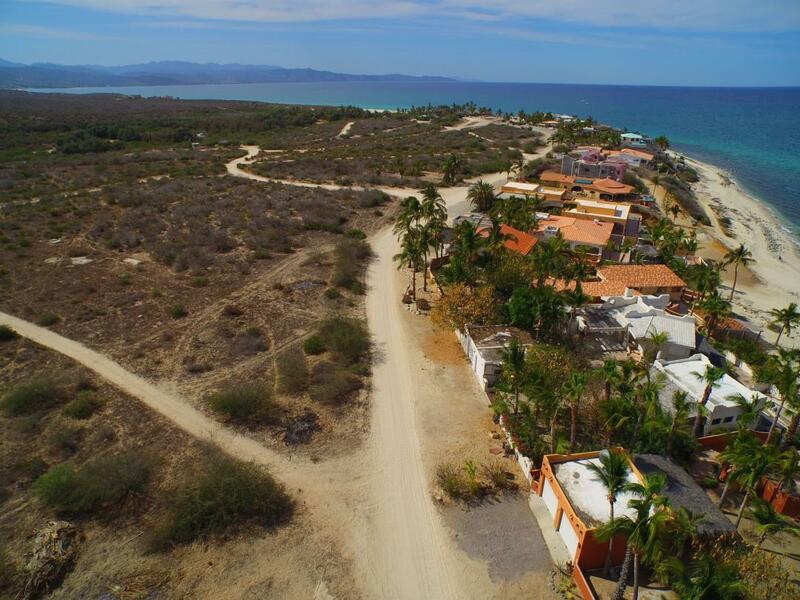 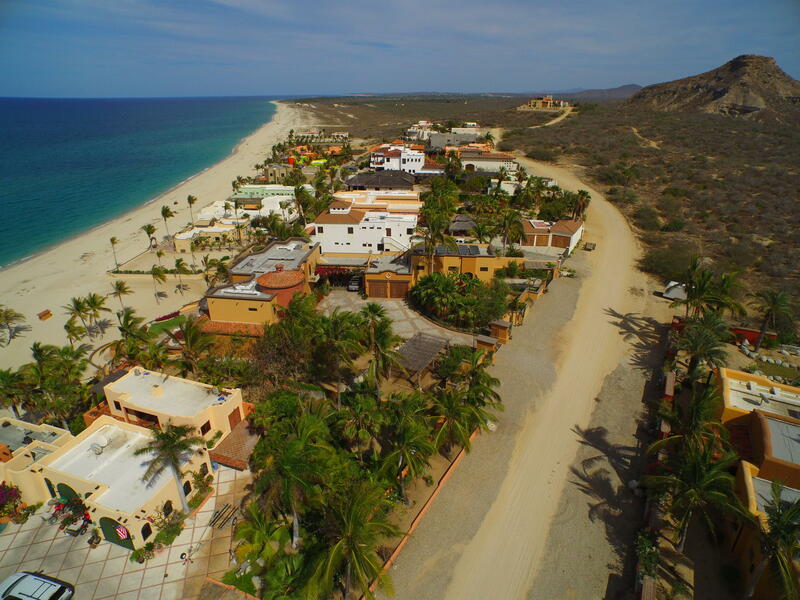 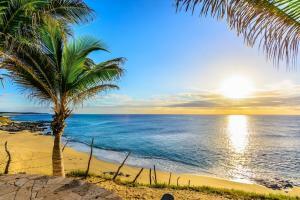 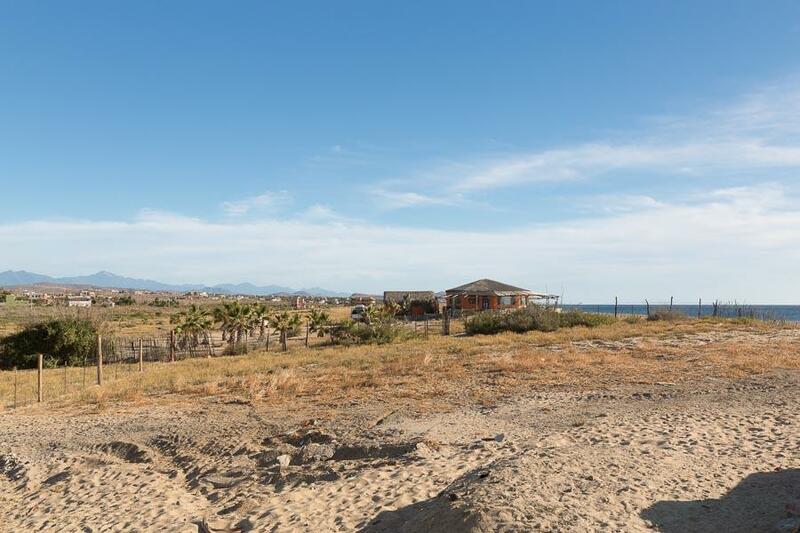 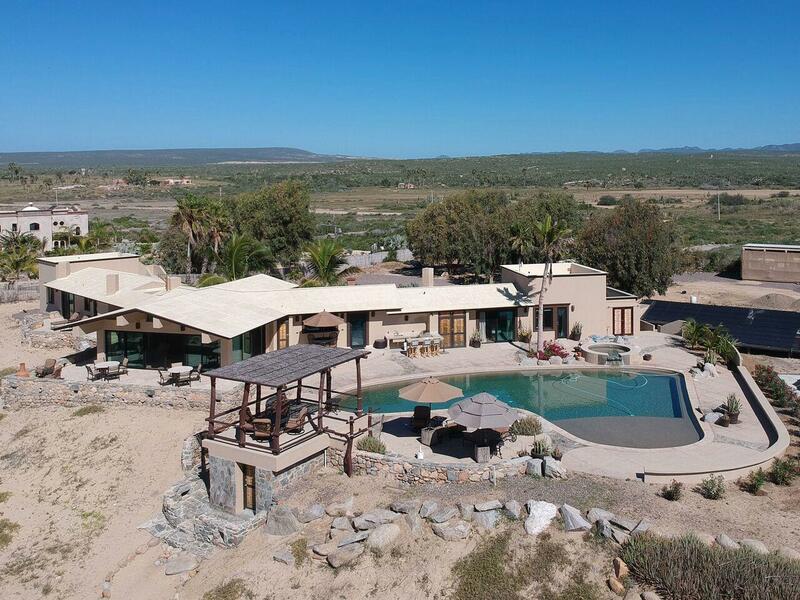 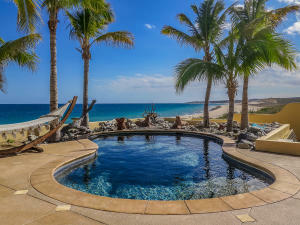 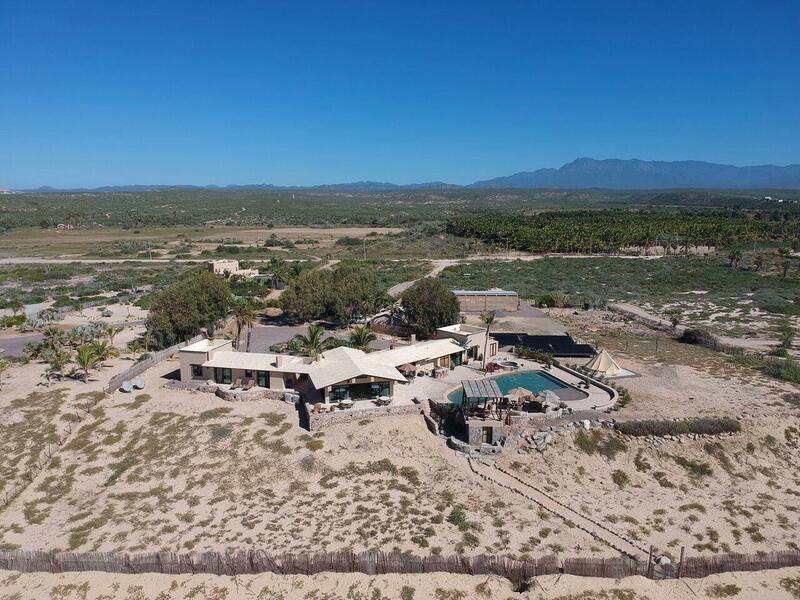 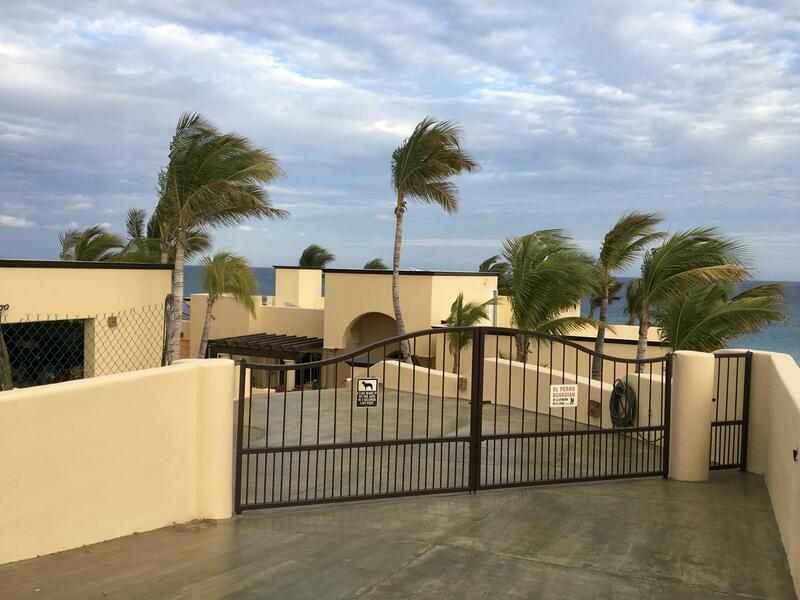 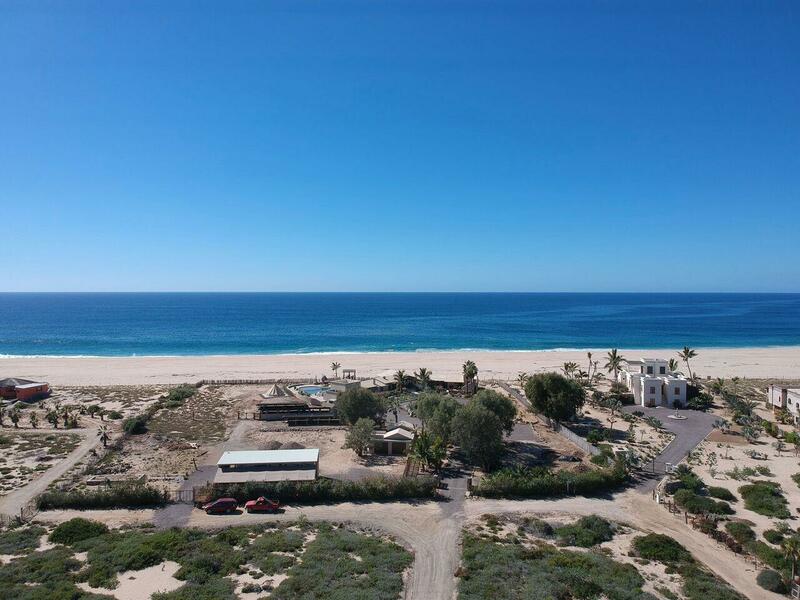 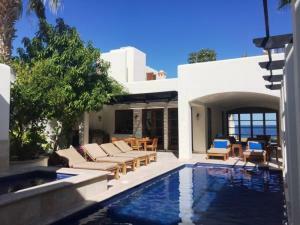 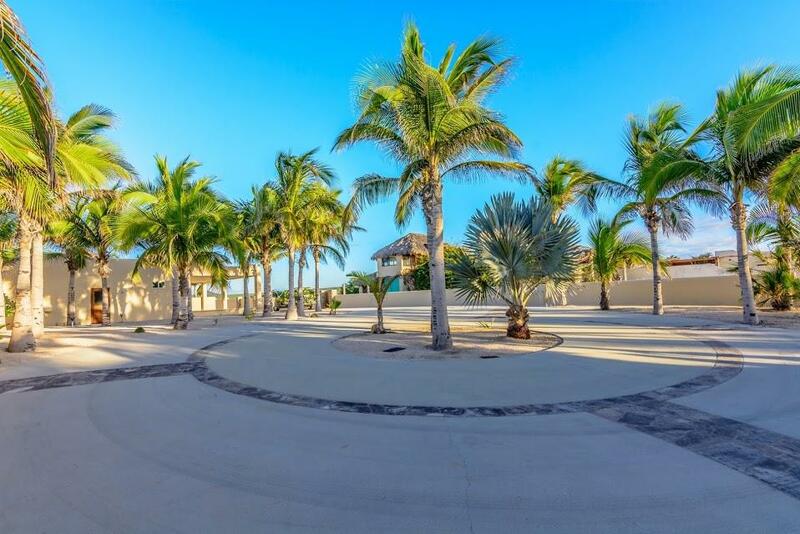 Description: Welcome to Villa Ballena Vista!Luxury ocean front property in Cabo is a rarity, particularly at this price point!Welcome to Villa Ballena Vista. 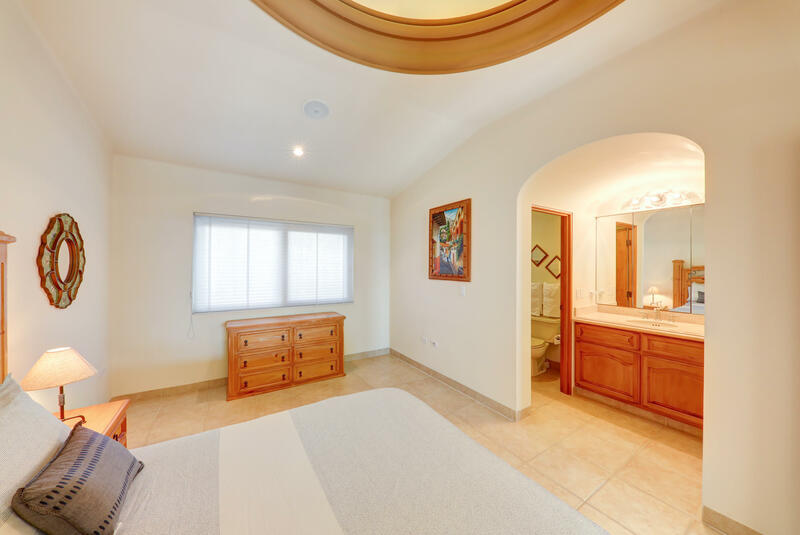 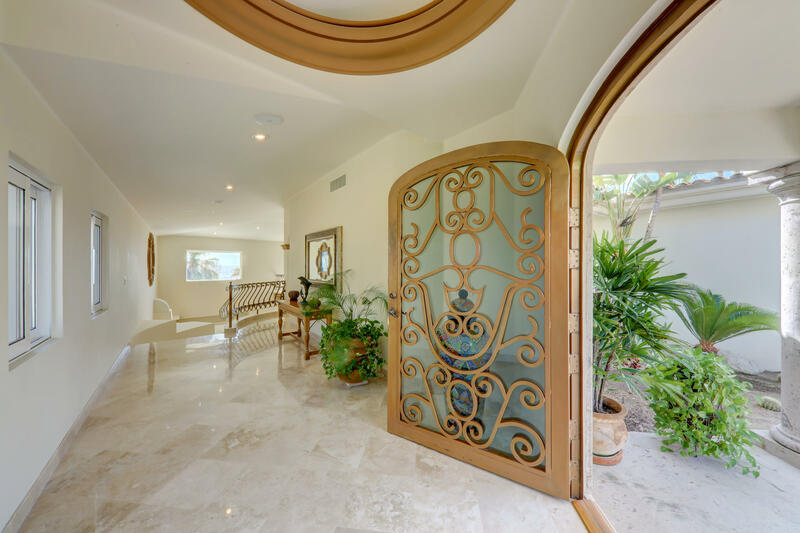 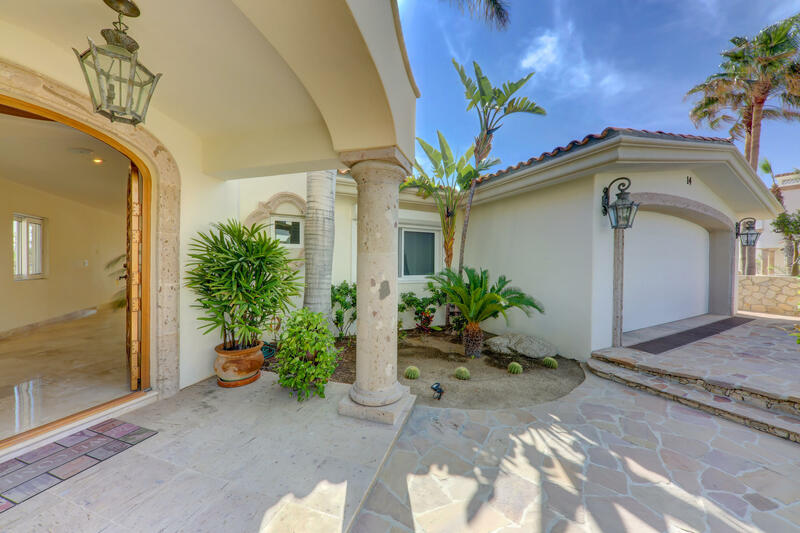 This gorgeous ocean front 4-bedroom, 4.5-bathroom residence is in the private and exclusive double gated community of Playa Del Rey. 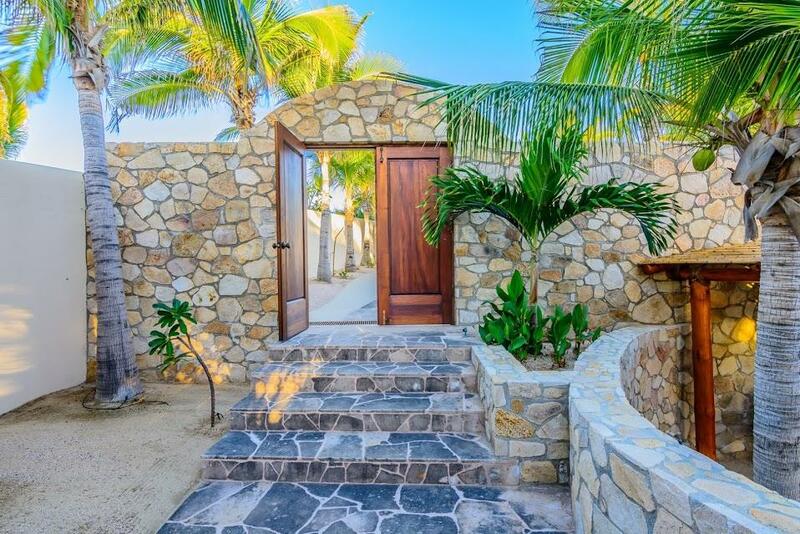 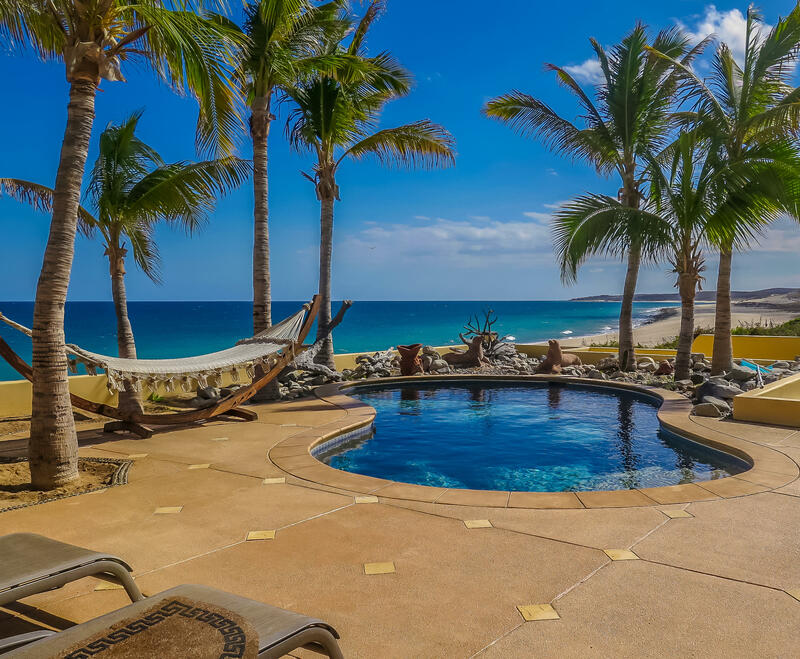 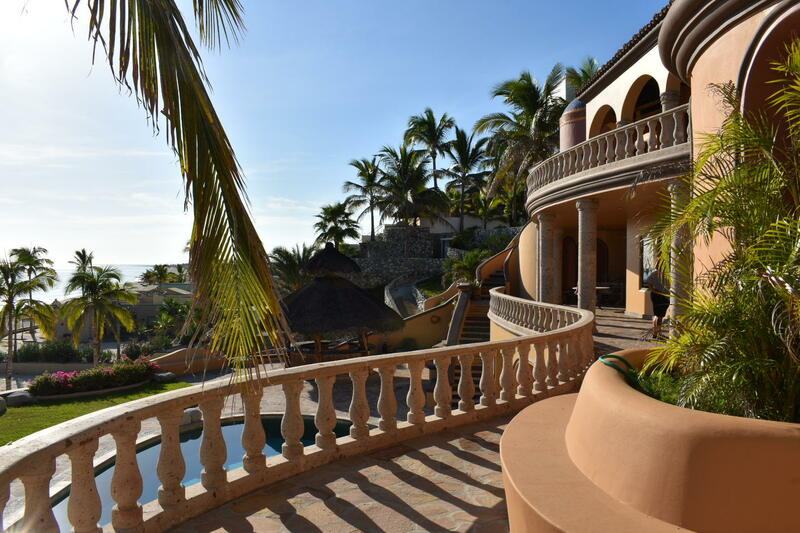 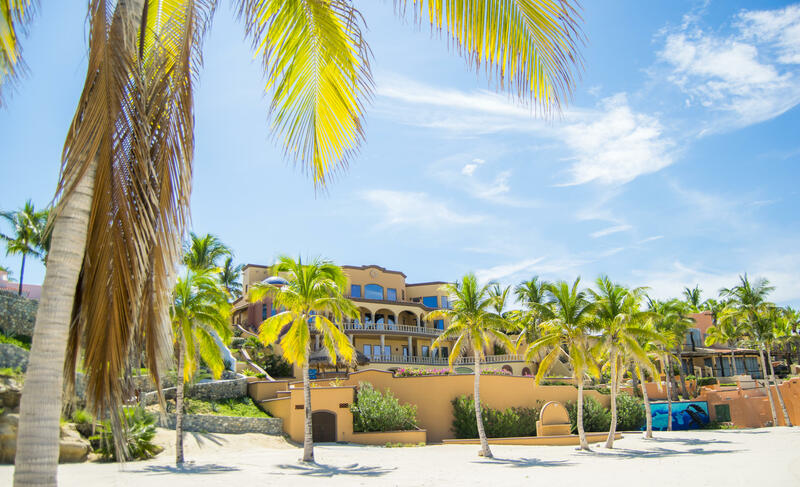 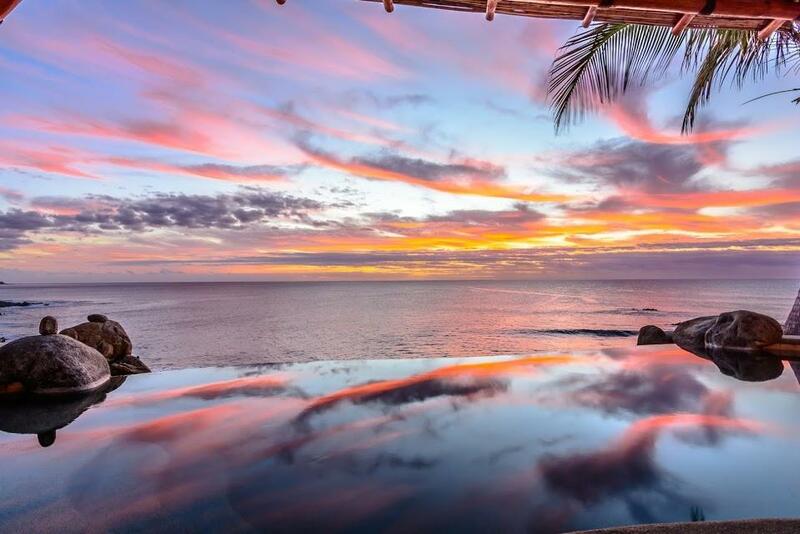 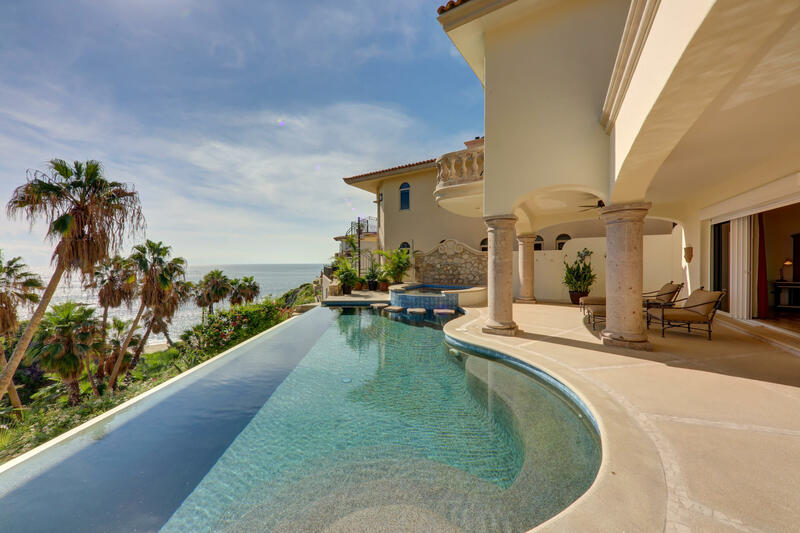 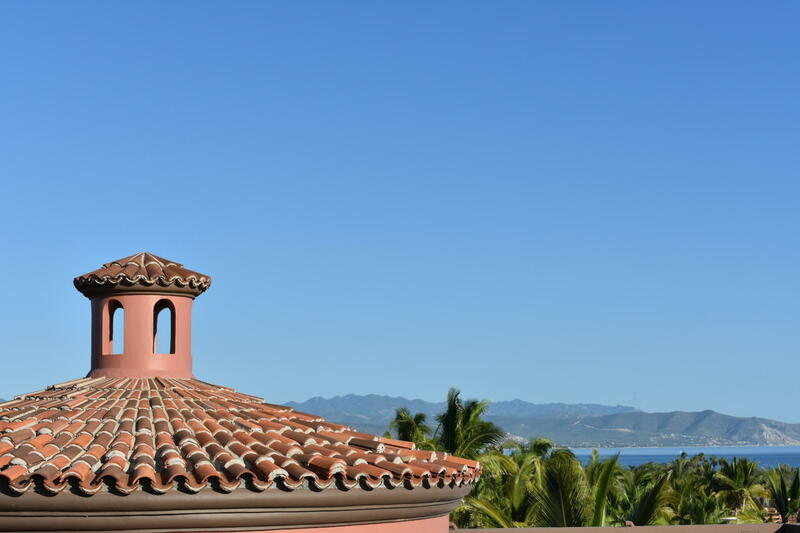 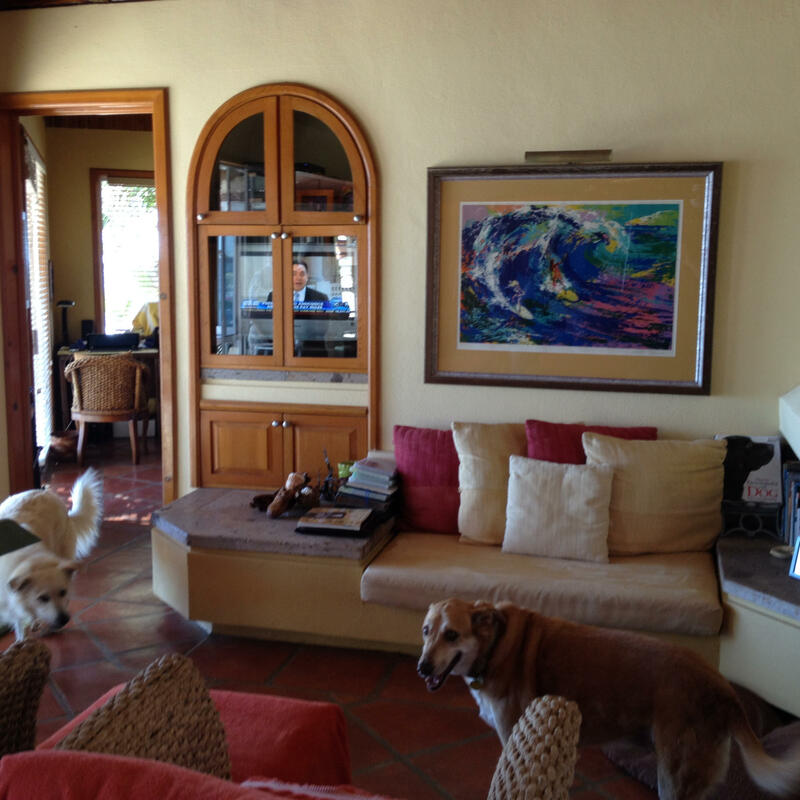 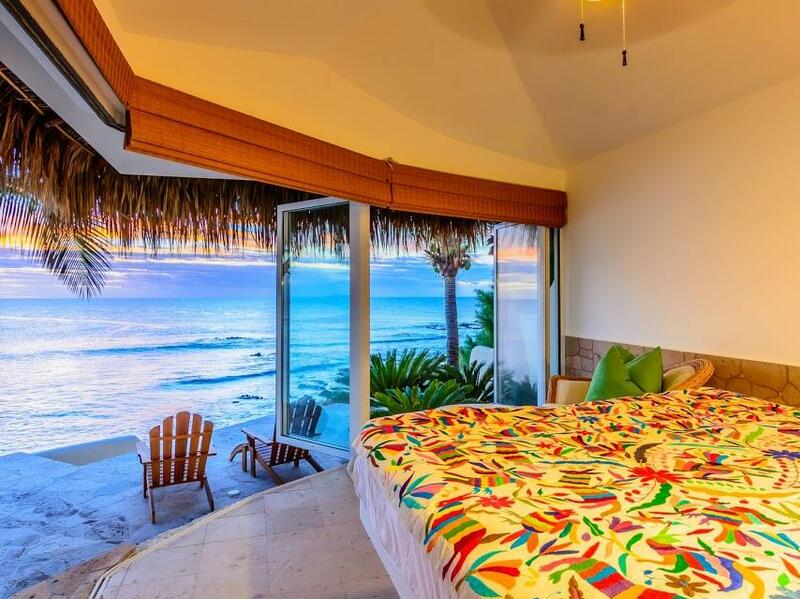 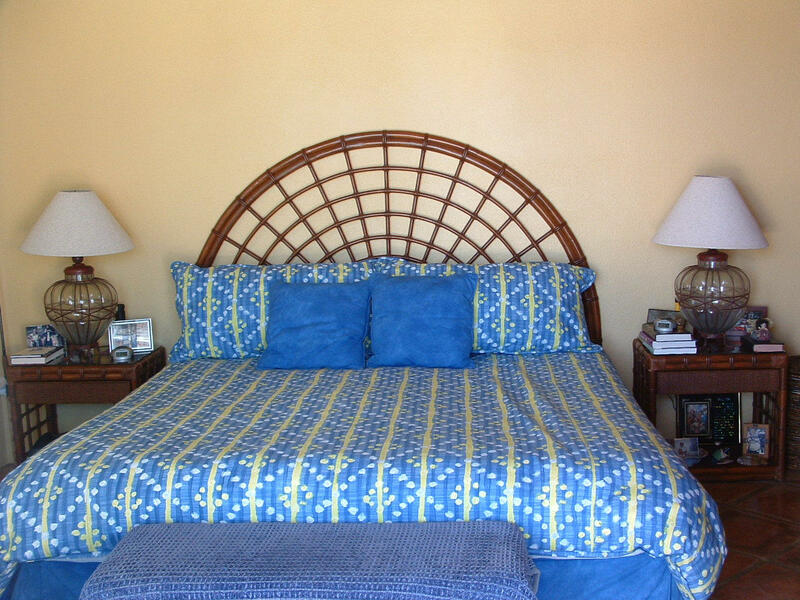 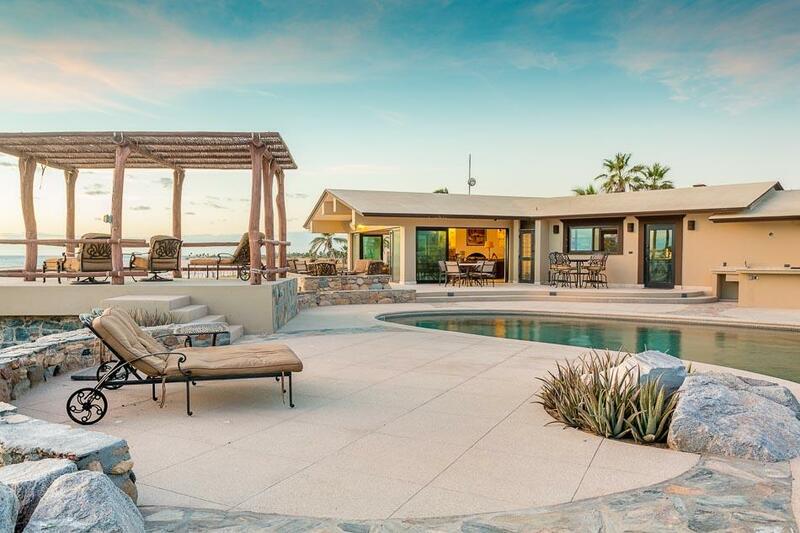 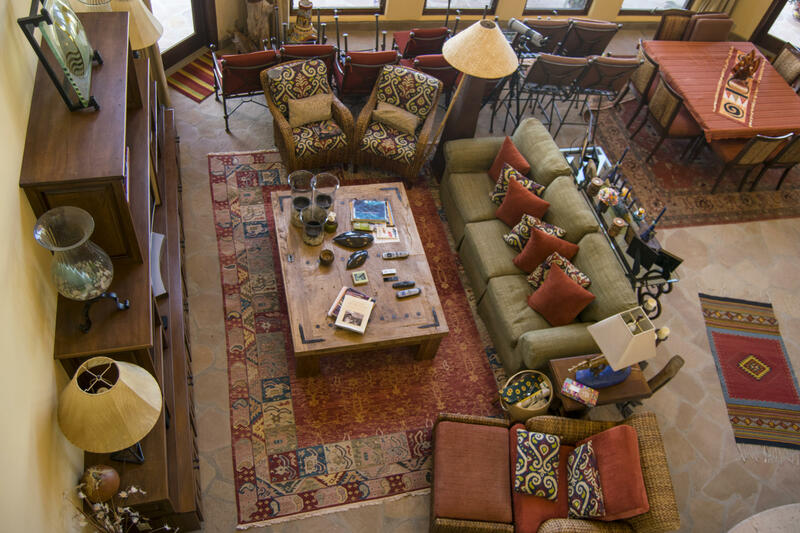 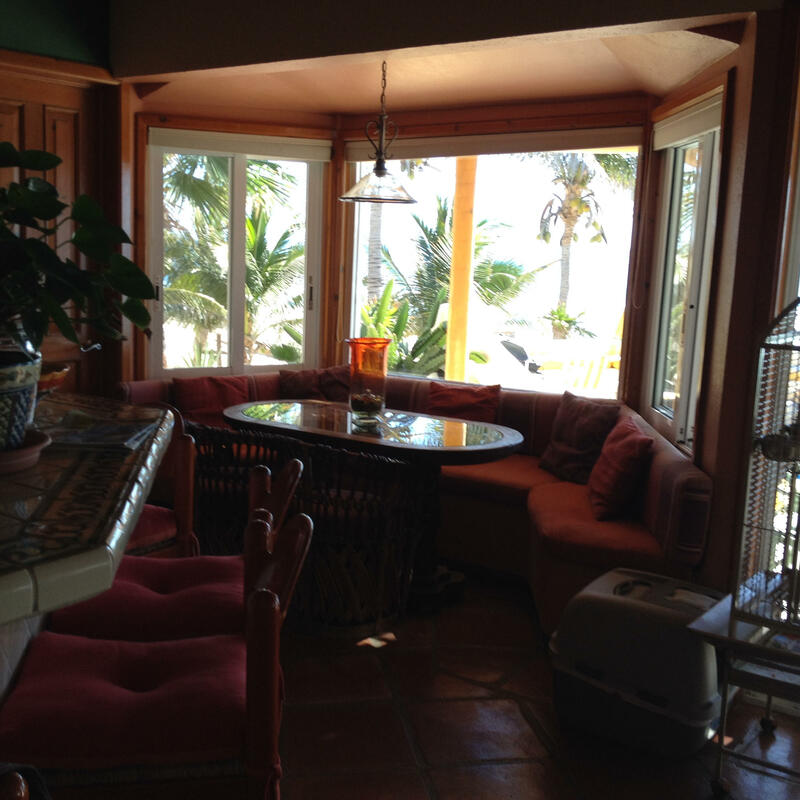 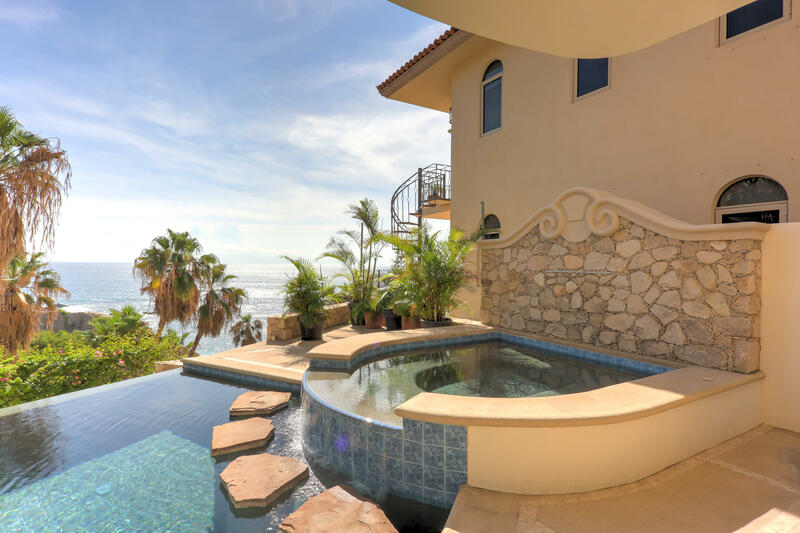 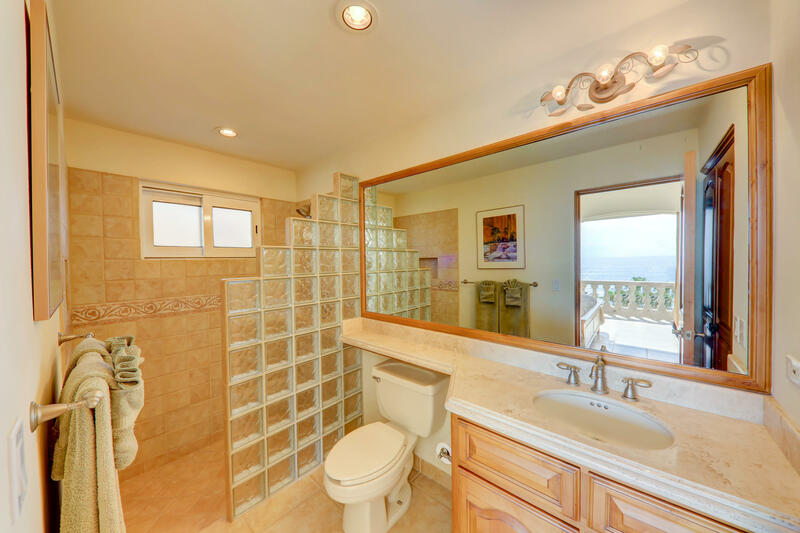 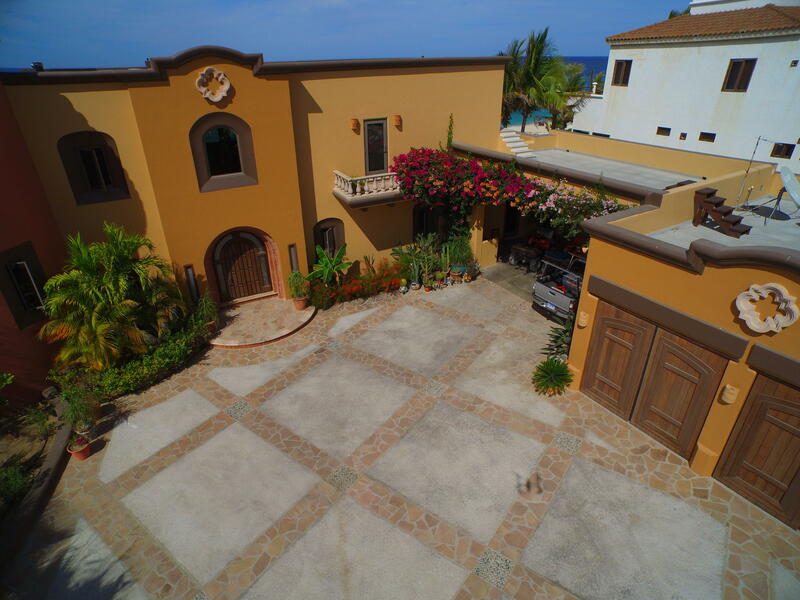 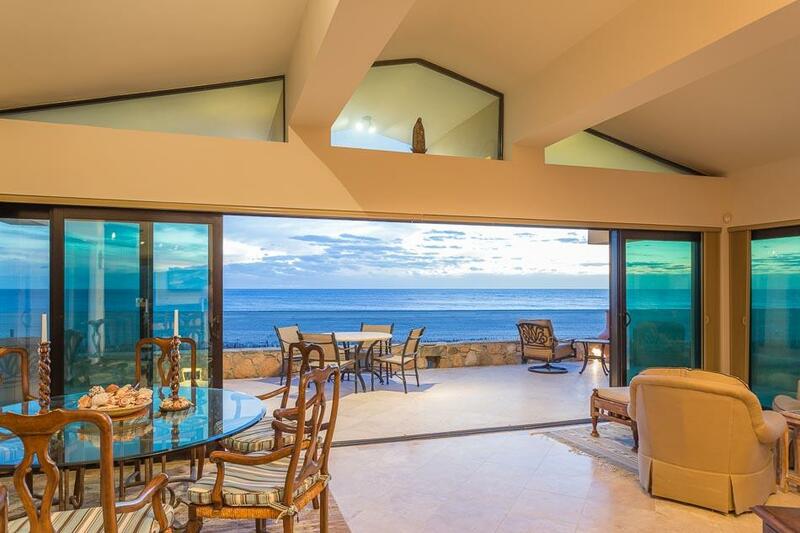 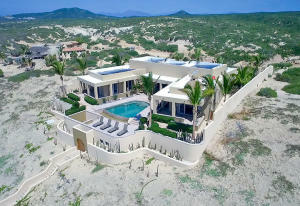 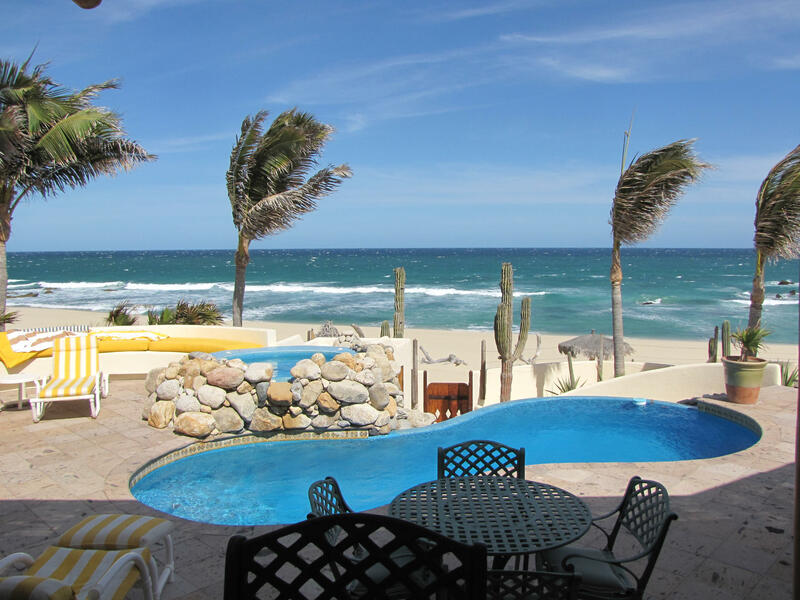 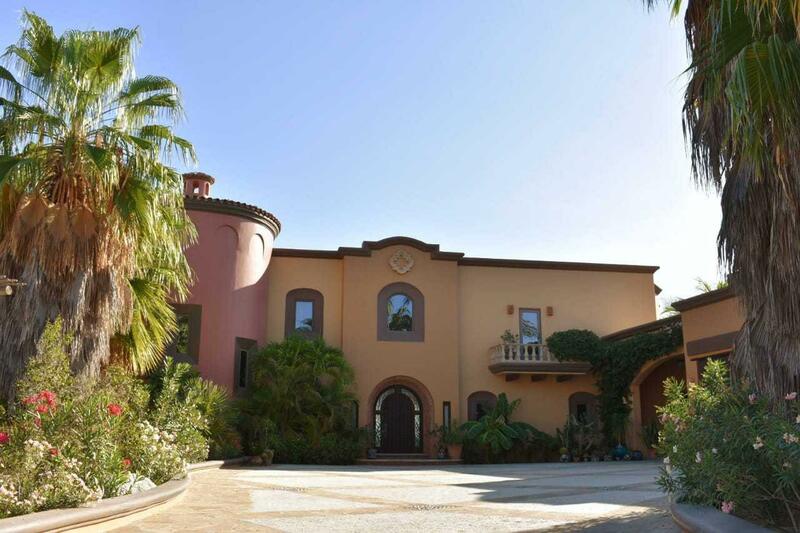 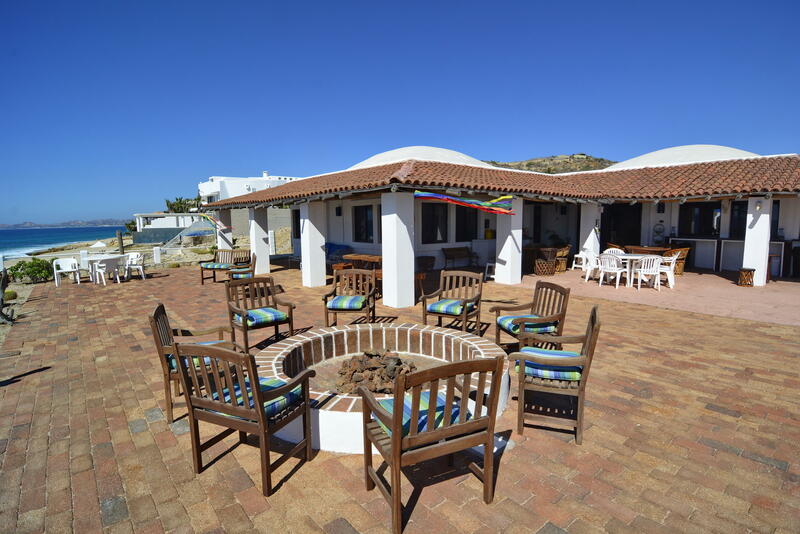 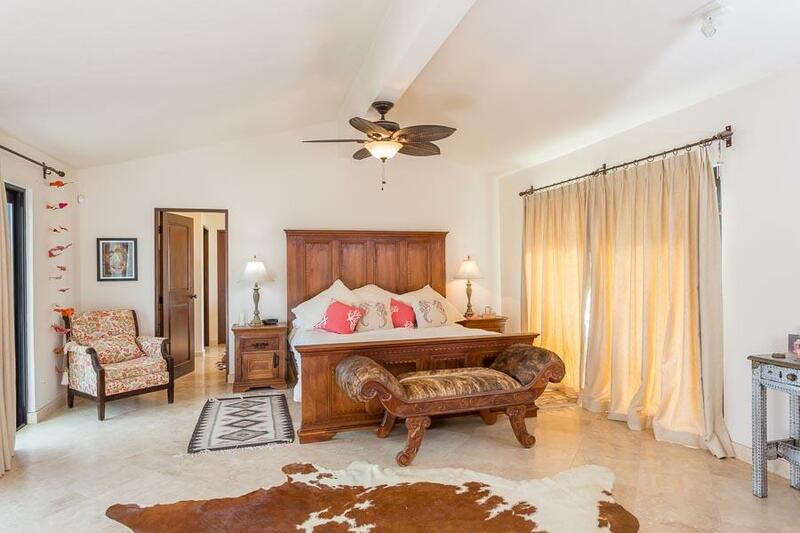 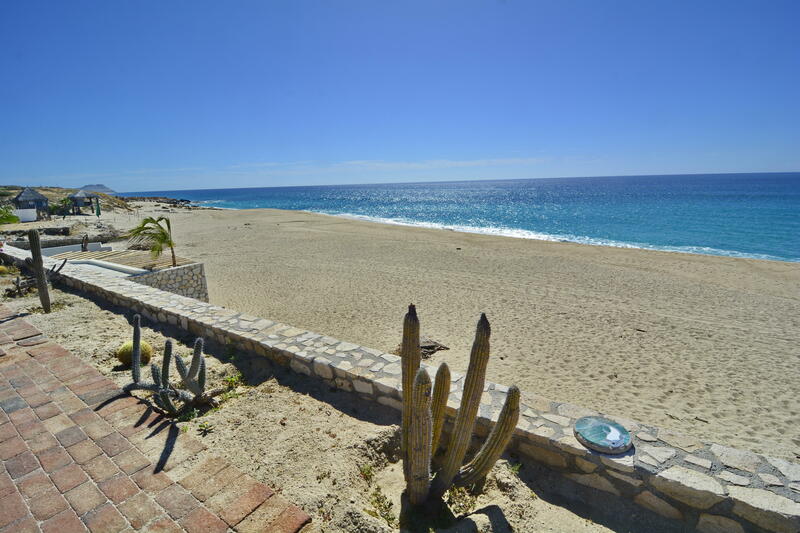 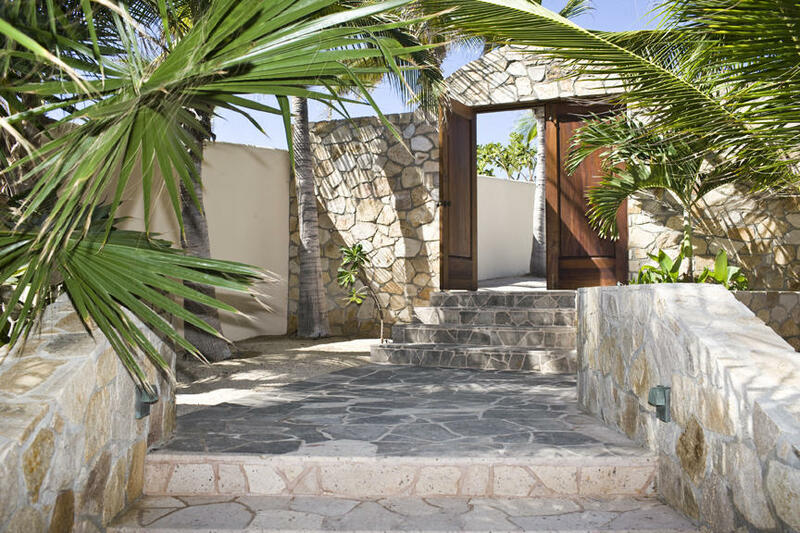 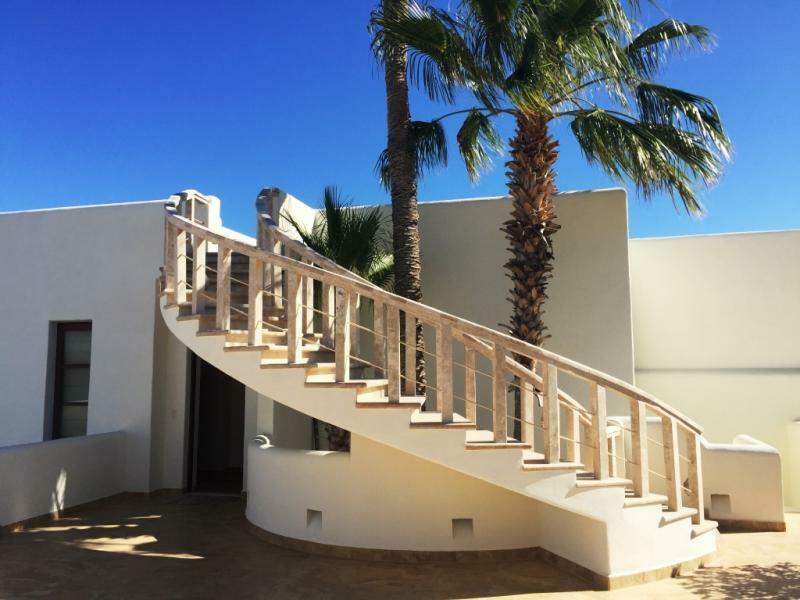 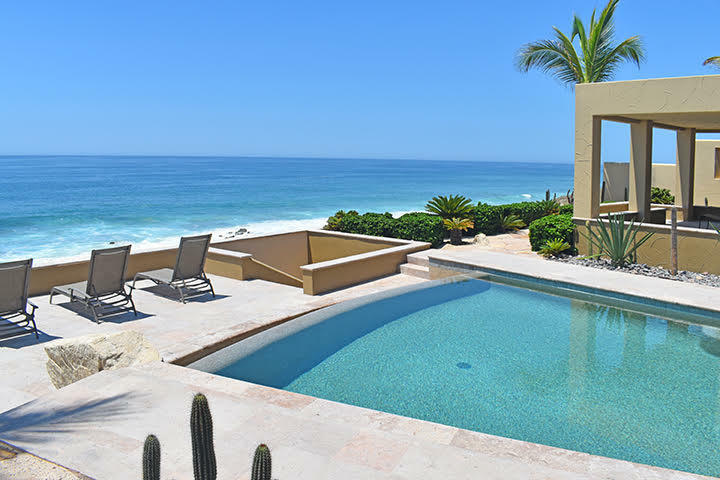 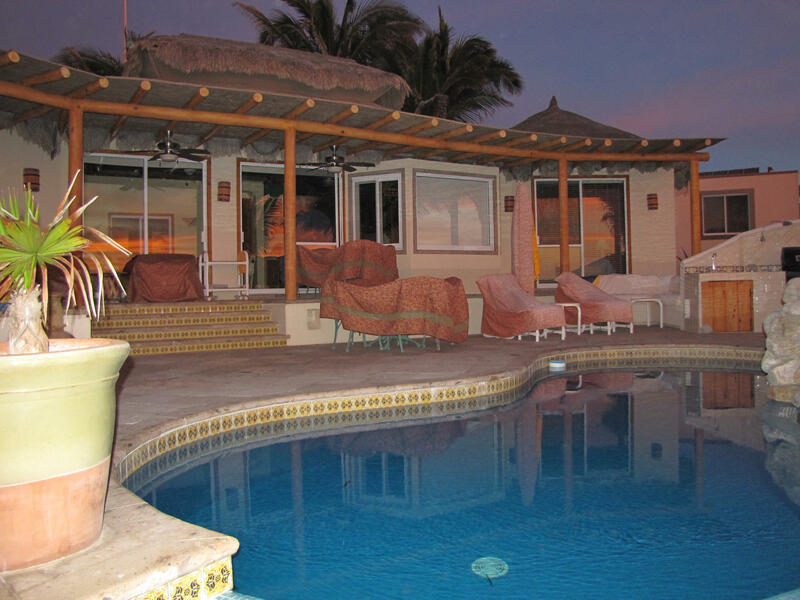 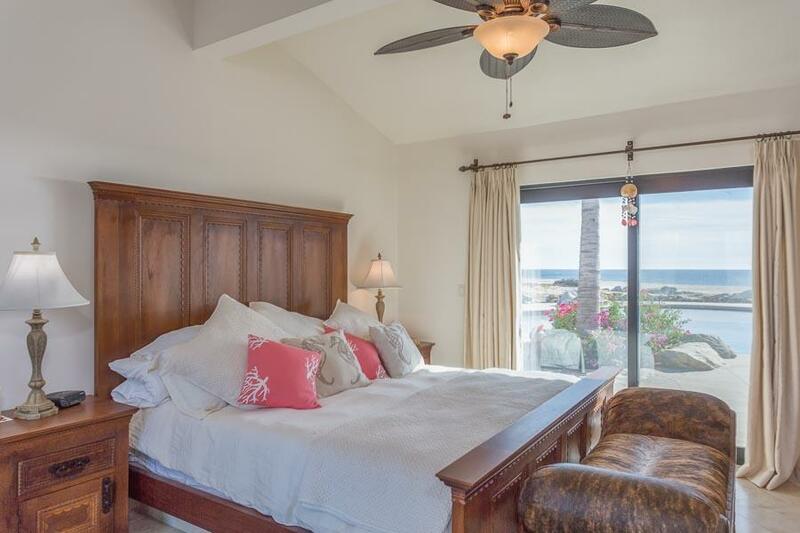 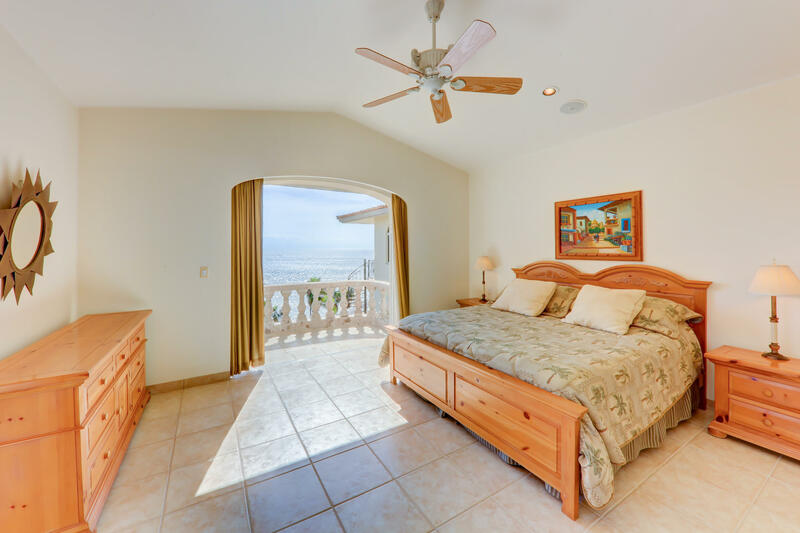 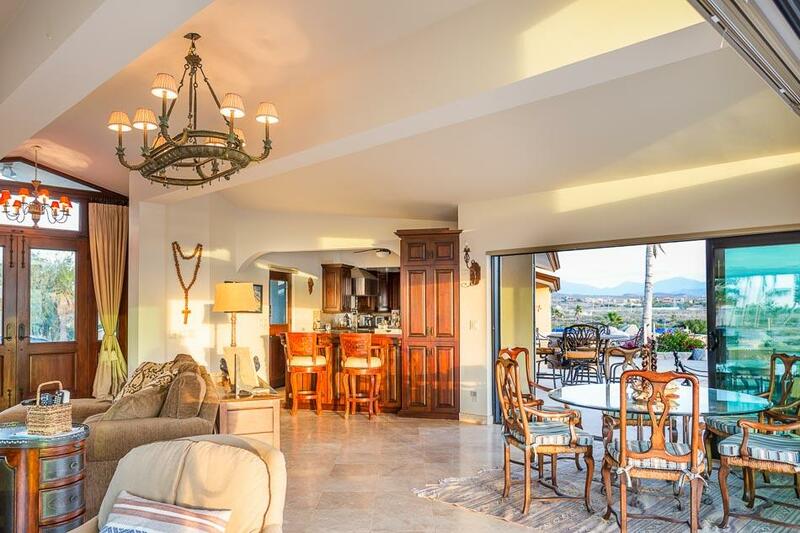 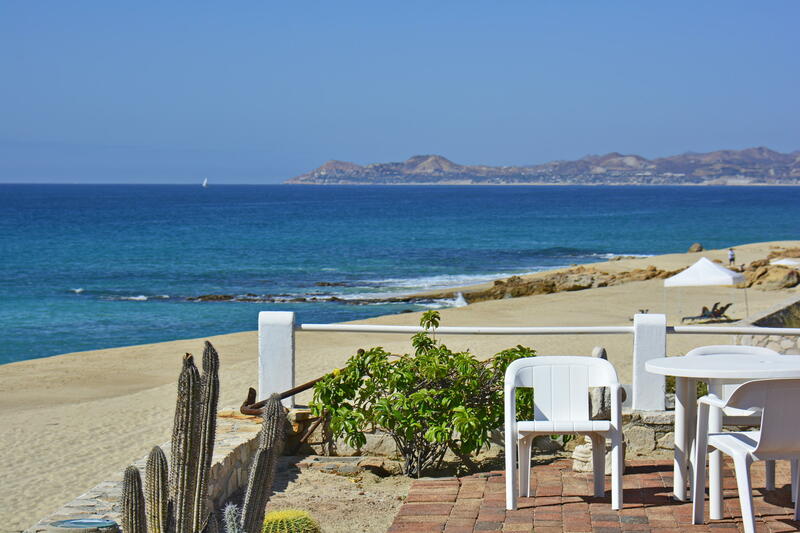 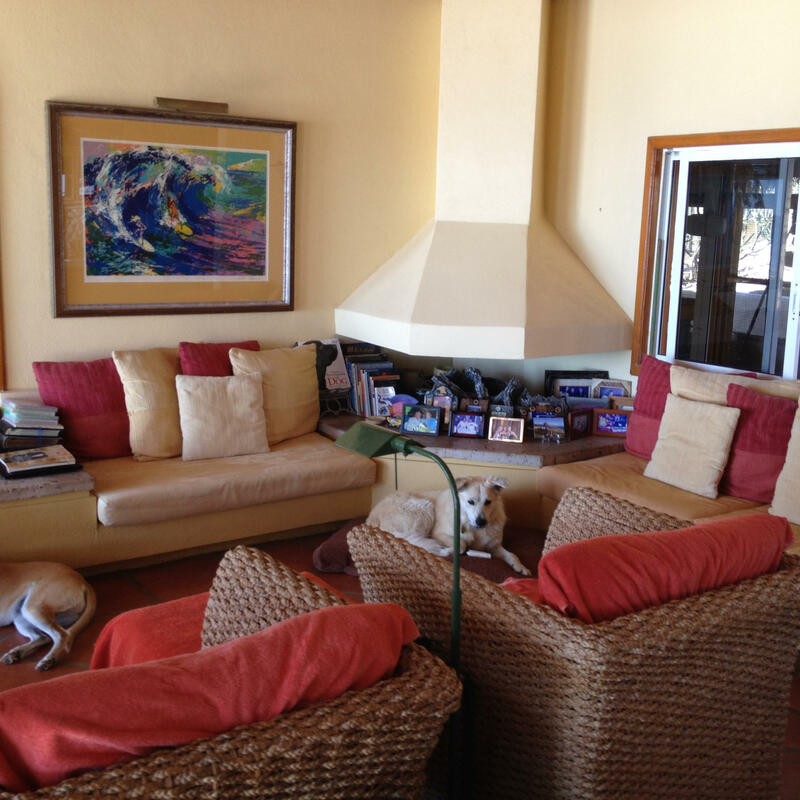 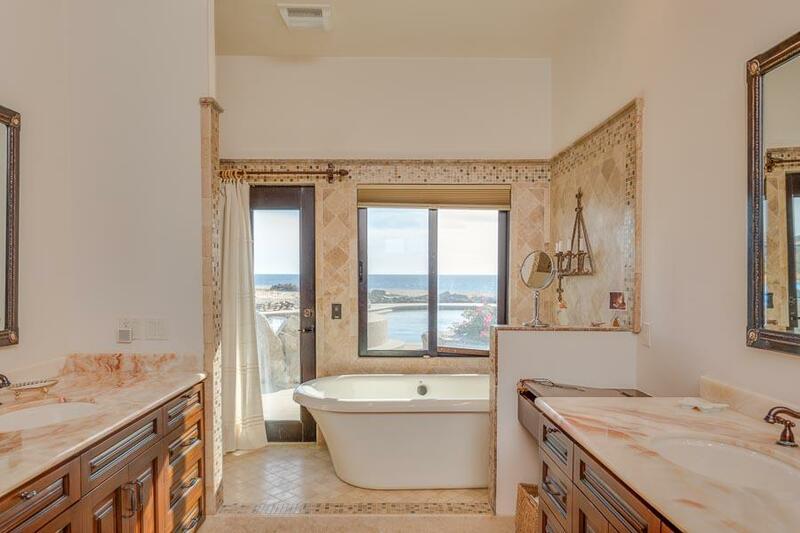 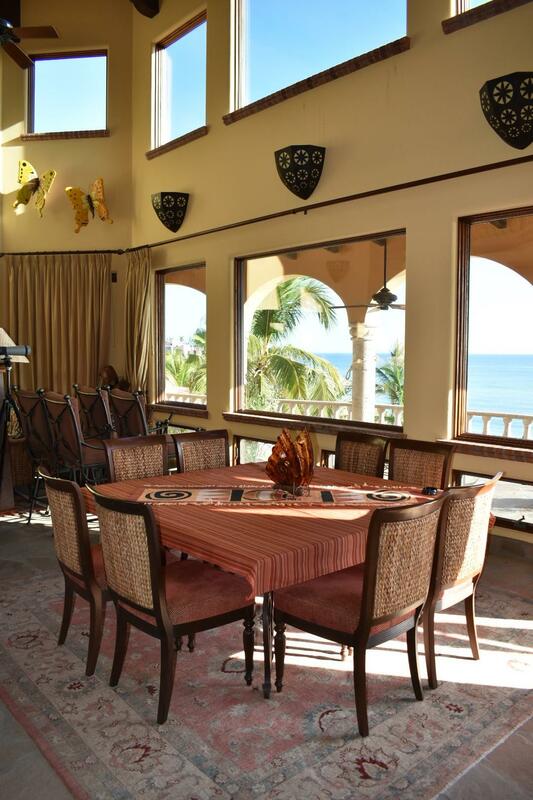 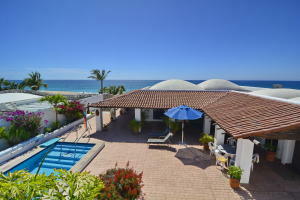 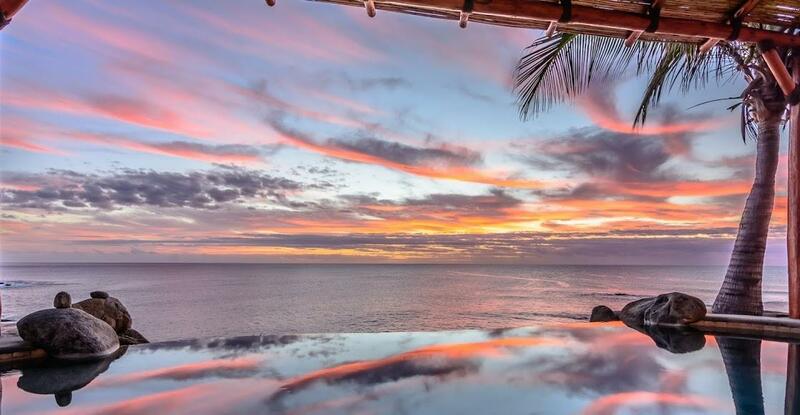 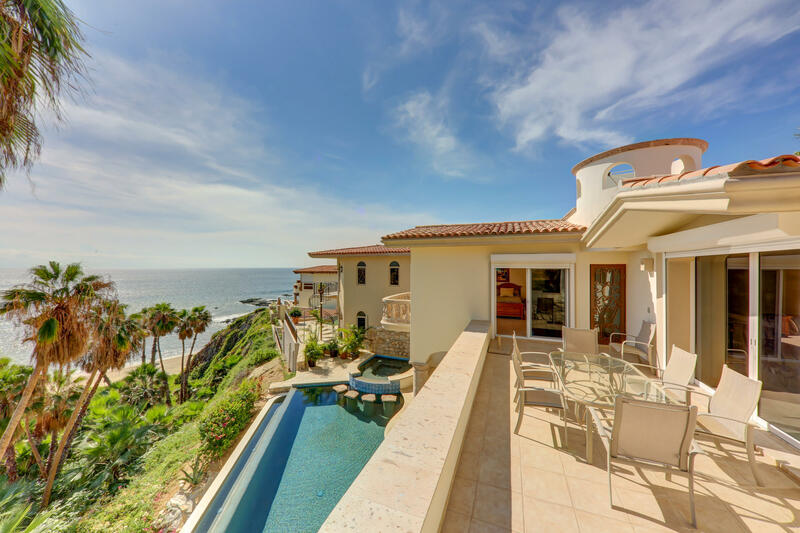 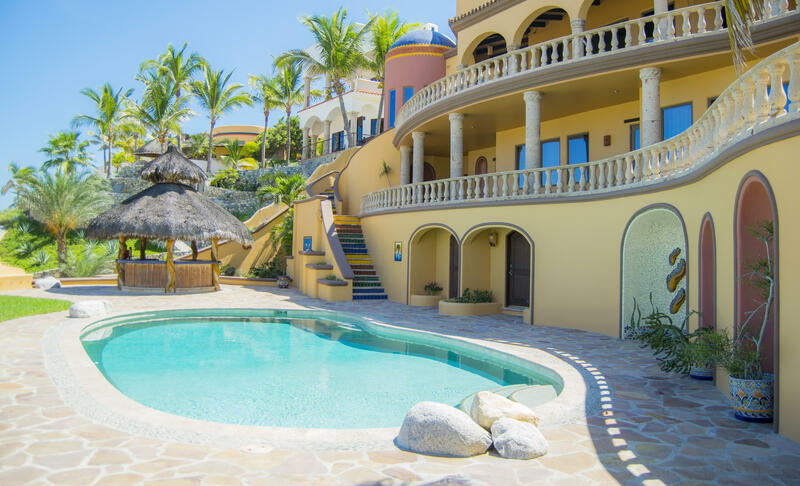 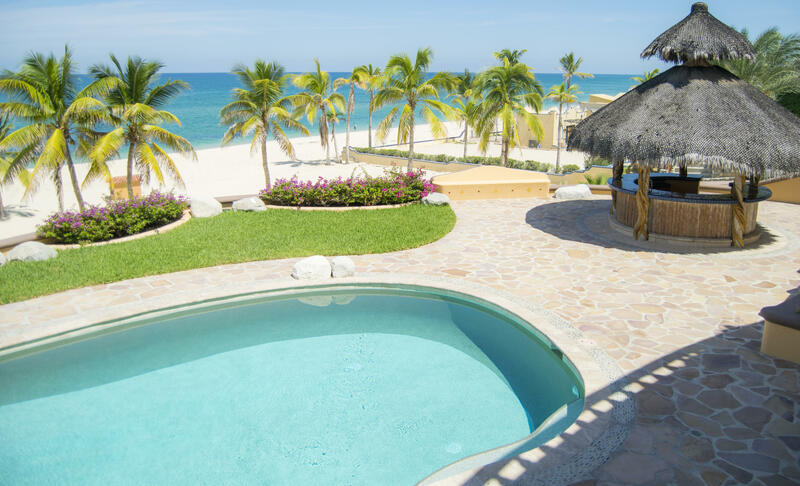 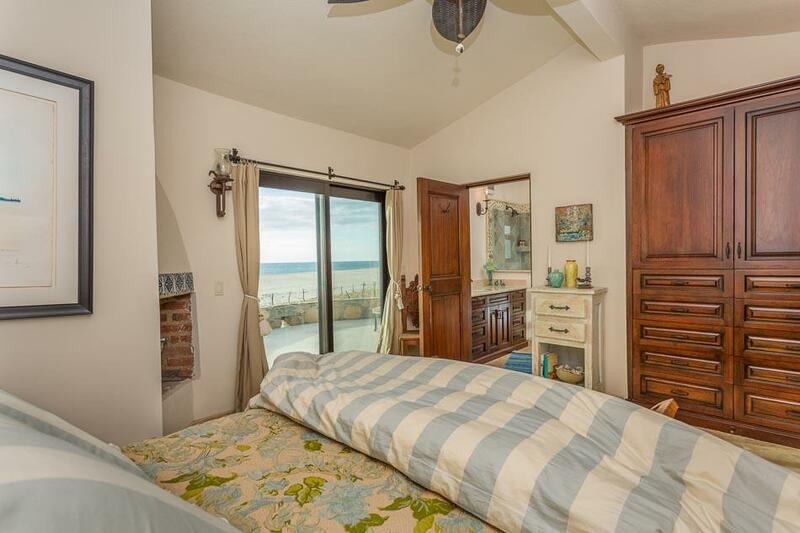 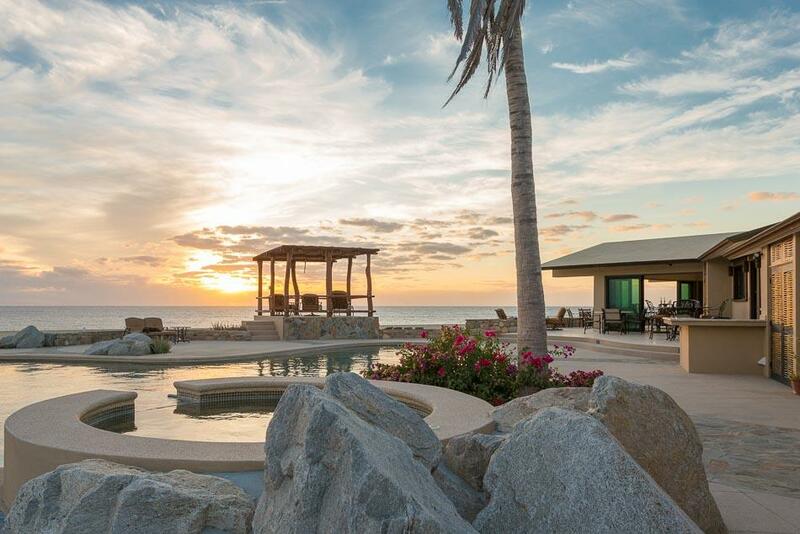 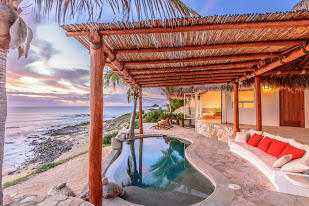 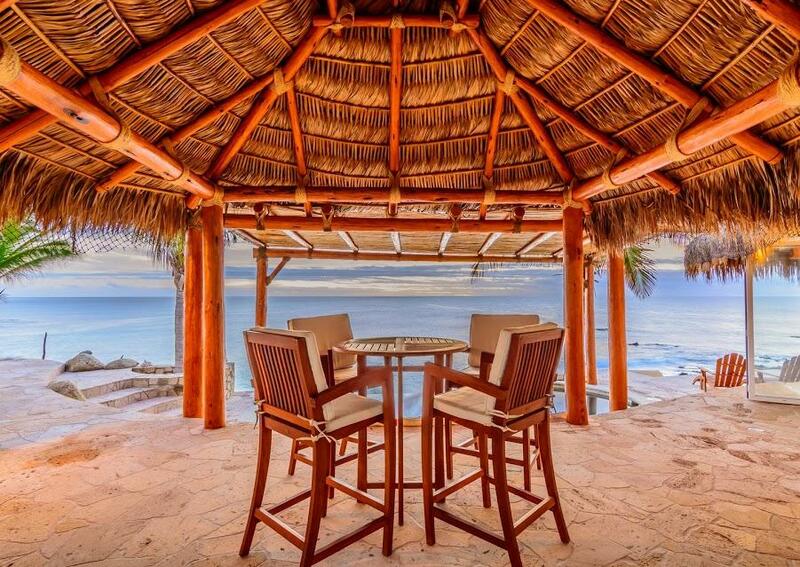 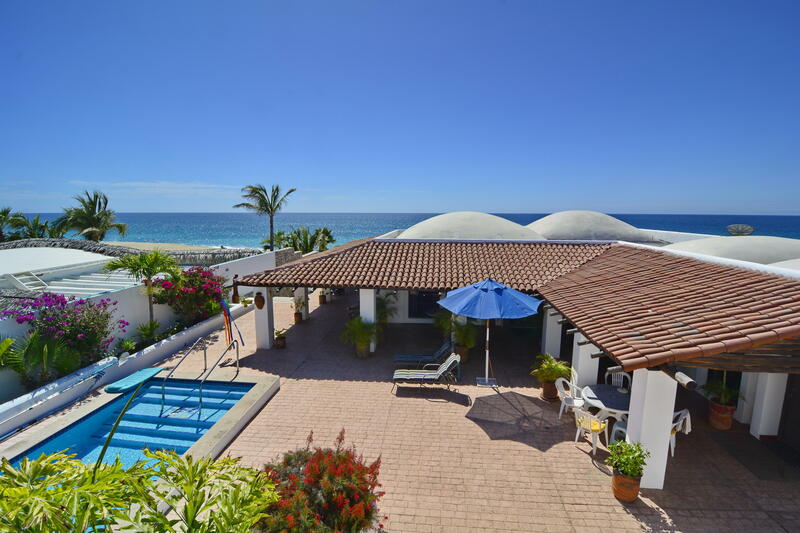 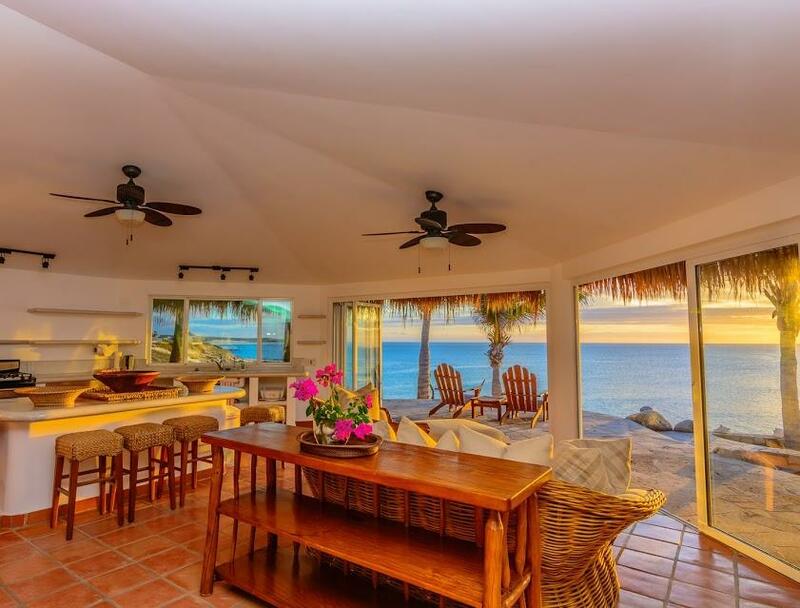 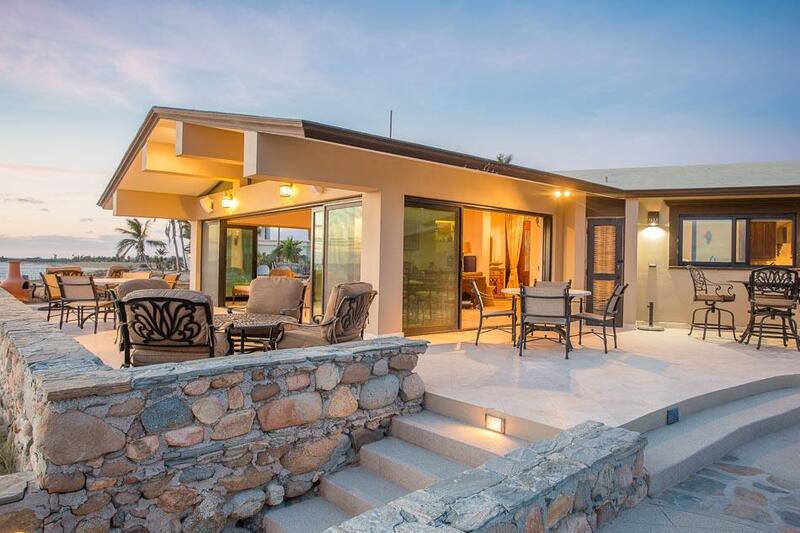 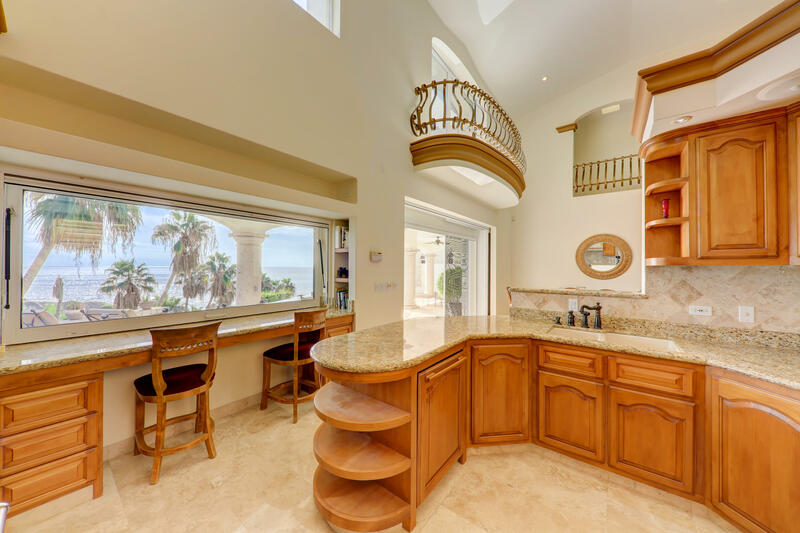 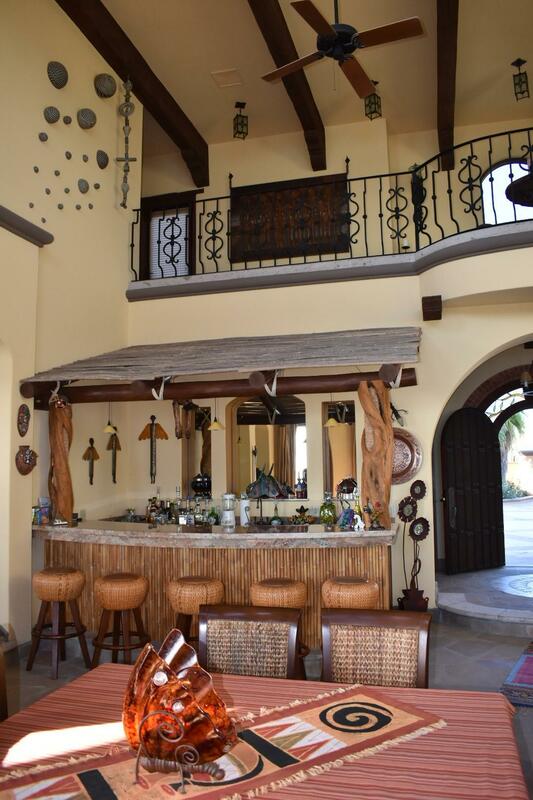 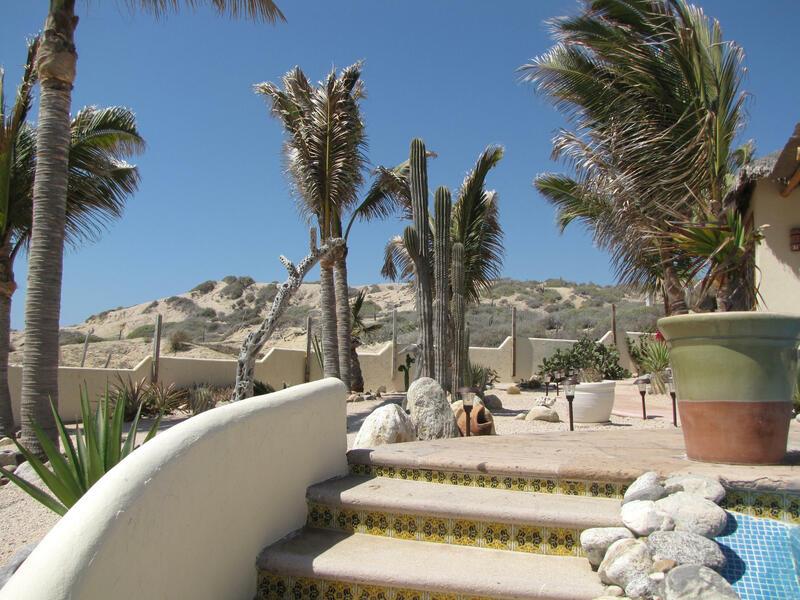 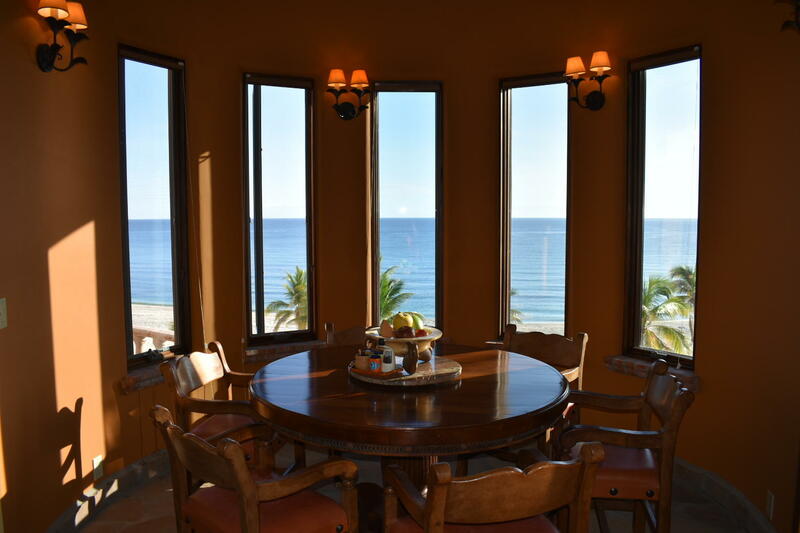 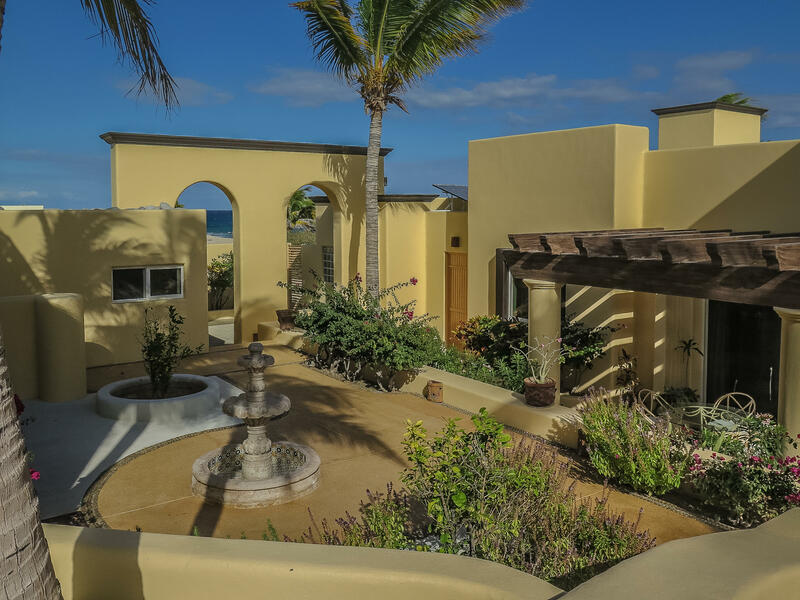 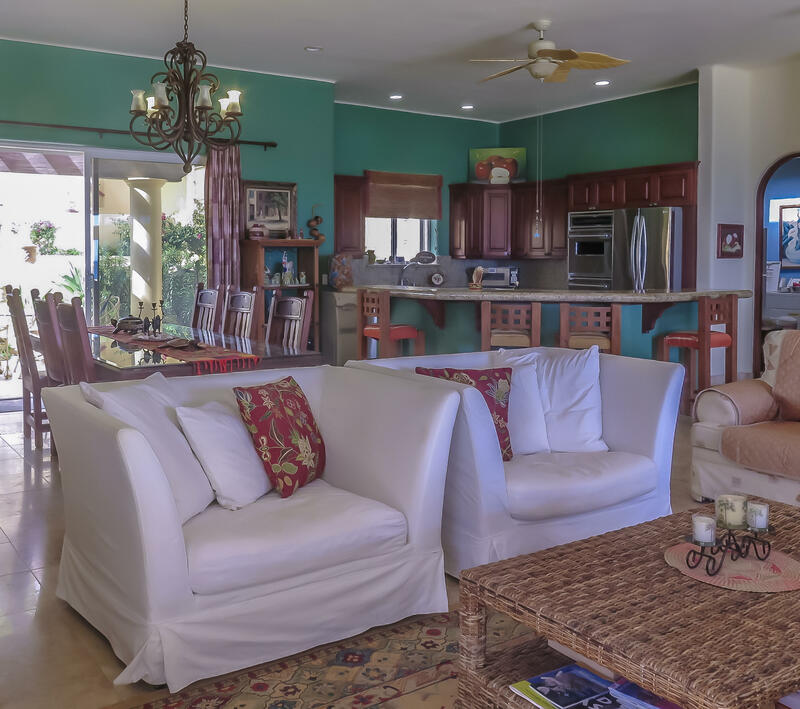 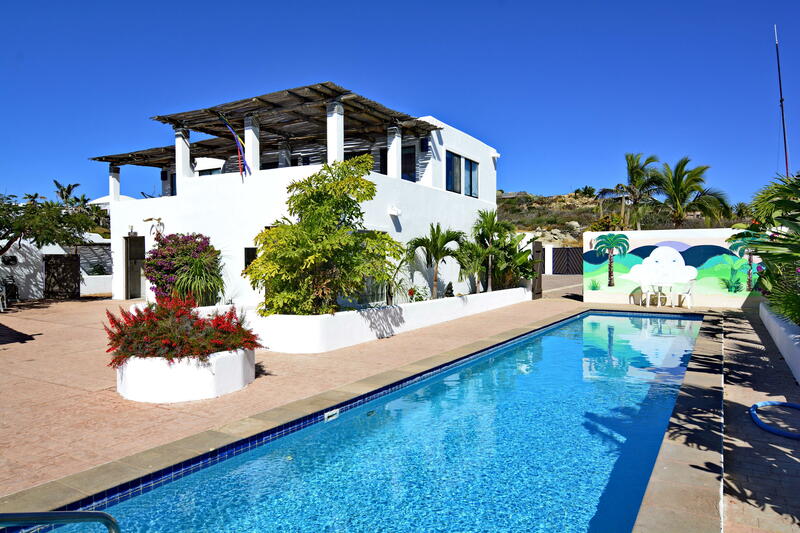 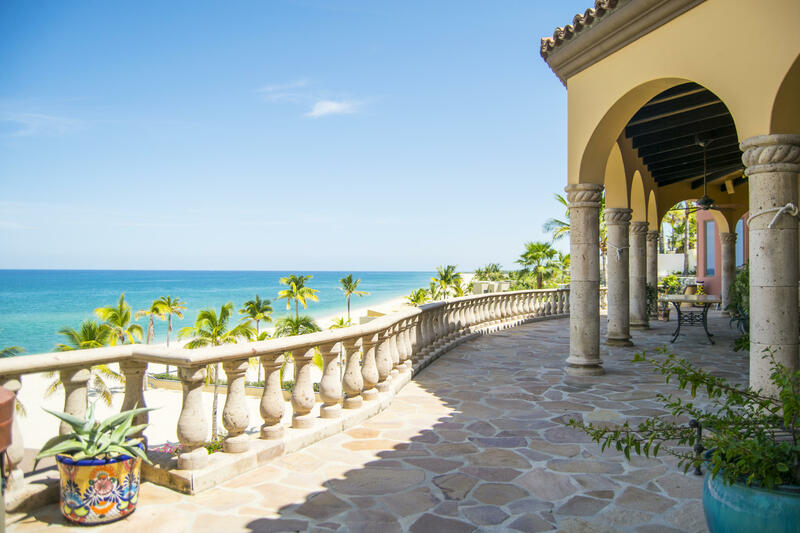 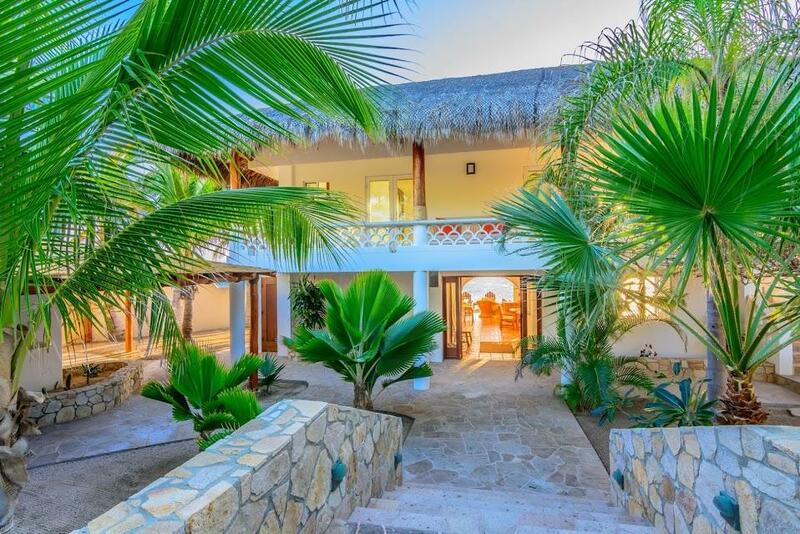 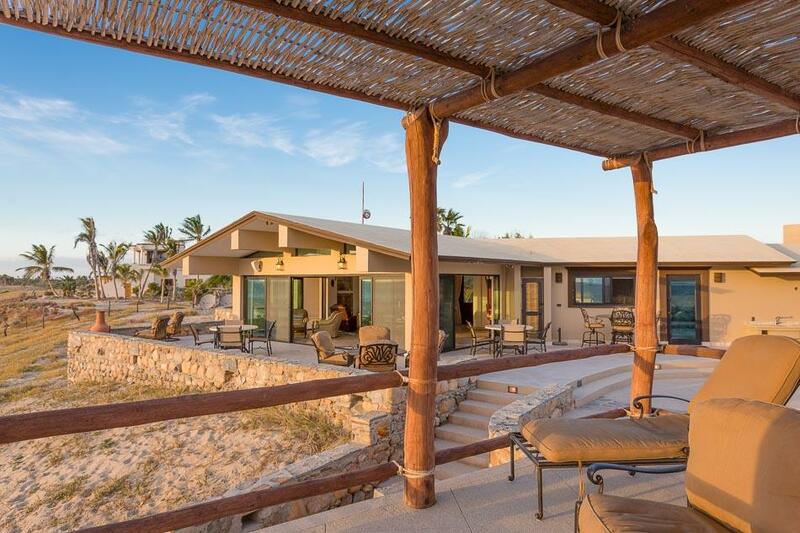 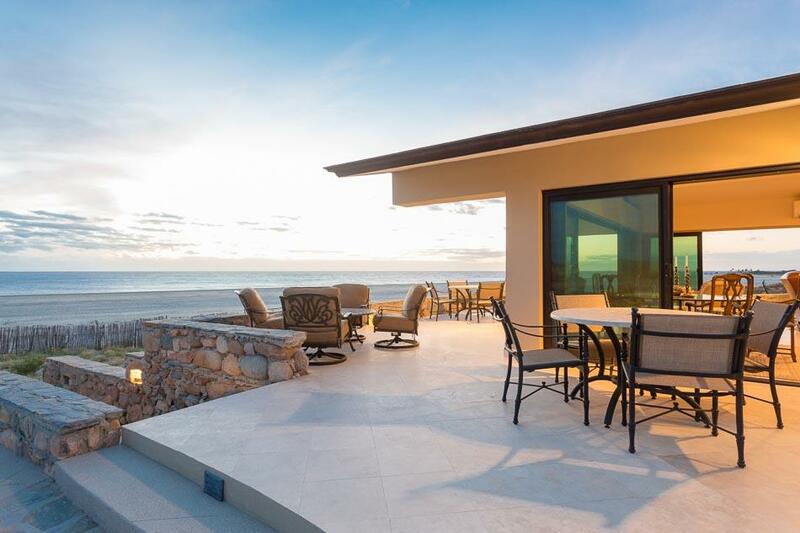 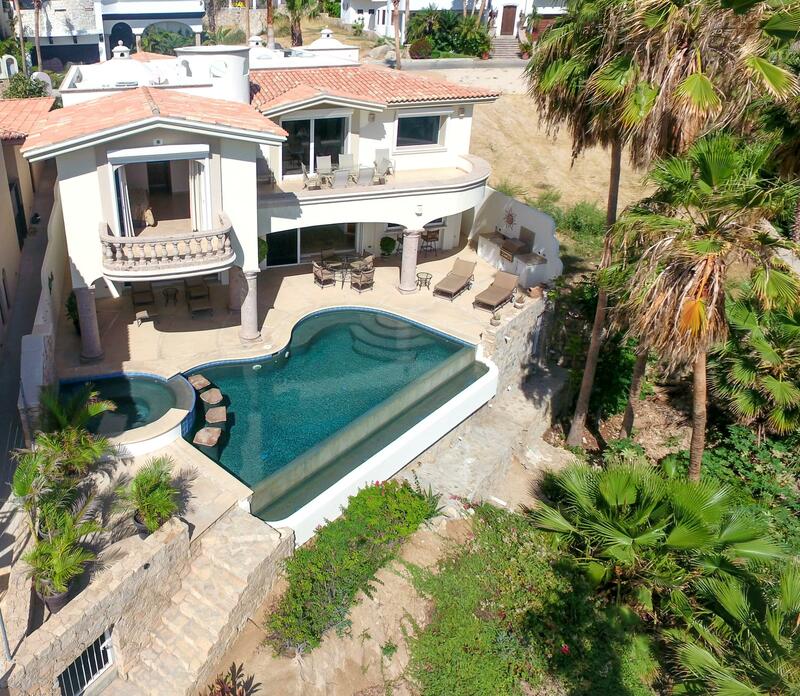 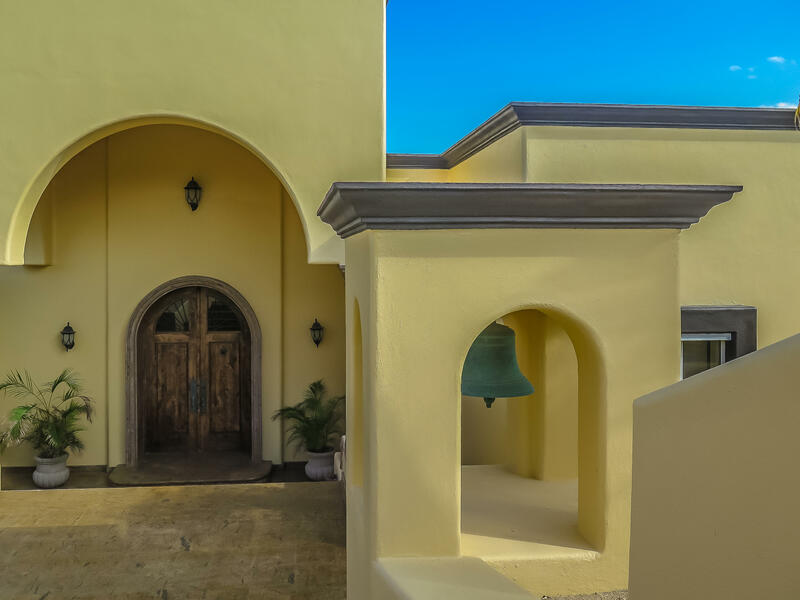 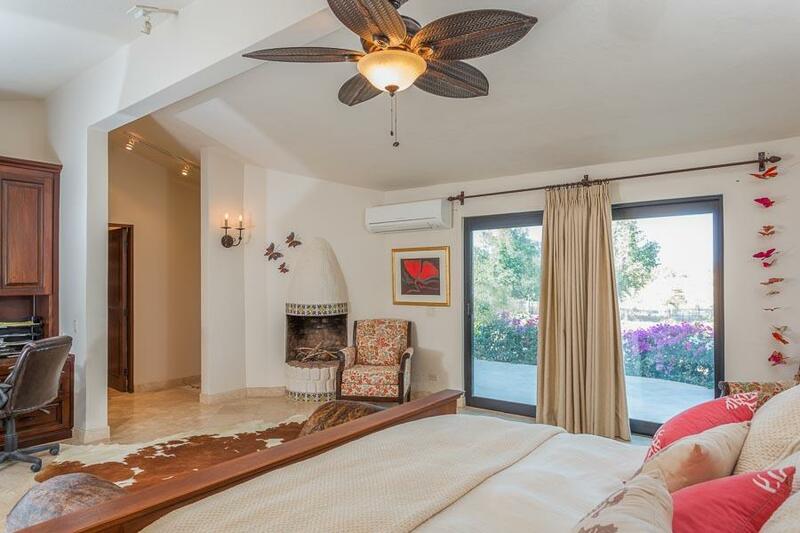 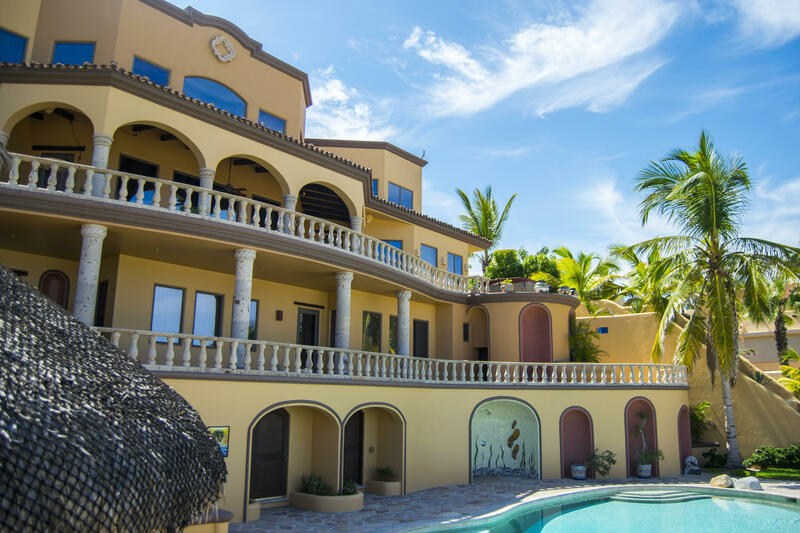 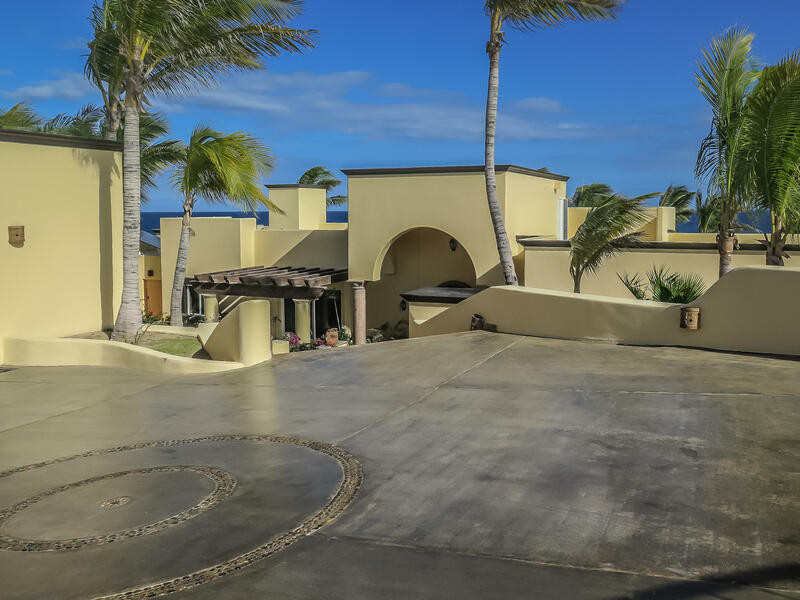 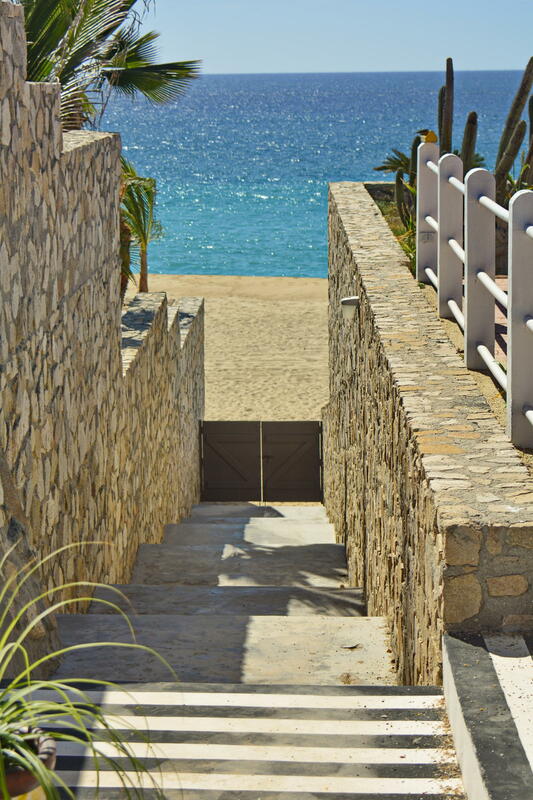 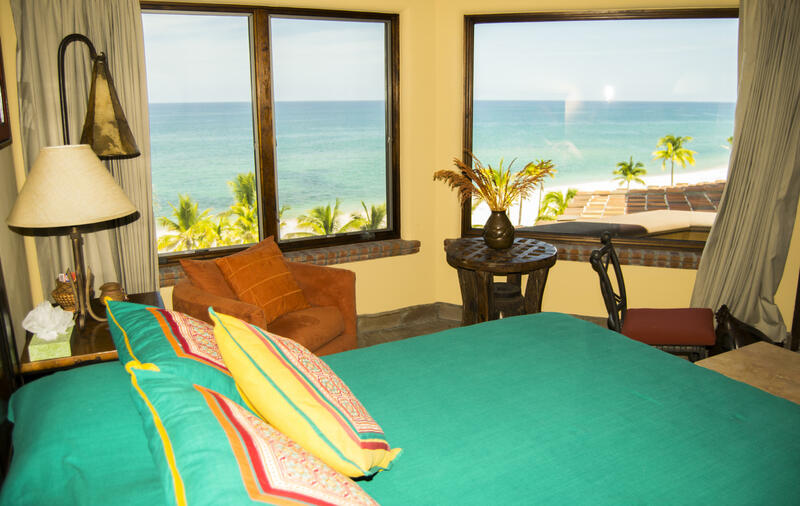 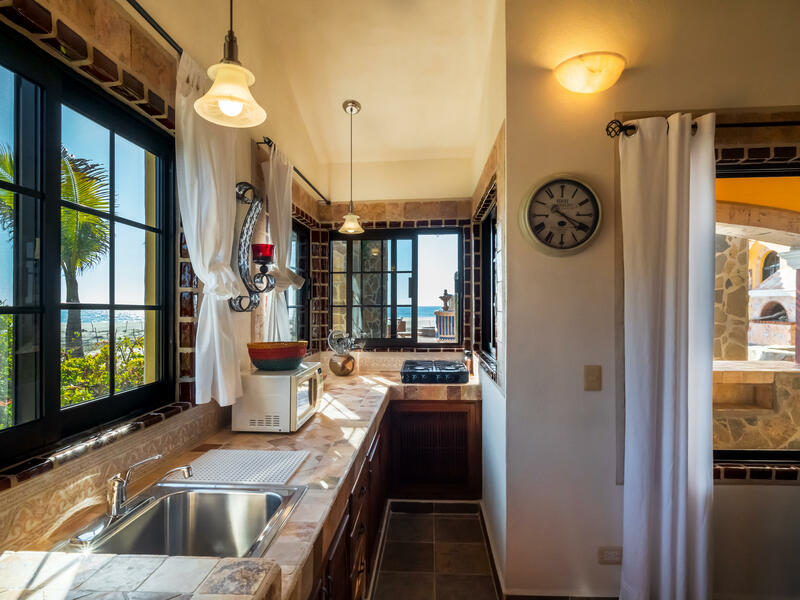 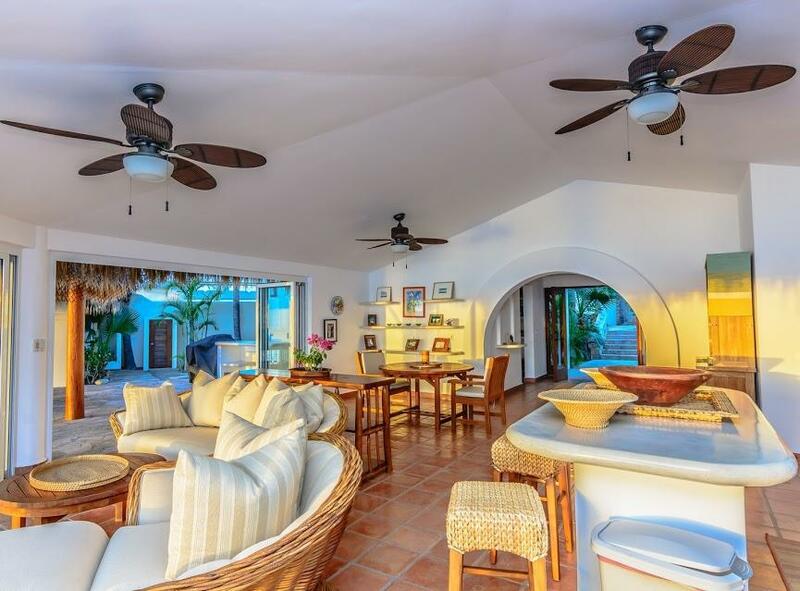 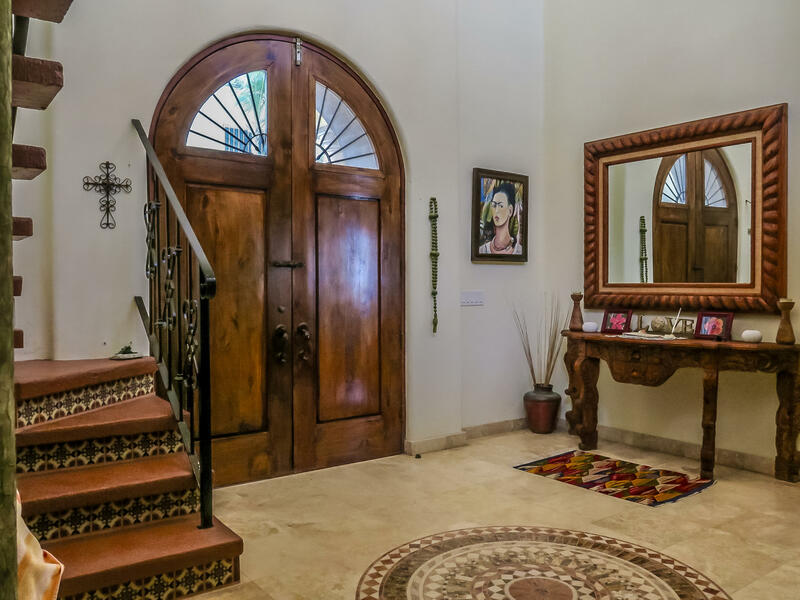 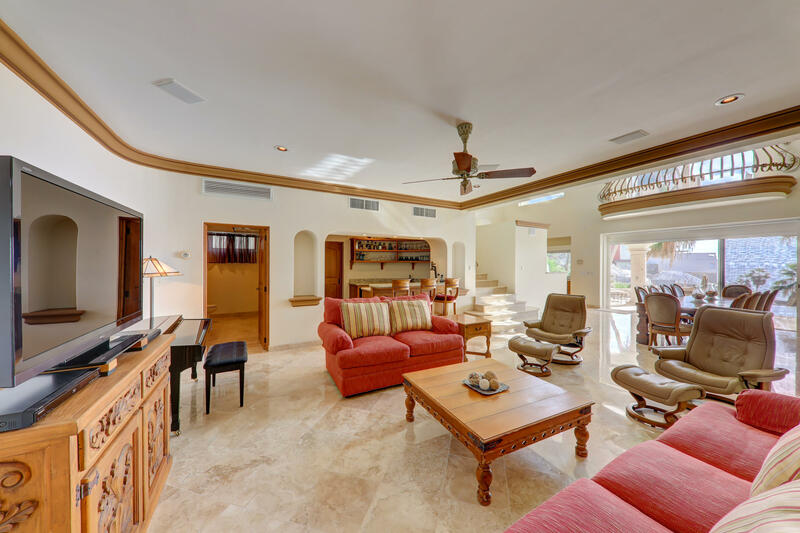 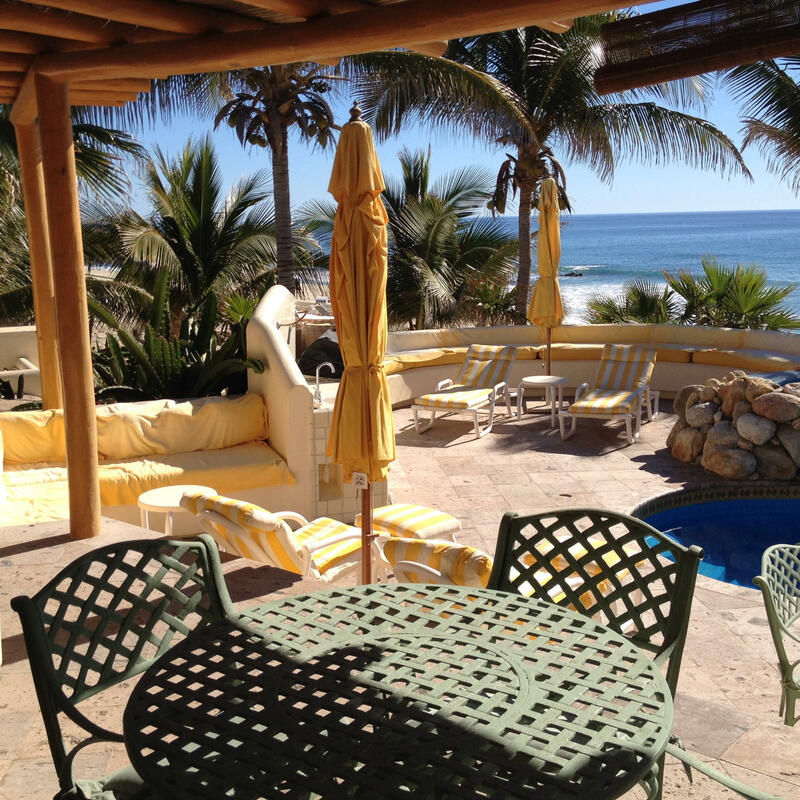 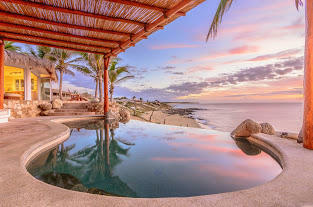 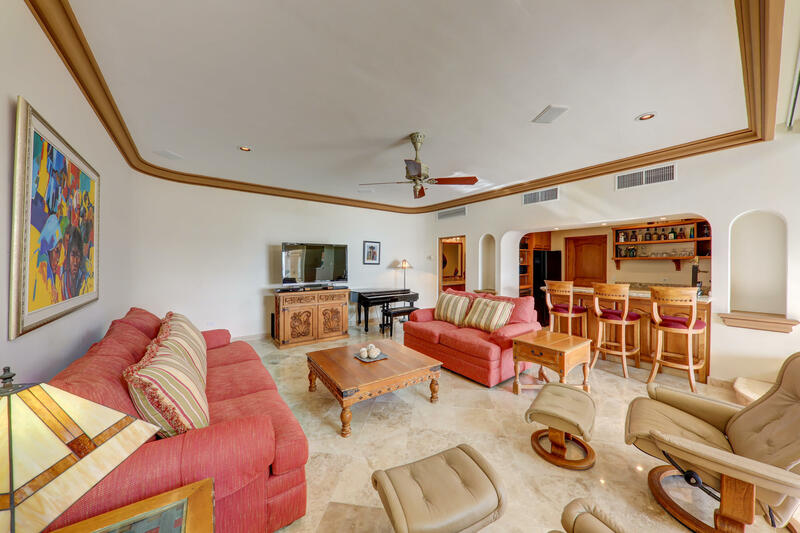 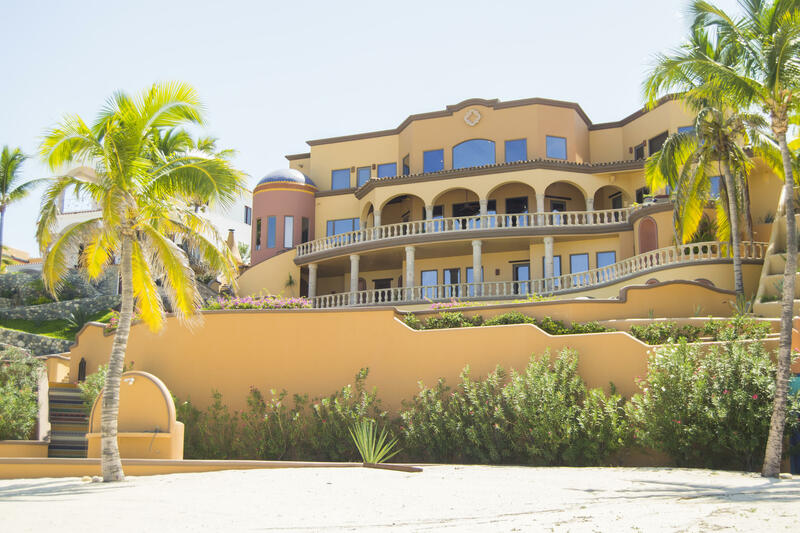 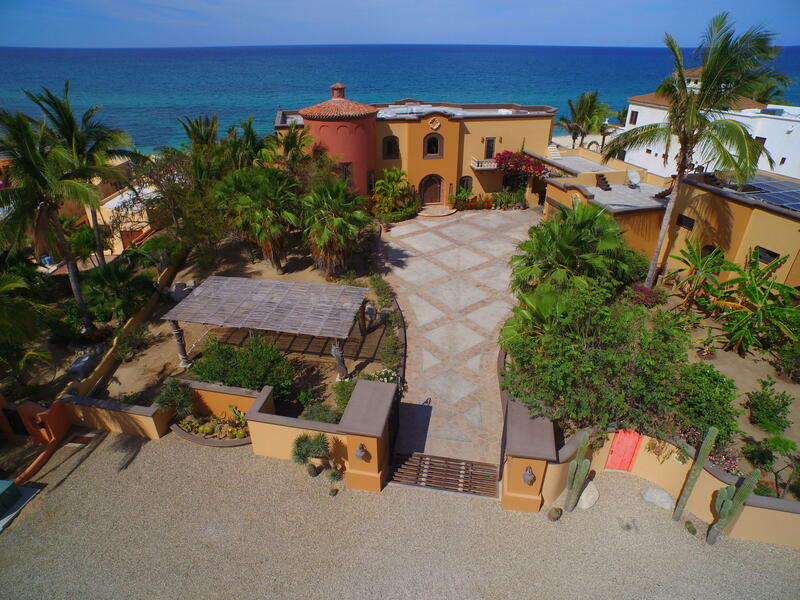 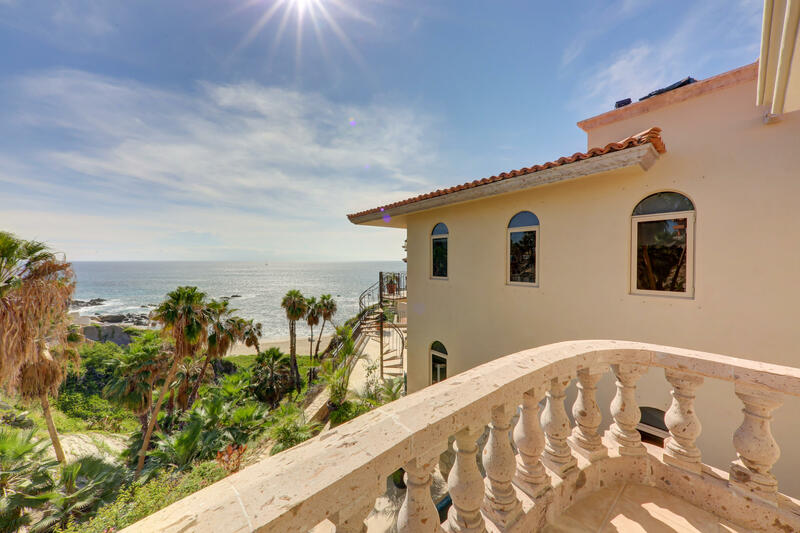 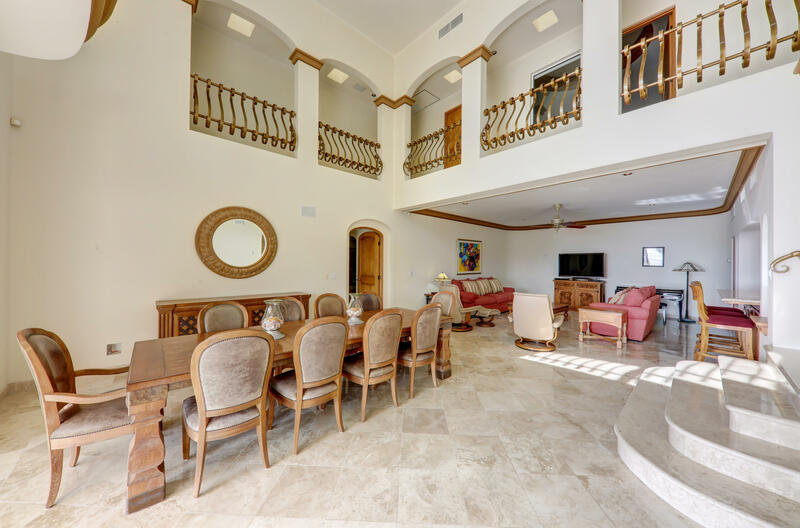 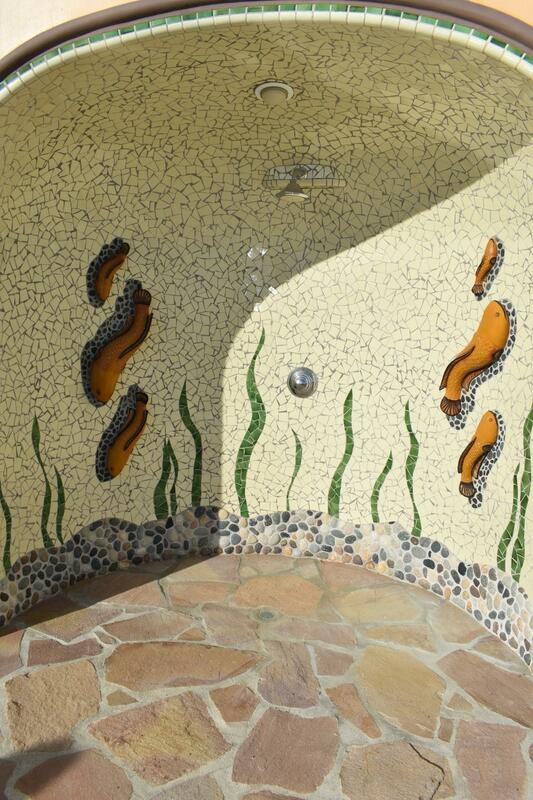 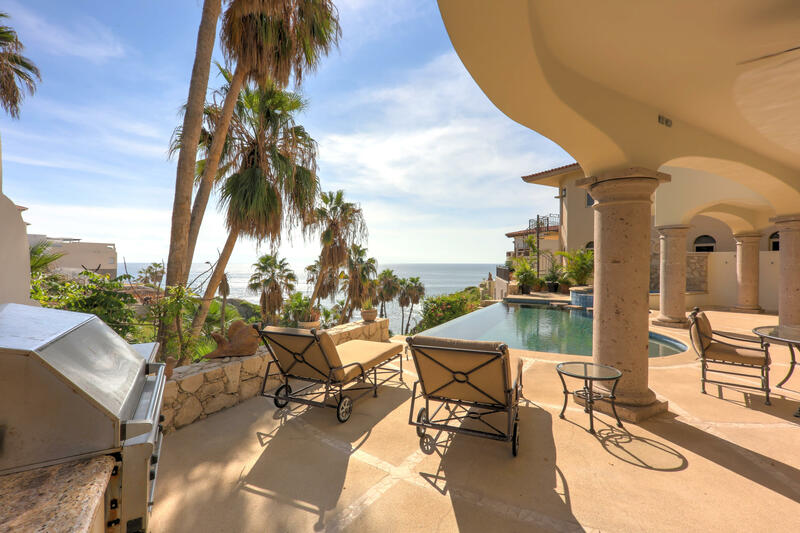 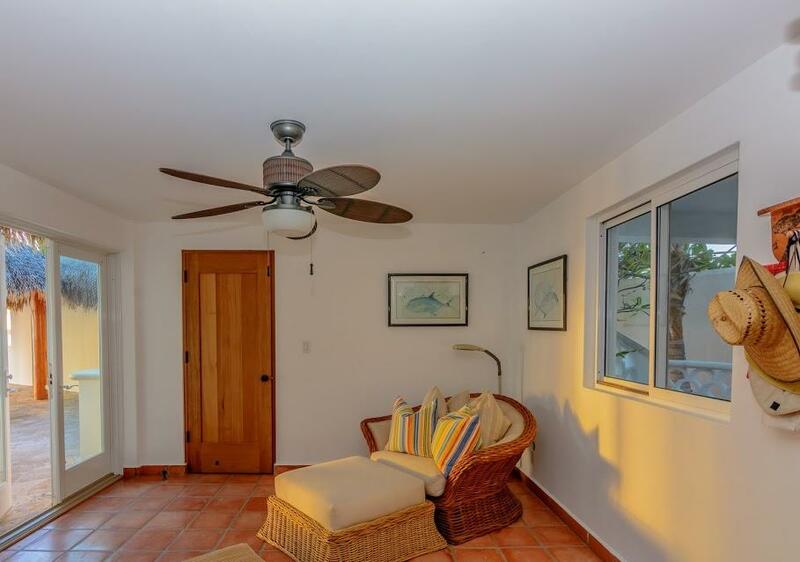 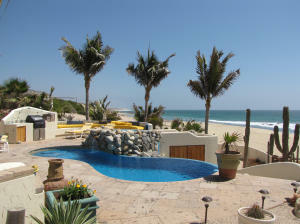 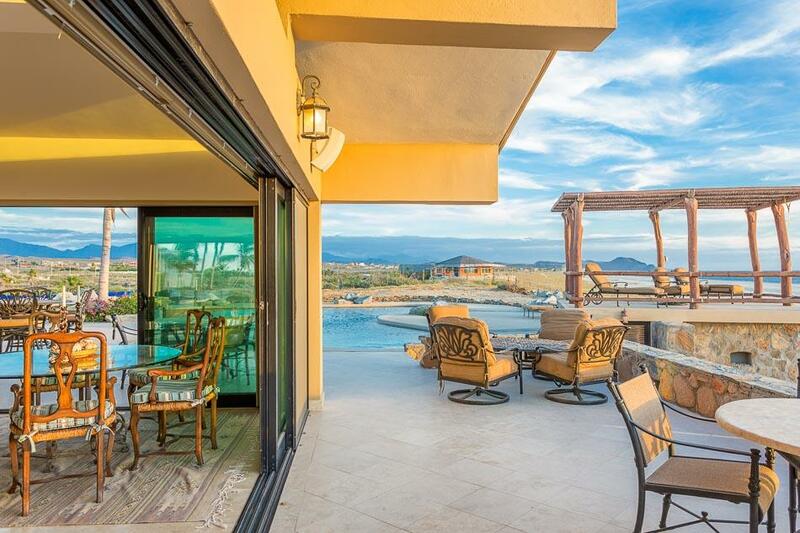 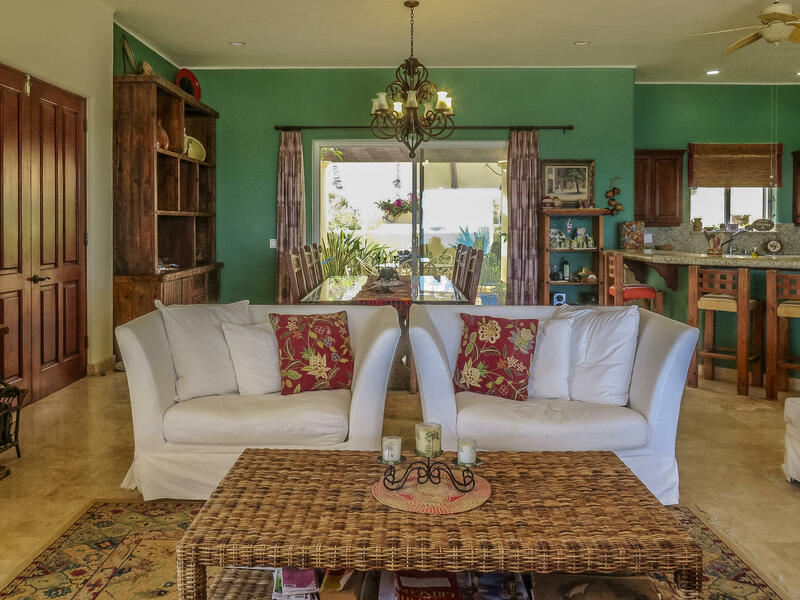 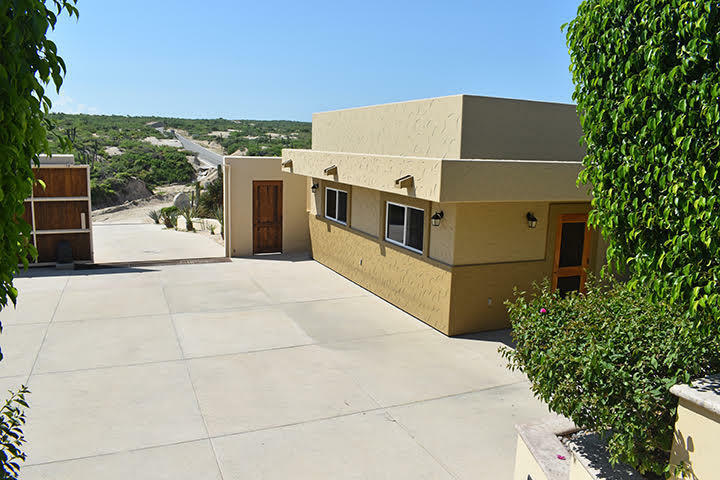 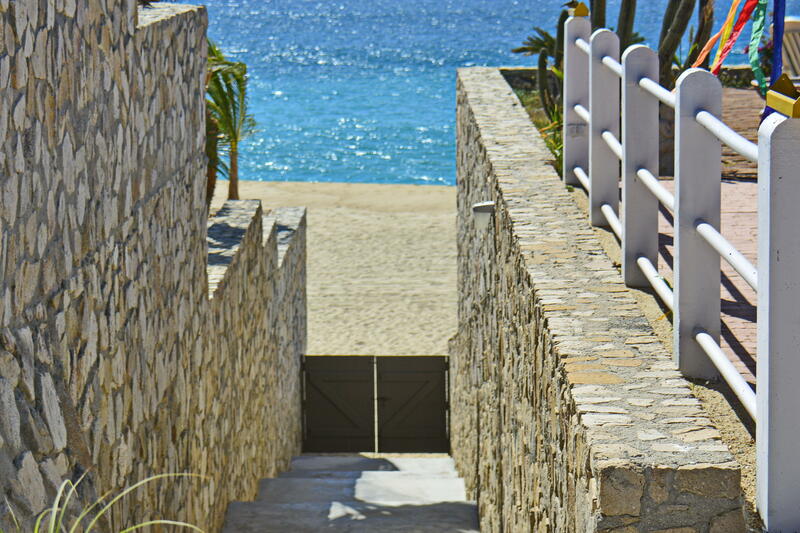 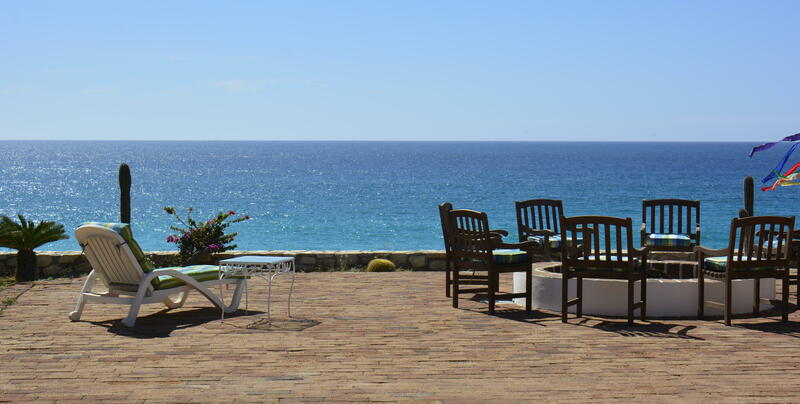 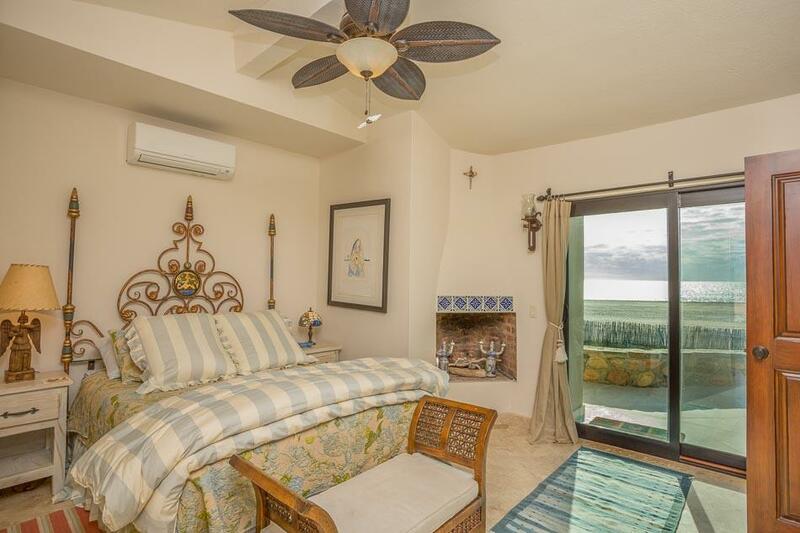 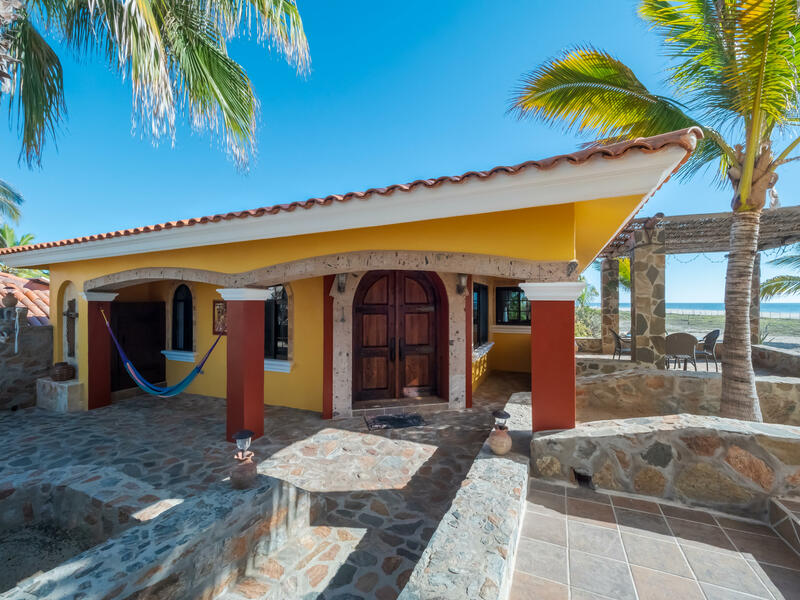 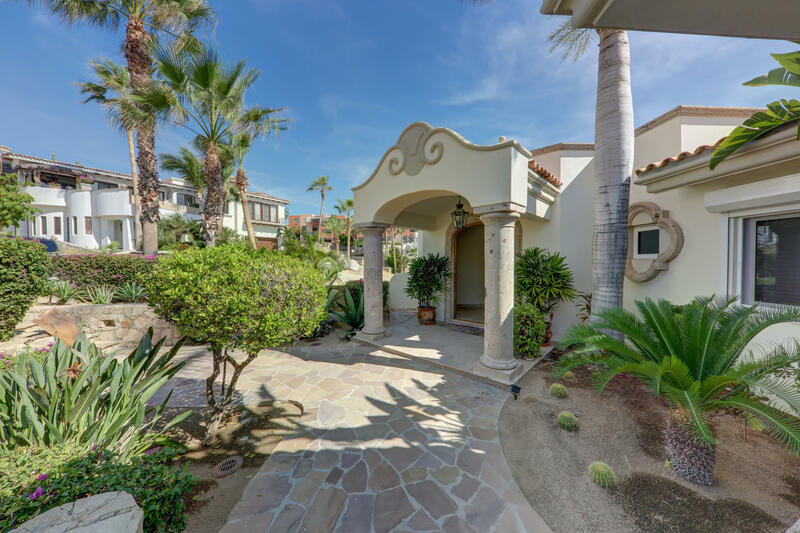 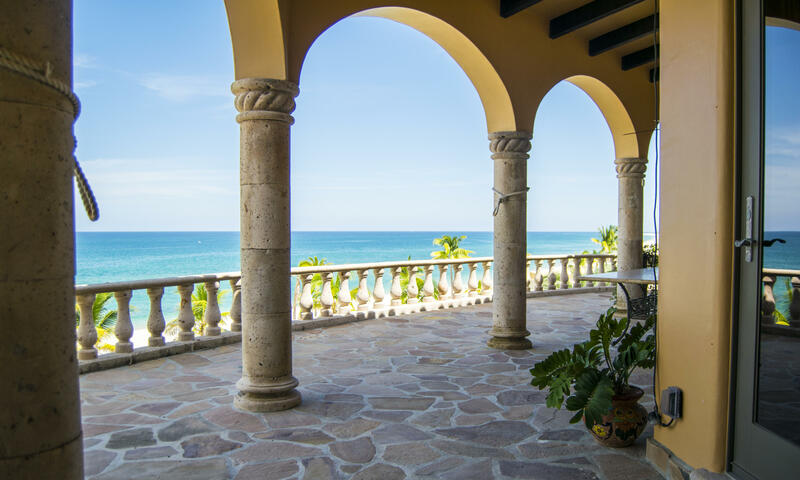 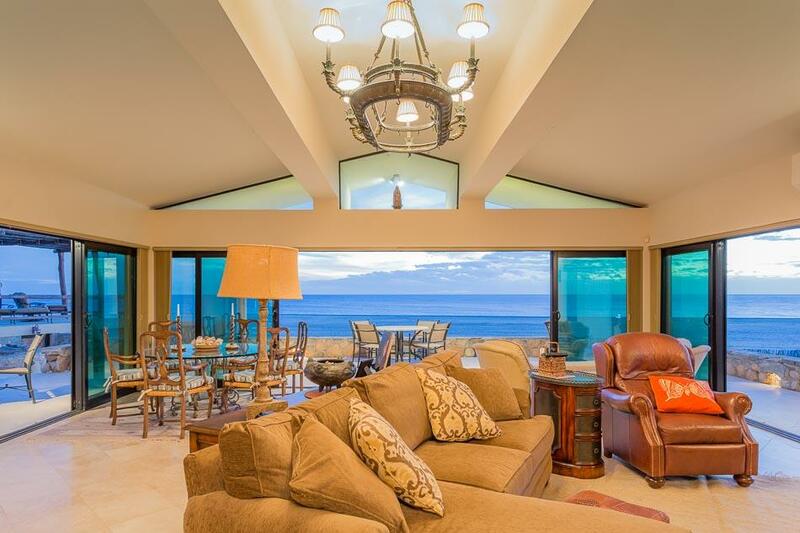 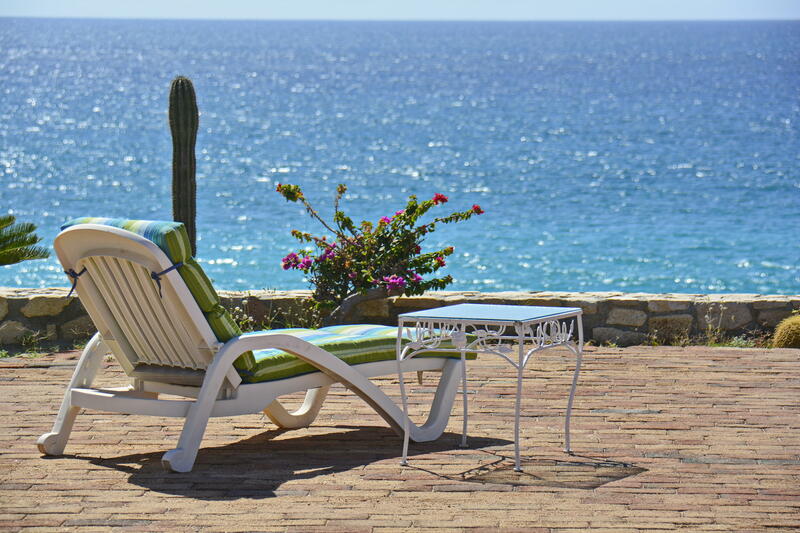 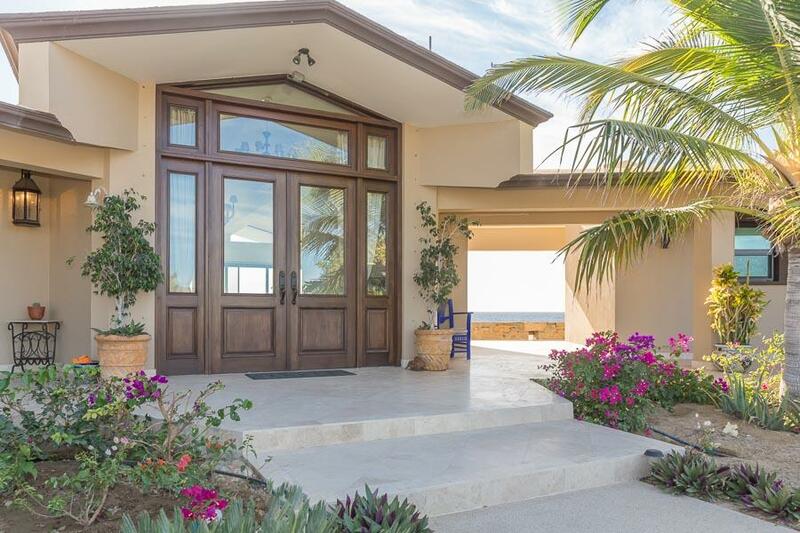 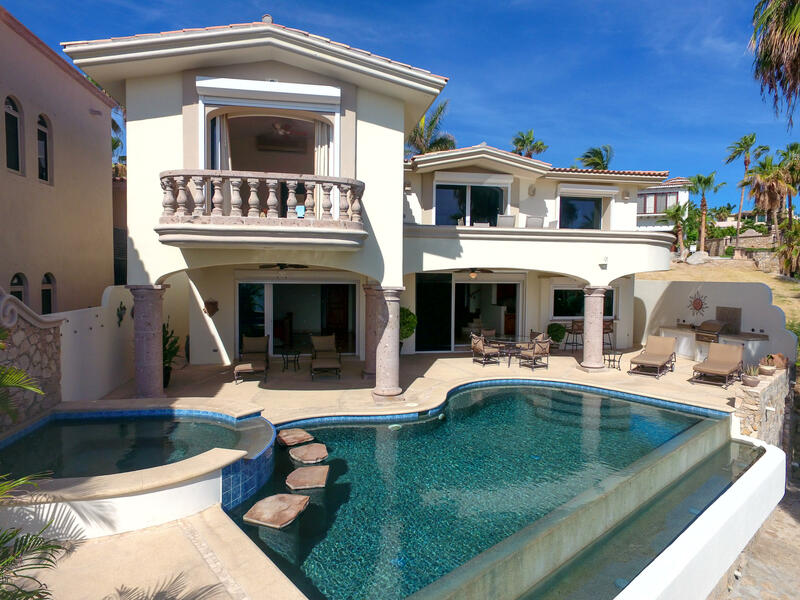 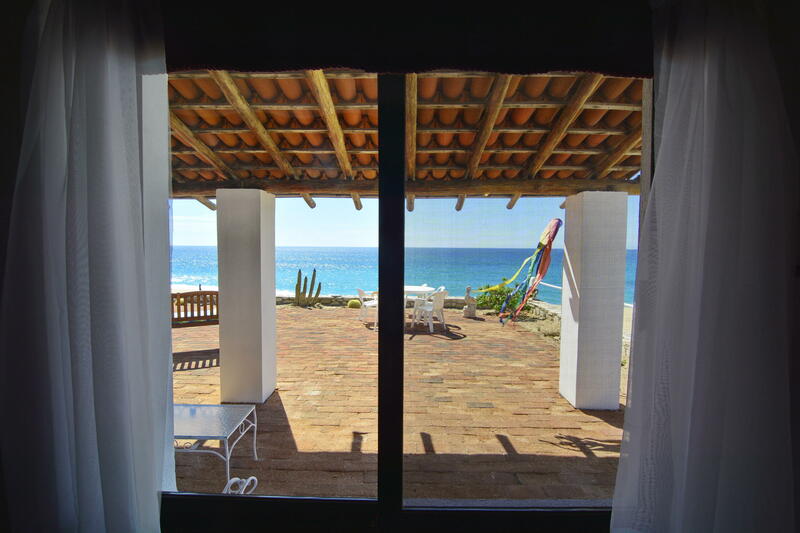 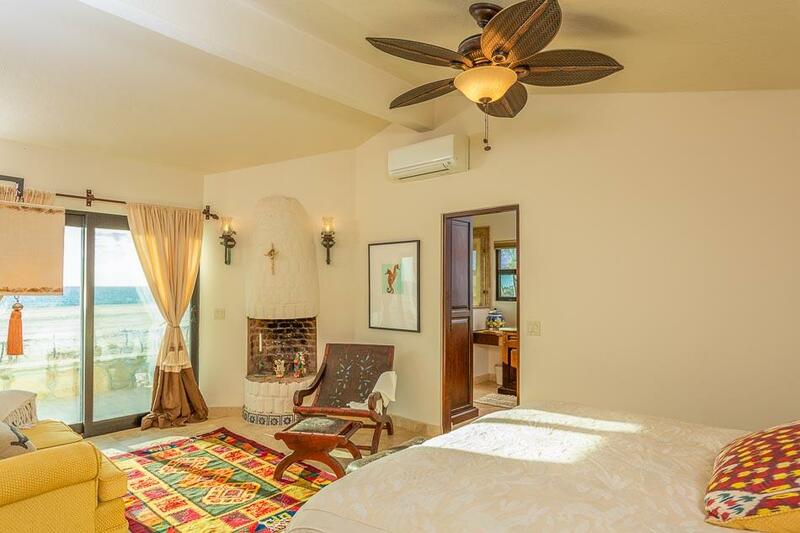 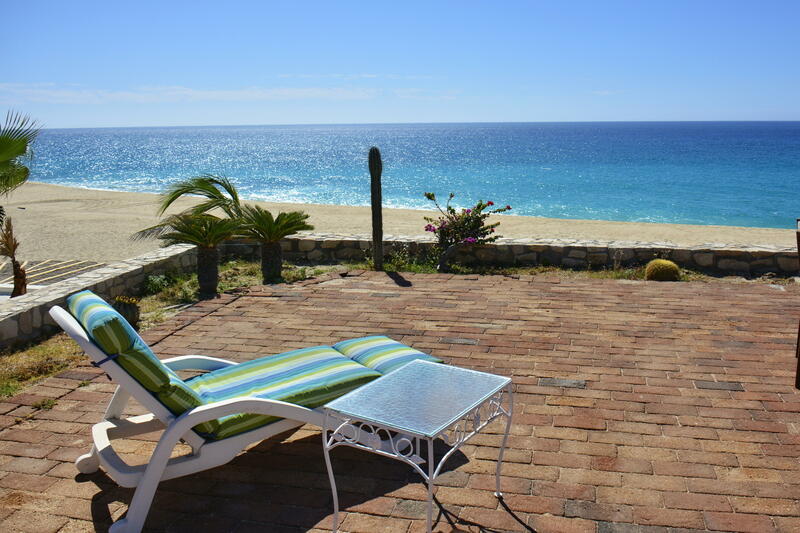 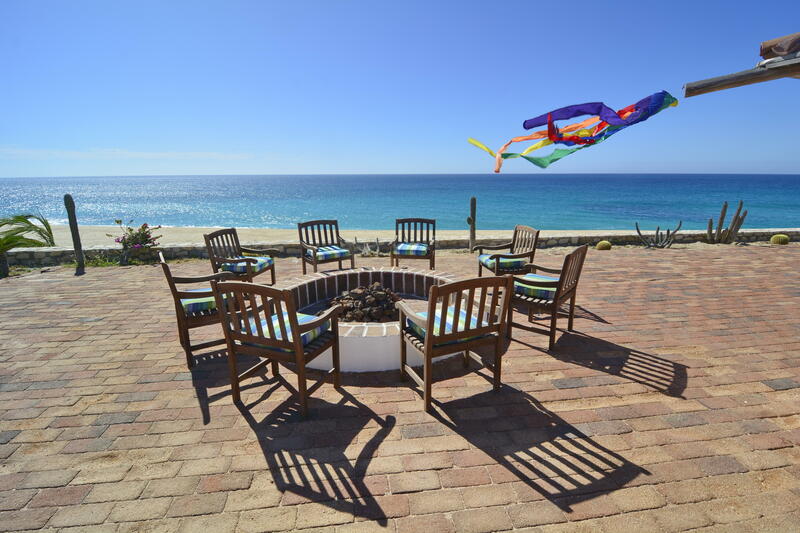 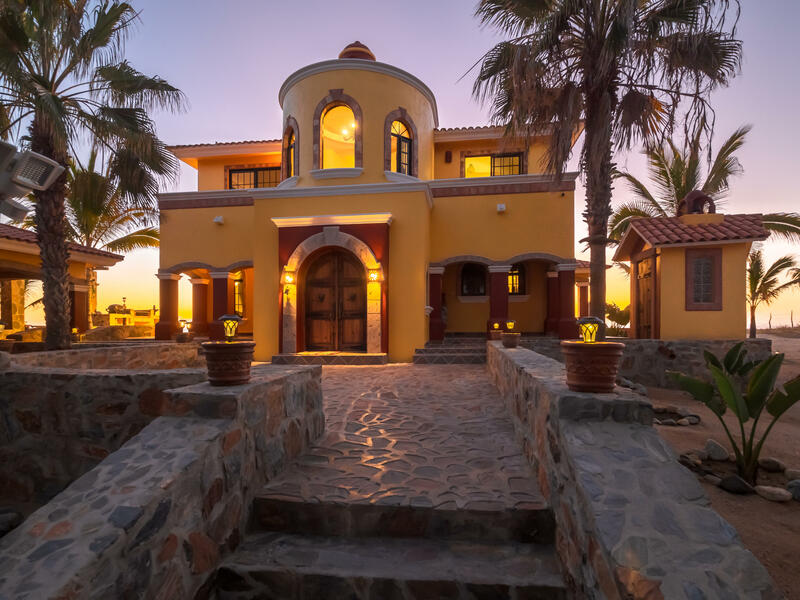 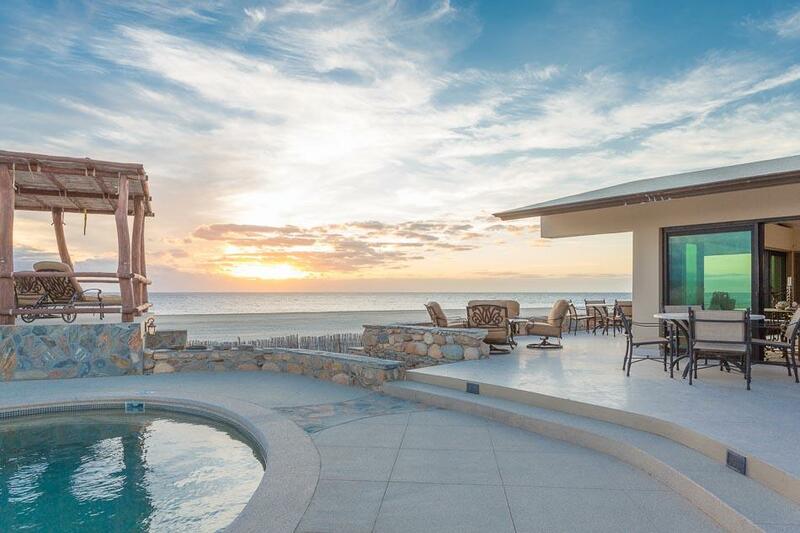 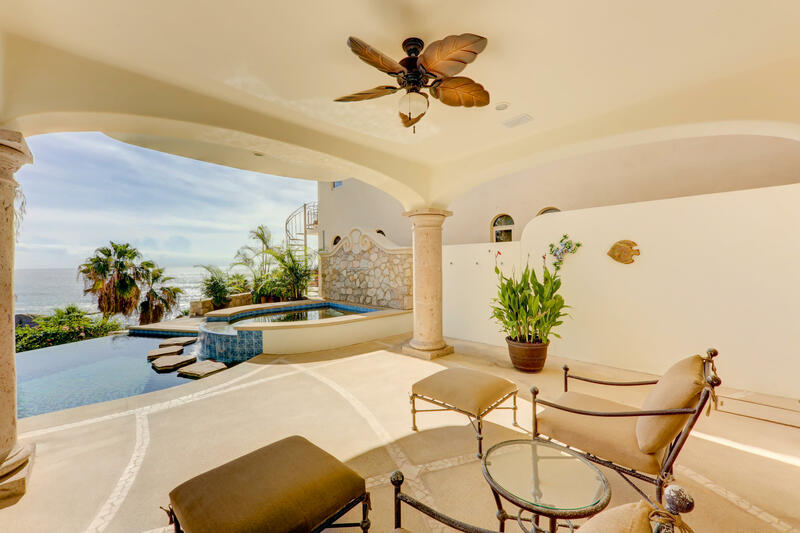 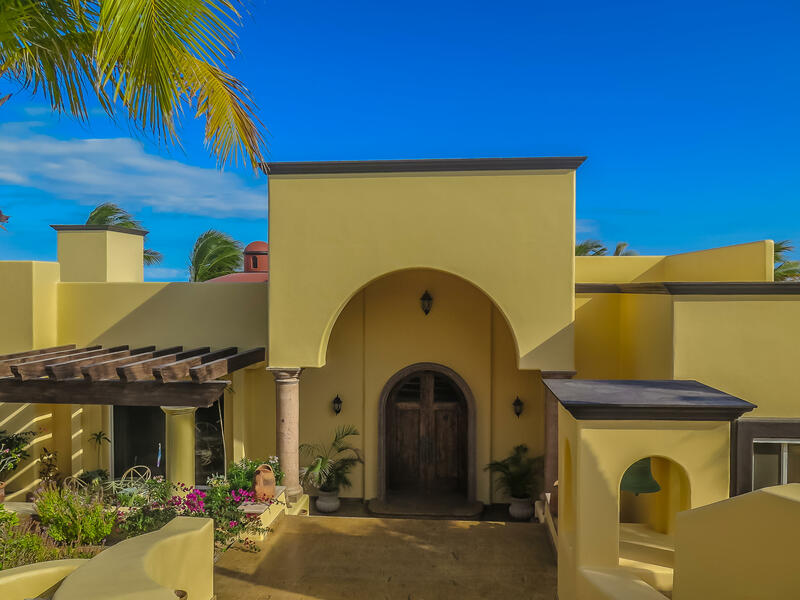 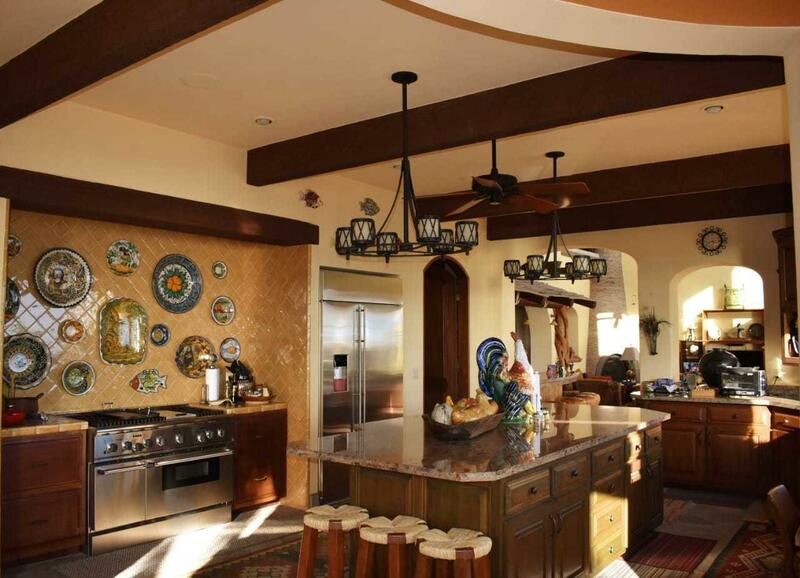 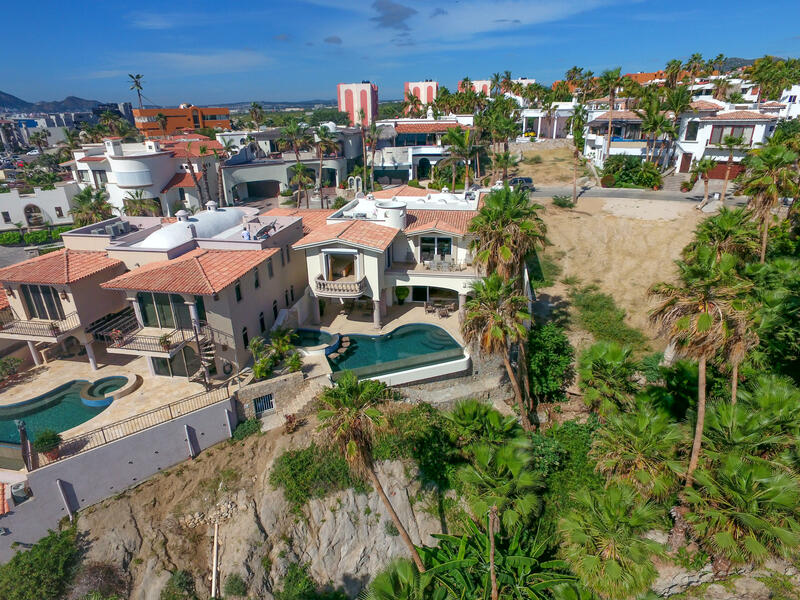 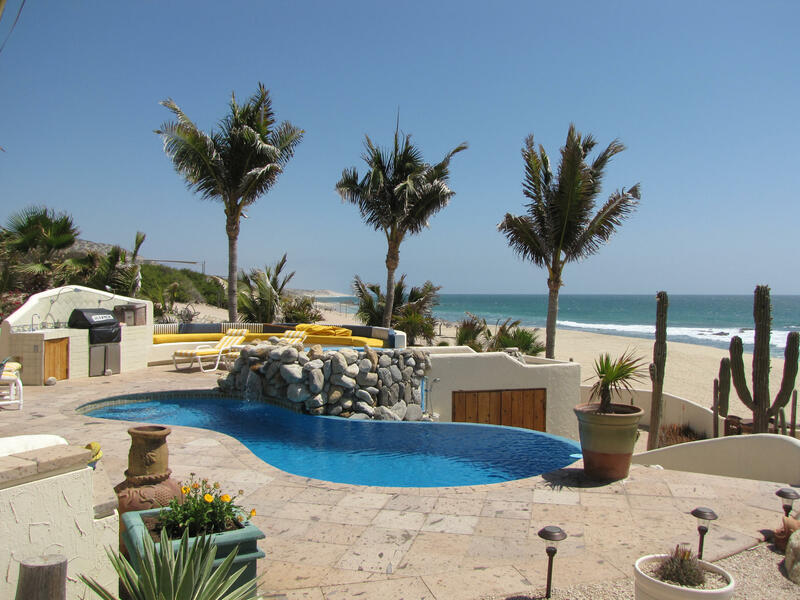 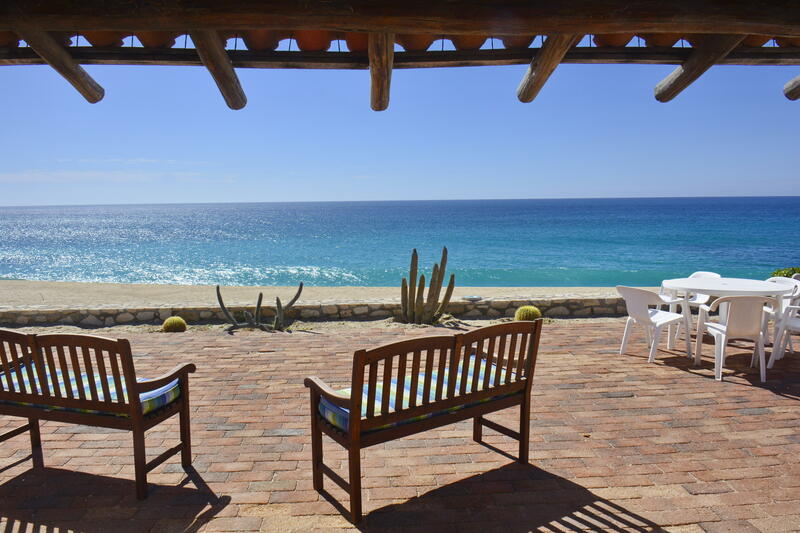 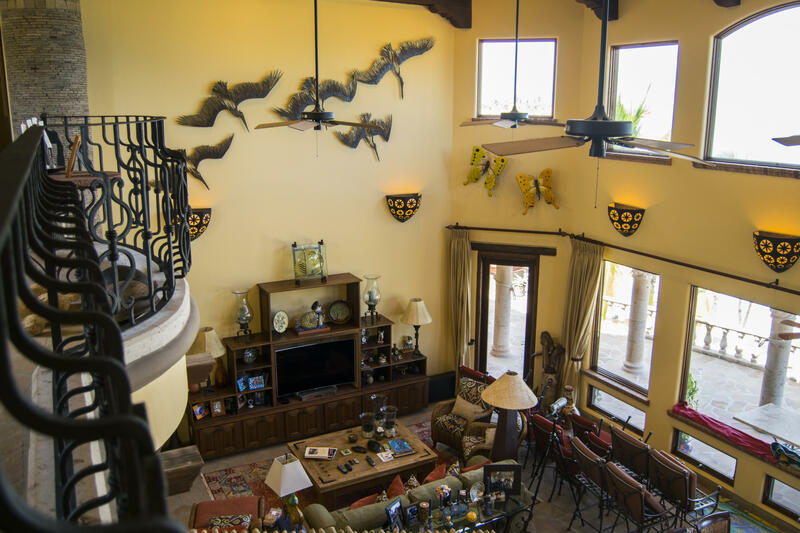 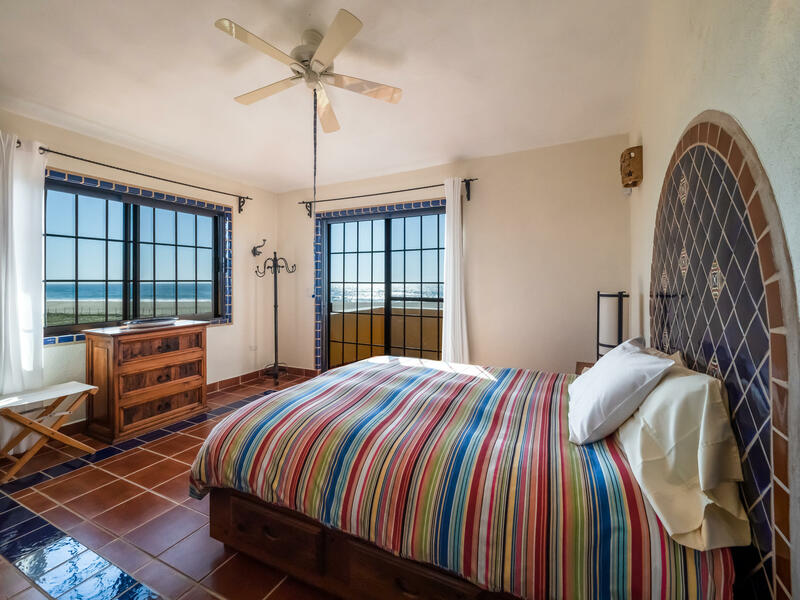 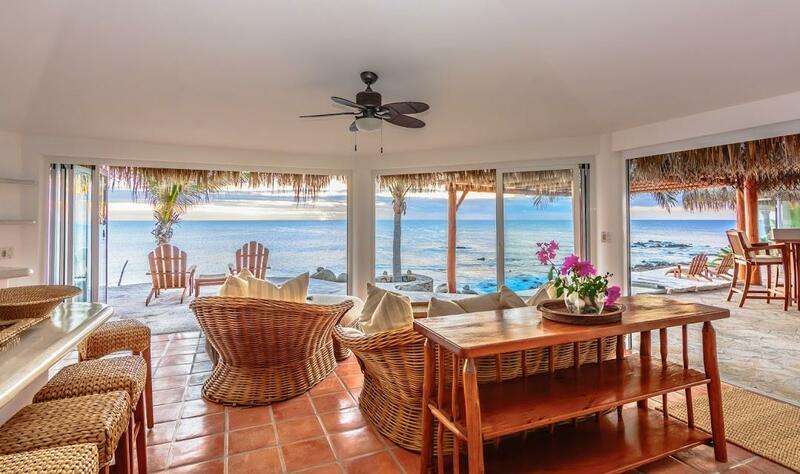 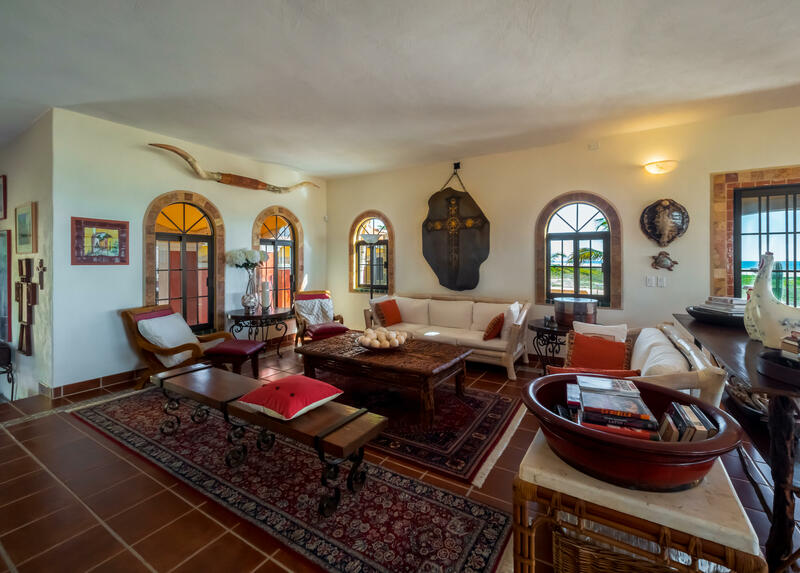 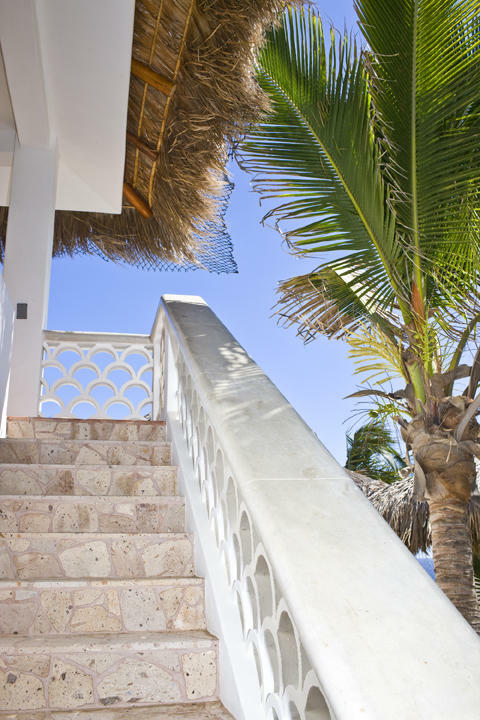 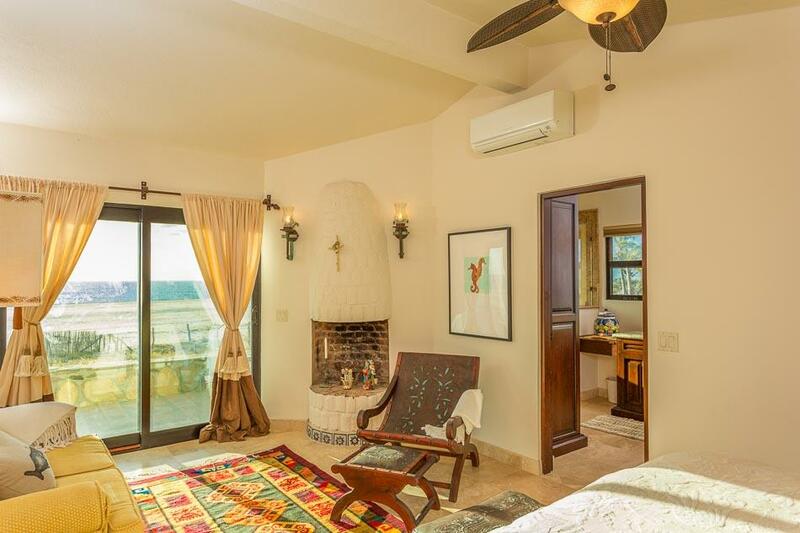 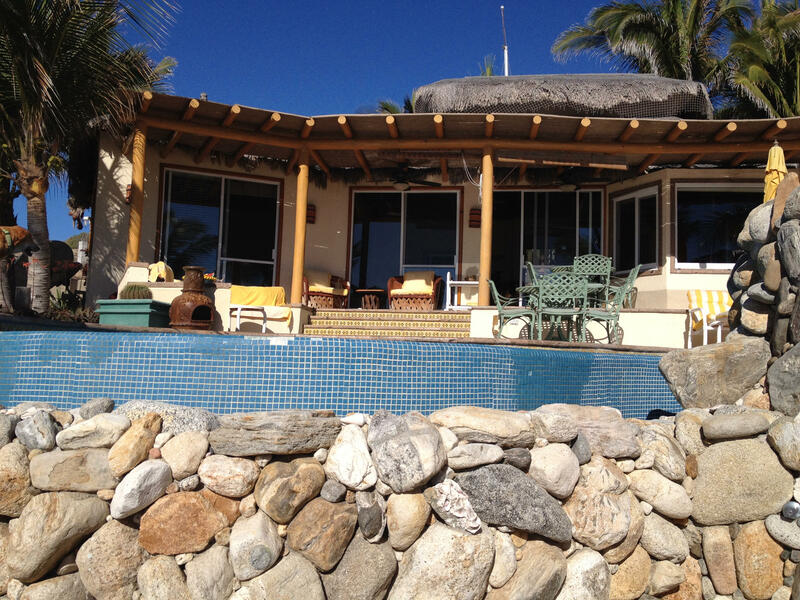 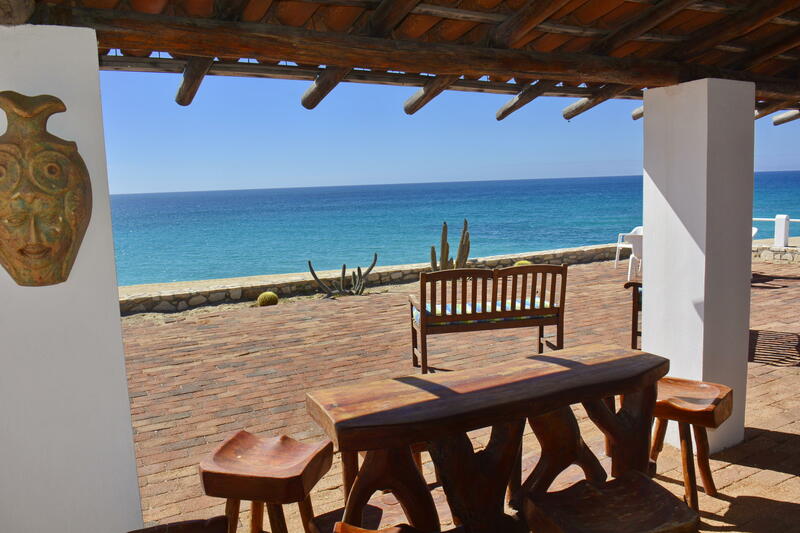 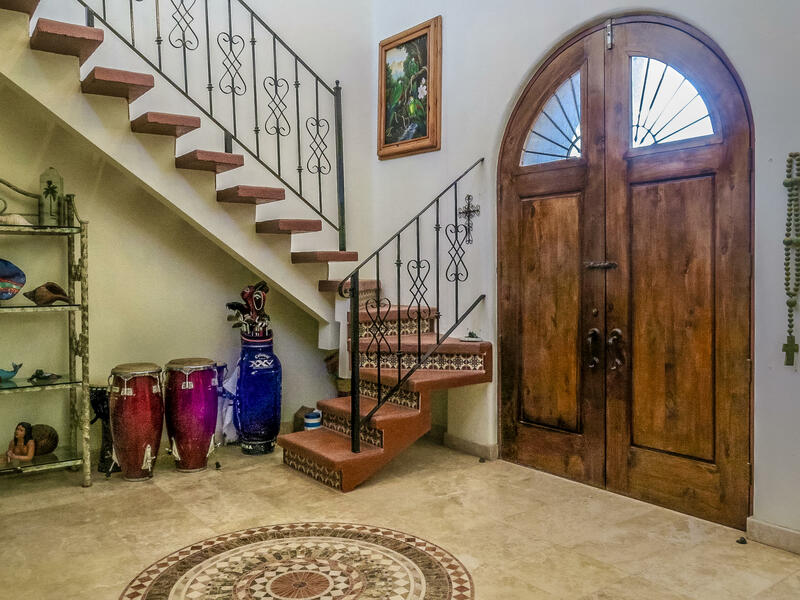 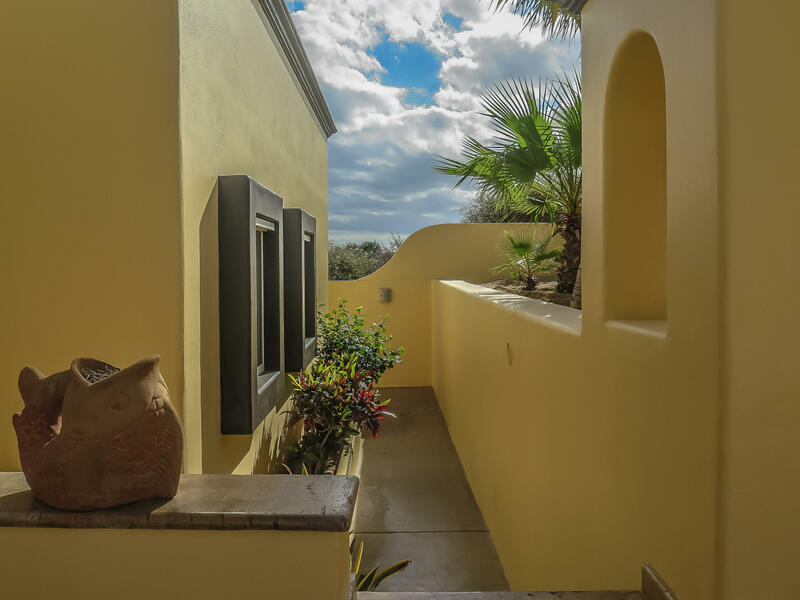 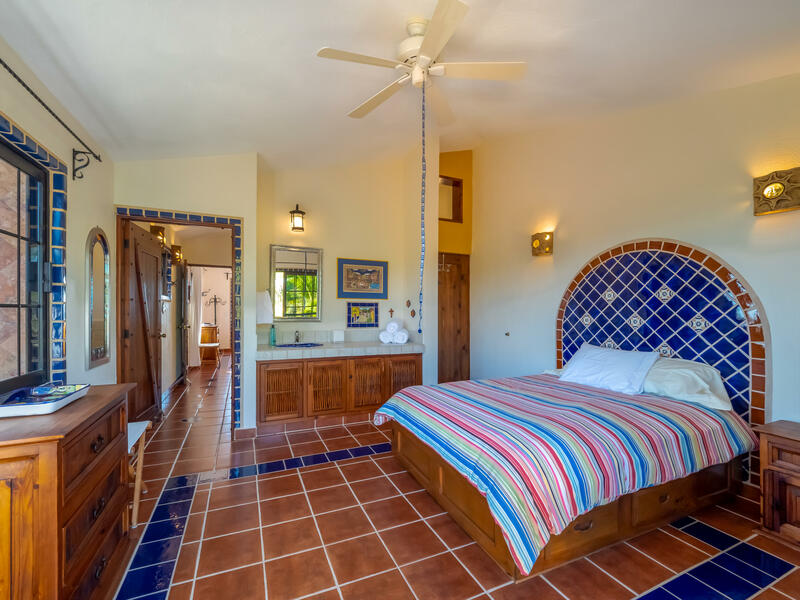 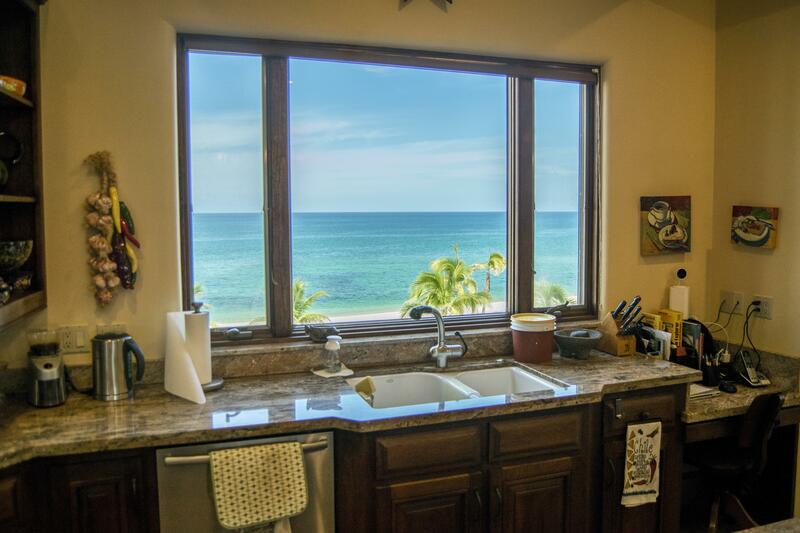 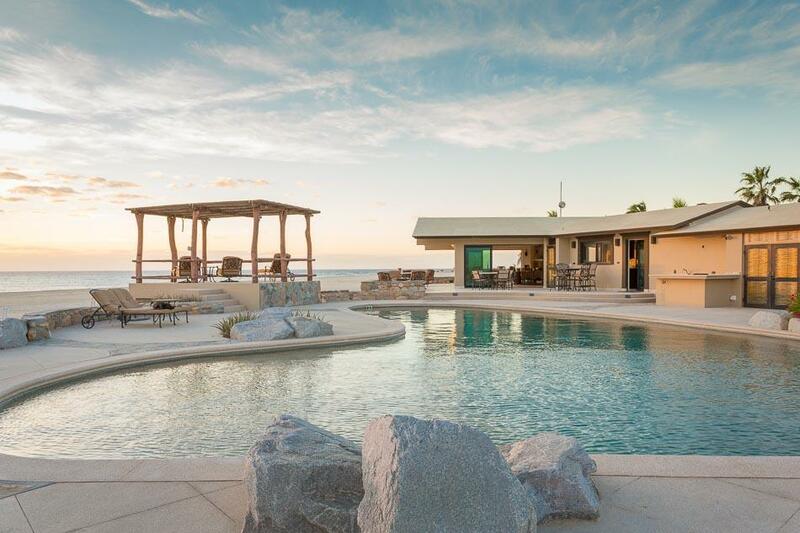 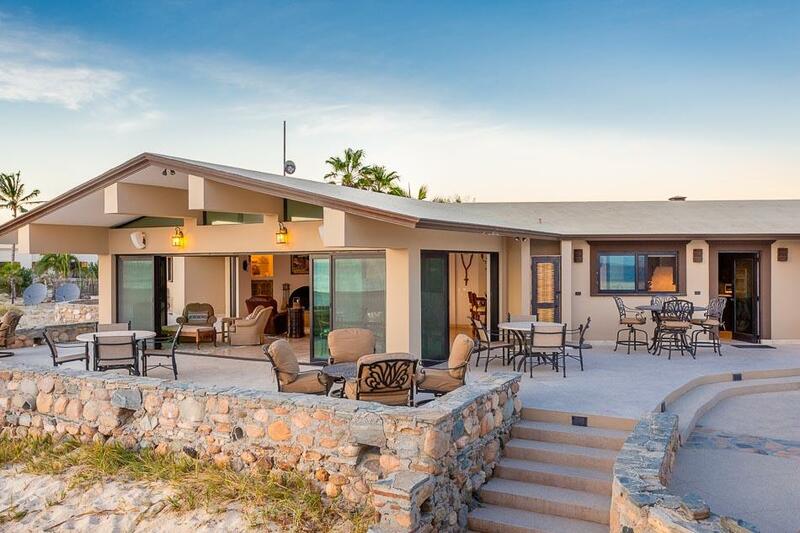 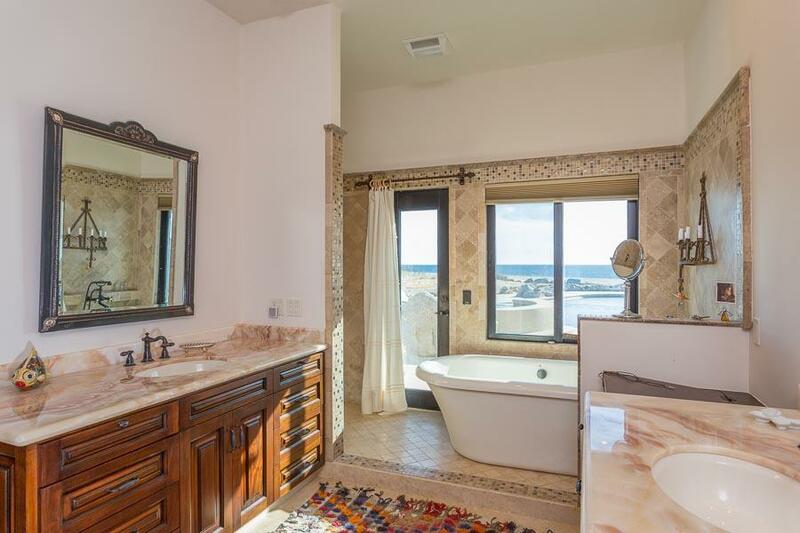 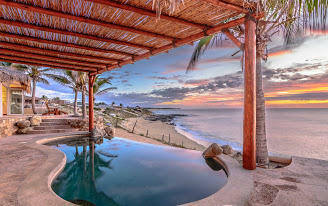 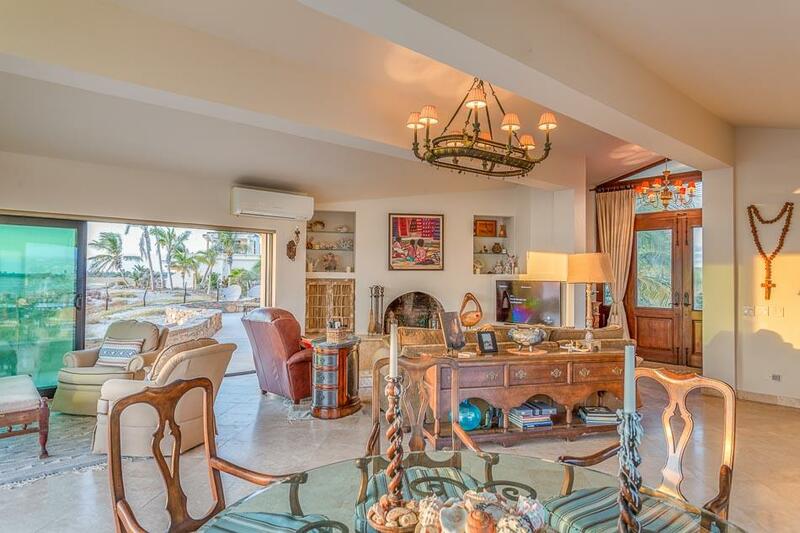 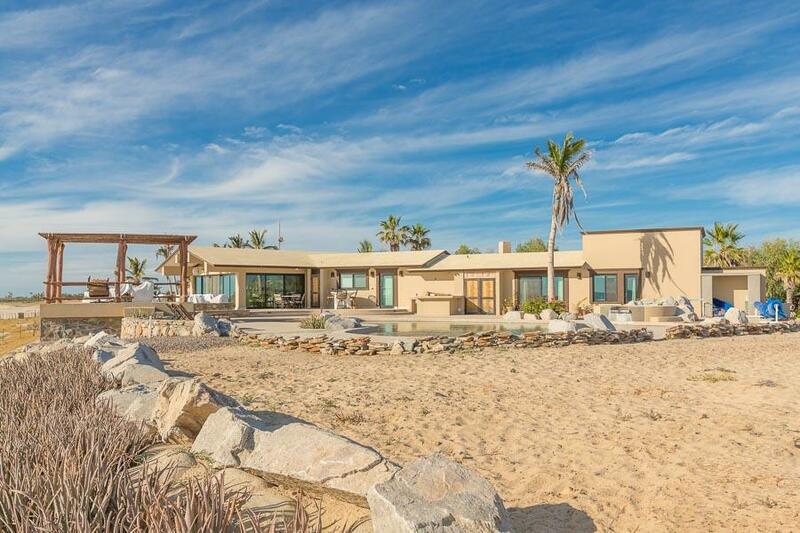 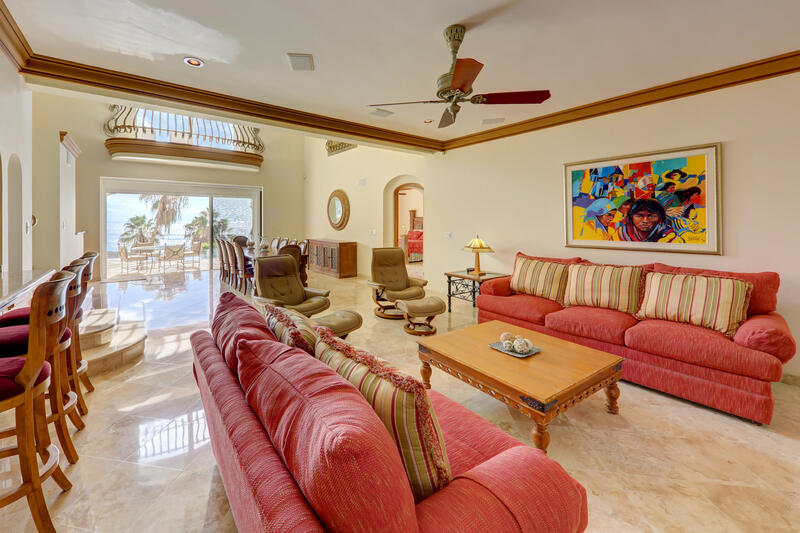 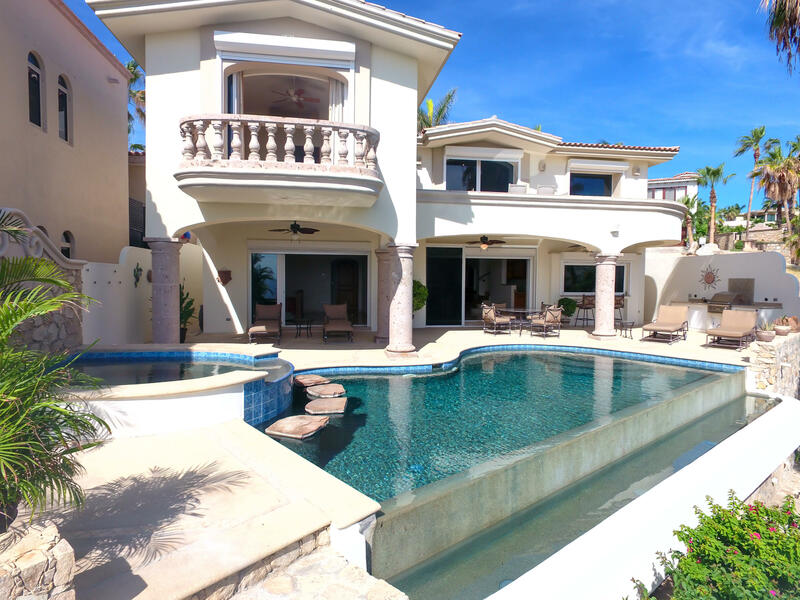 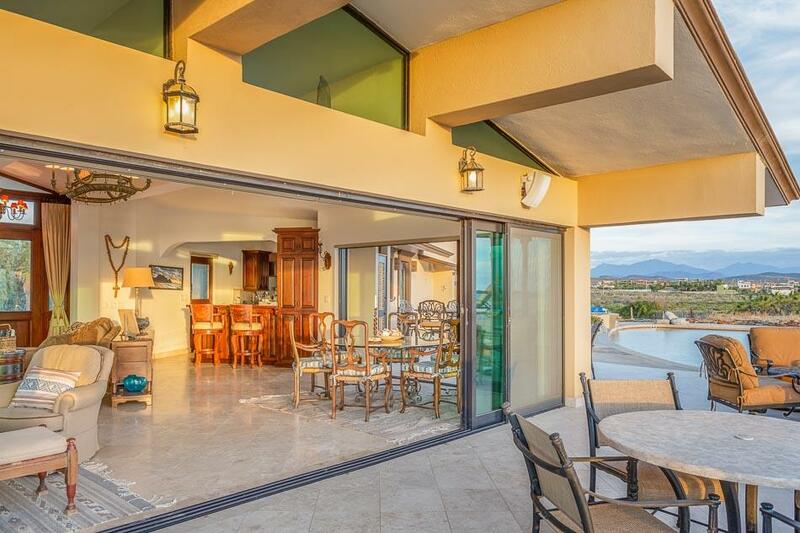 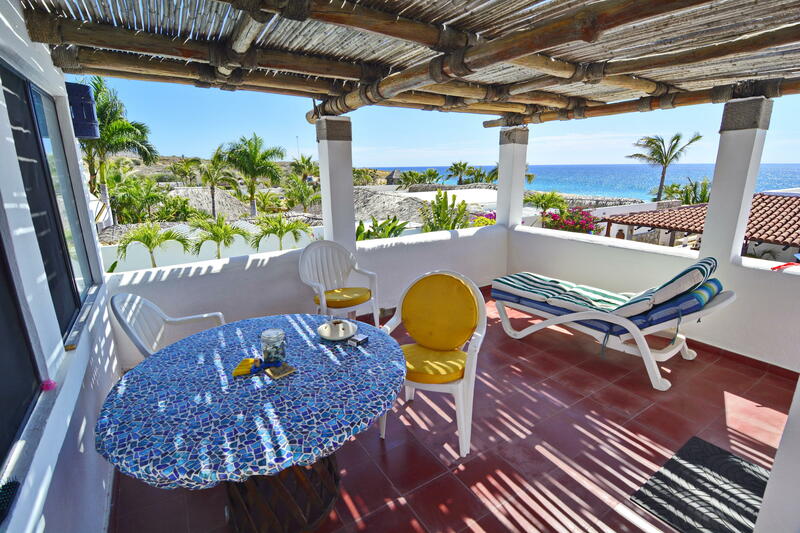 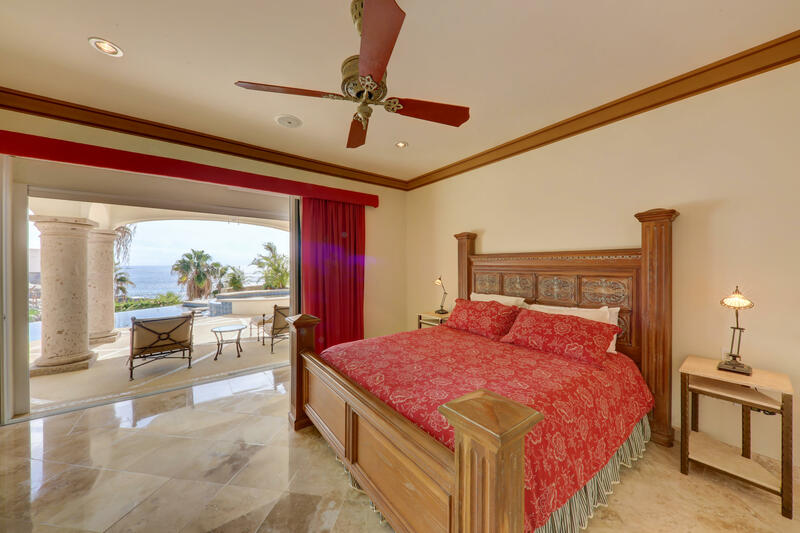 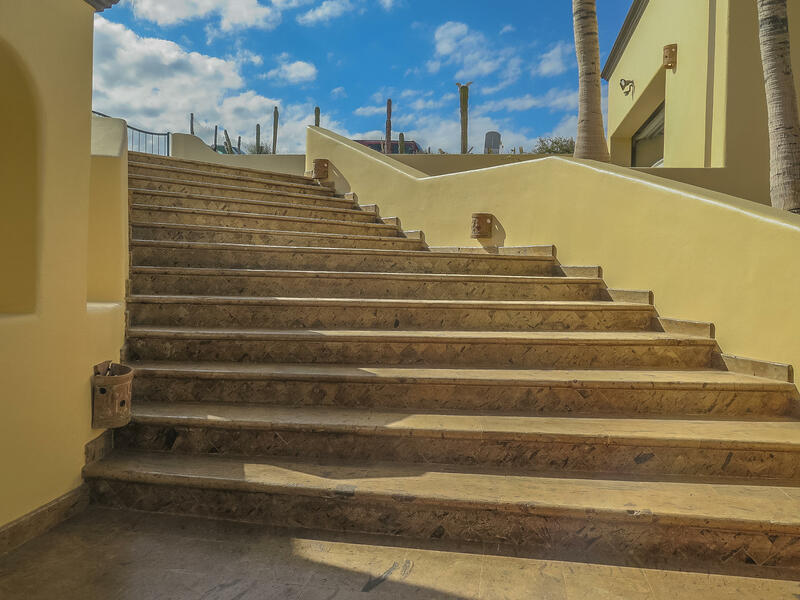 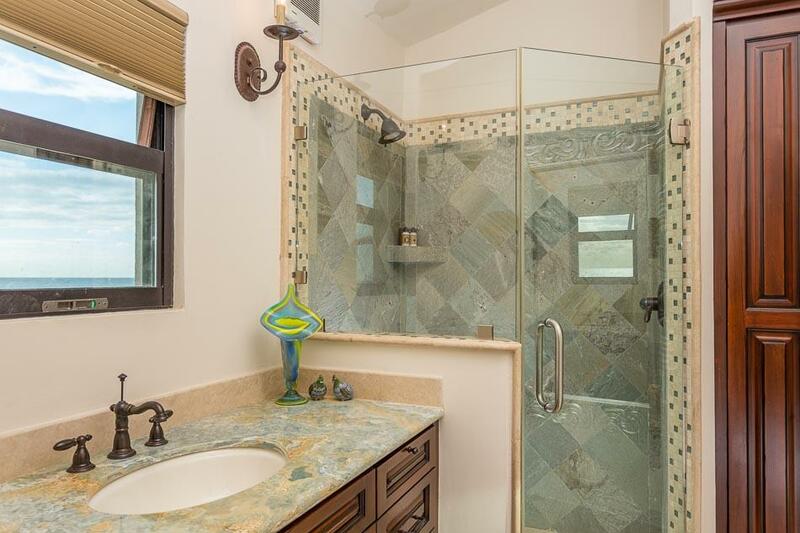 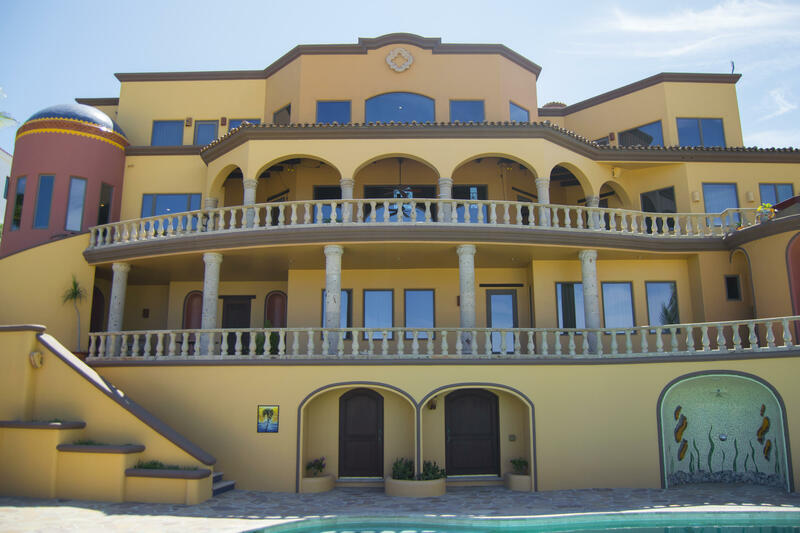 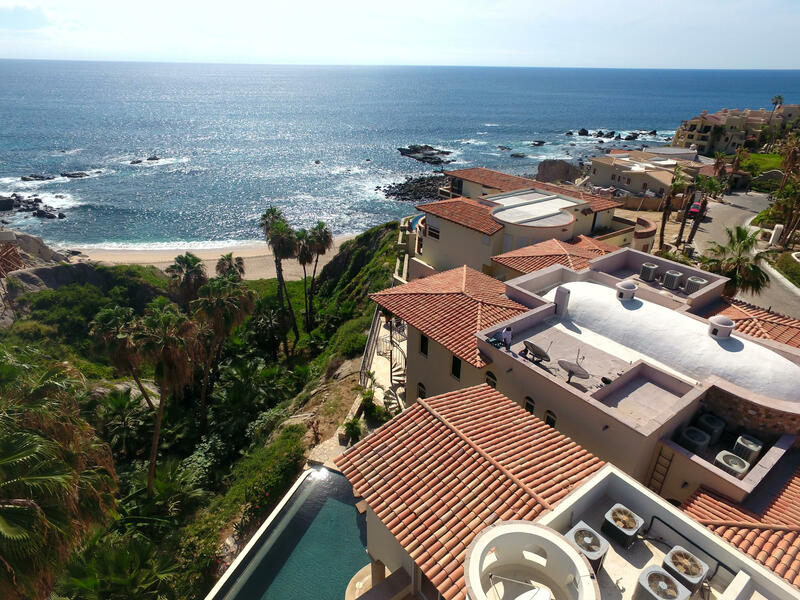 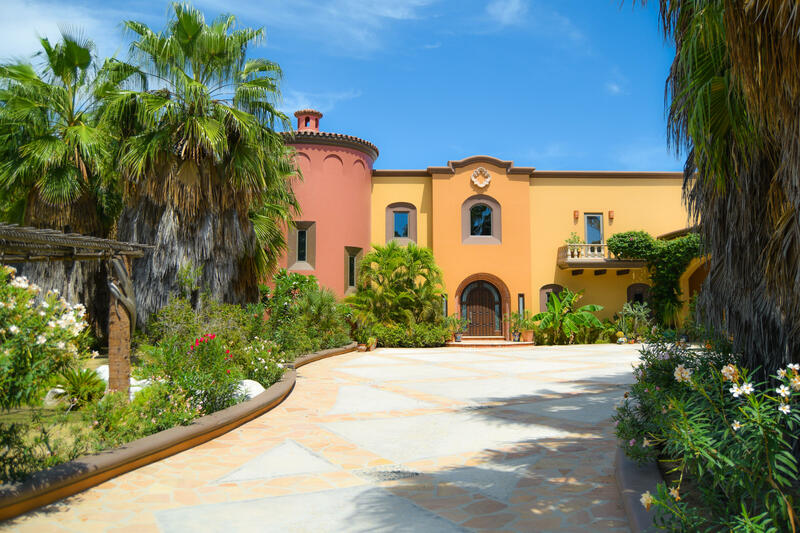 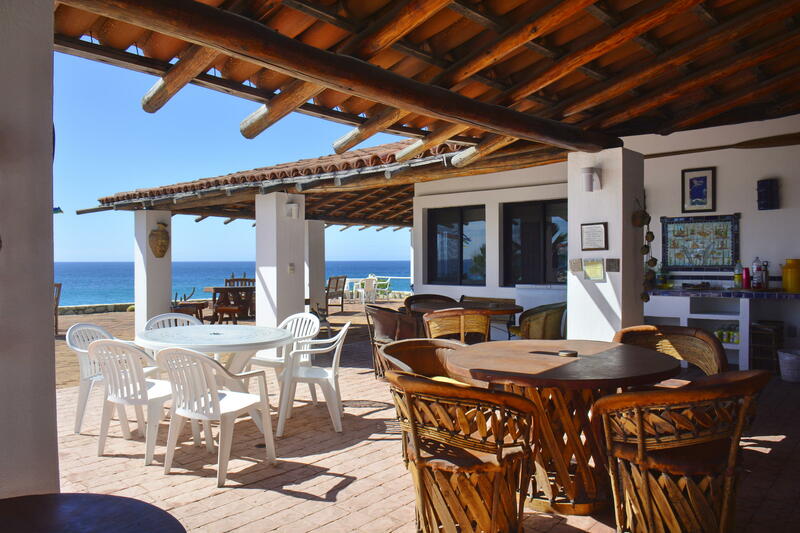 This Mediterranean style, two-storey home sits atop the cliff overlooking Cabo Bello beach. 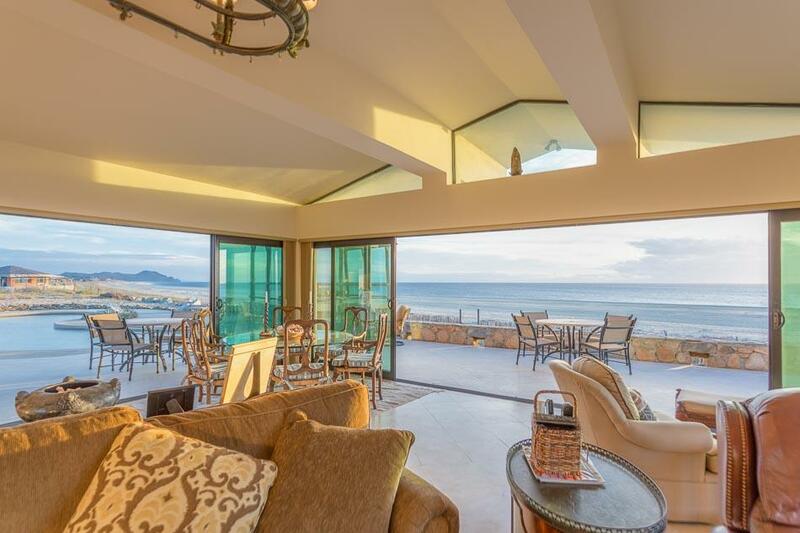 From almost every living space, indoor or out, the home offers magnificent unobstructed views of the sea of Cortez where you can watch the whales frolic with their babies, enjoy sunsets or simply listen to the sounds of the ocean.As you enter the front door, you can't help but be taken in by the airy, open feeling and amazing ocean views.